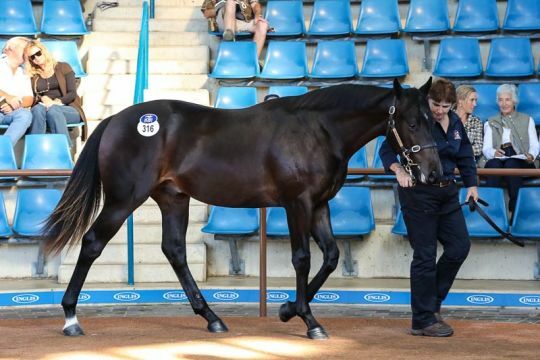 Demand was high for Australia and New Zealand’s finest bred and conformed yearlings at the 2013 Inglis Australian Easter Yearling Sale. 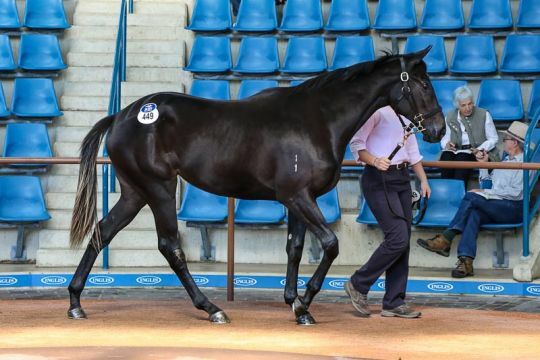 Over $90 million was traded on the cream of the region’s yearling sale crop in Sydney, with the sale average and median up 32% and 25% respectively on corresponding figures from 2012. 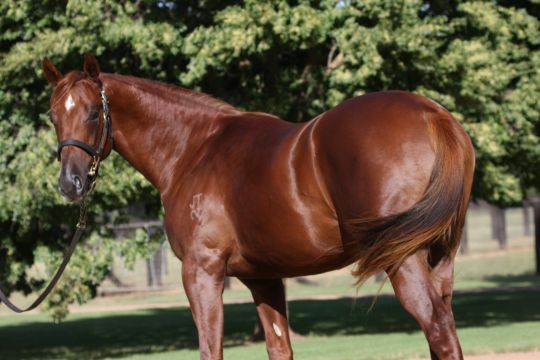 “The fantastic results recorded are a clear endorsement of the strength in the both the local industry and the respect that the international community has for our product,” Webster said. 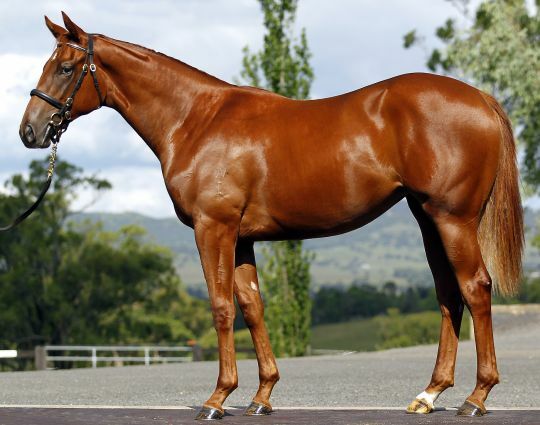 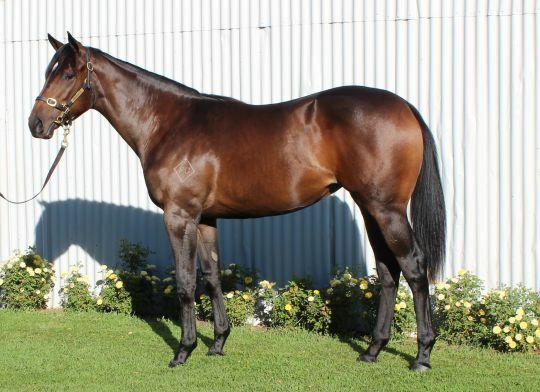 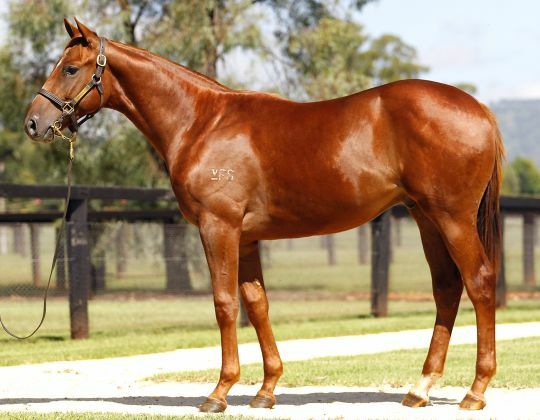 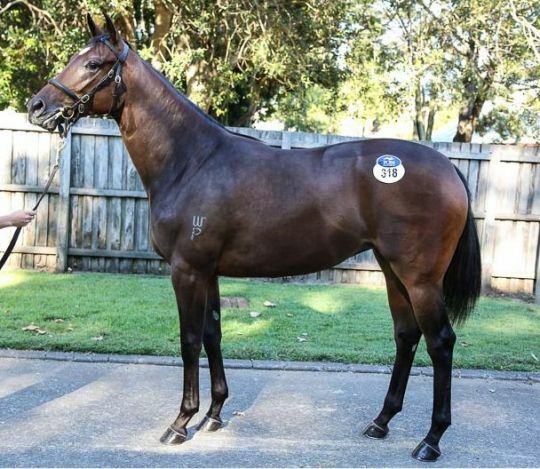 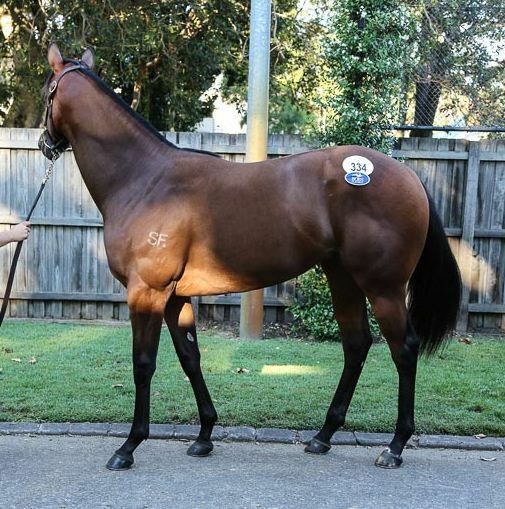 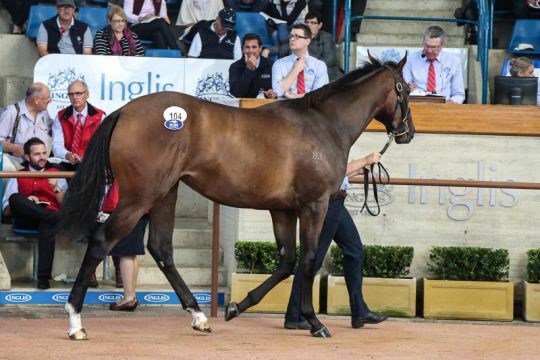 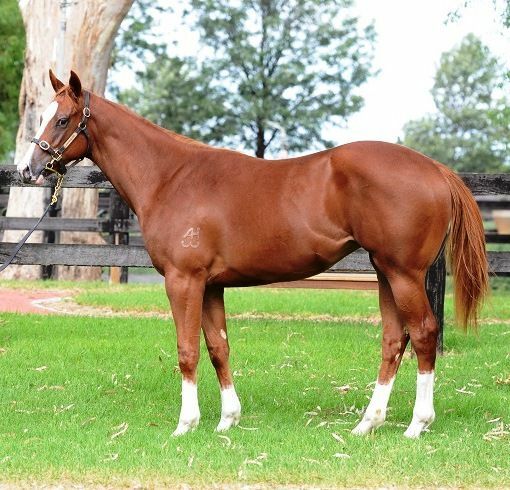 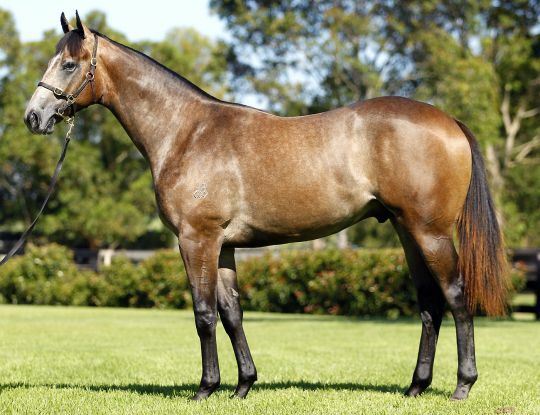 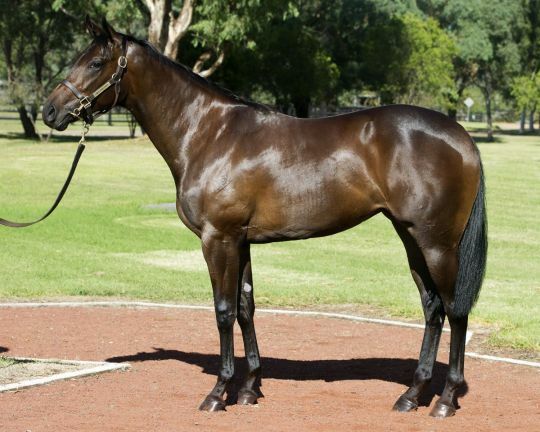 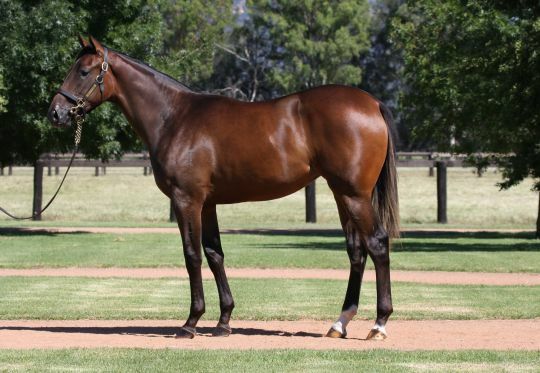 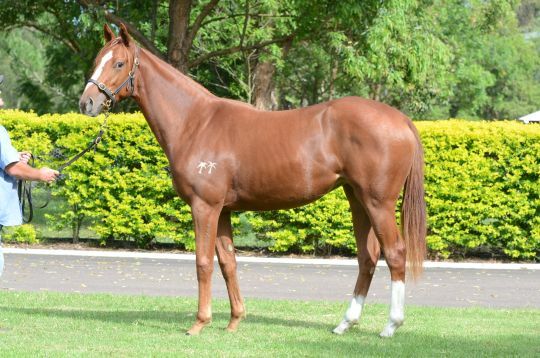 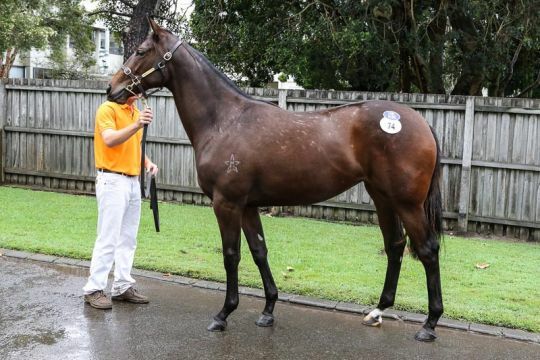 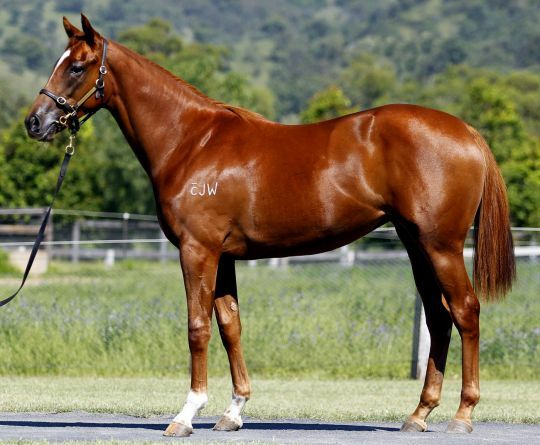 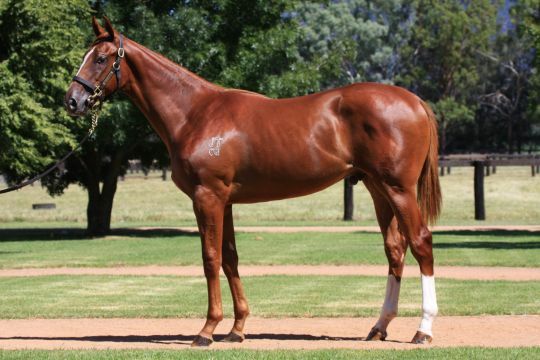 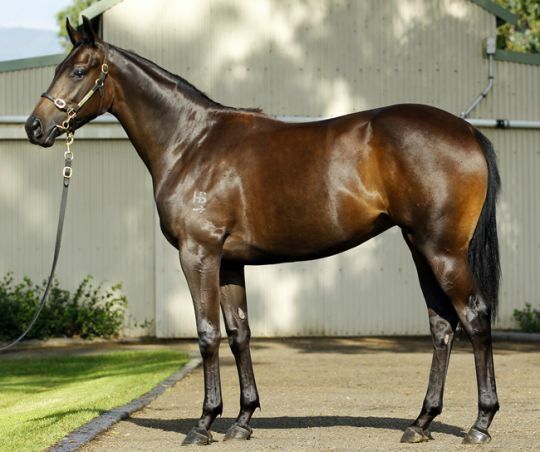 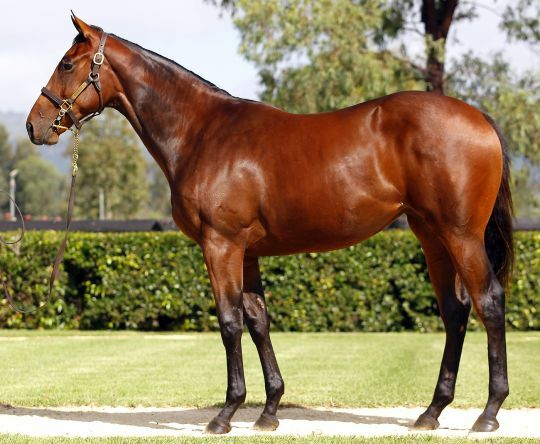 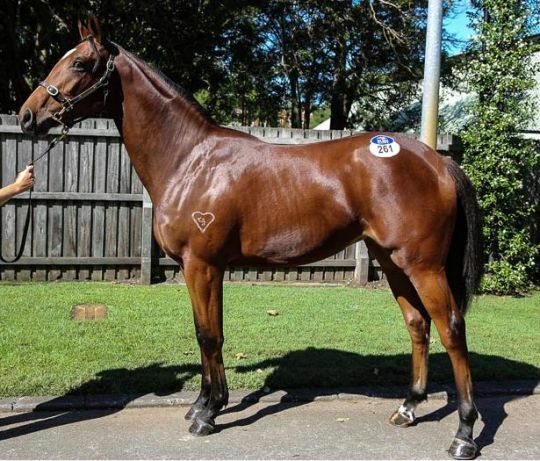 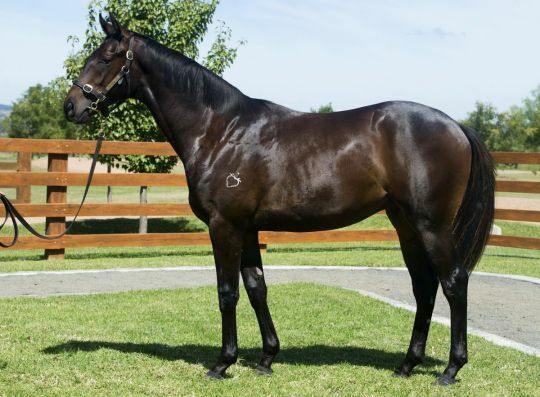 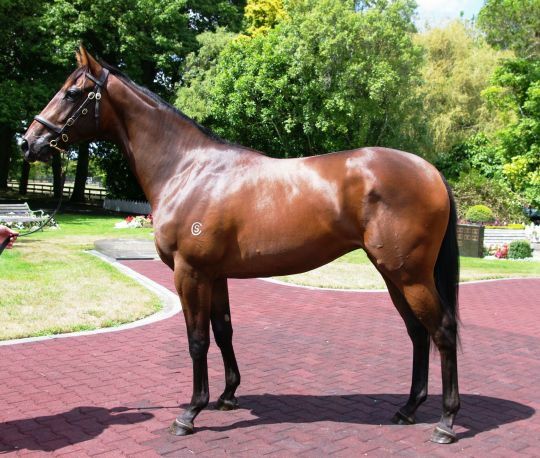 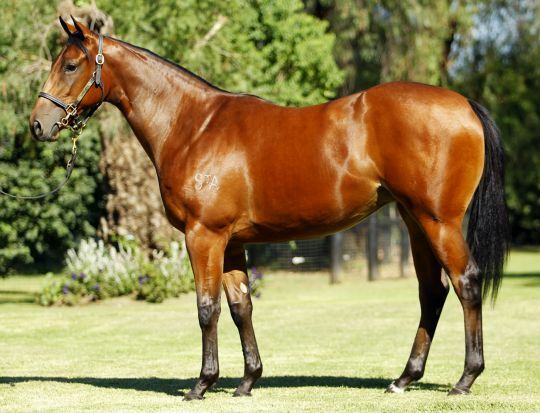 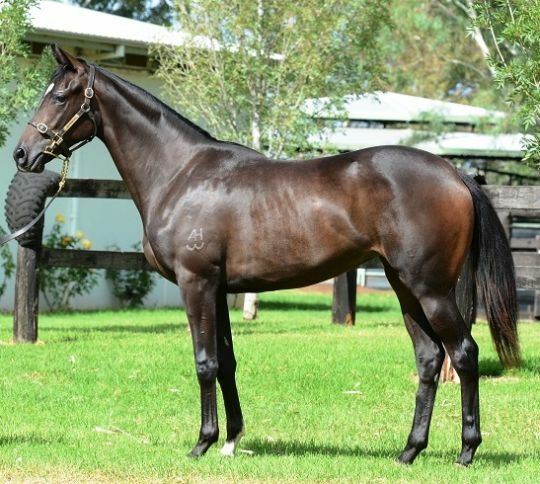 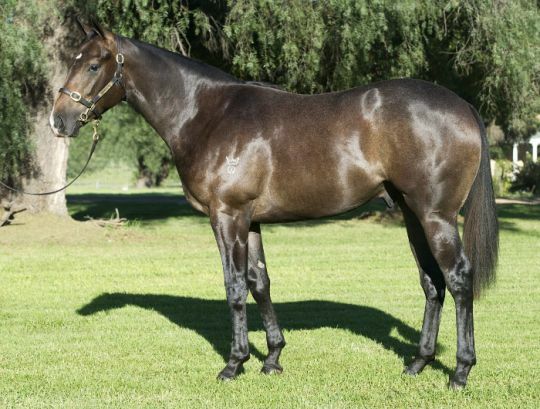 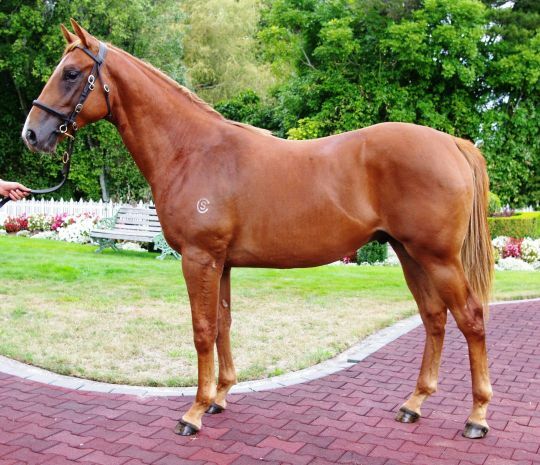 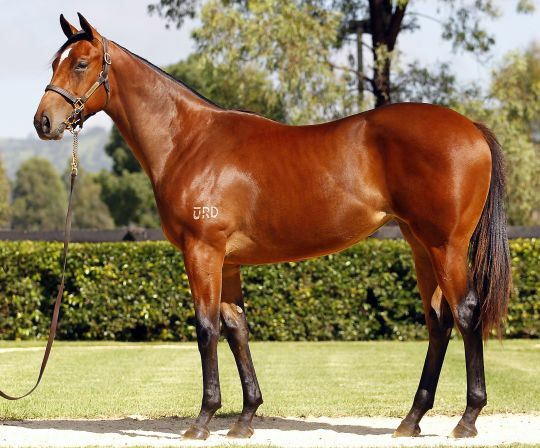 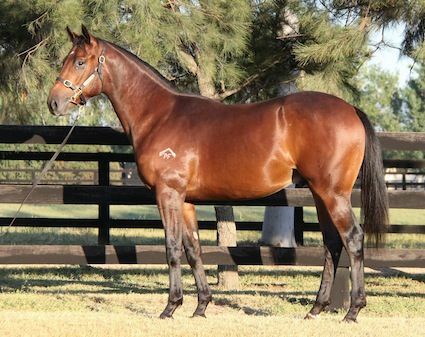 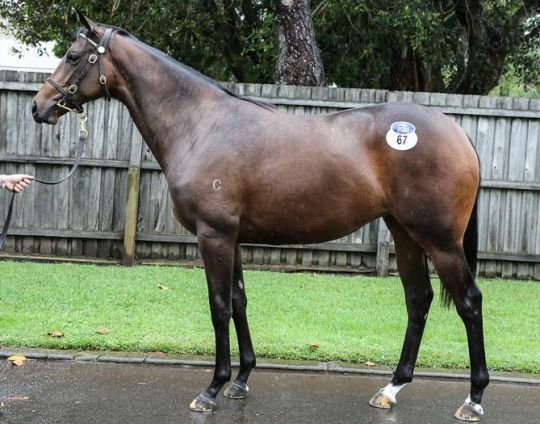 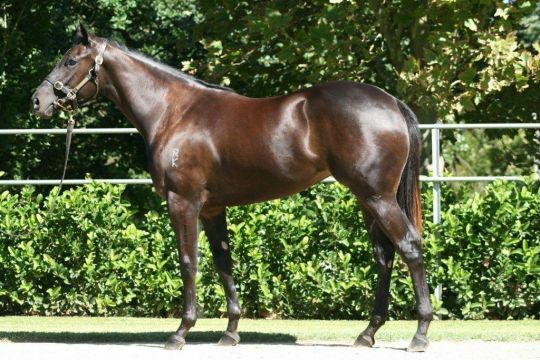 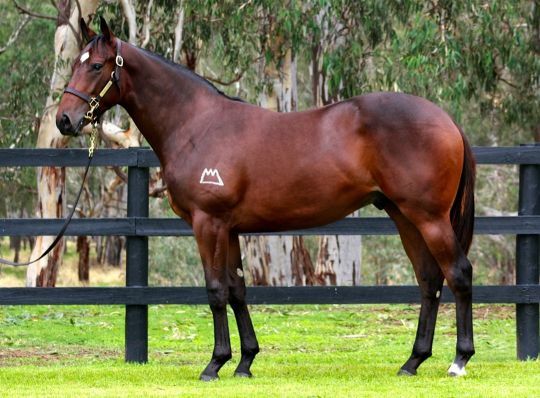 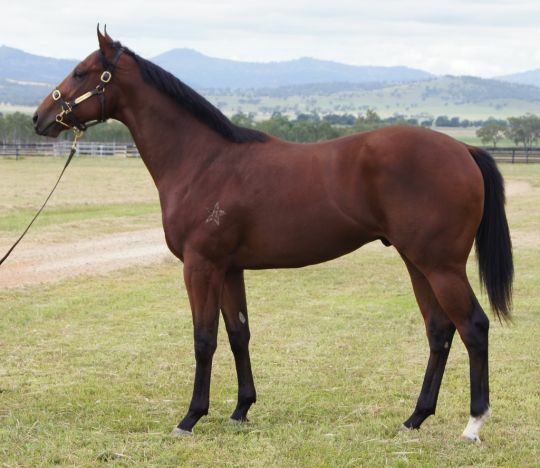 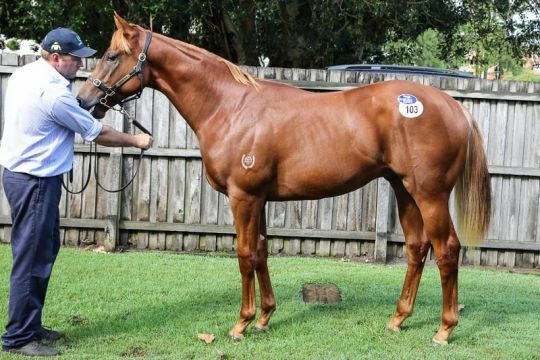 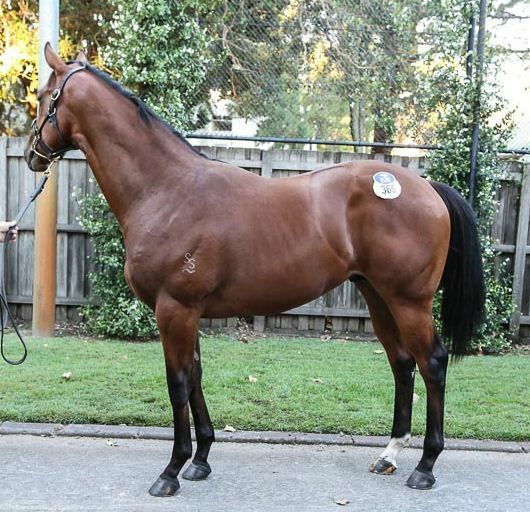 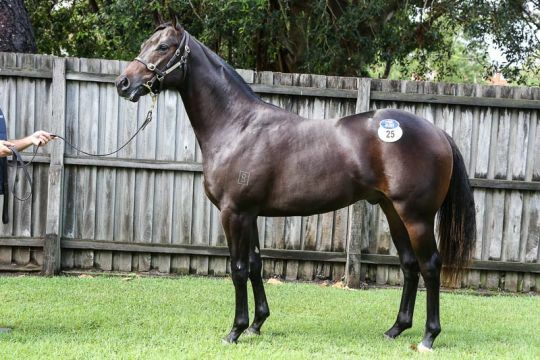 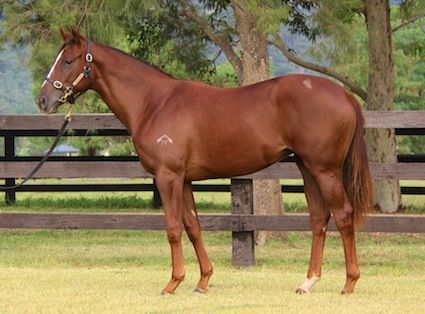 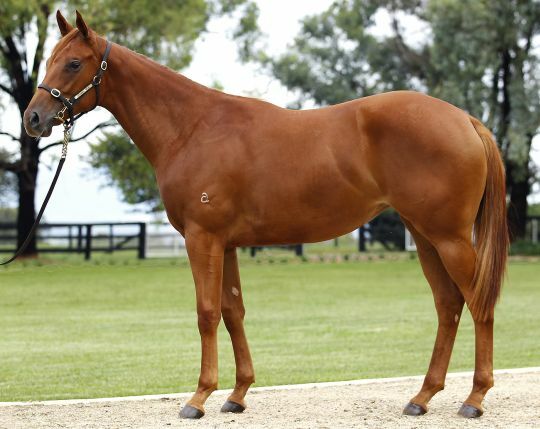 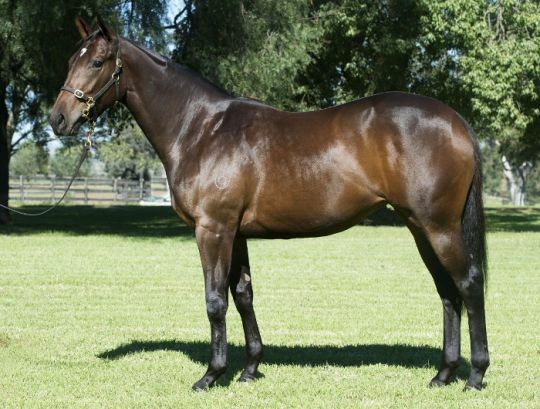 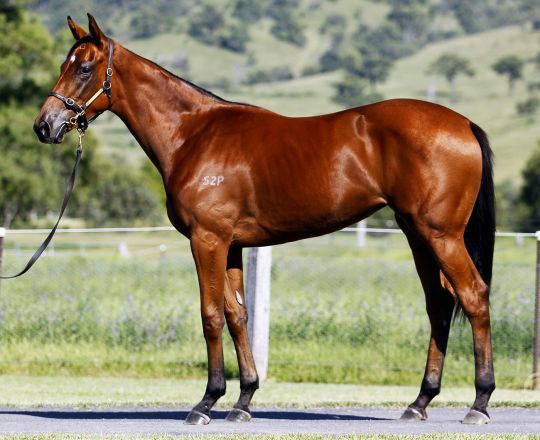 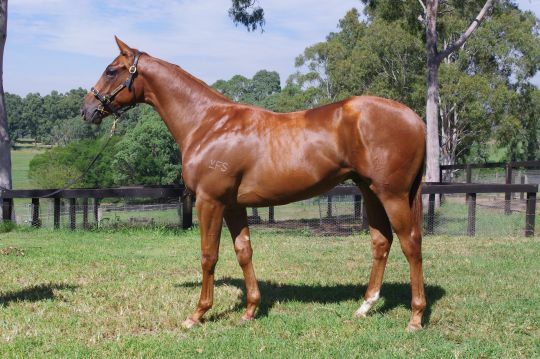 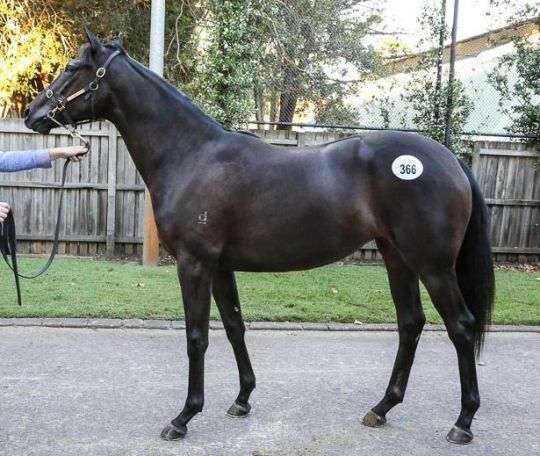 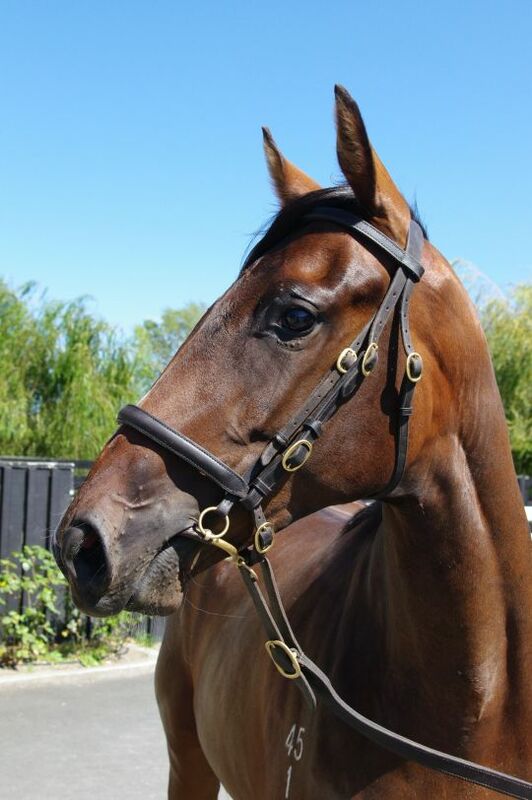 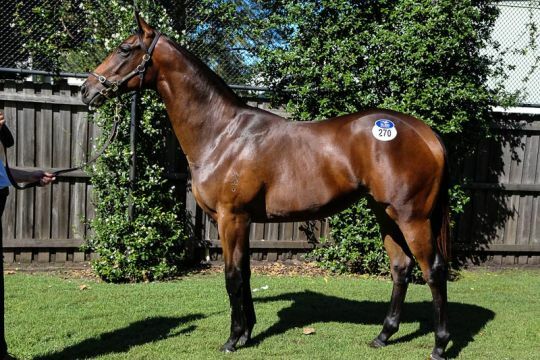 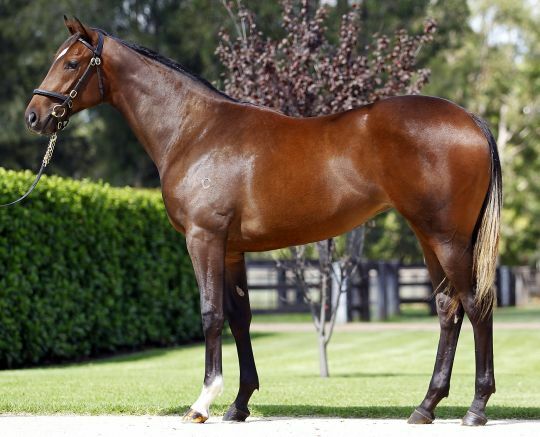 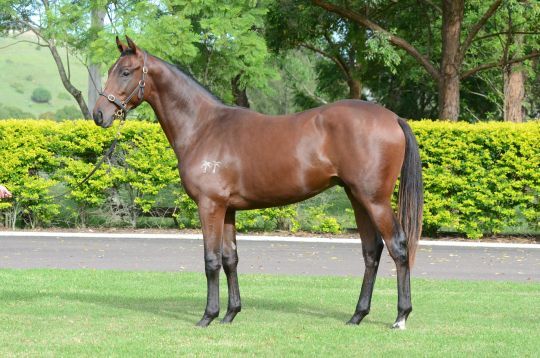 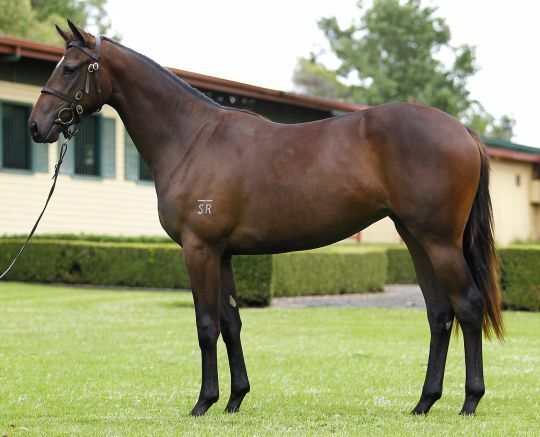 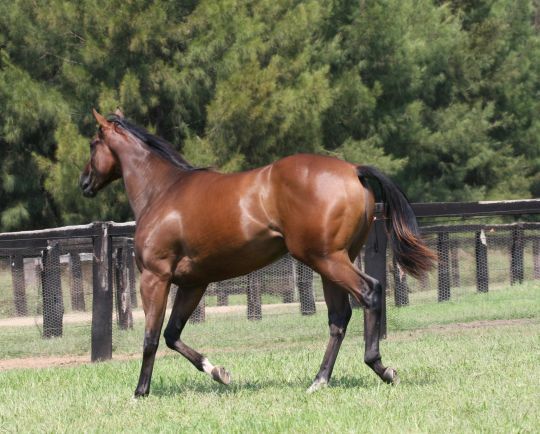 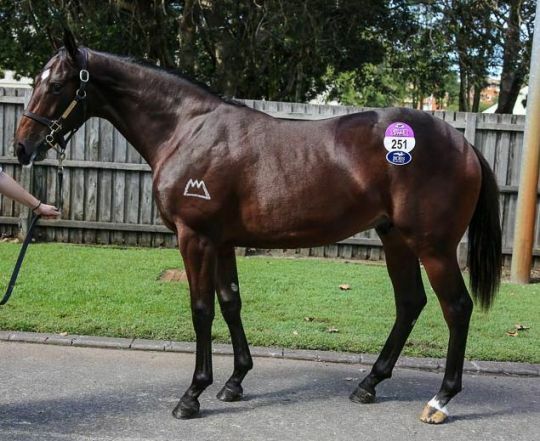 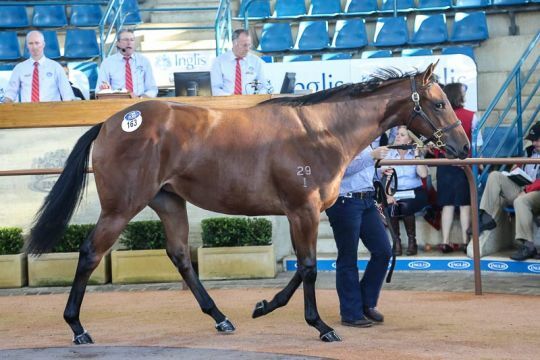 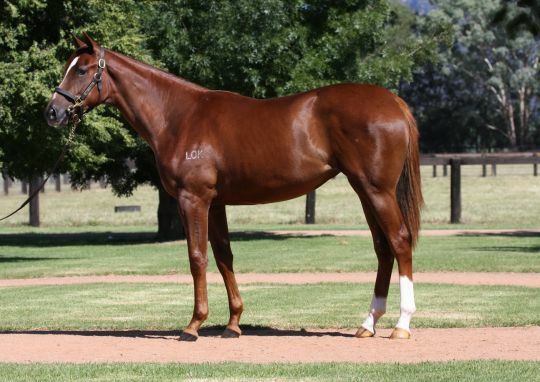 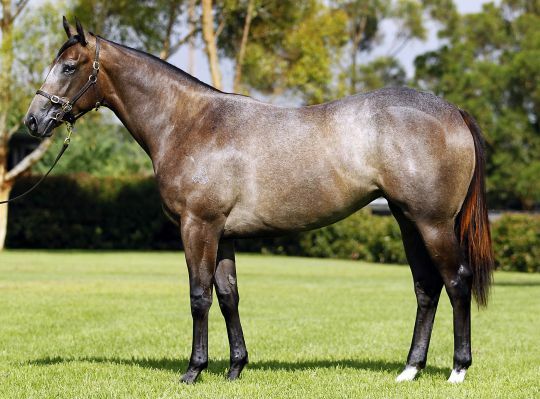 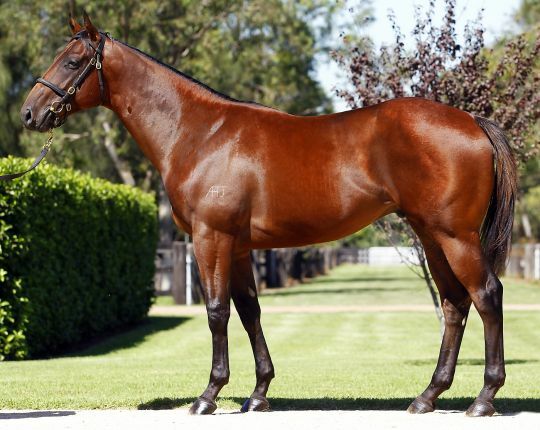 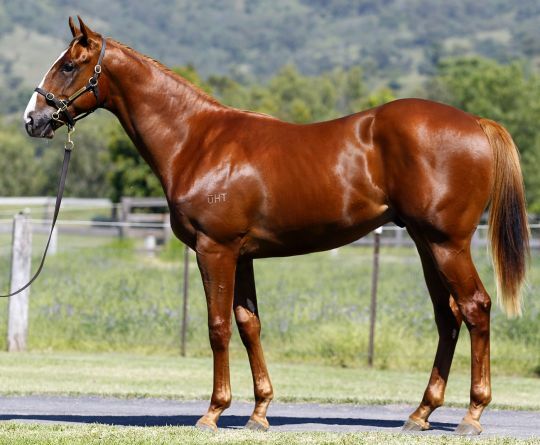 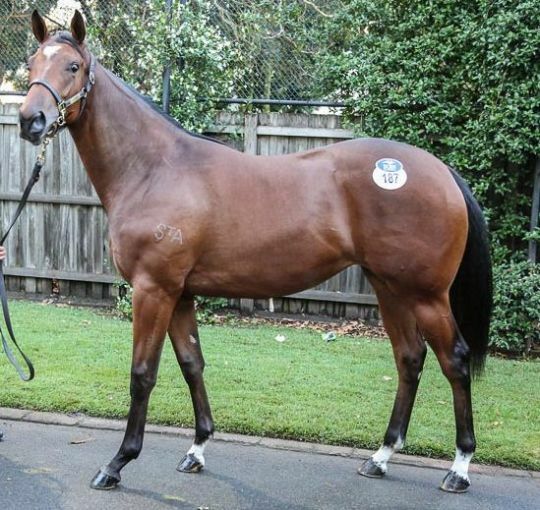 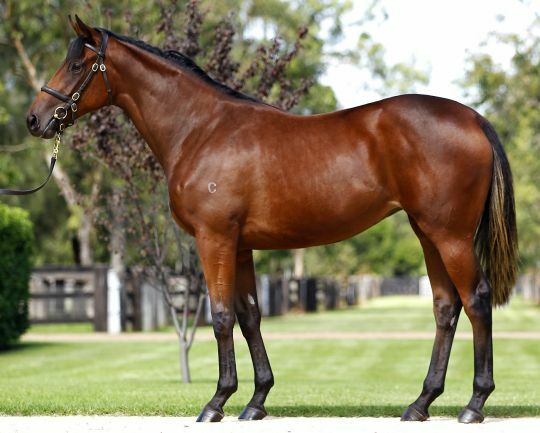 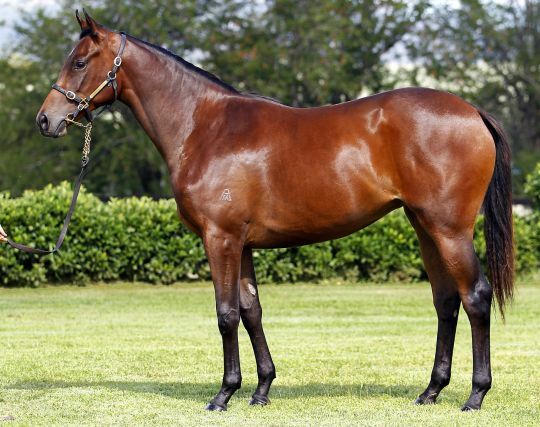 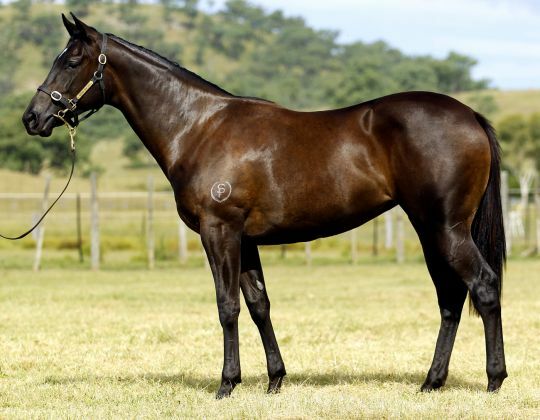 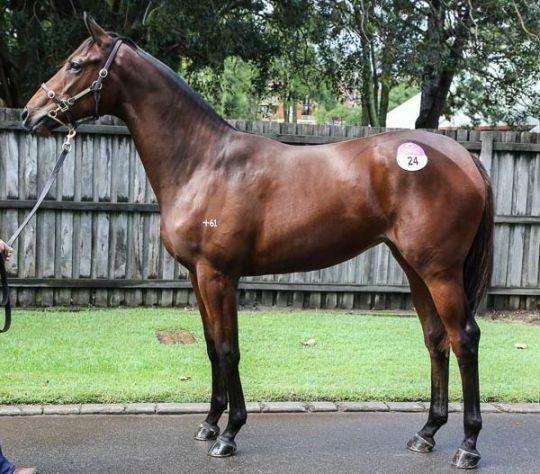 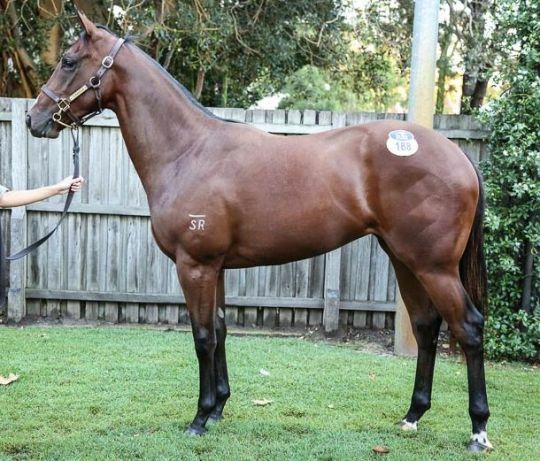 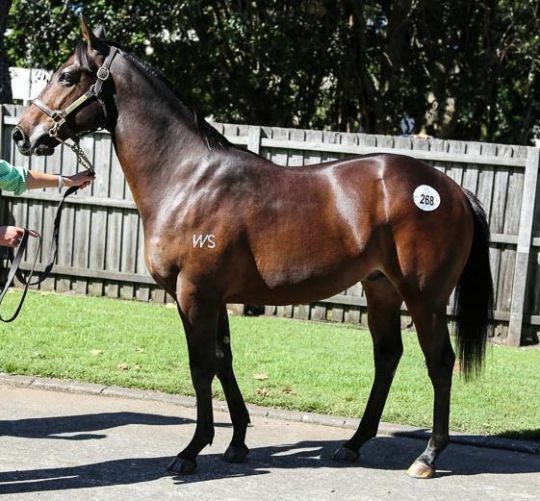 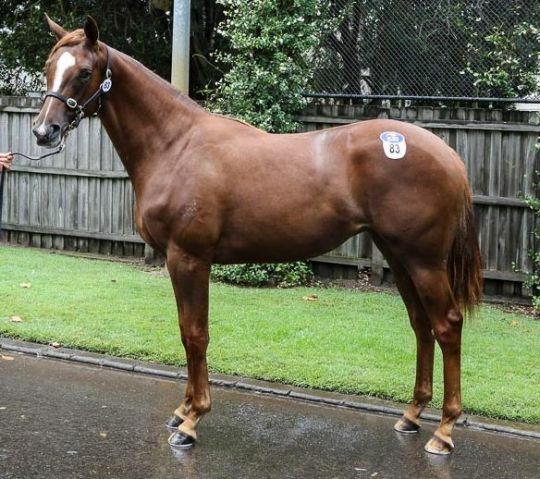 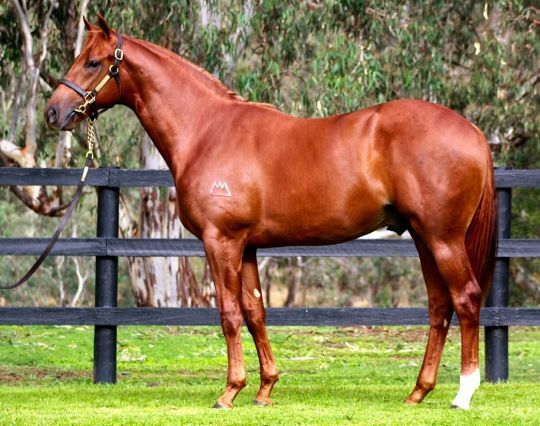 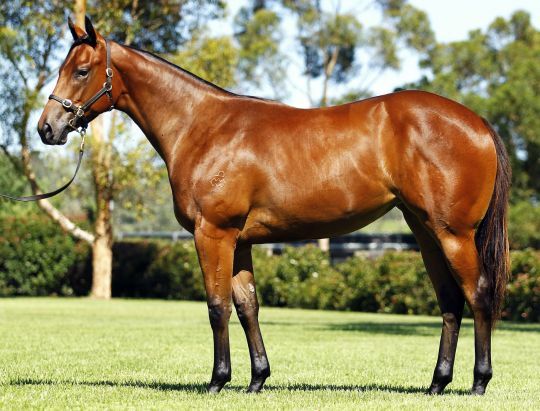 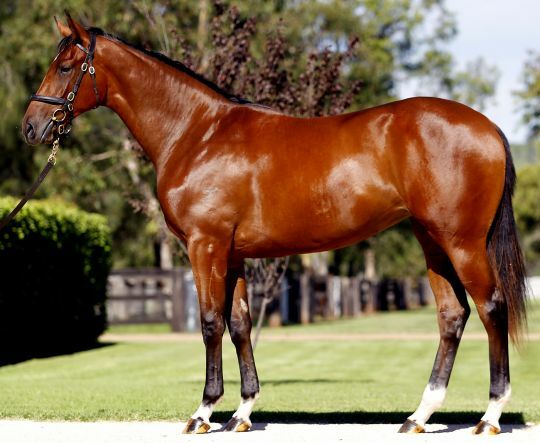 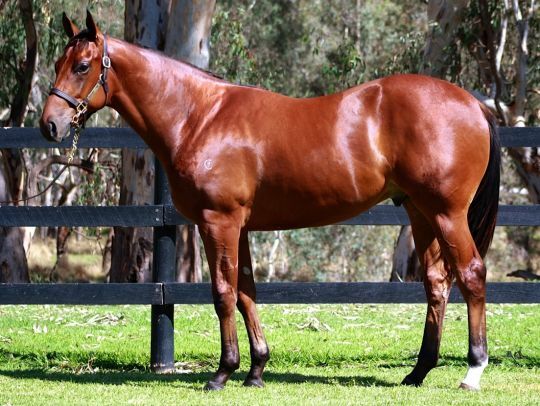 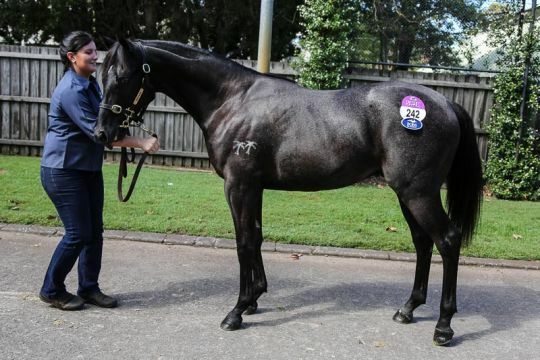 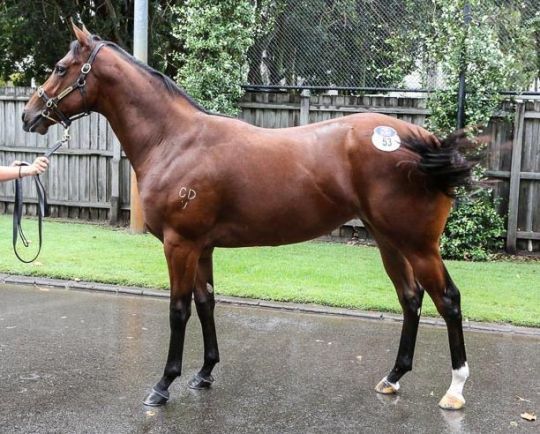 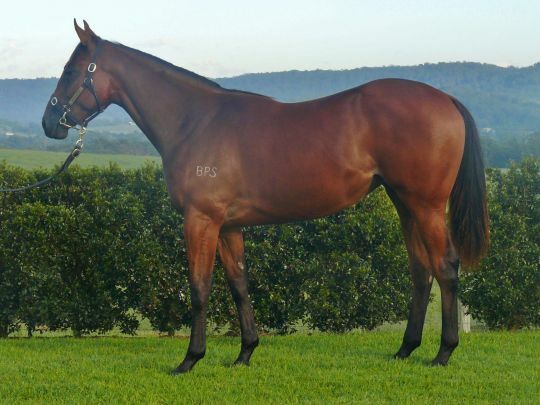 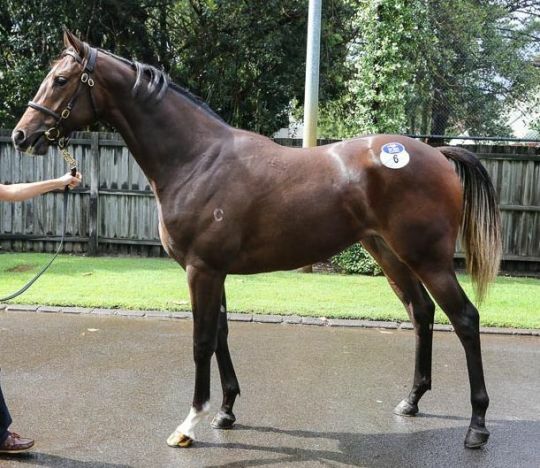 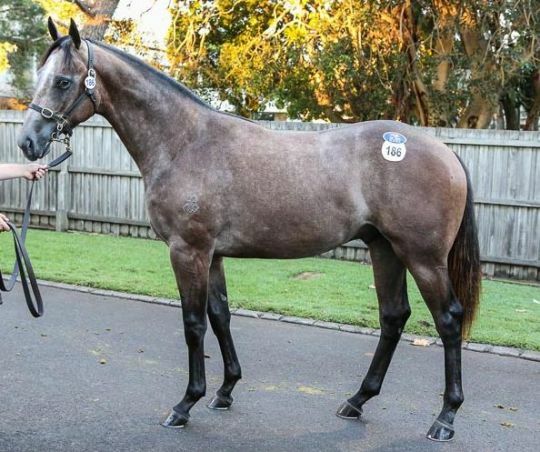 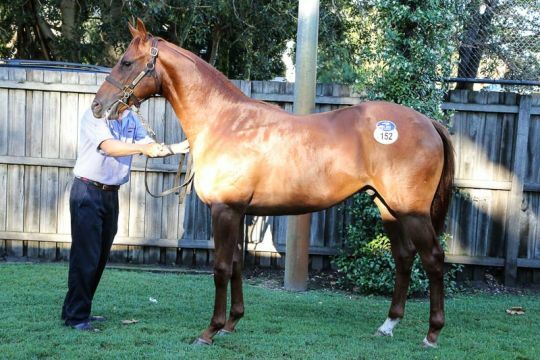 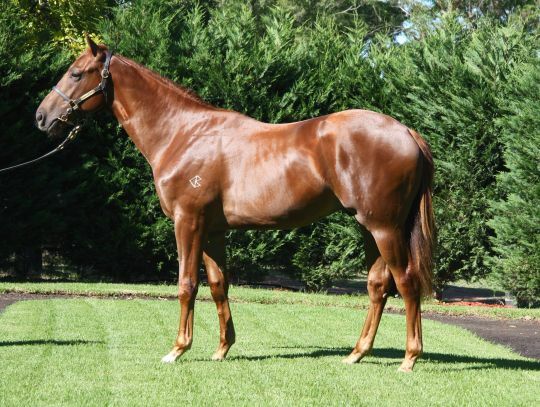 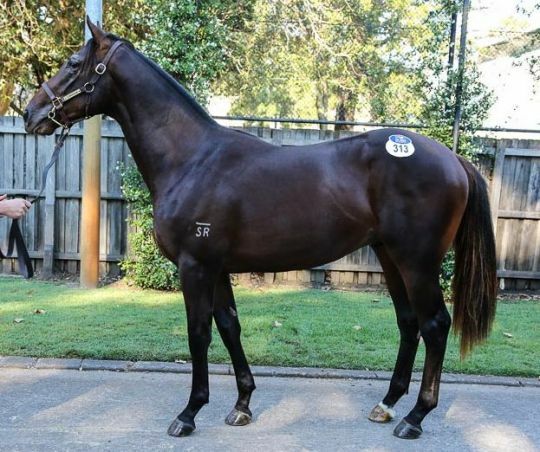 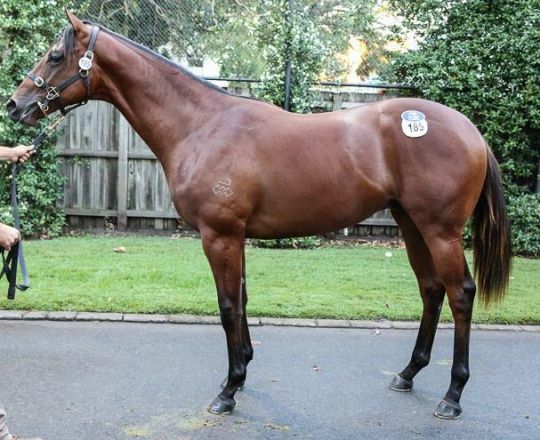 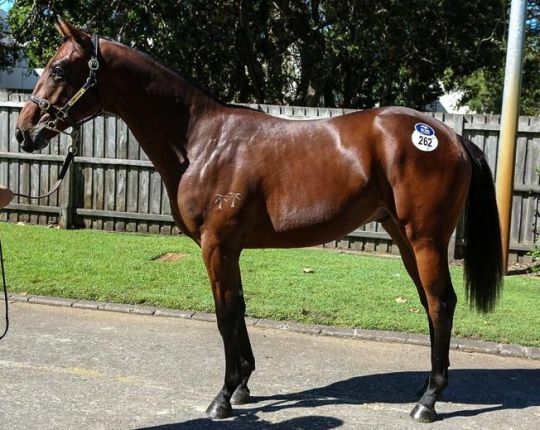 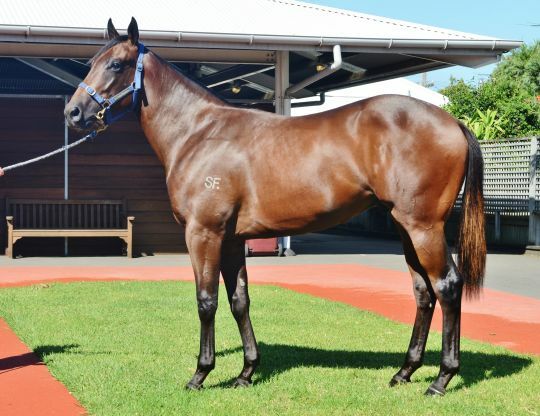 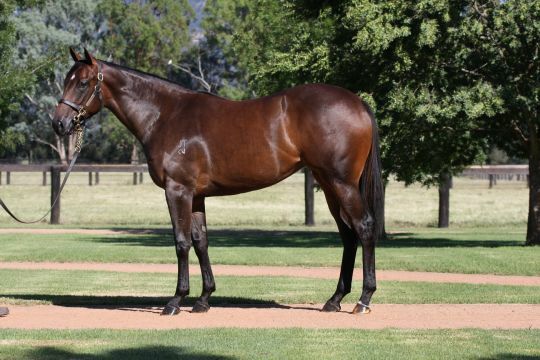 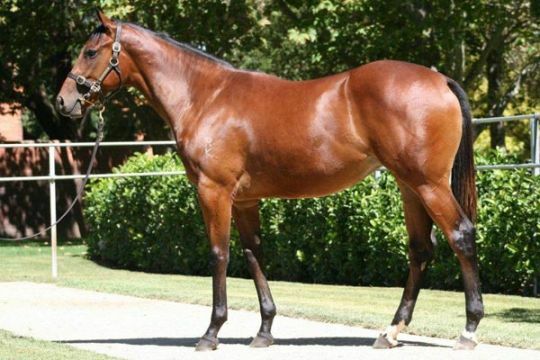 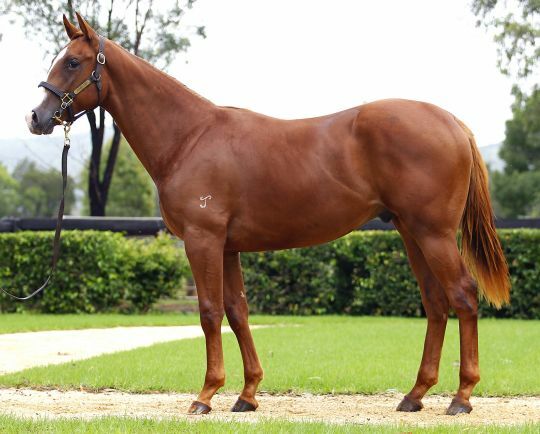 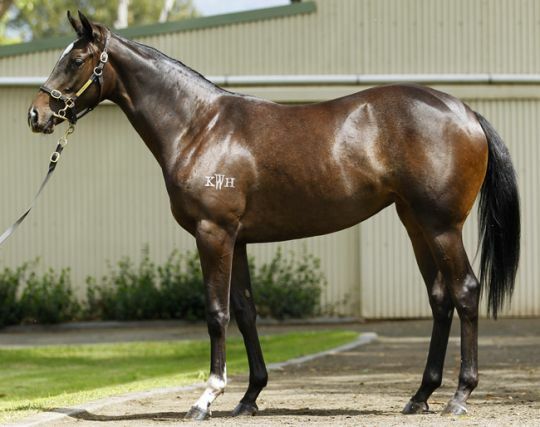 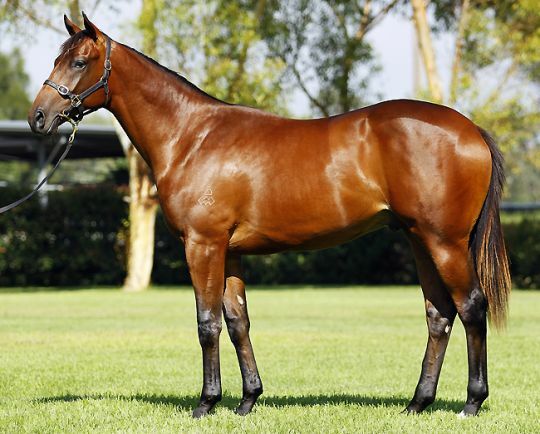 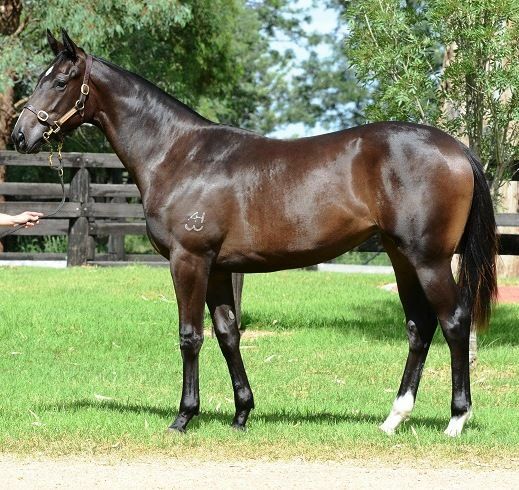 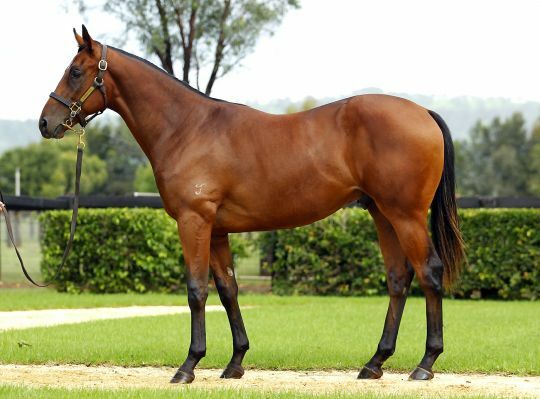 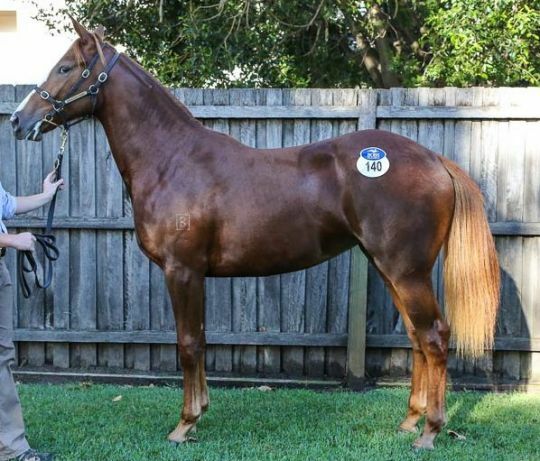 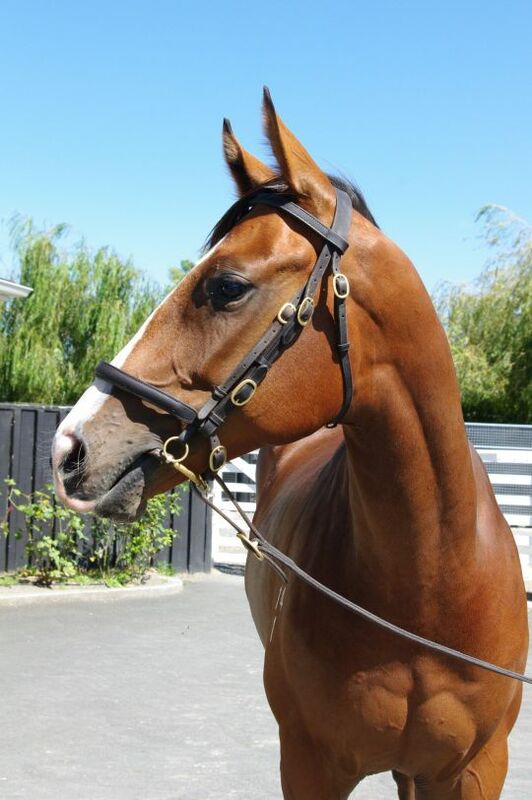 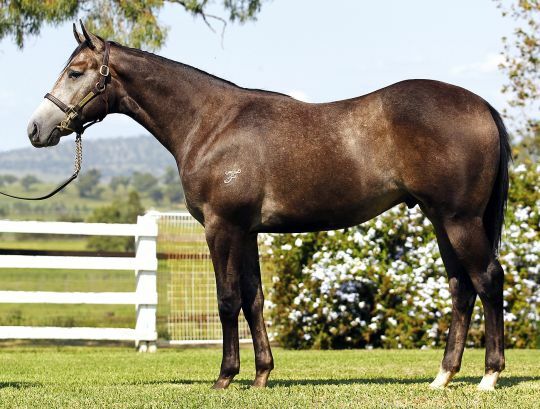 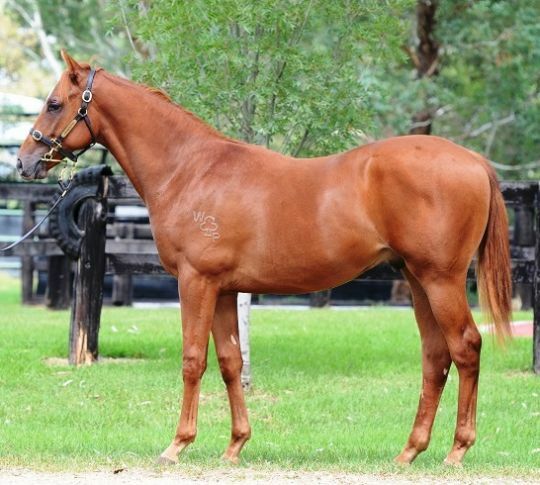 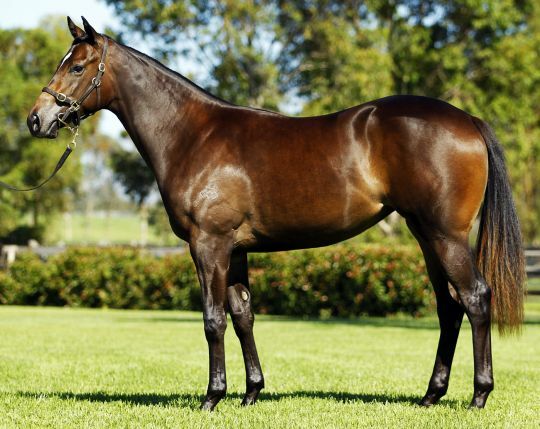 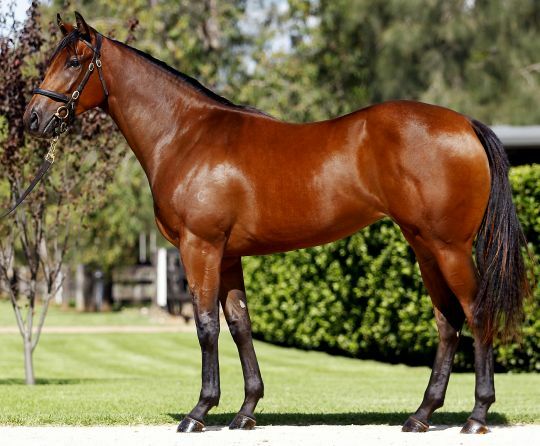 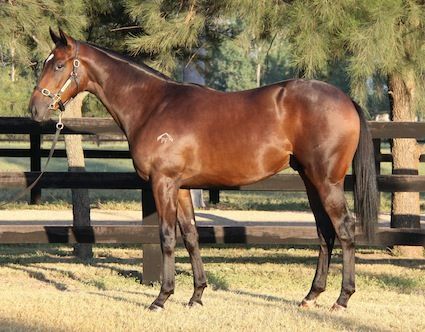 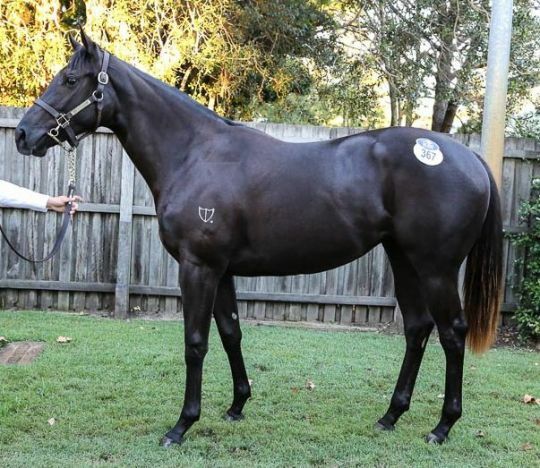 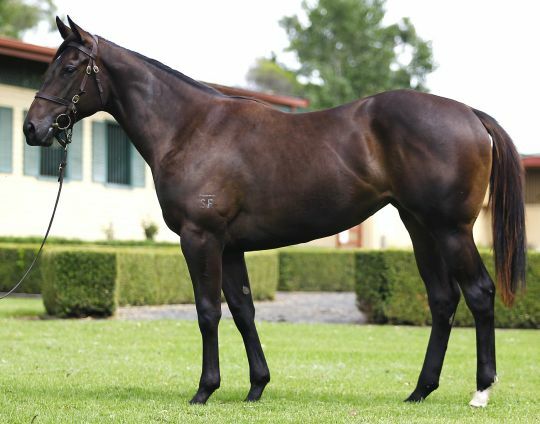 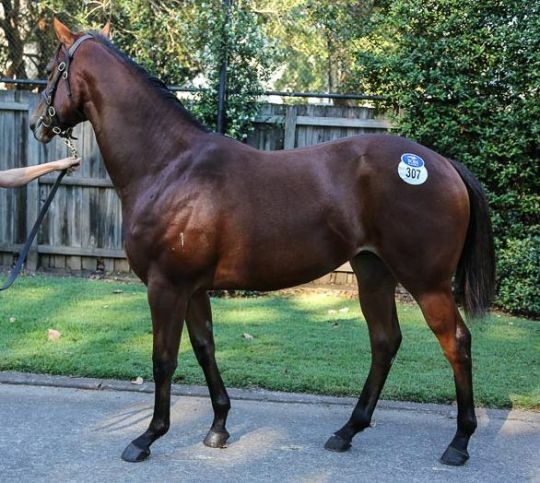 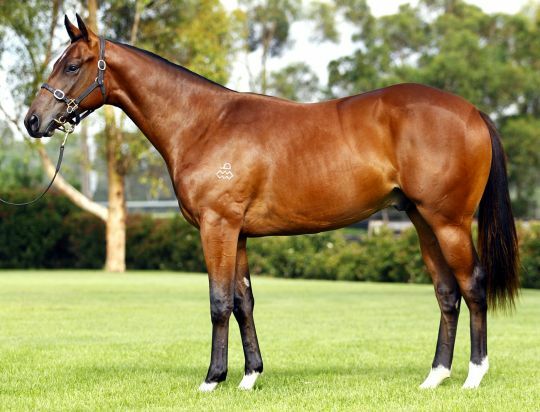 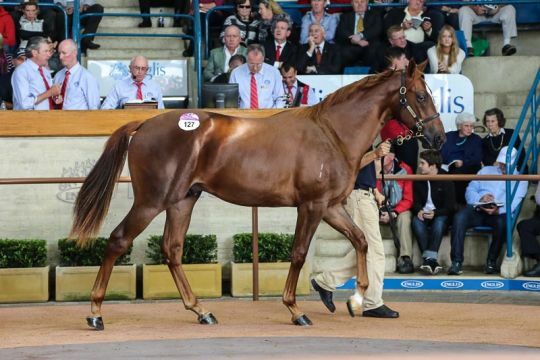 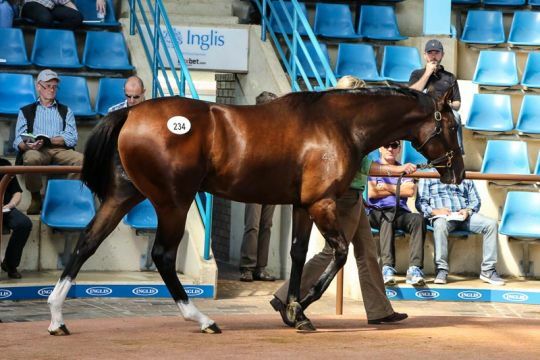 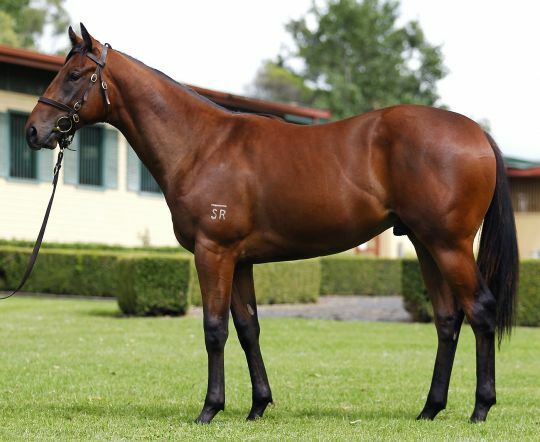 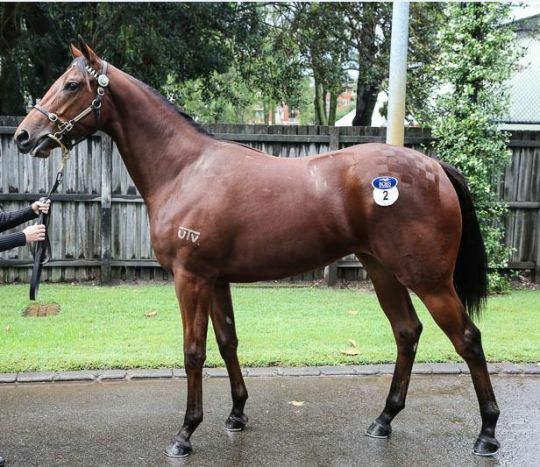 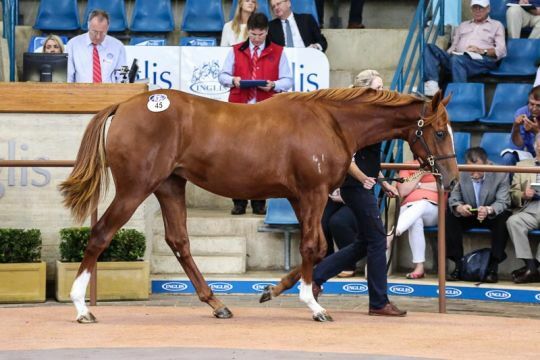 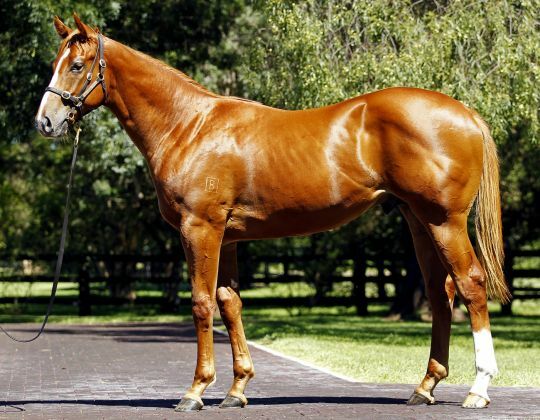 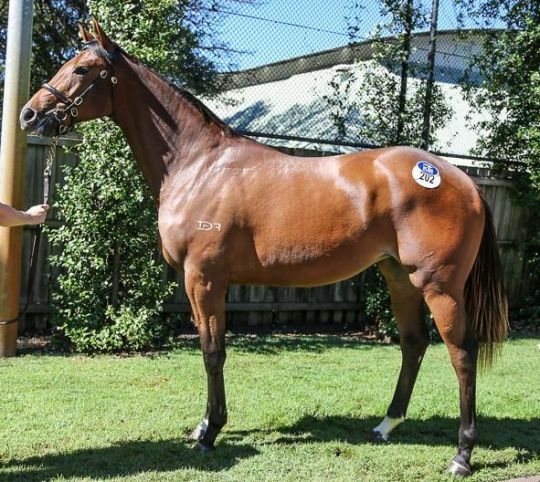 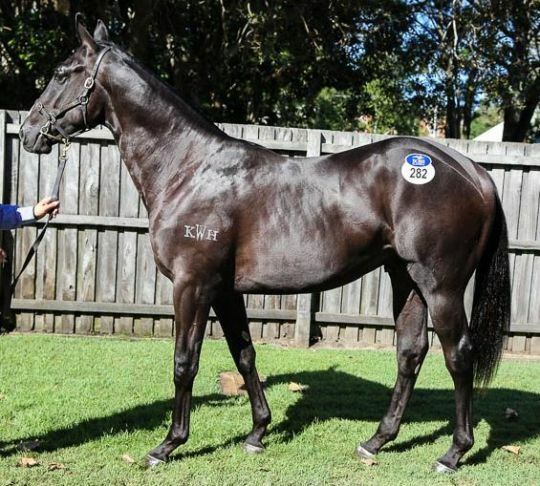 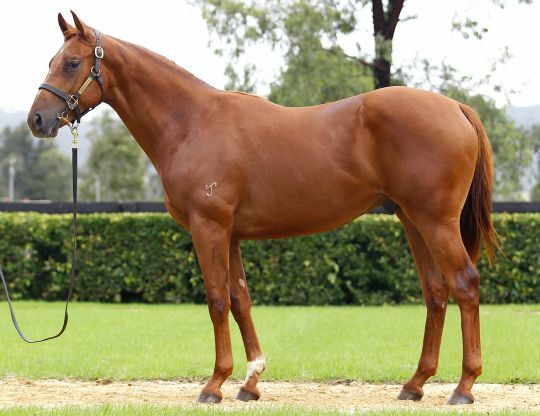 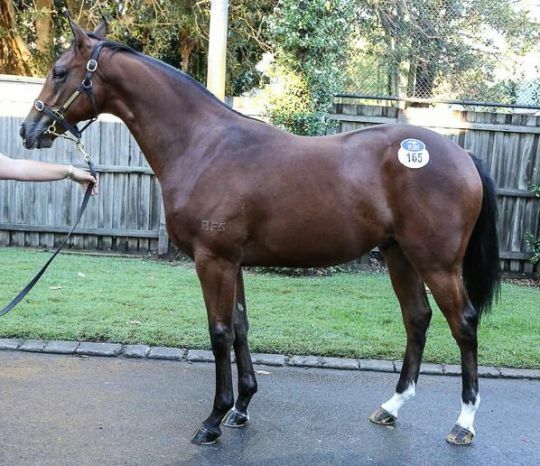 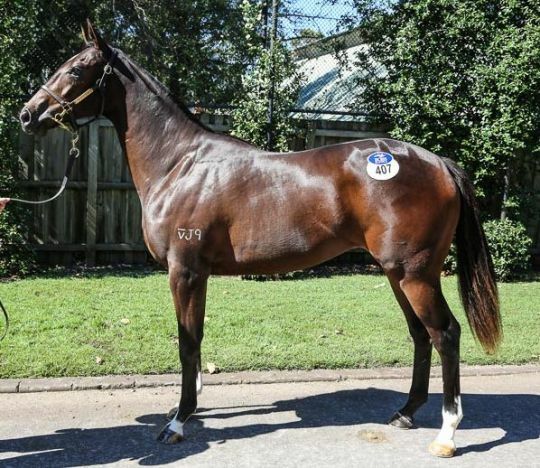 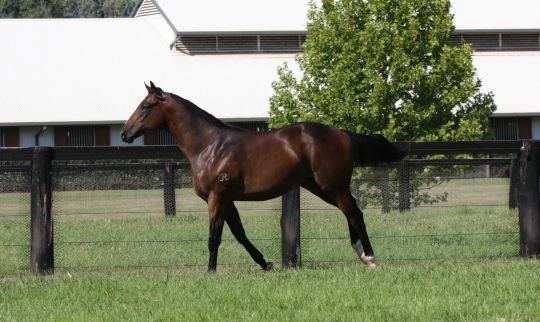 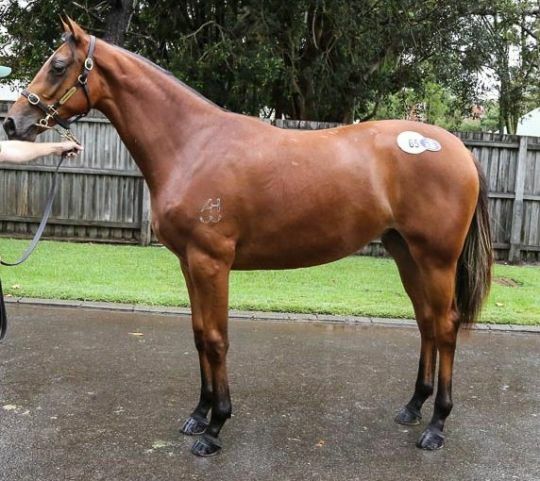 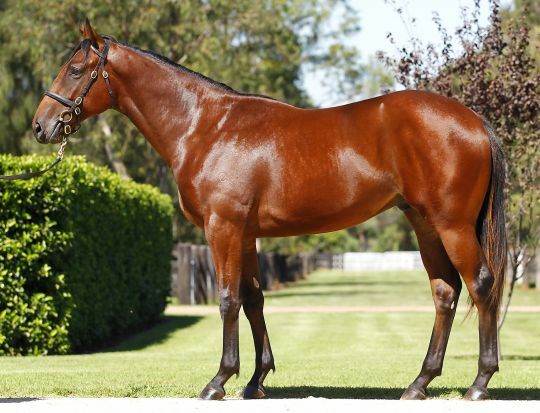 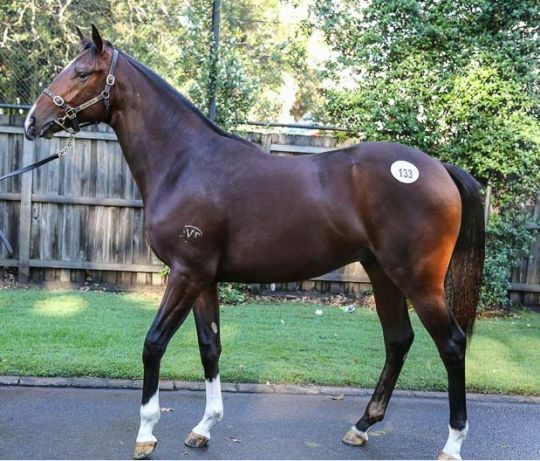 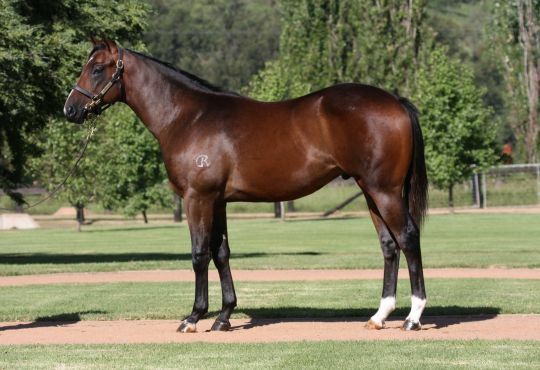 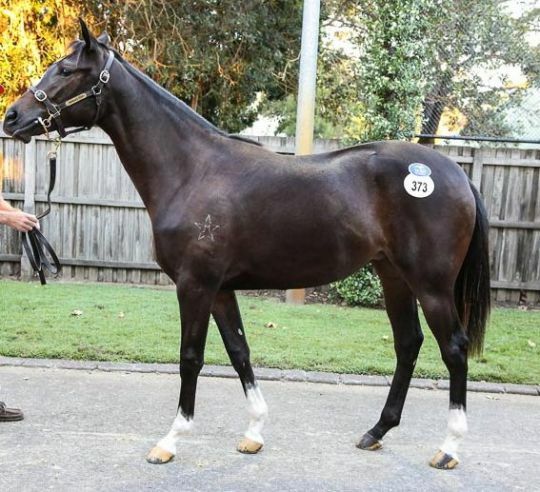 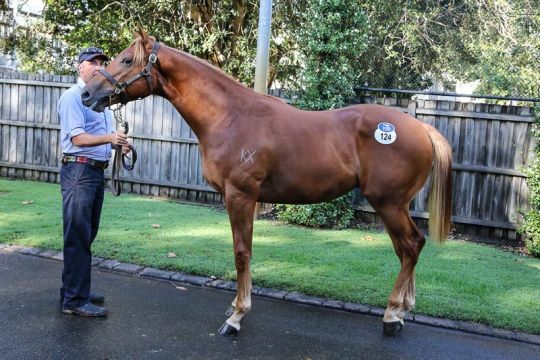 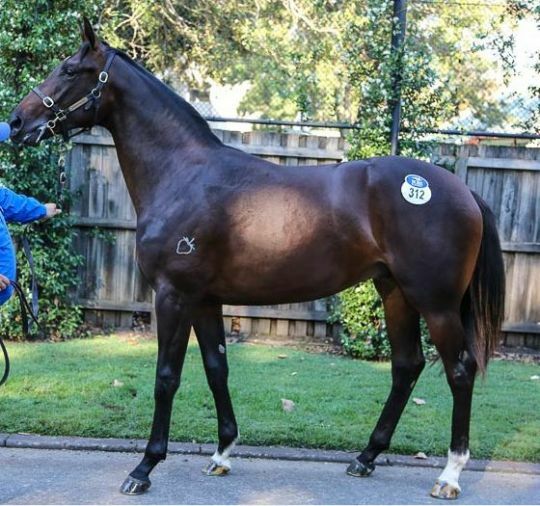 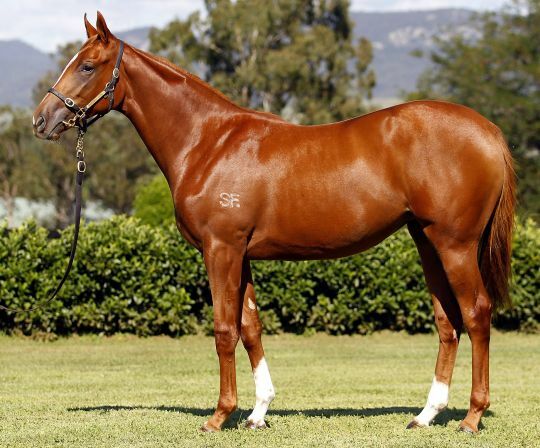 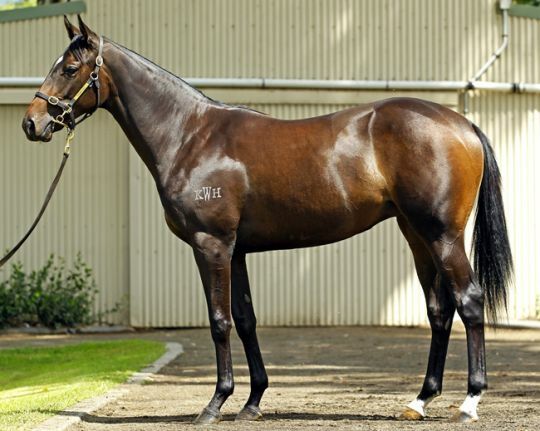 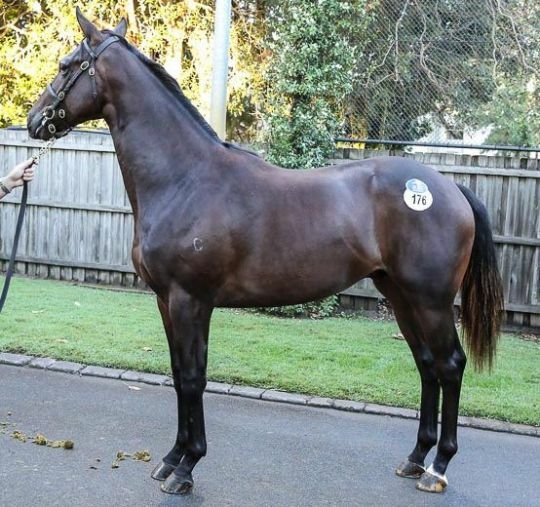 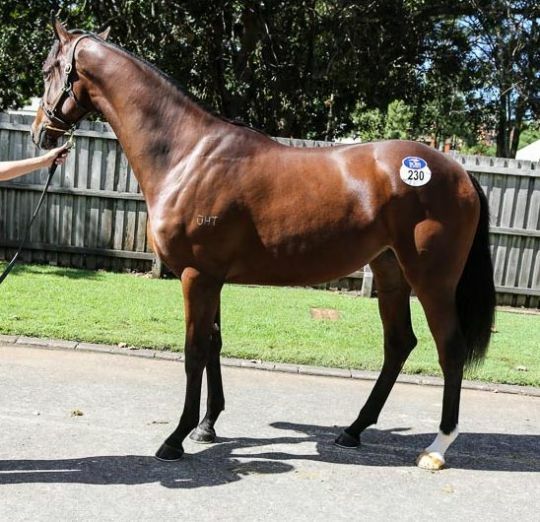 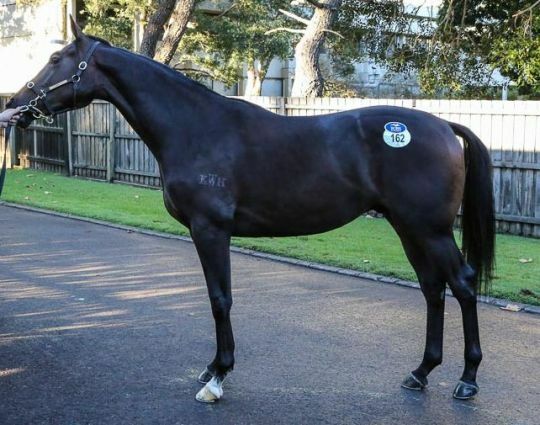 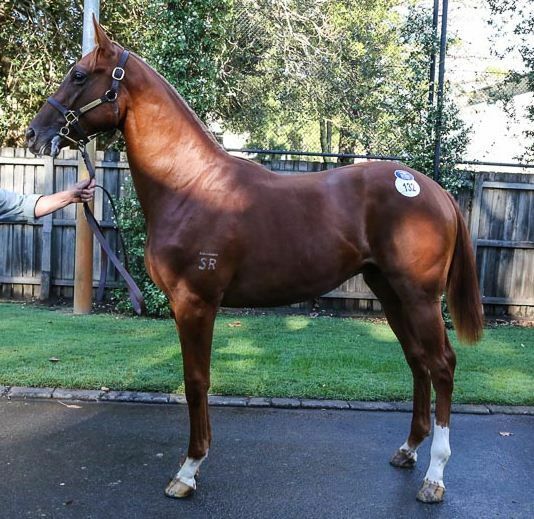 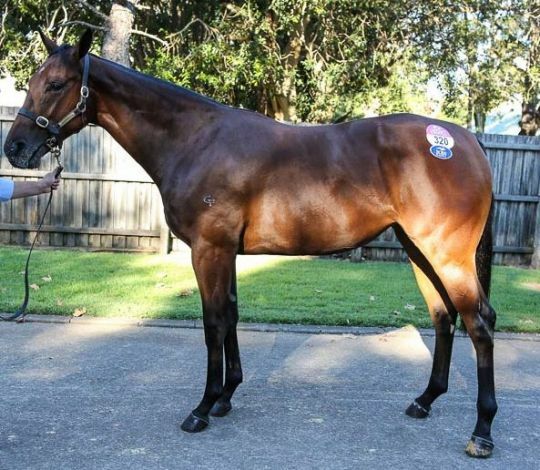 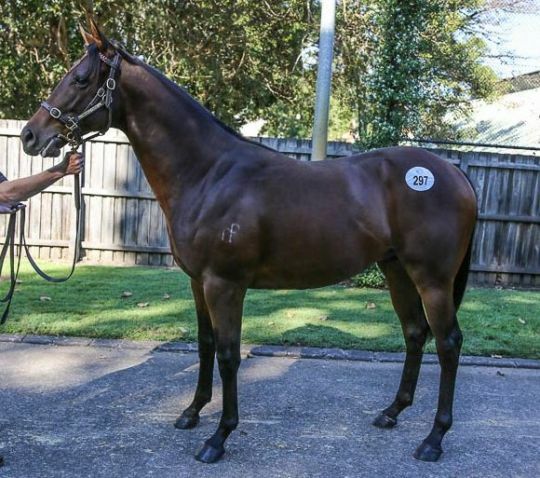 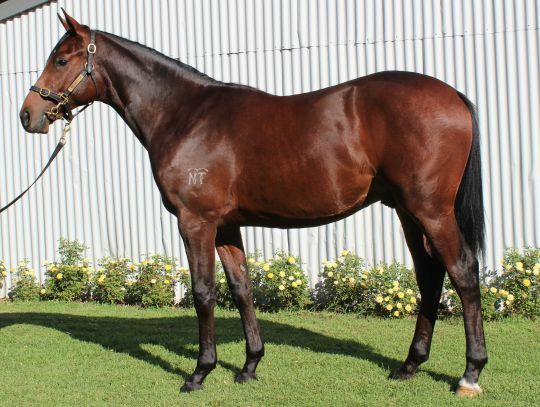 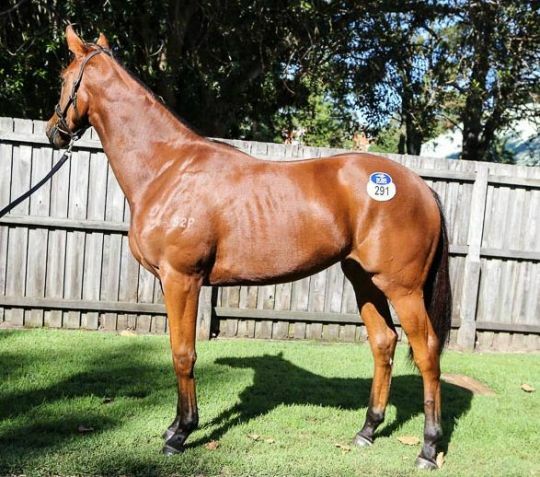 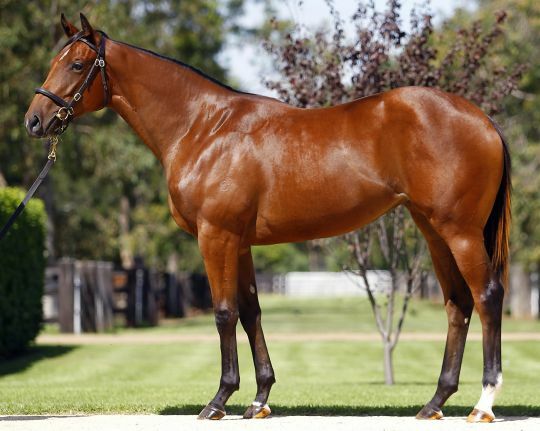 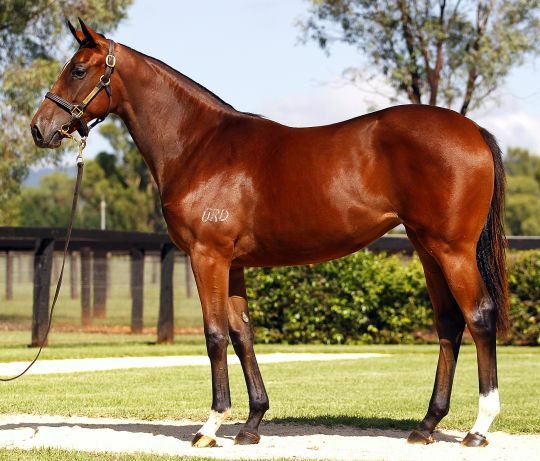 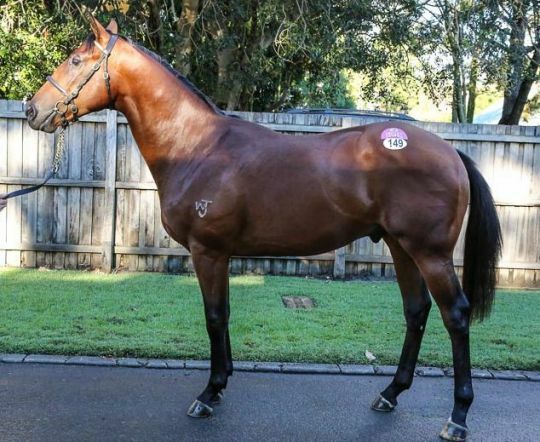 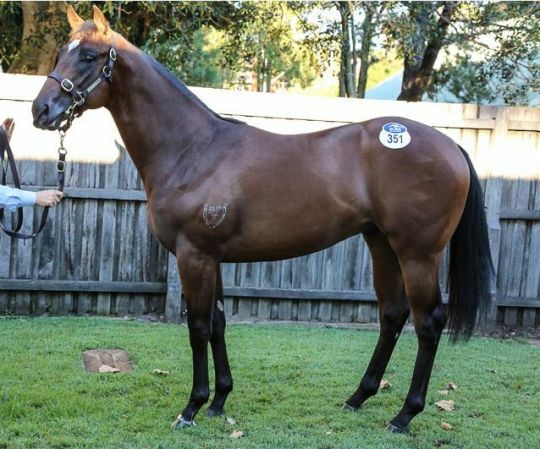 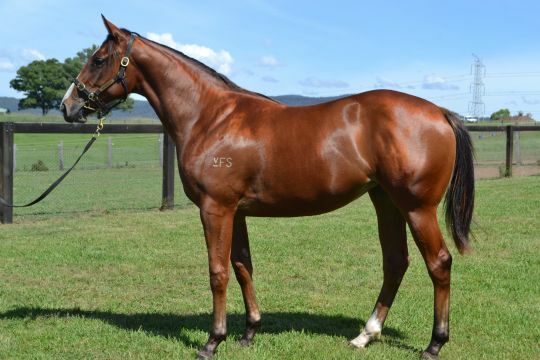 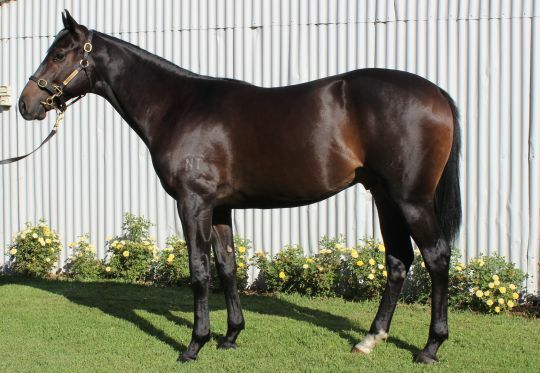 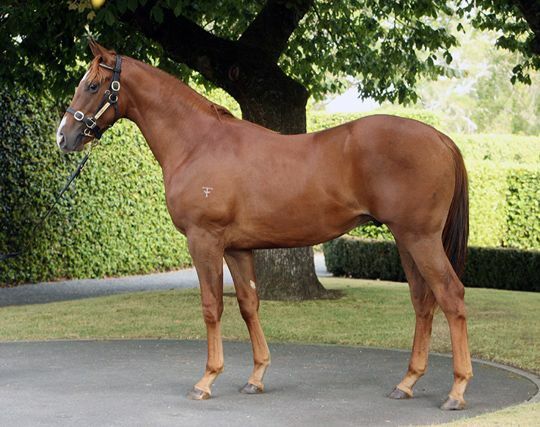 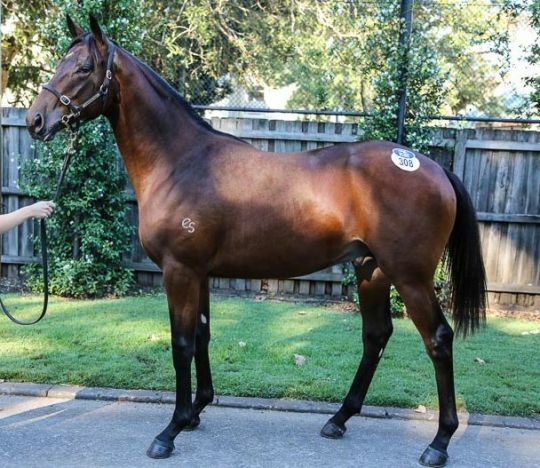 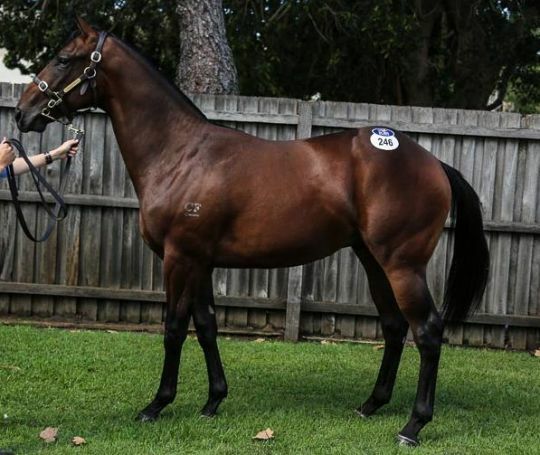 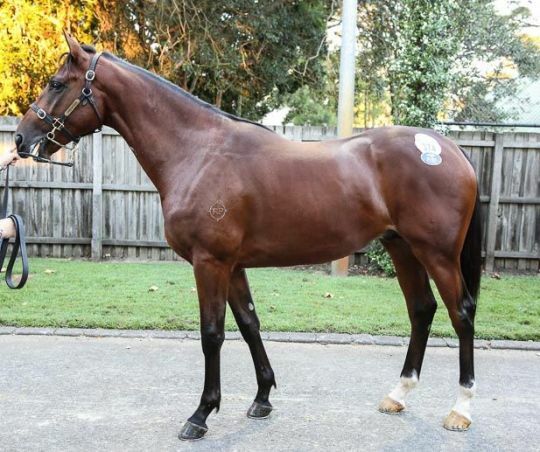 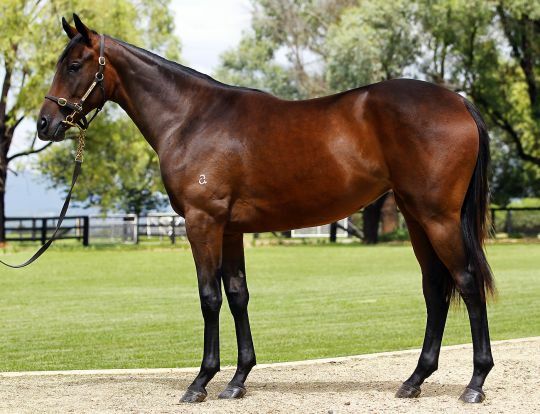 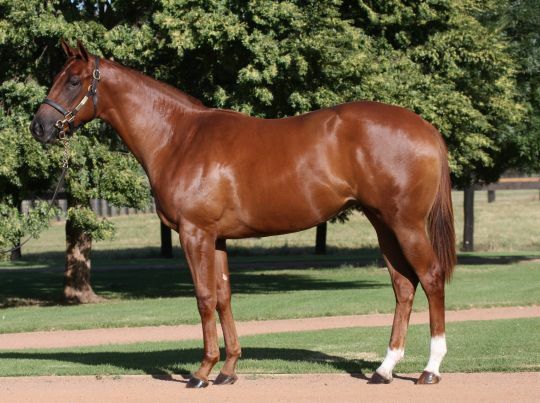 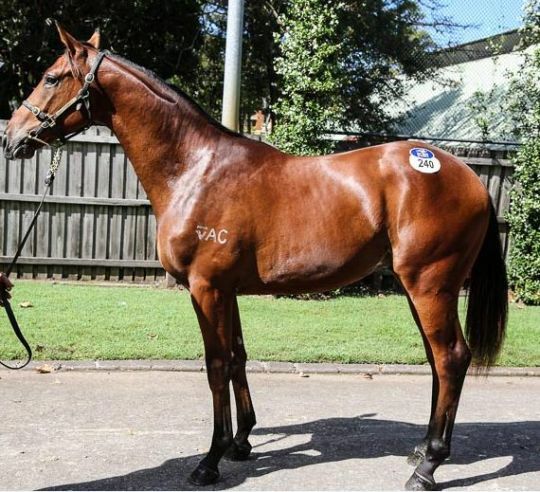 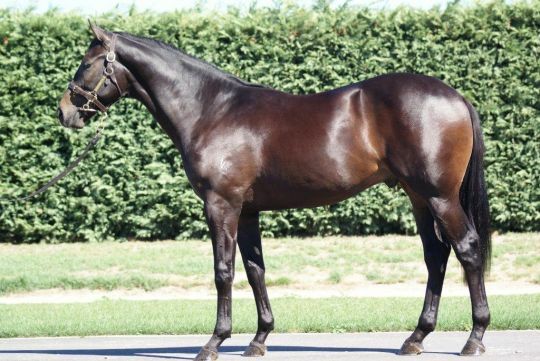 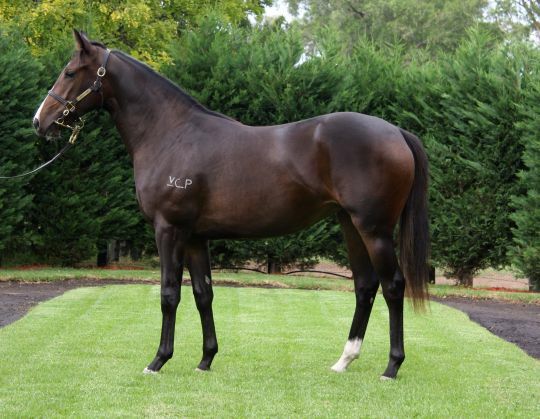 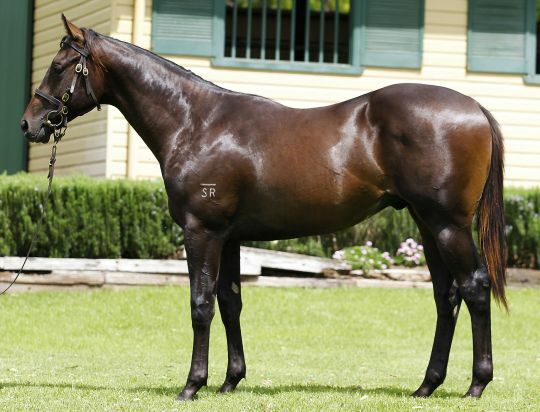 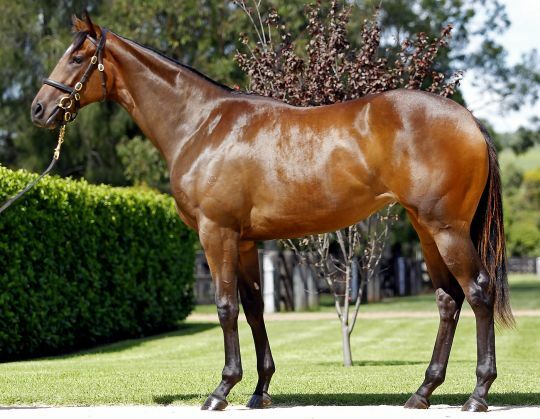 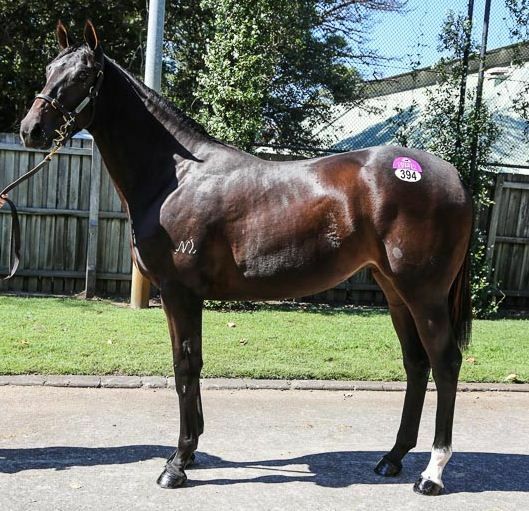 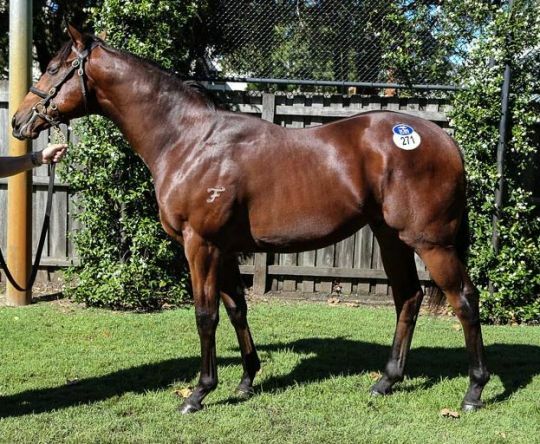 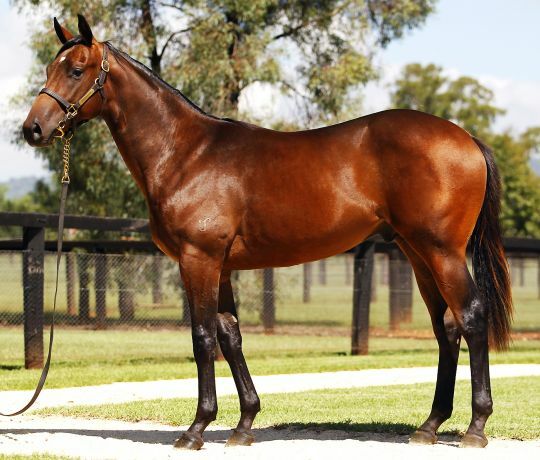 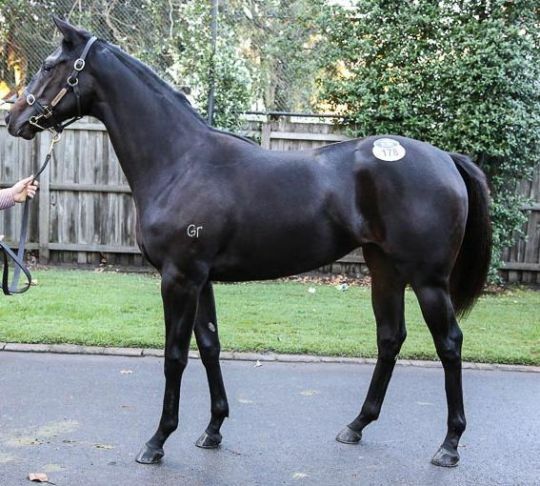 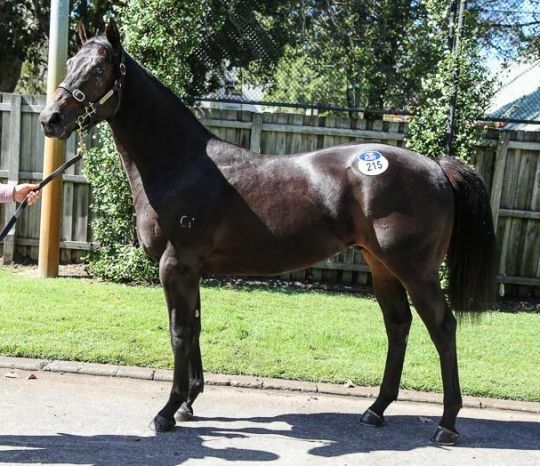 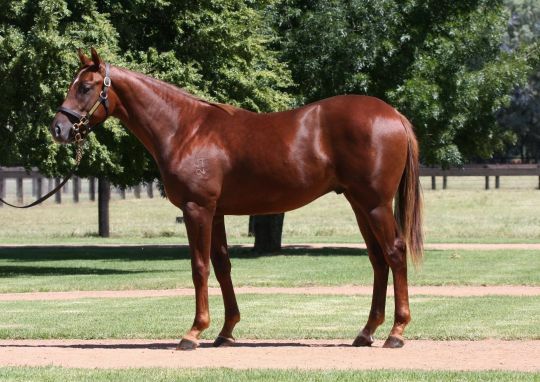 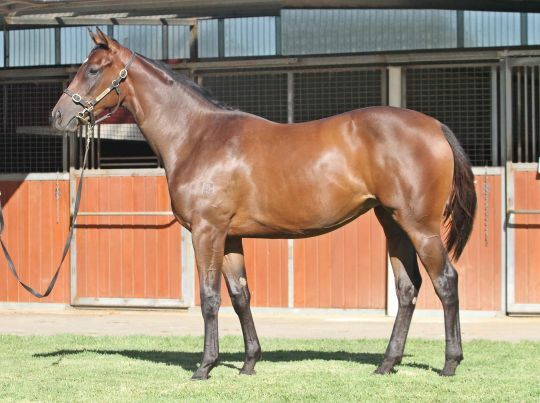 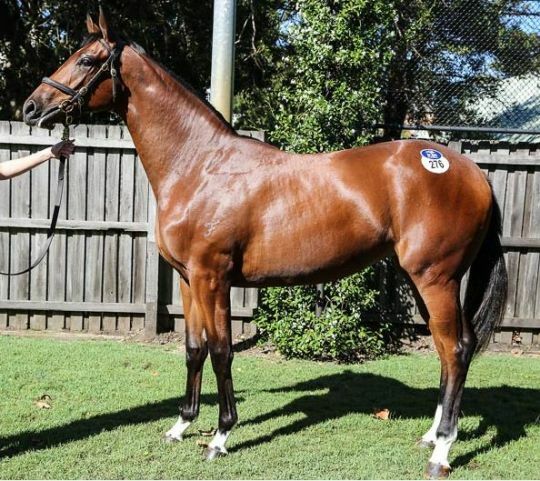 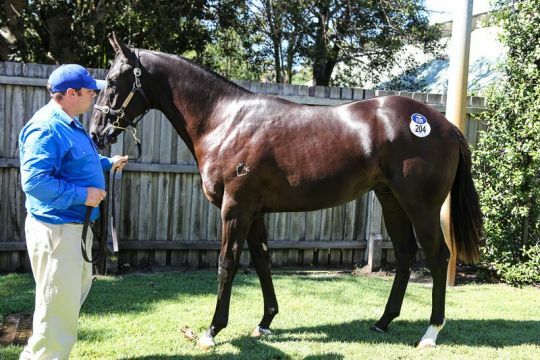 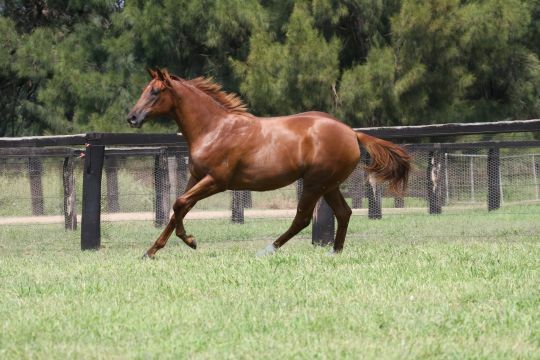 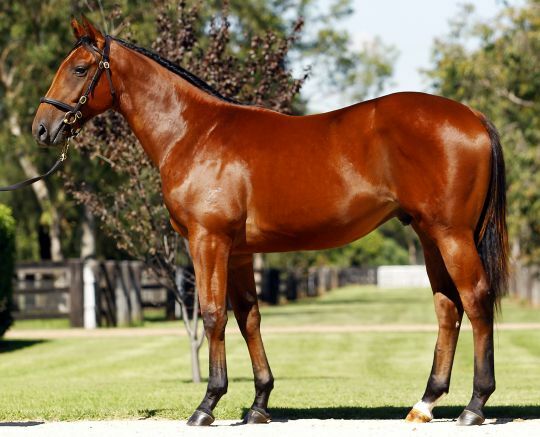 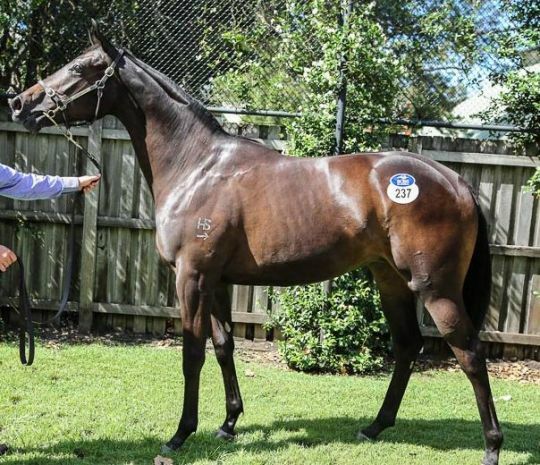 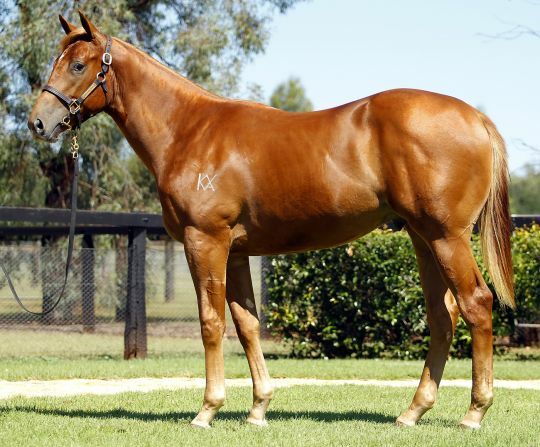 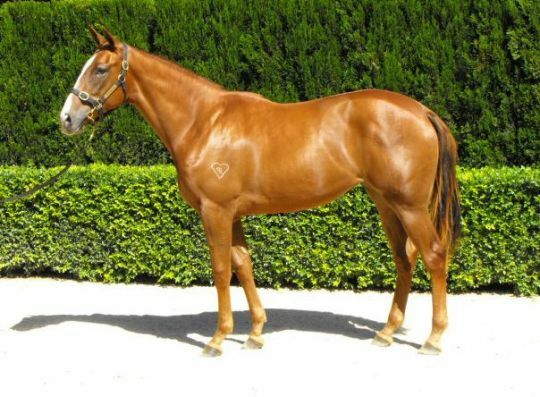 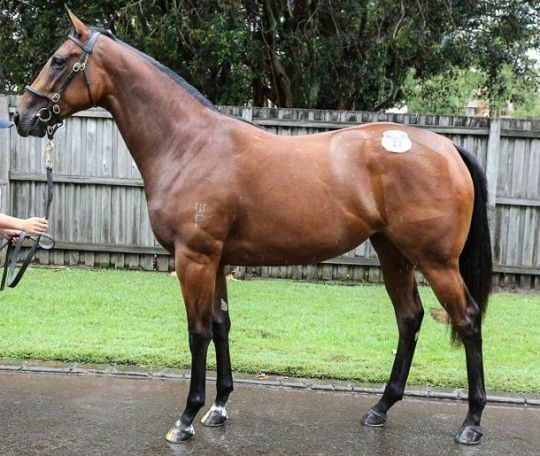 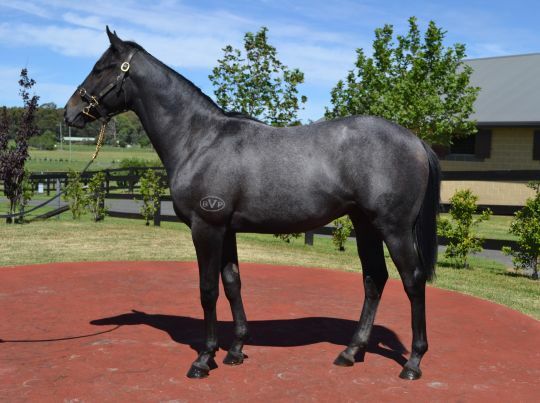 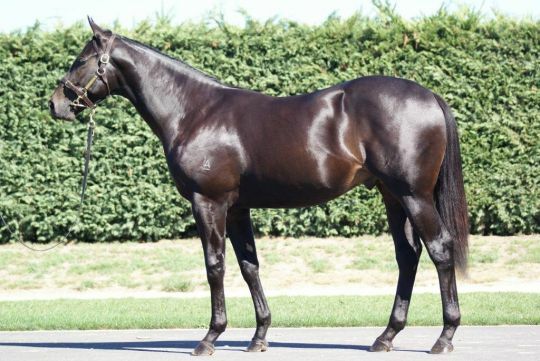 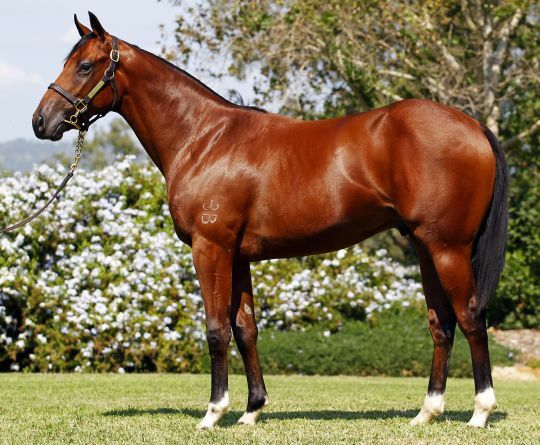 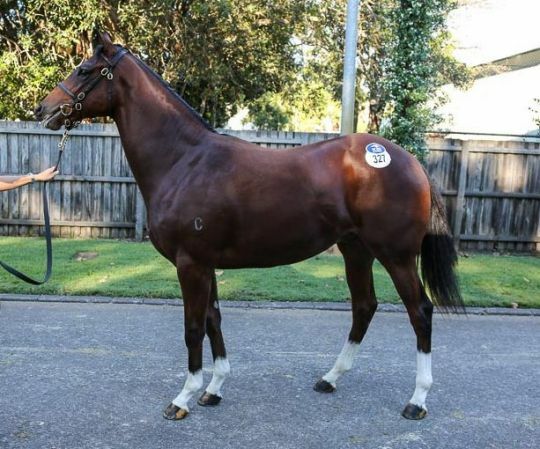 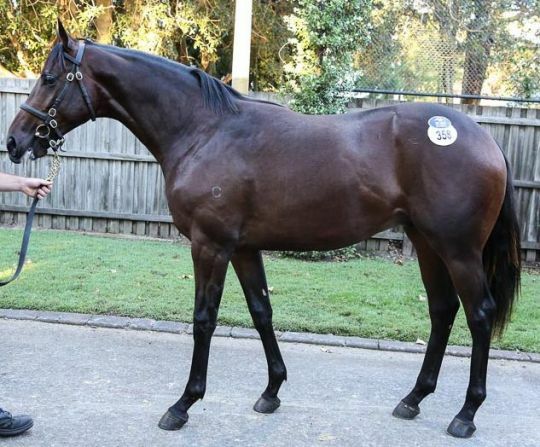 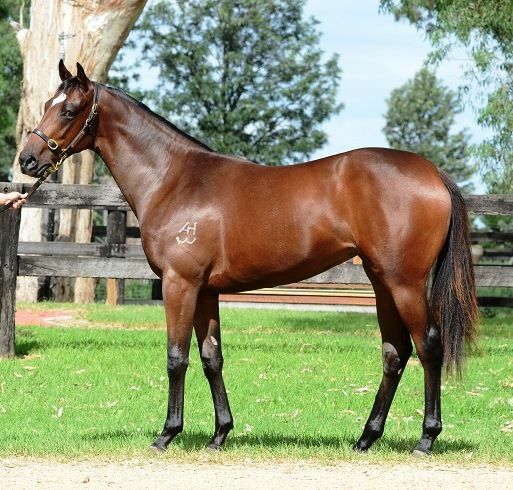 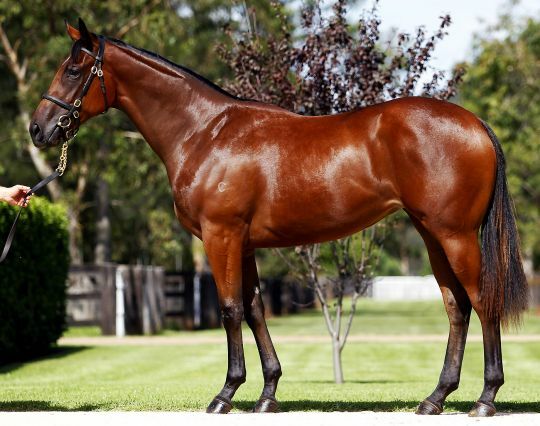 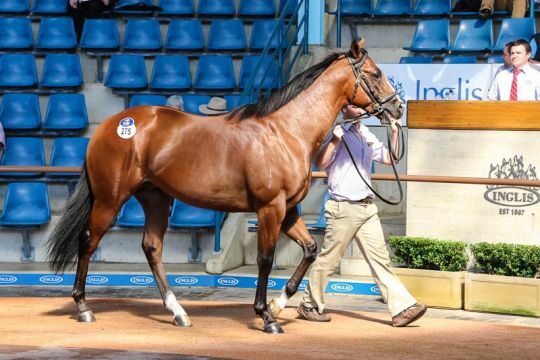 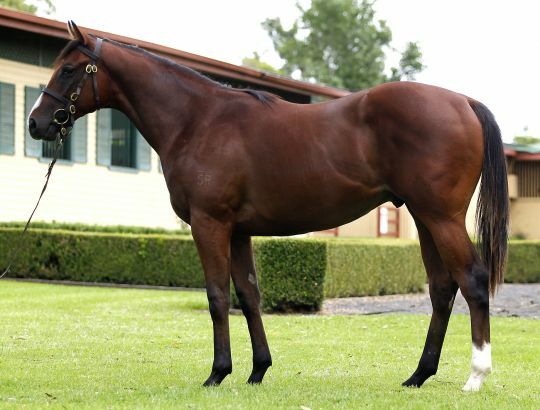 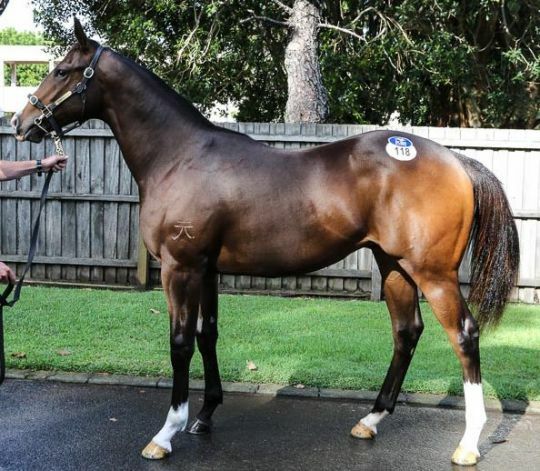 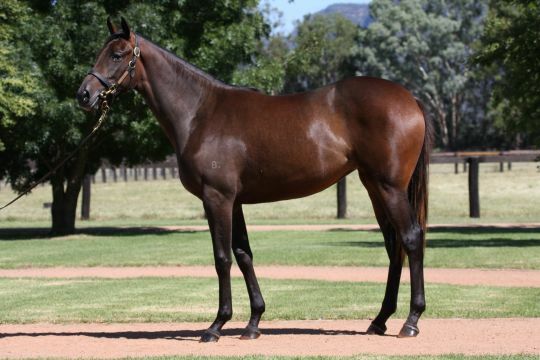 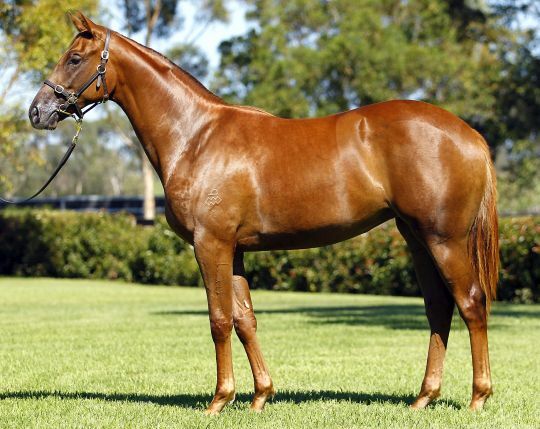 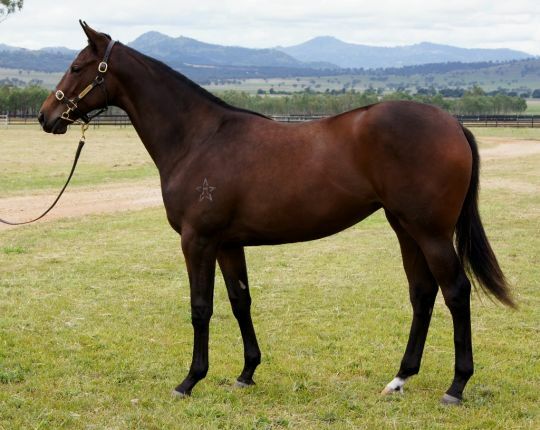 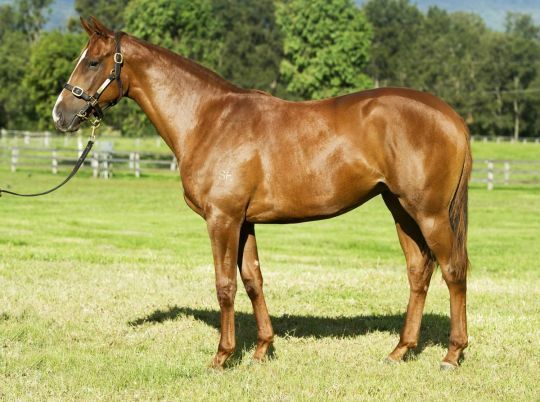 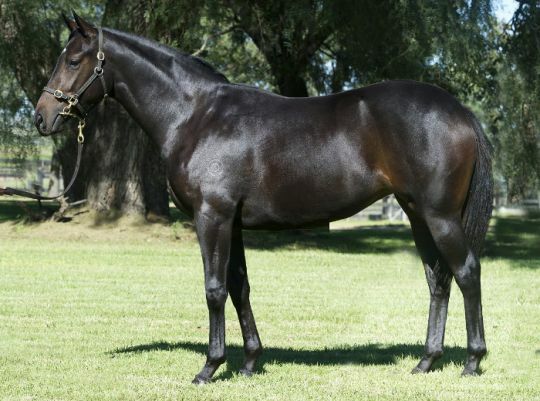 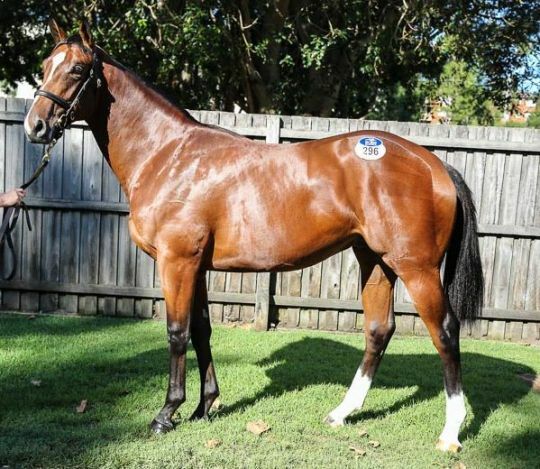 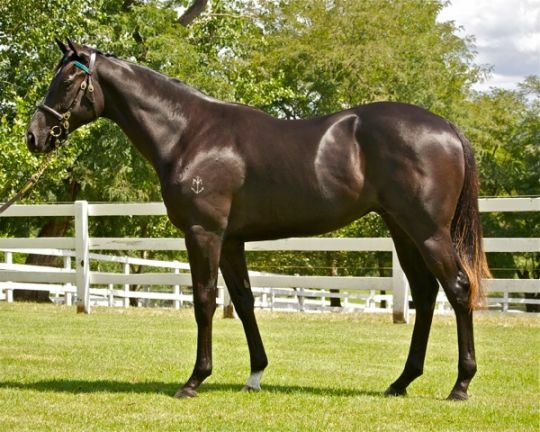 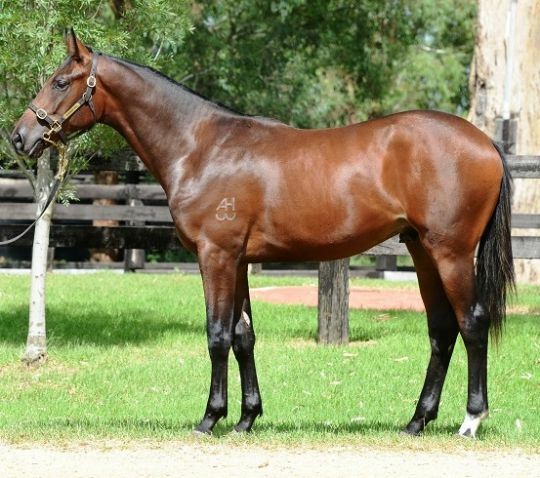 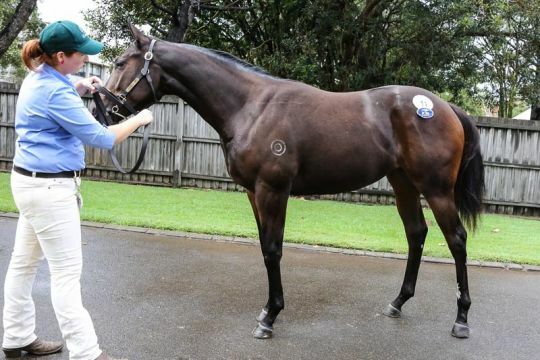 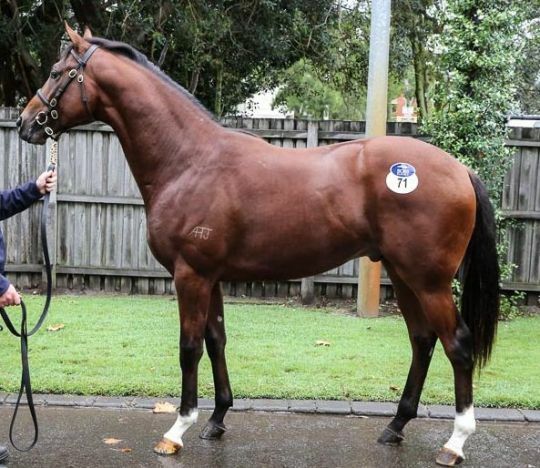 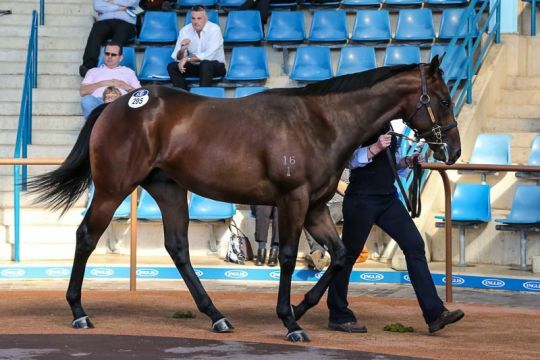 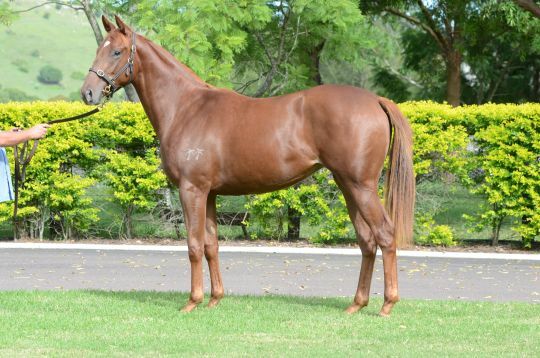 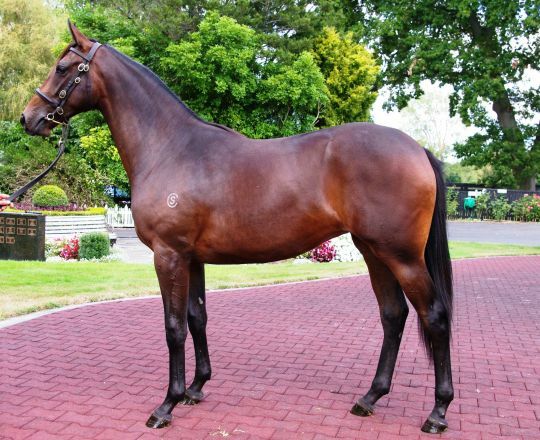 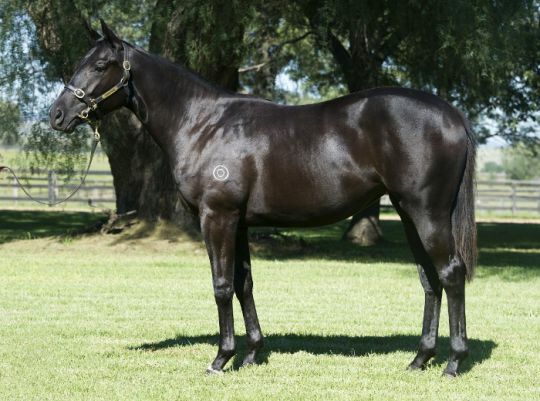 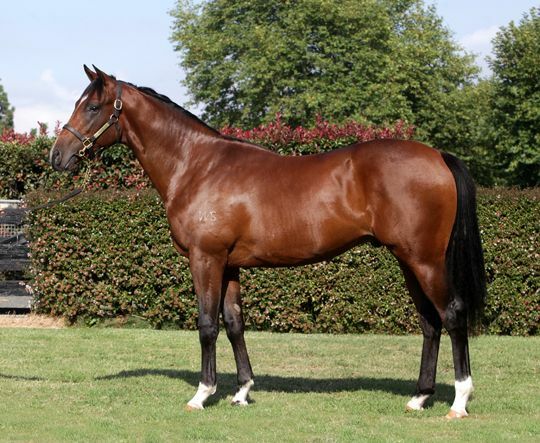 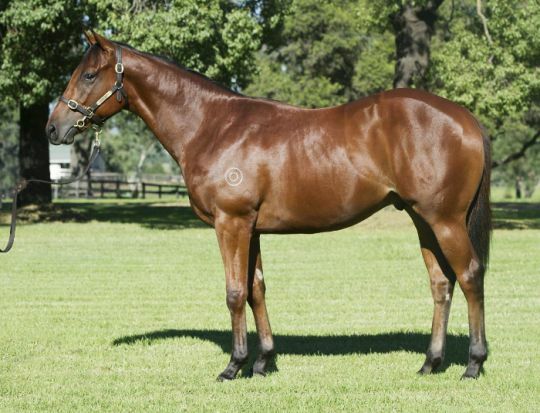 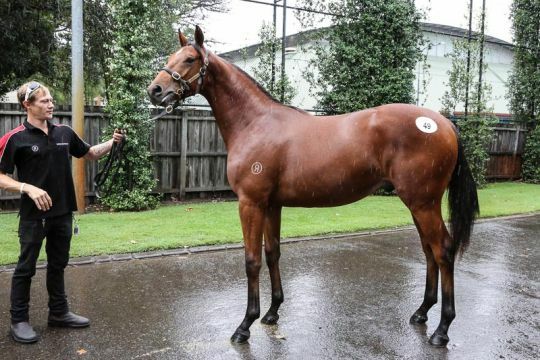 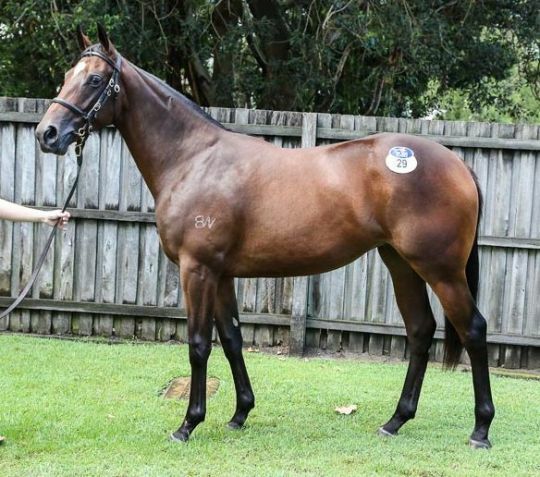 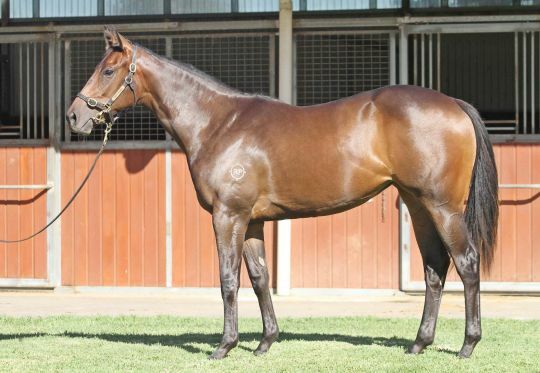 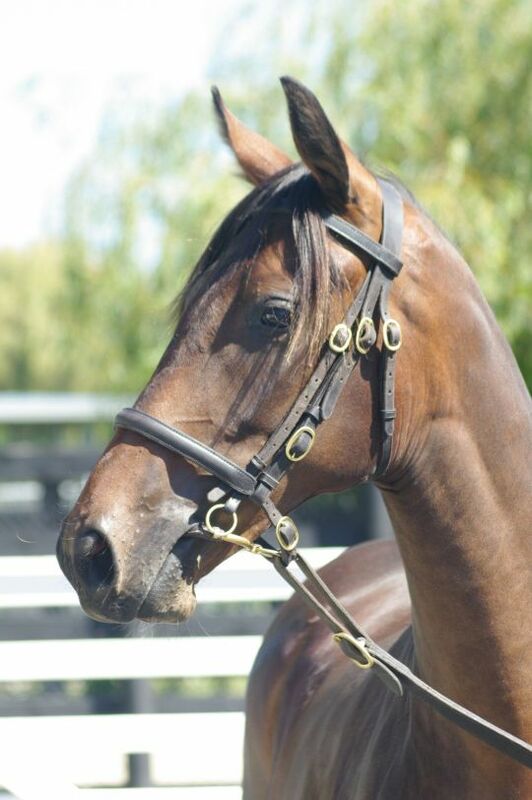 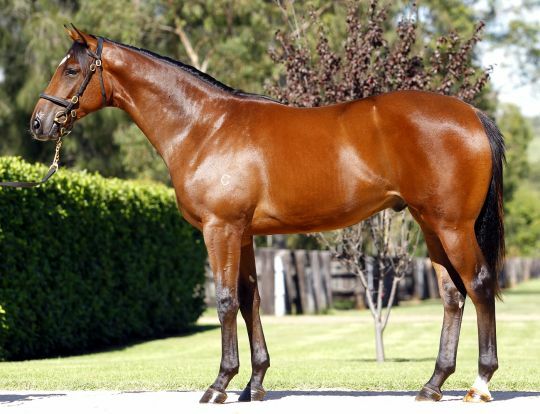 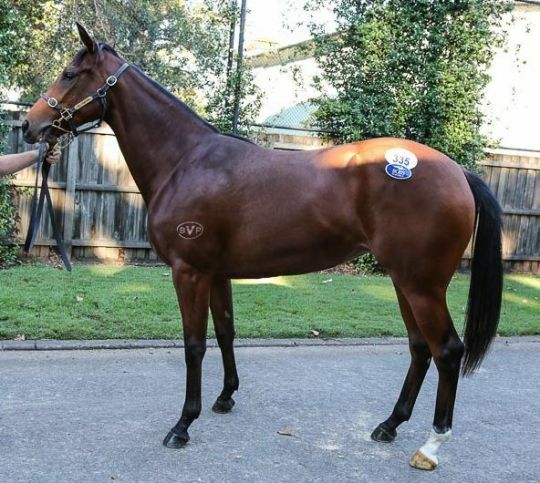 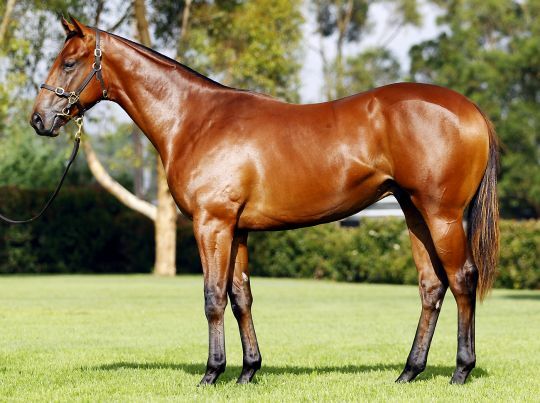 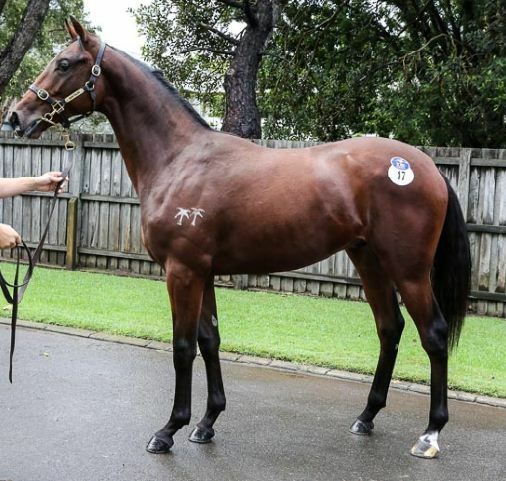 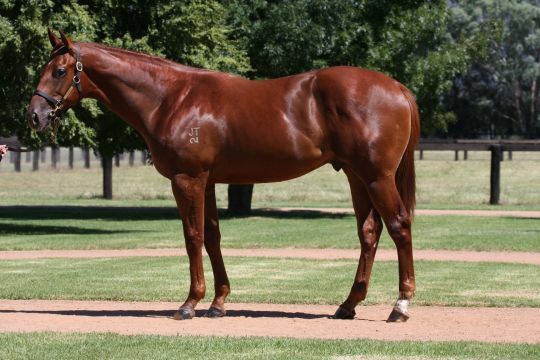 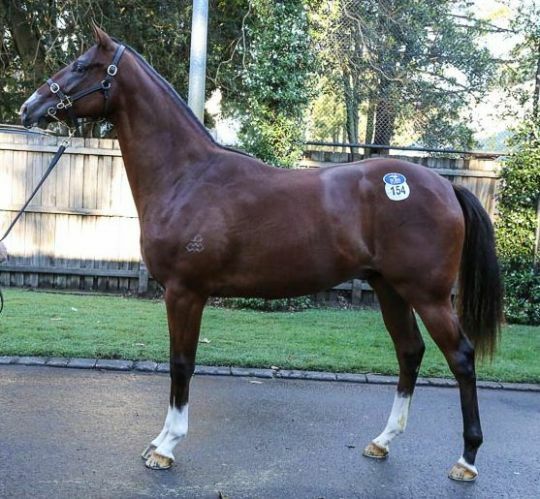 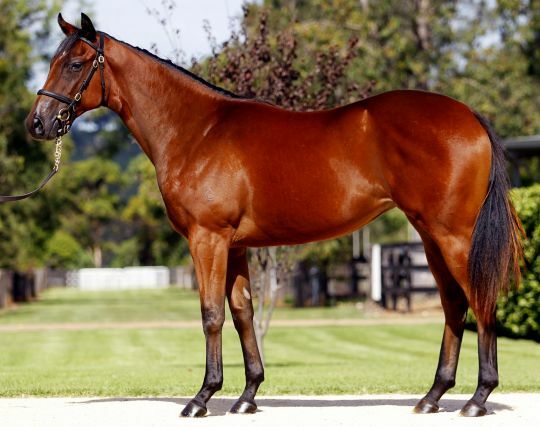 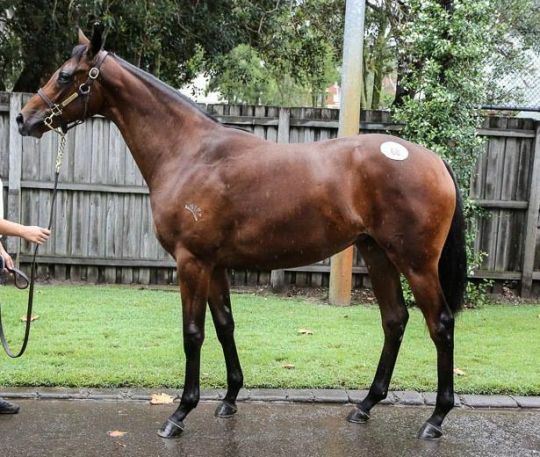 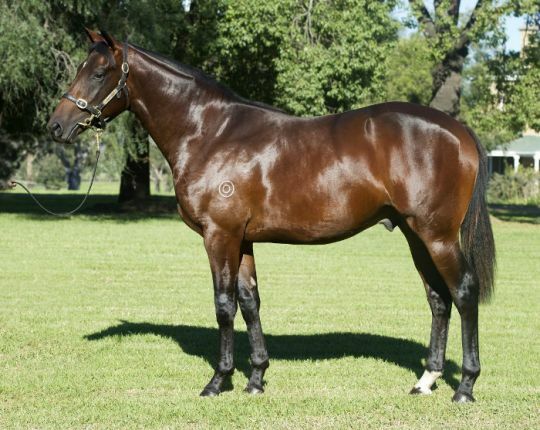 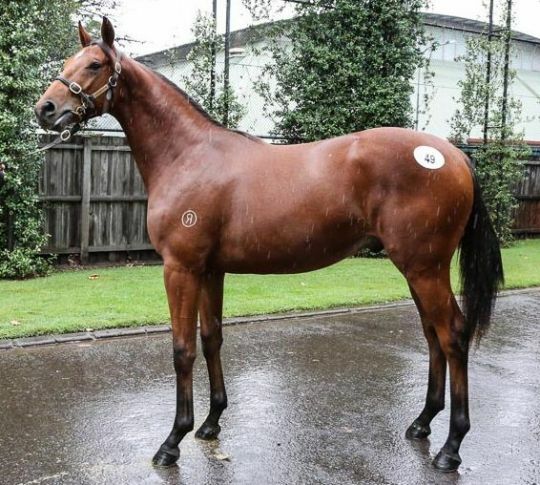 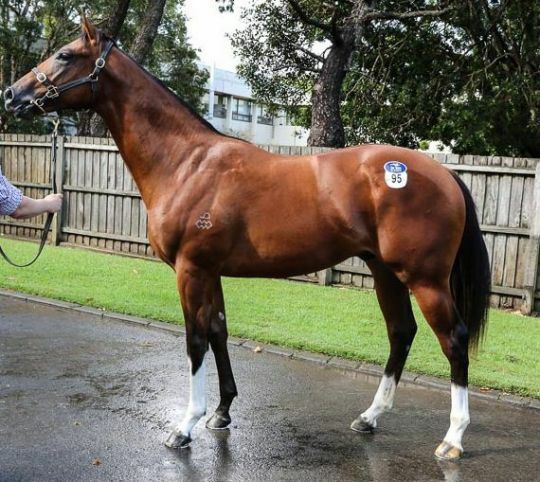 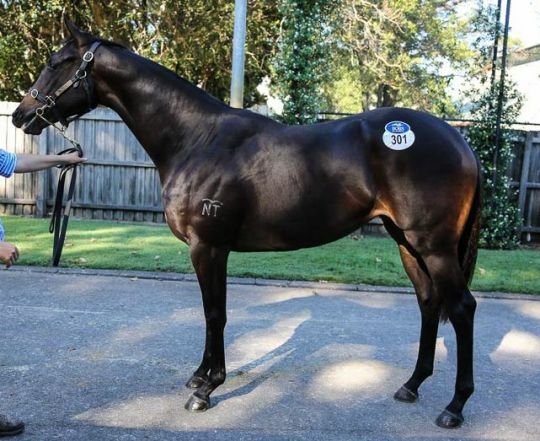 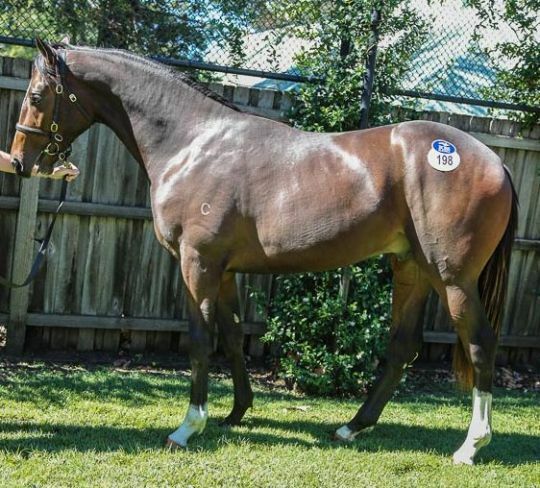 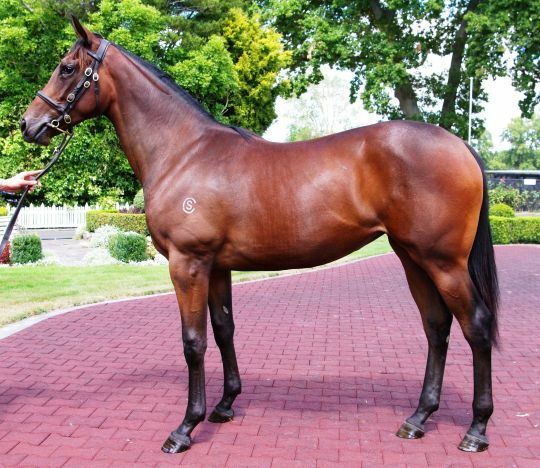 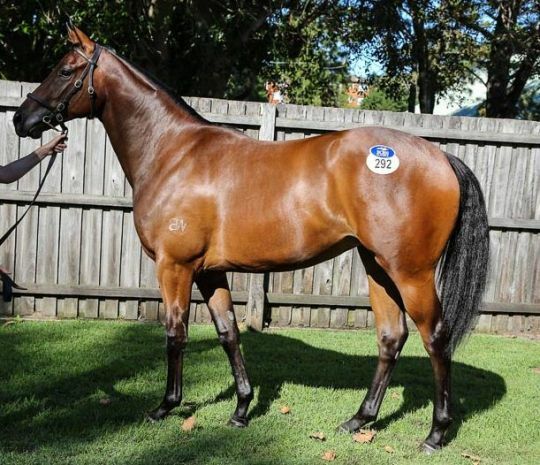 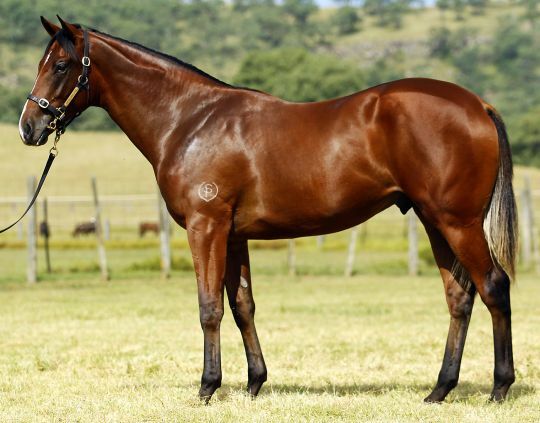 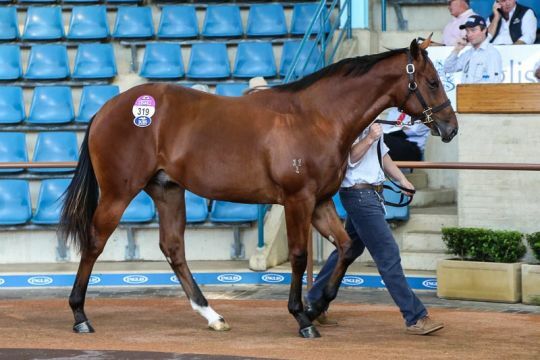 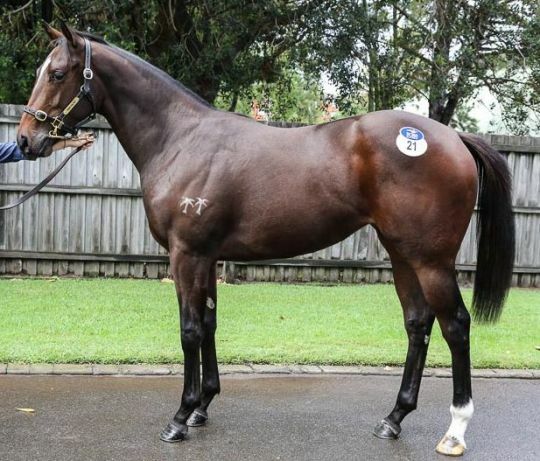 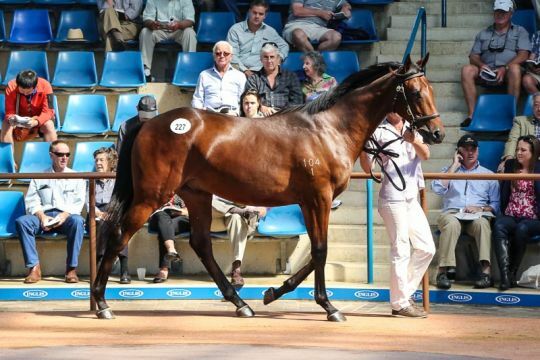 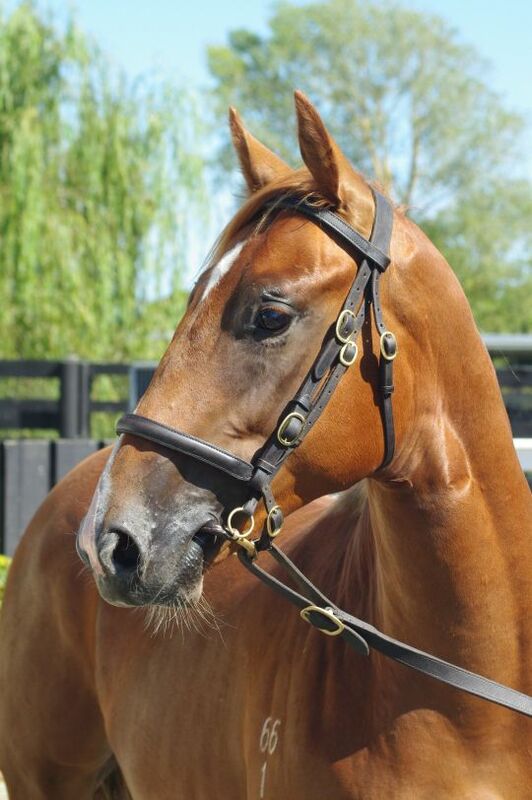 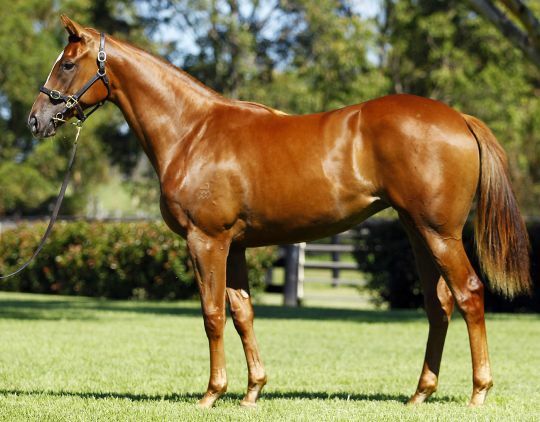 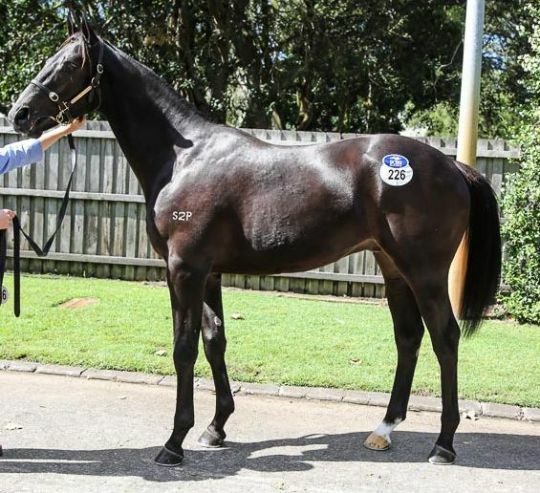 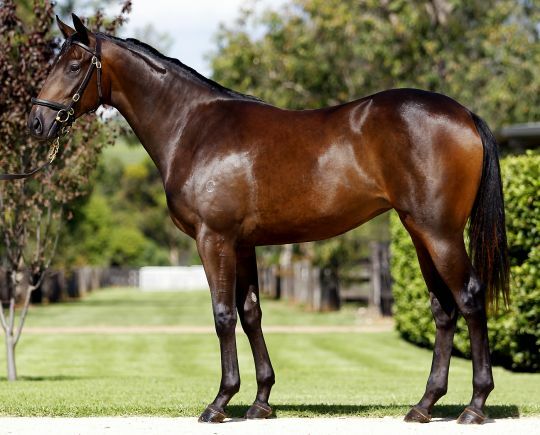 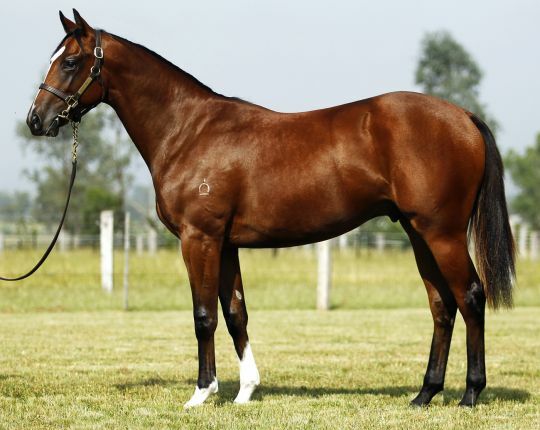 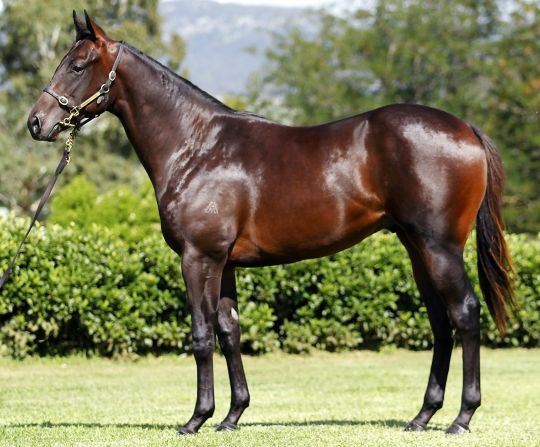 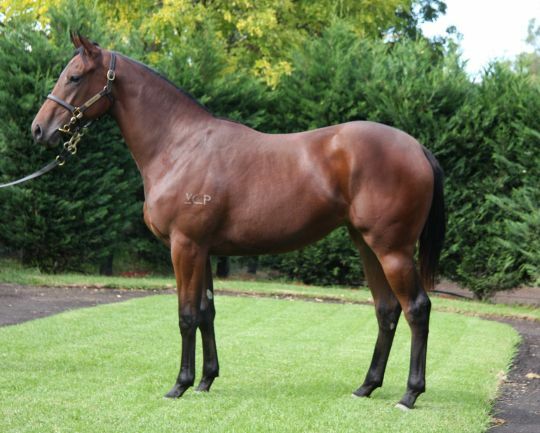 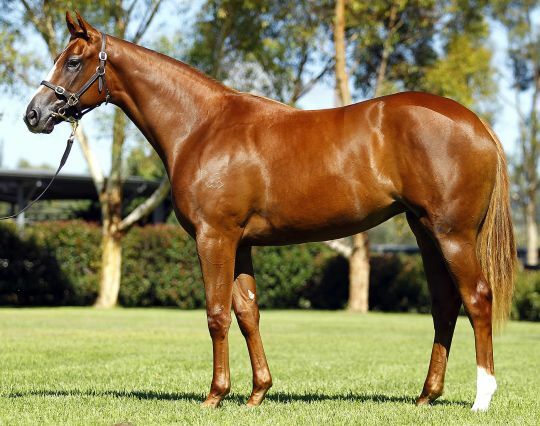 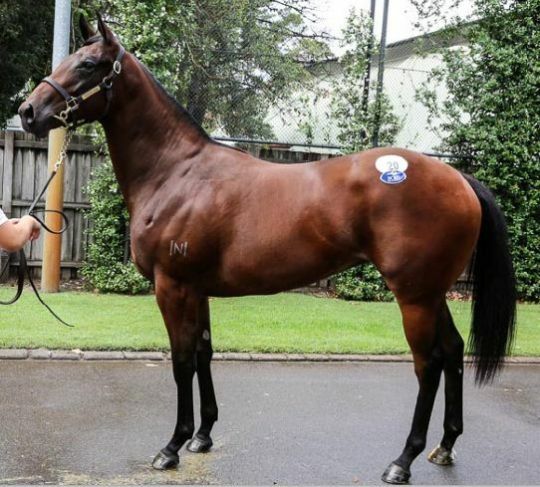 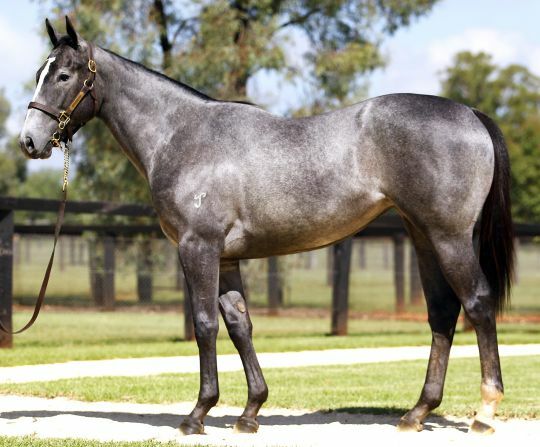 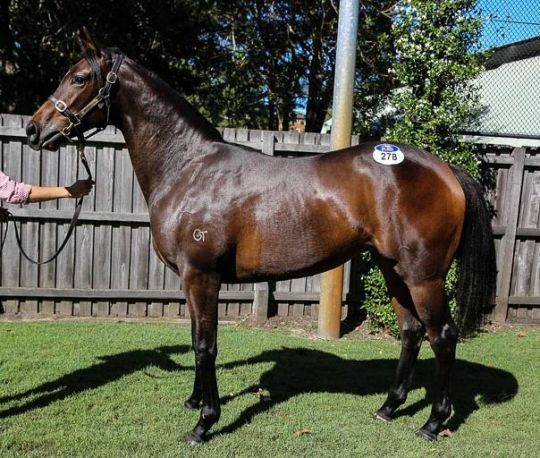 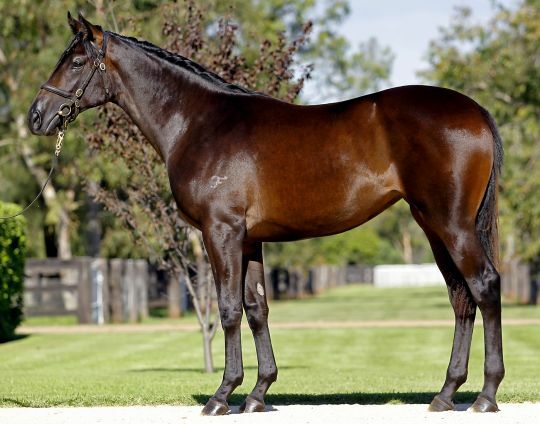 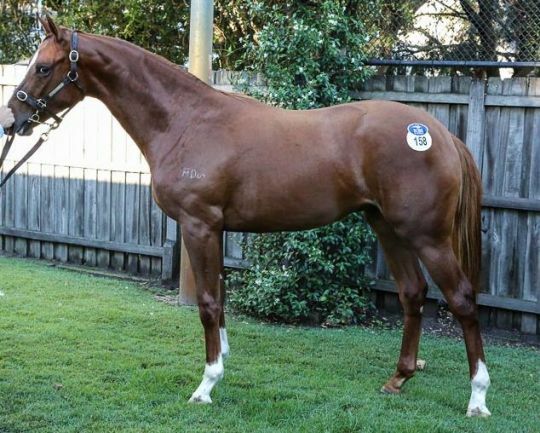 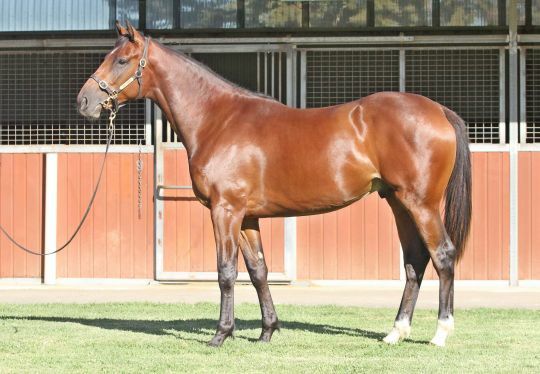 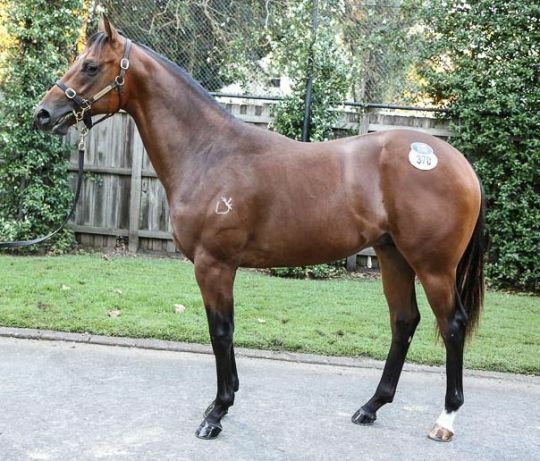 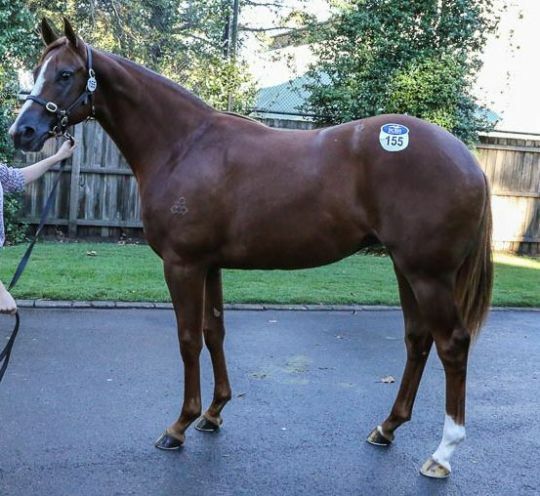 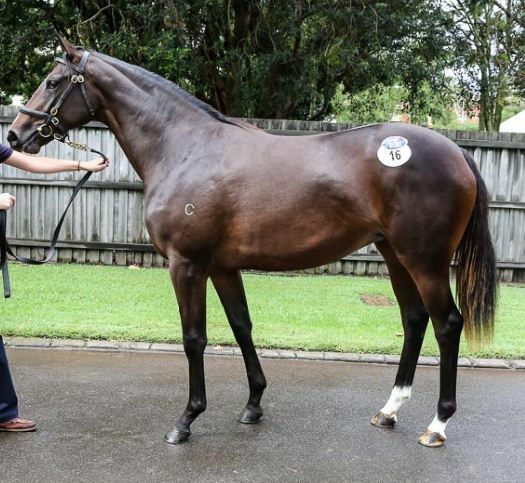 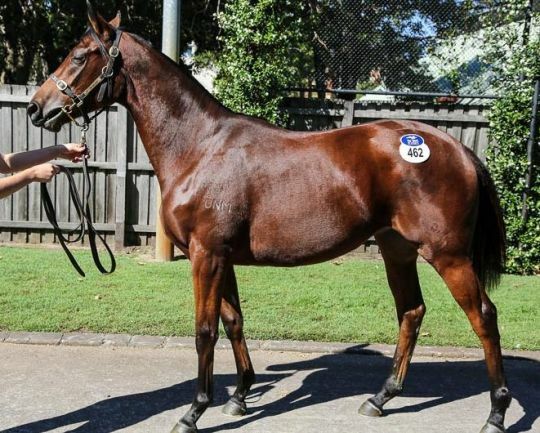 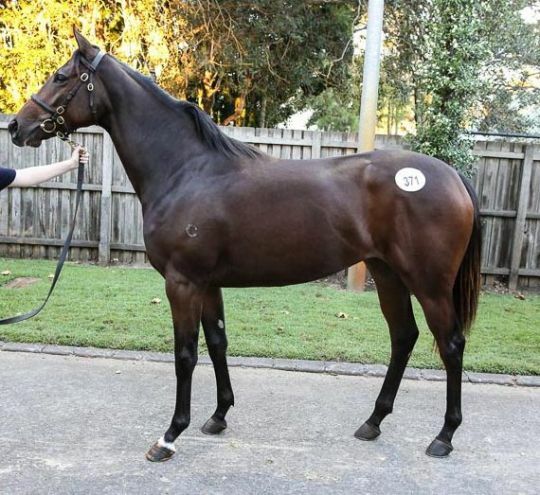 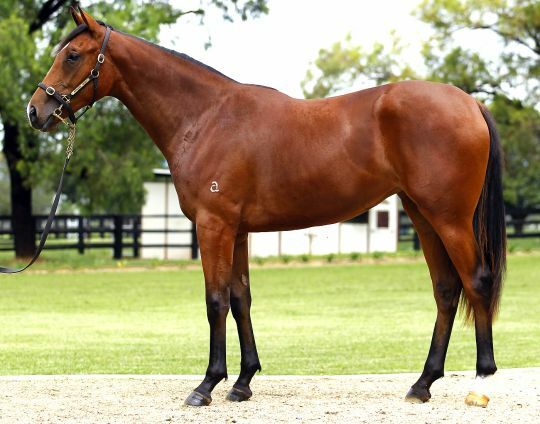 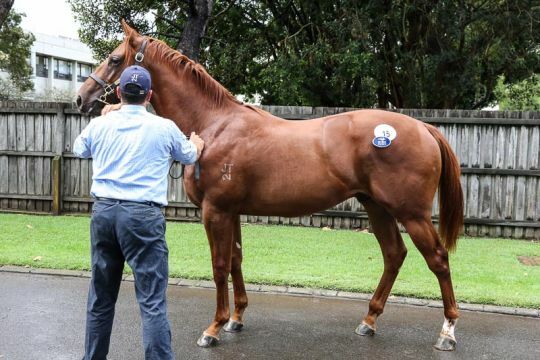 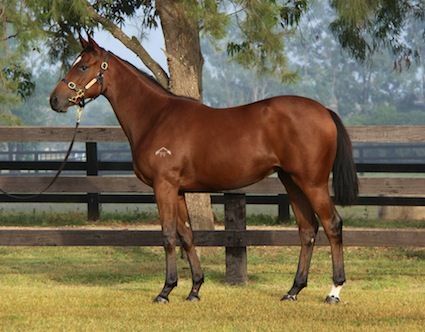 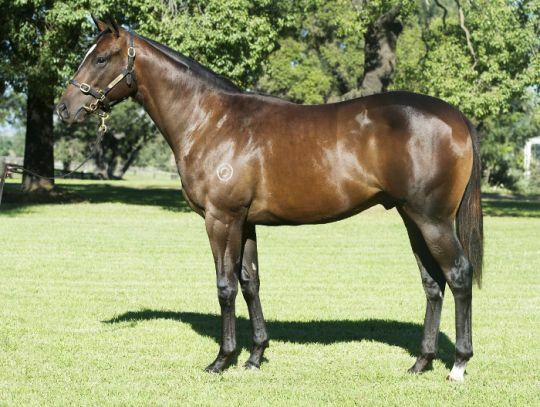 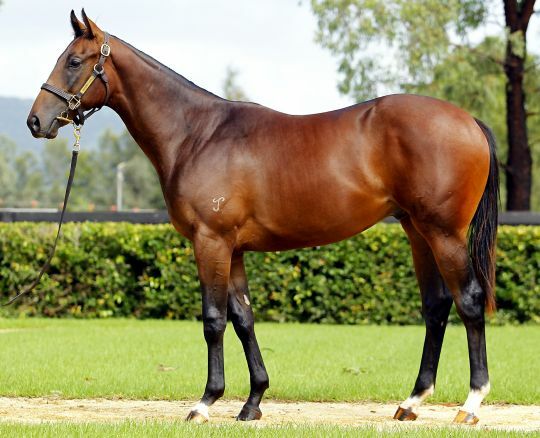 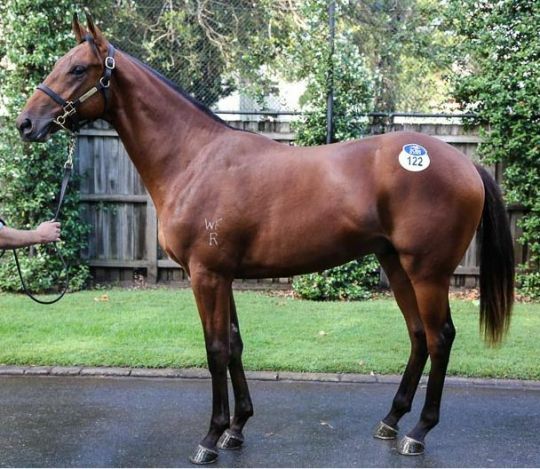 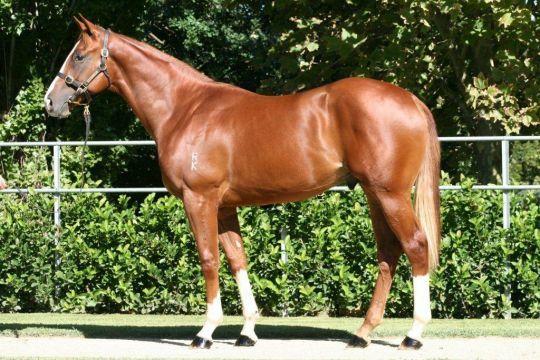 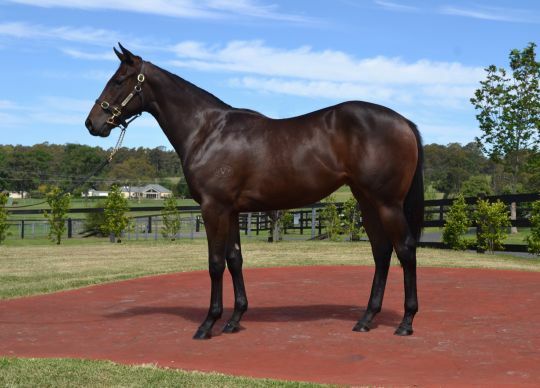 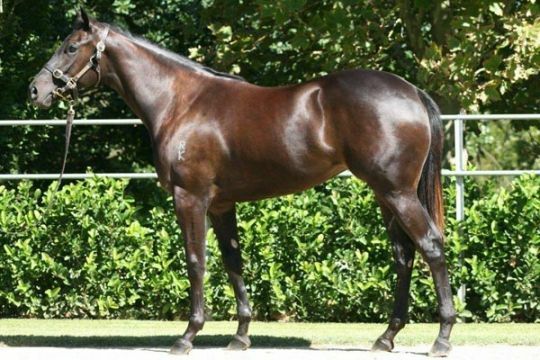 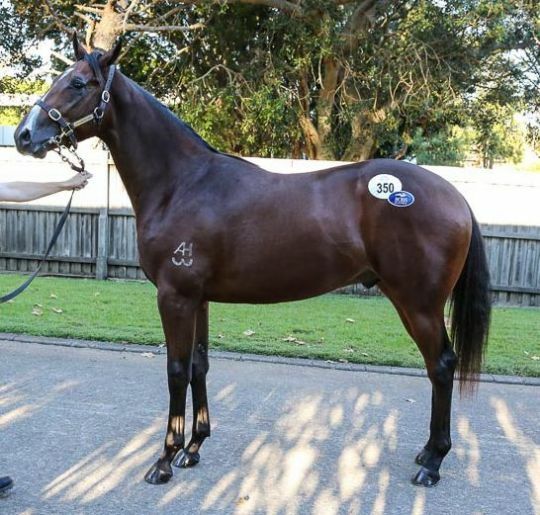 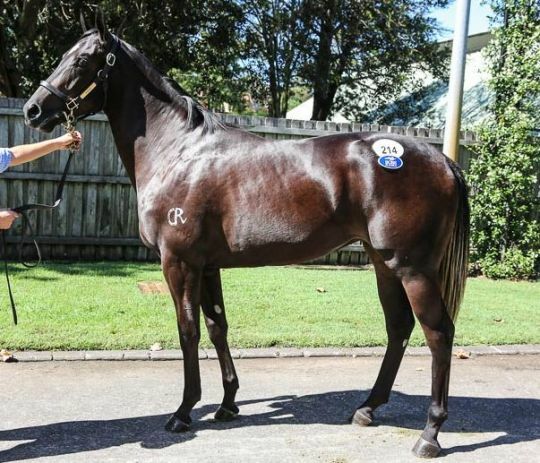 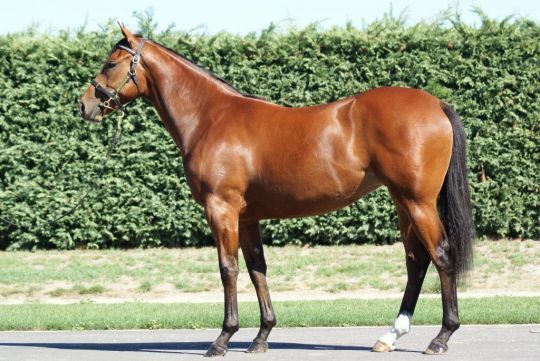 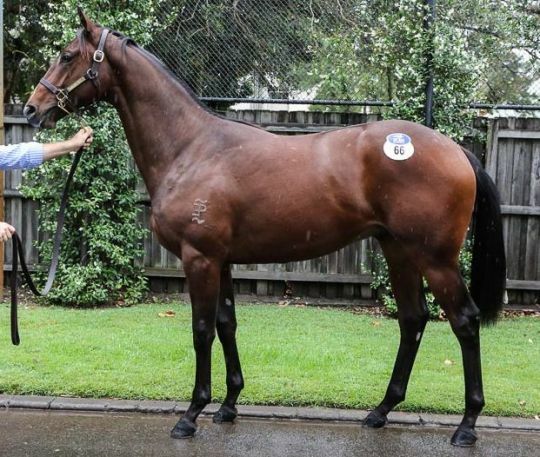 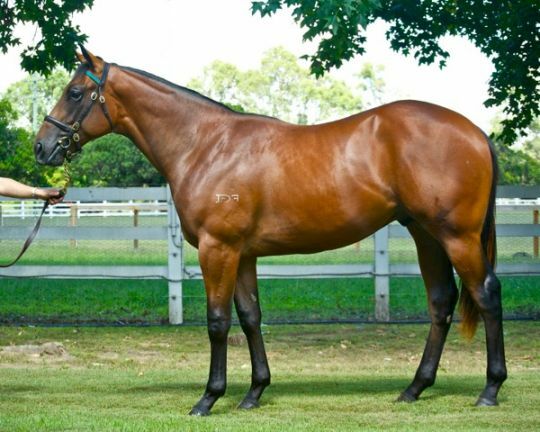 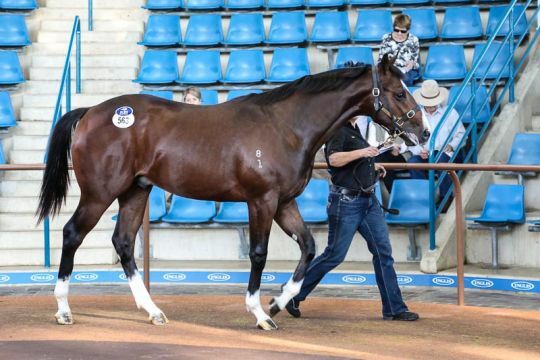 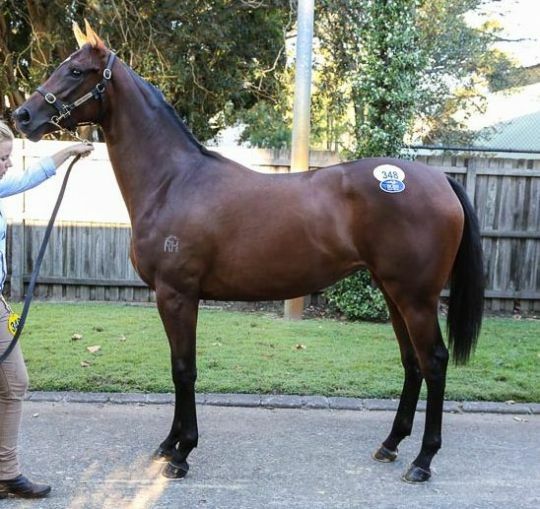 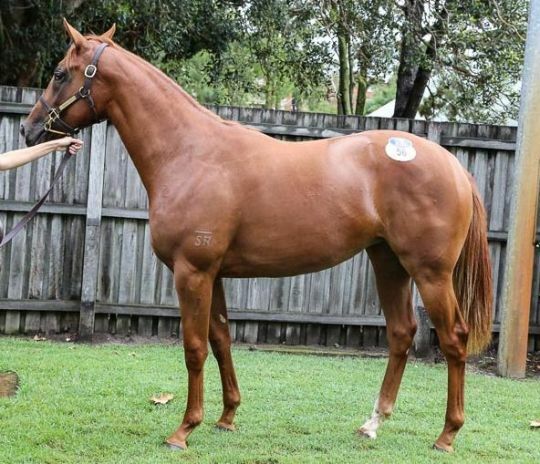 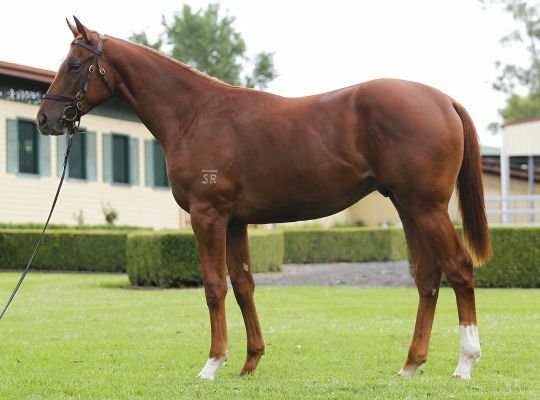 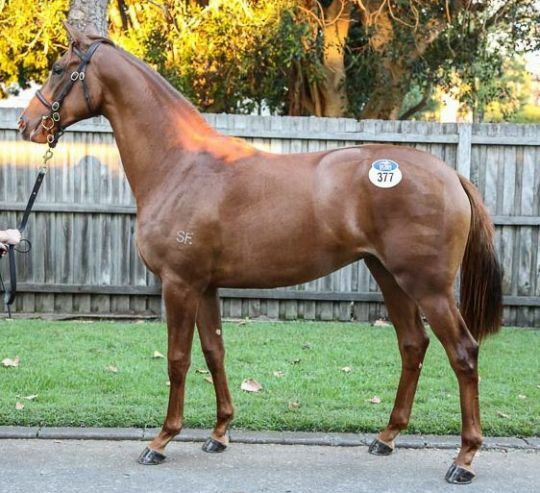 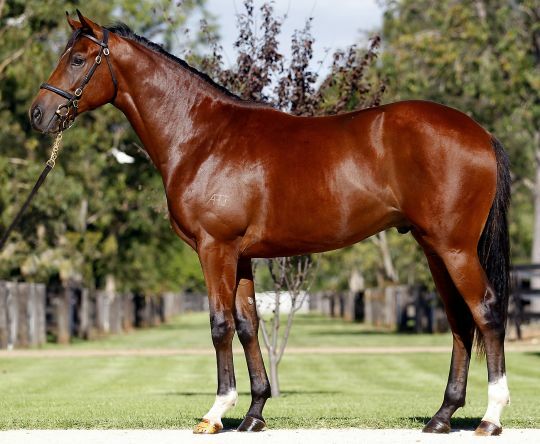 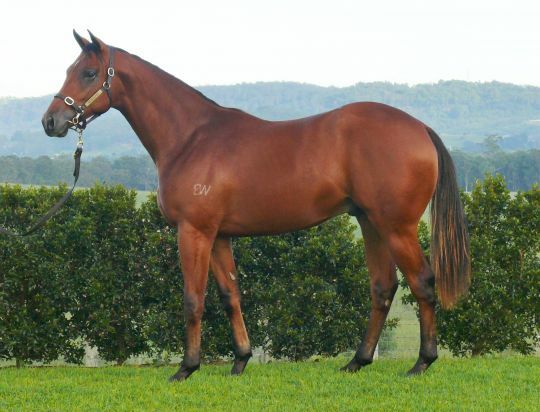 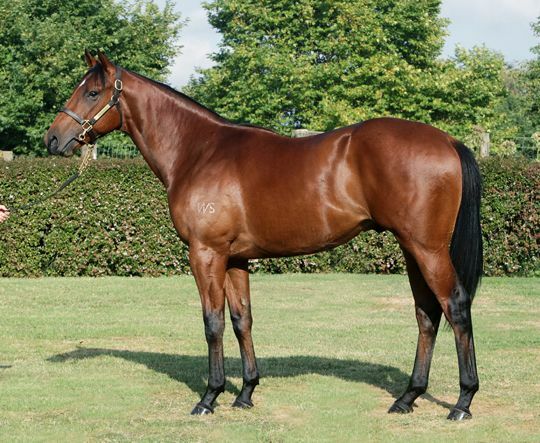 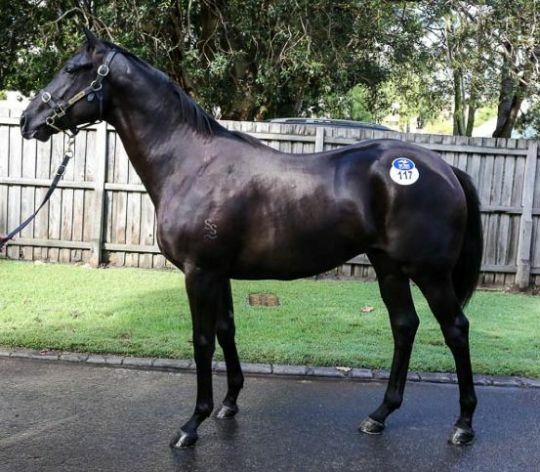 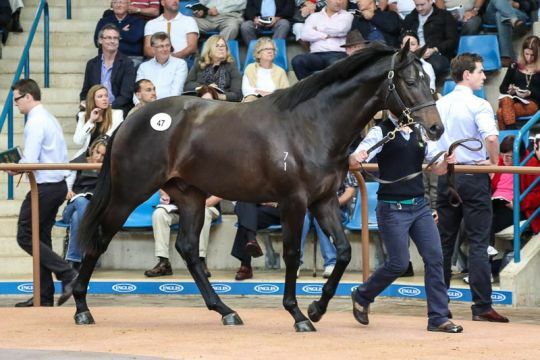 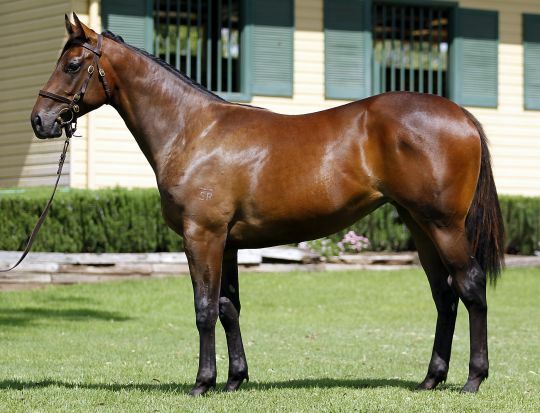 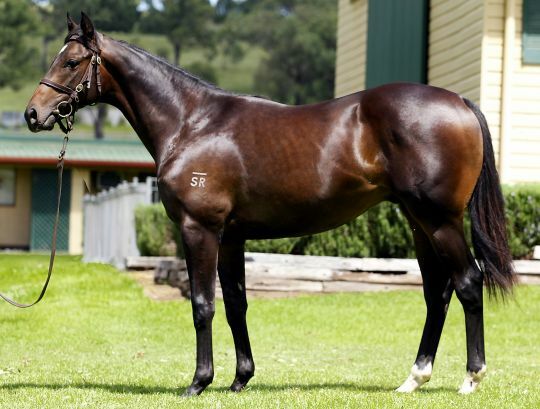 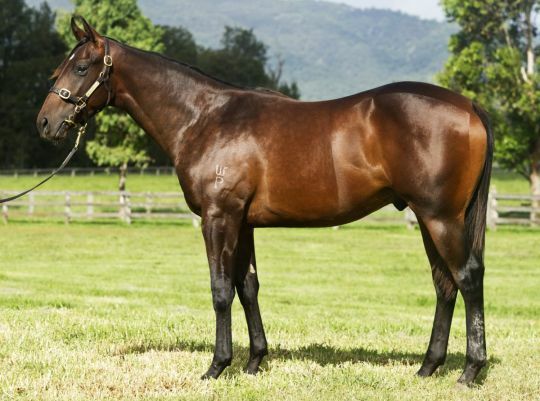 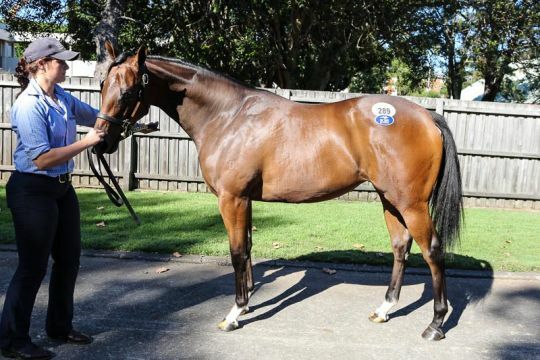 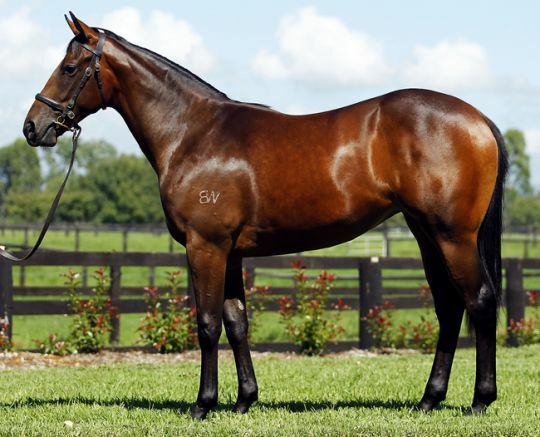 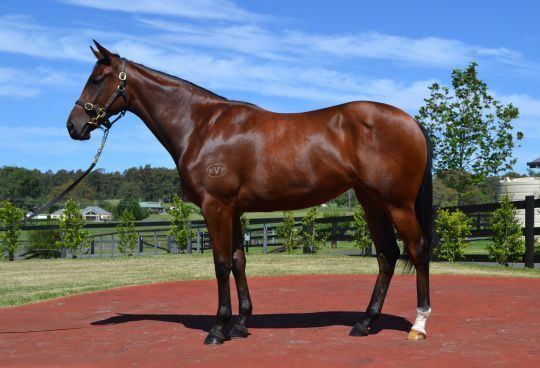 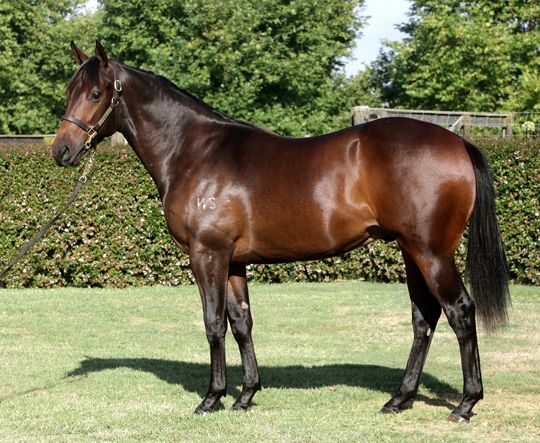 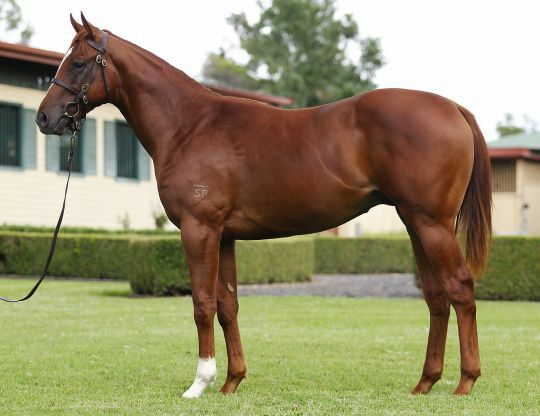 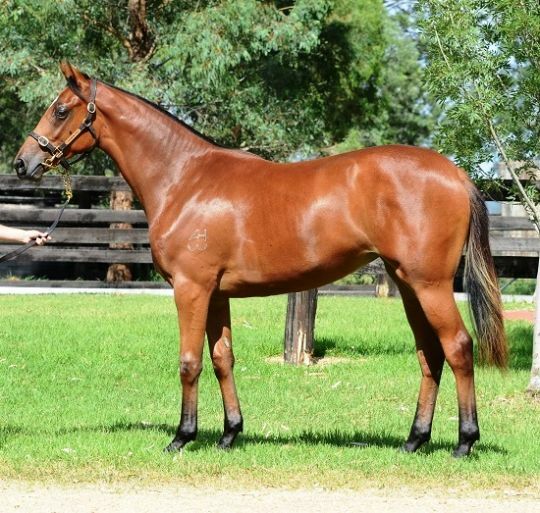 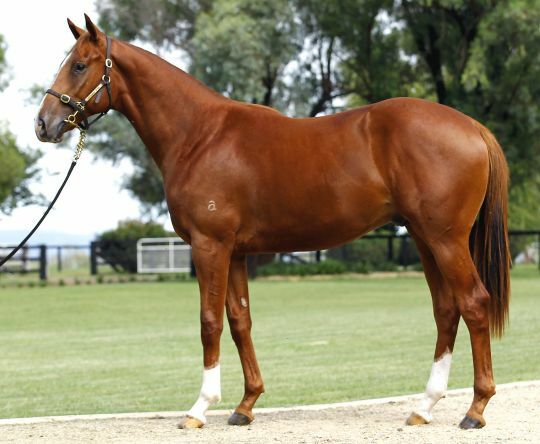 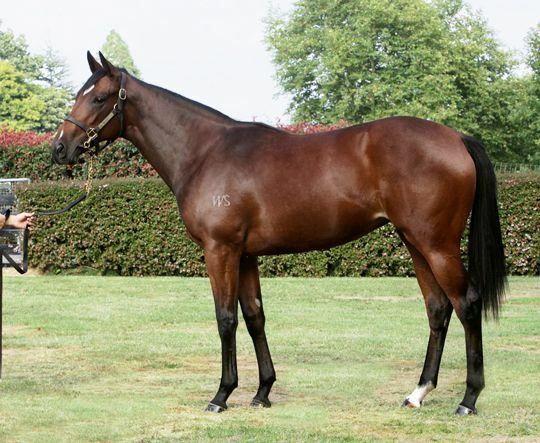 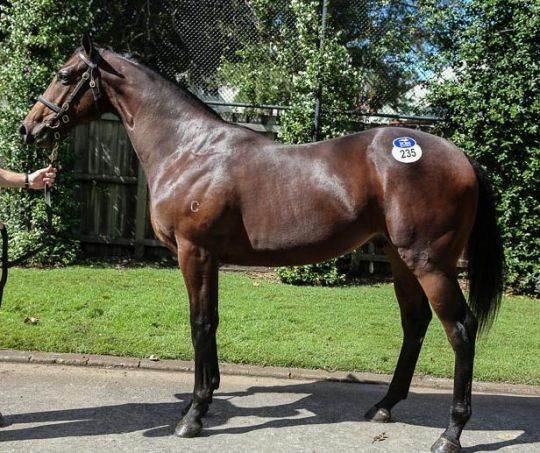 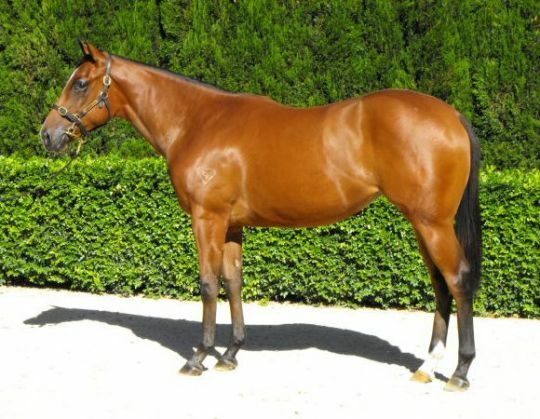 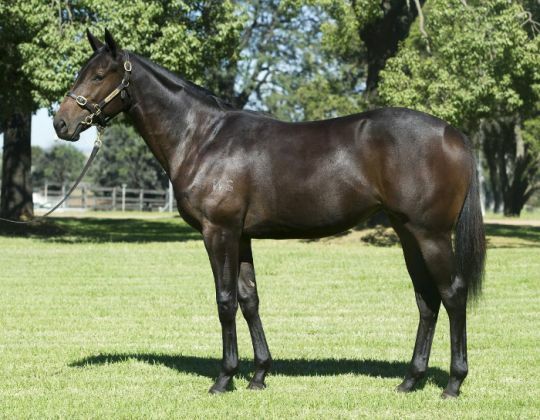 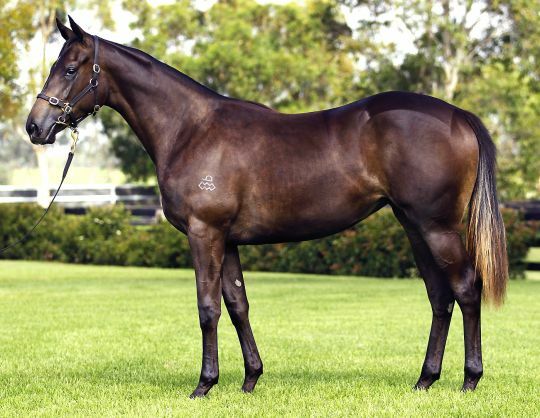 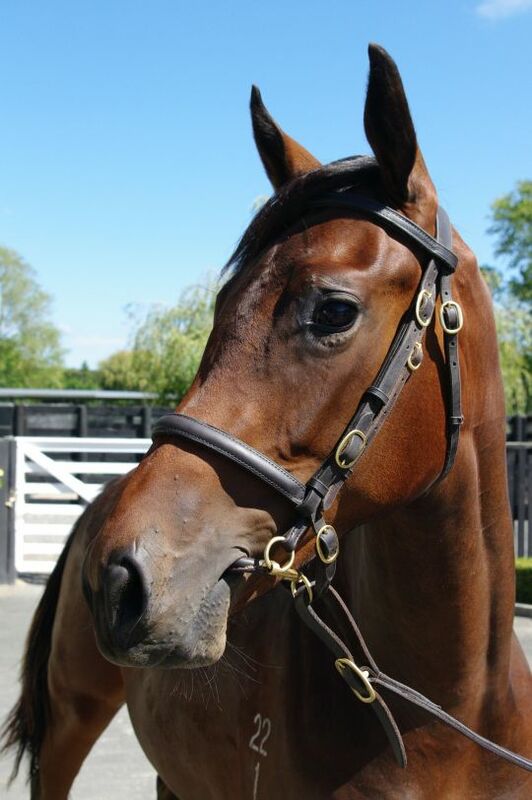 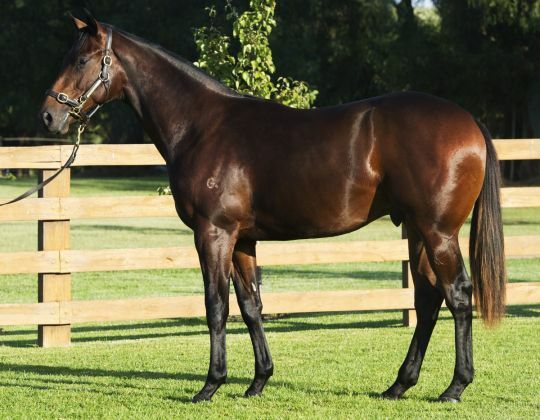 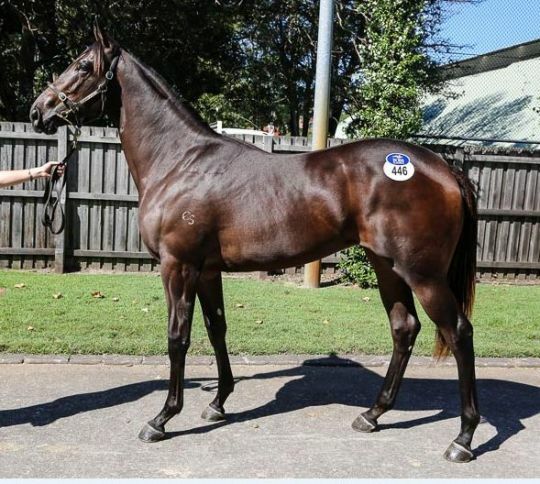 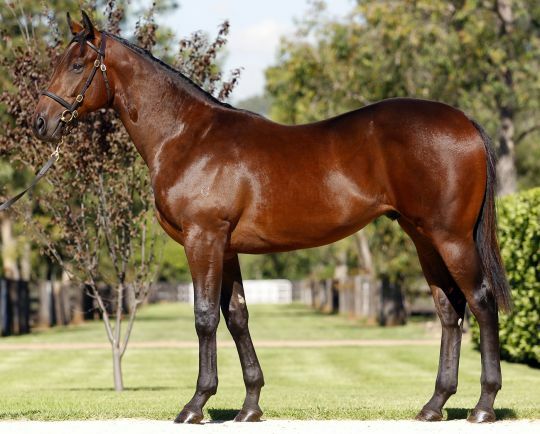 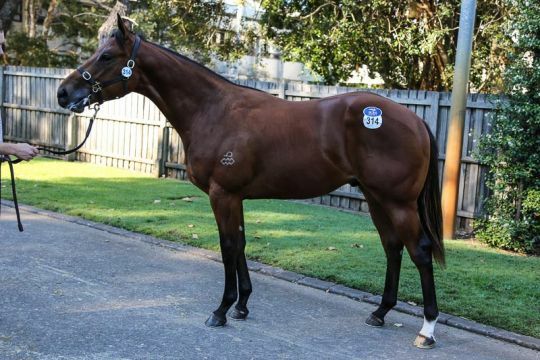 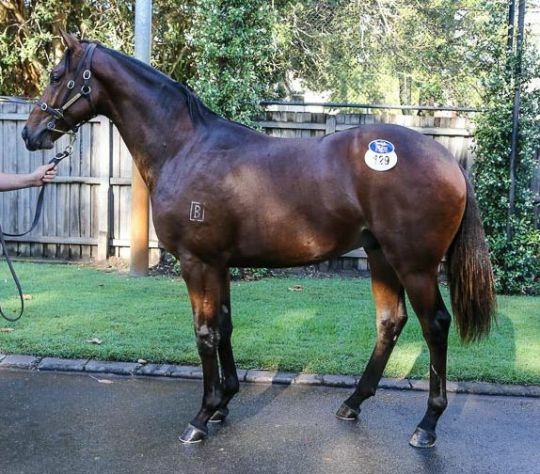 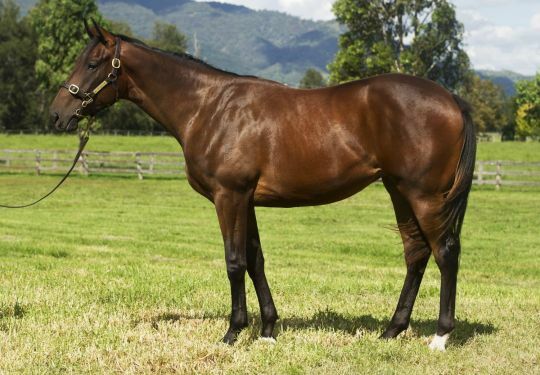 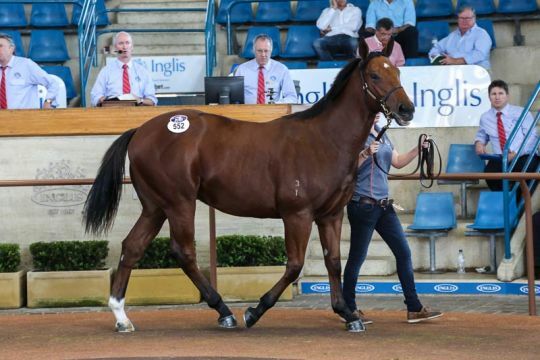 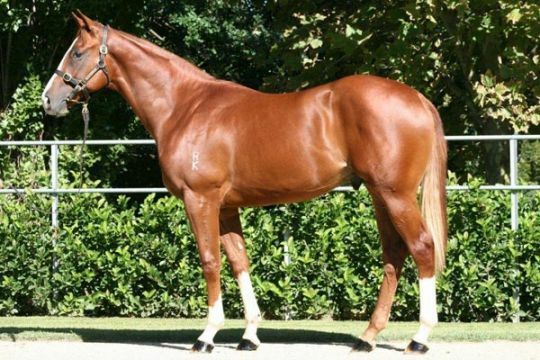 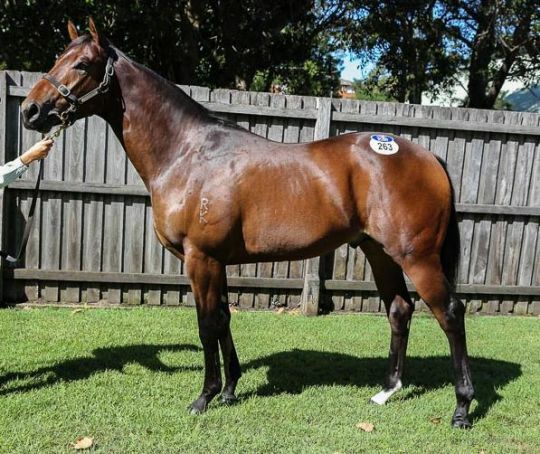 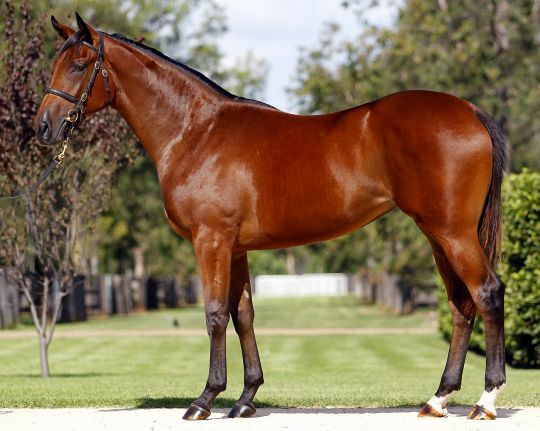 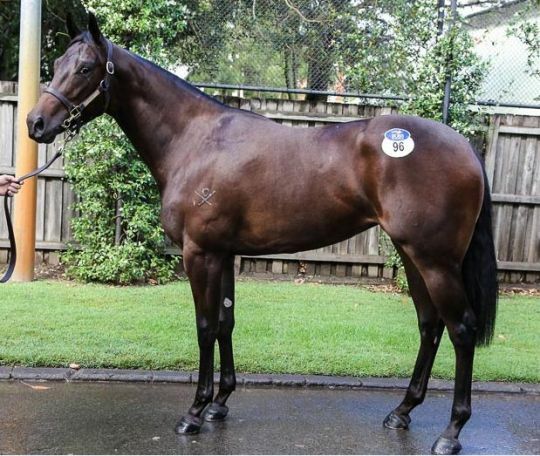 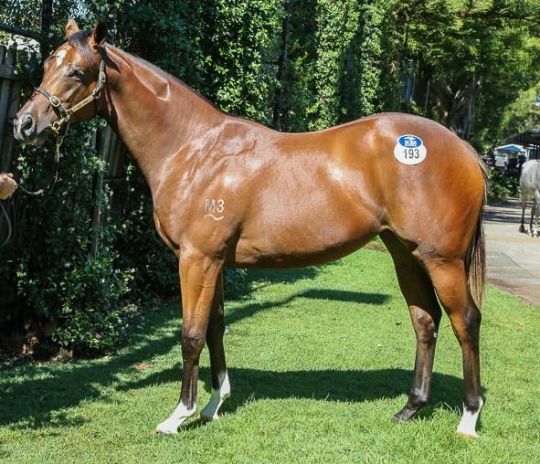 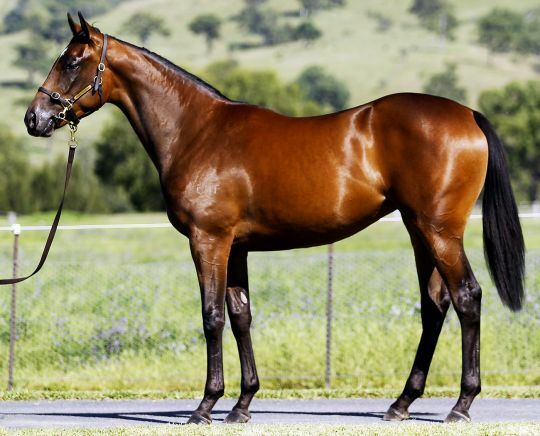 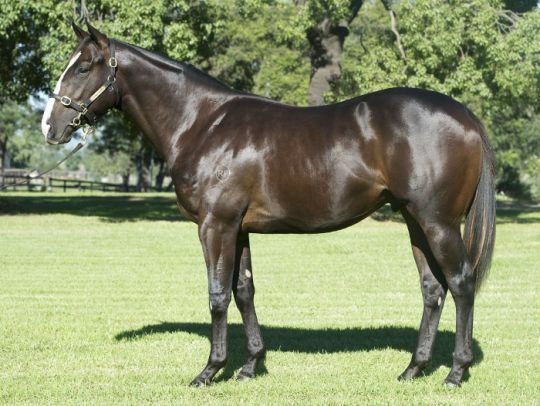 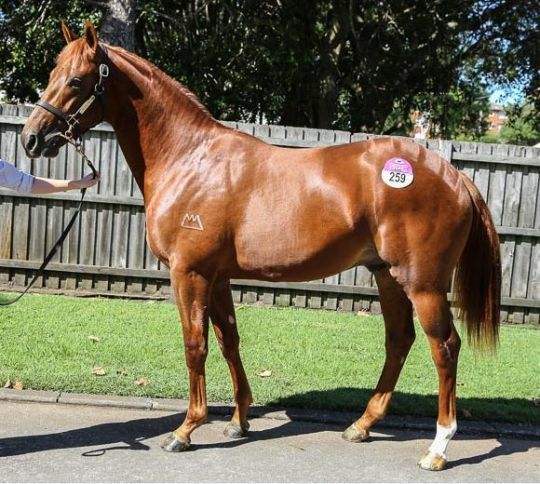 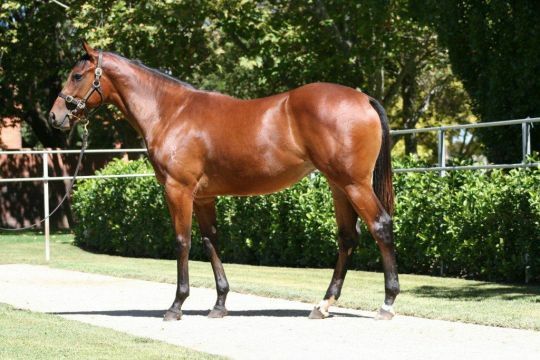 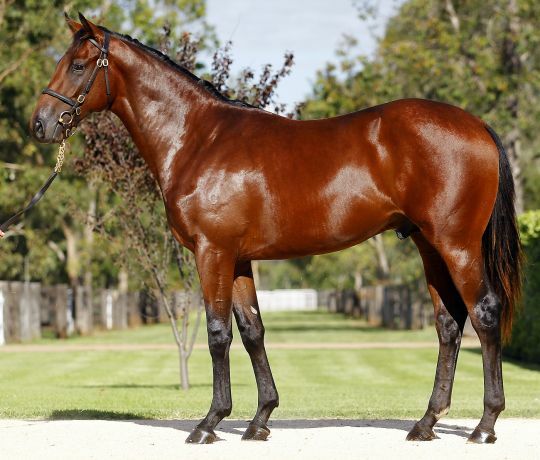 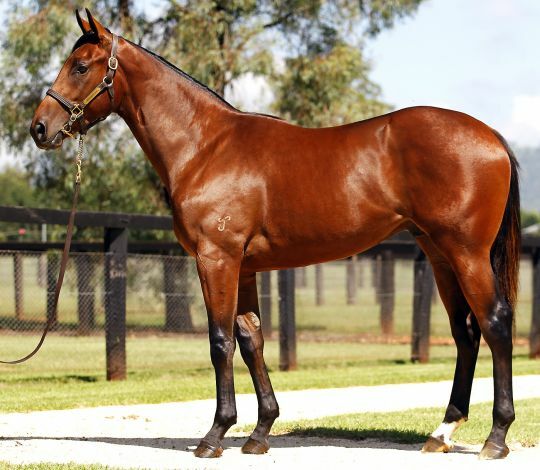 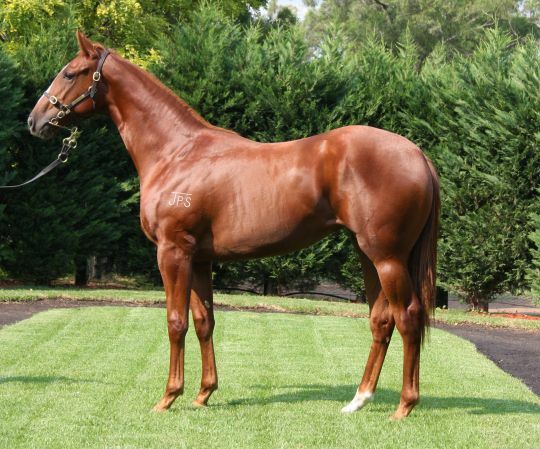 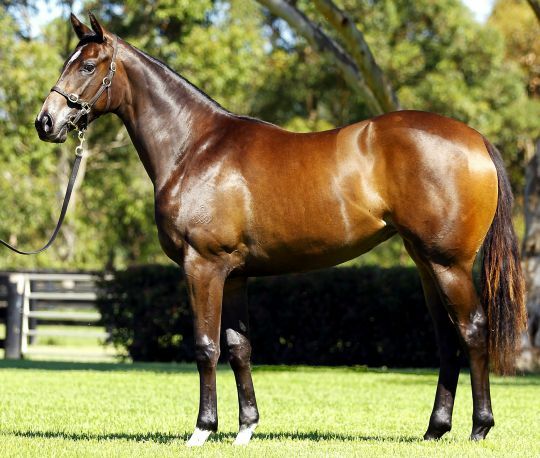 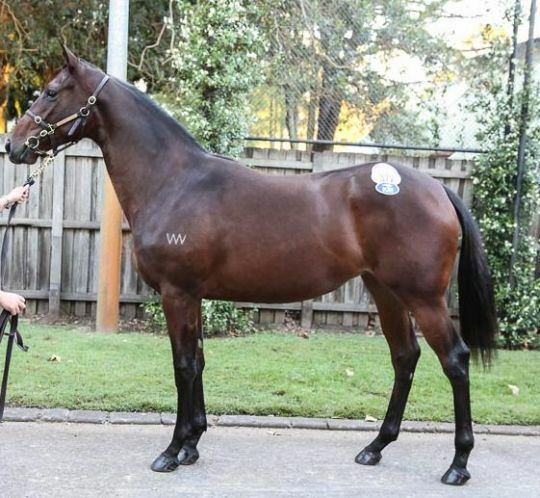 The previous Australasian record price for a yearling at public auction was smashed twice during the 2013 Easter Sale, which was conducted at Newmarket on 9, 10 and 11 April. 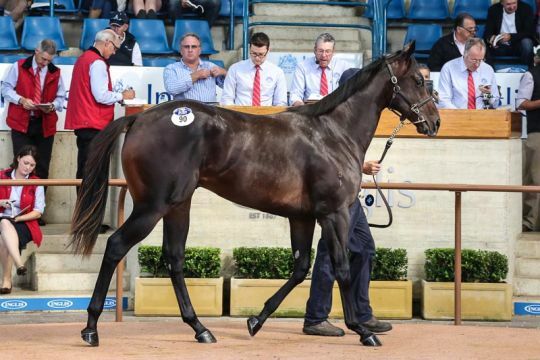 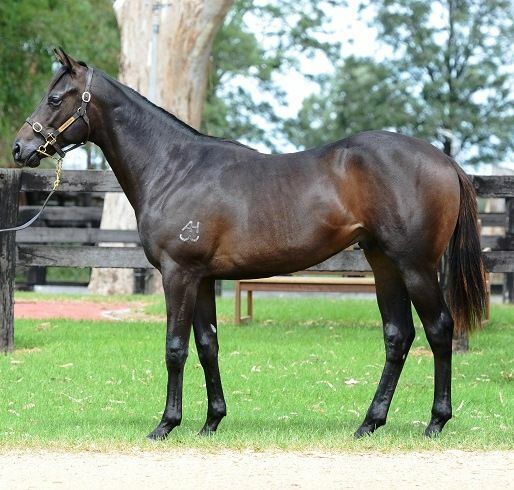 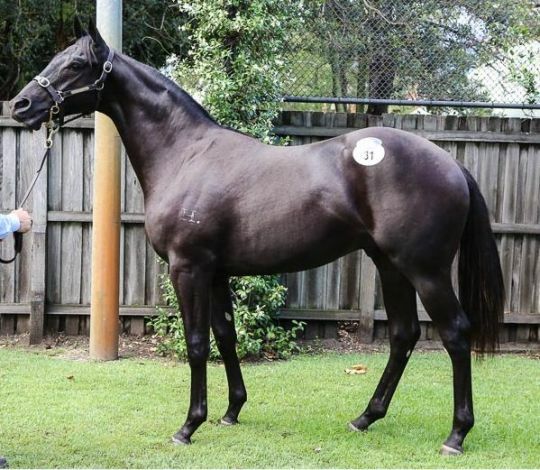 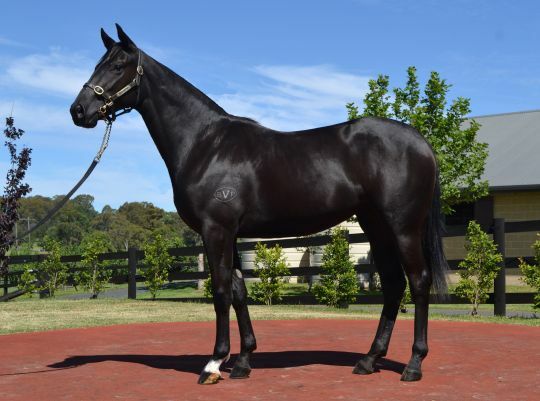 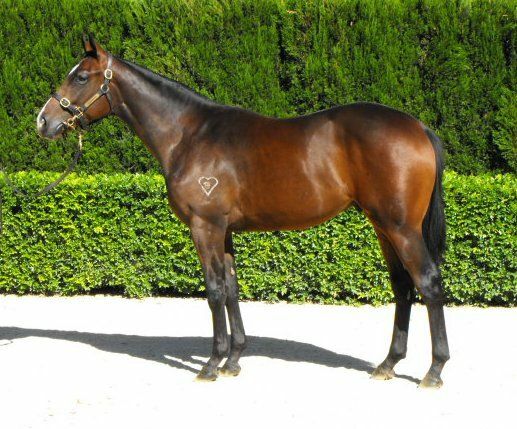 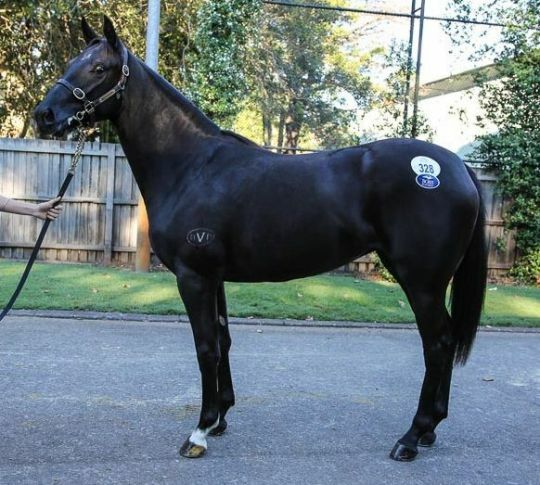 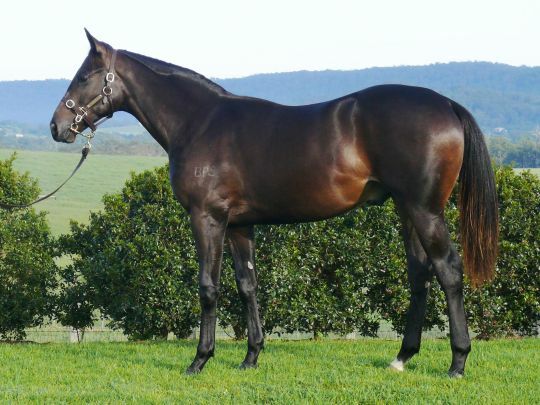 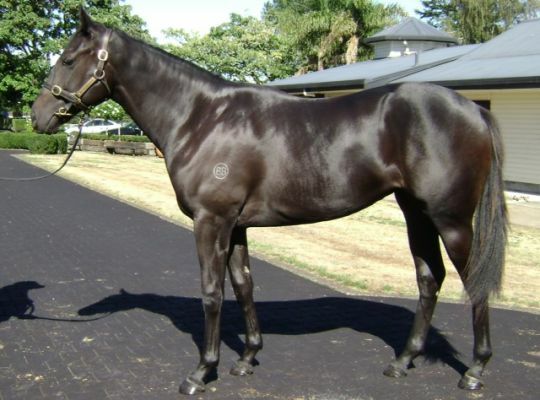 On the opening day of the sale Black Caviar and All Too Hard’s yearling half-brother was purchased by BC3 Thoroughbreds for $5 million. 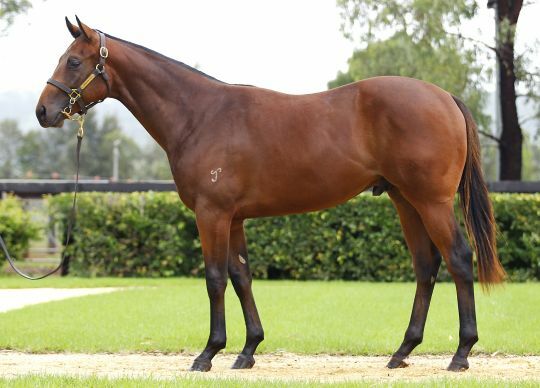 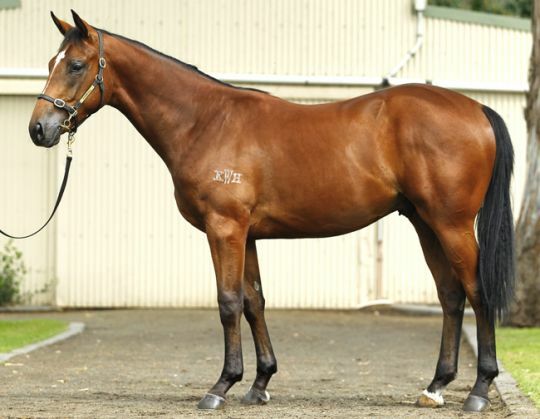 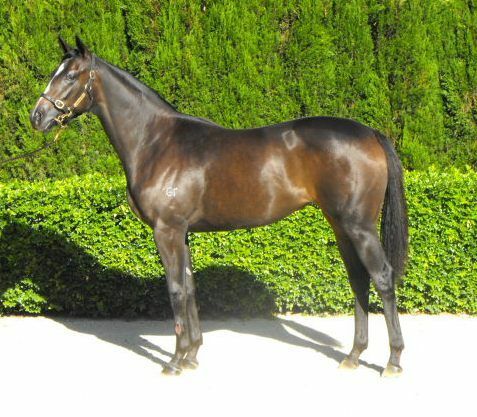 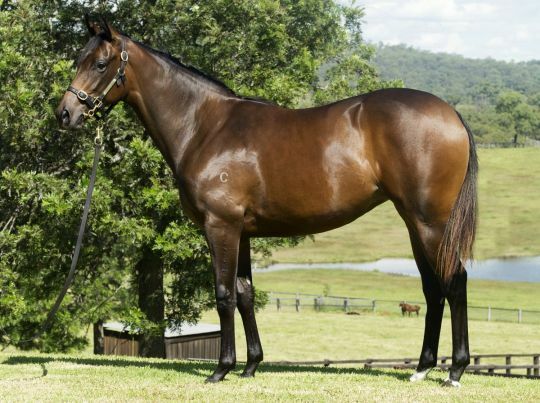 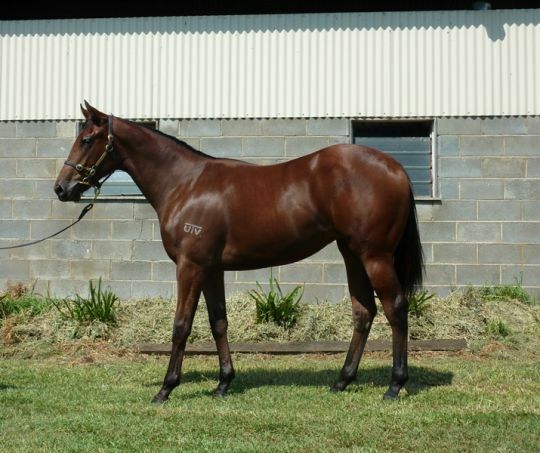 The colt by Redoute’s Choice was consigned as Lot 131 by Three Bridges Thoroughbreds as agent for breeder Rick Jamieson’s Gilgai Farm. 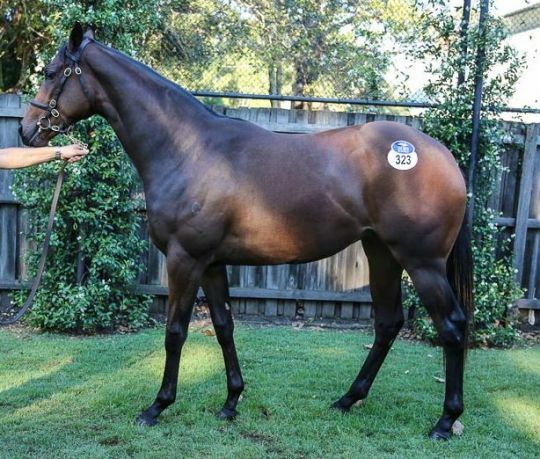 There were fireworks again on Day Two of the sale when Cressfield’s colt by Fastnet Rock from Group 1 winner River Dove was offered as Lot 295. 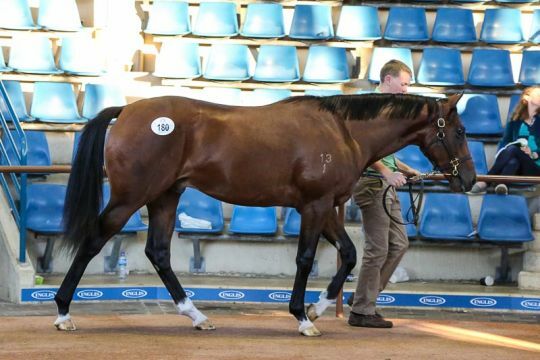 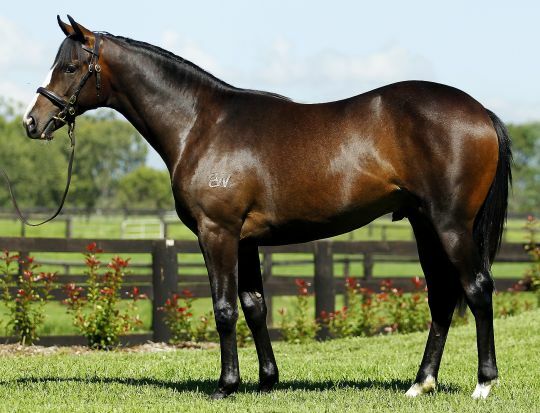 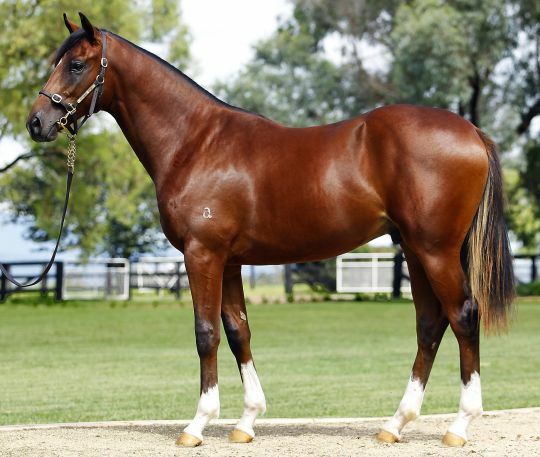 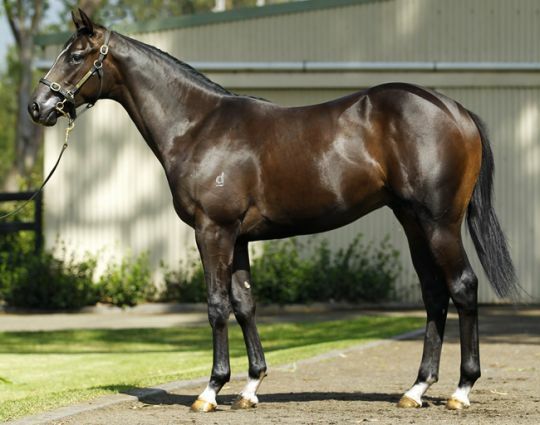 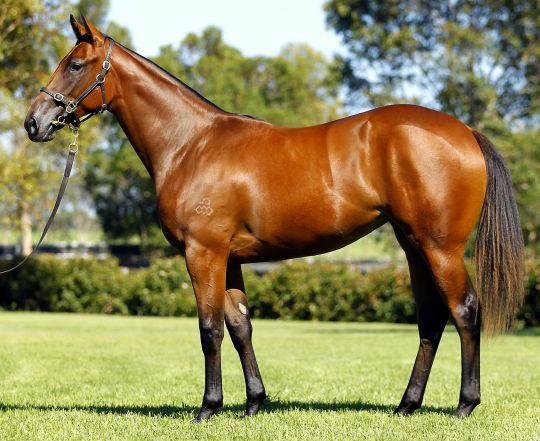 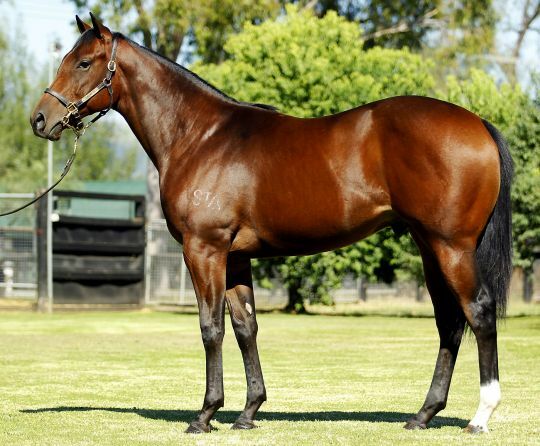 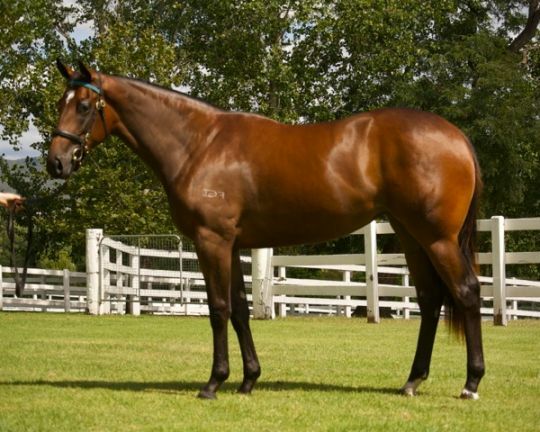 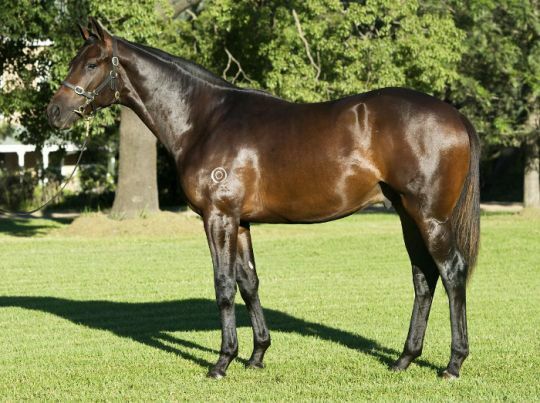 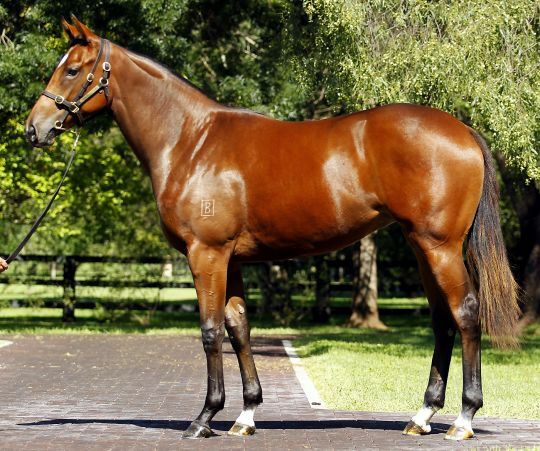 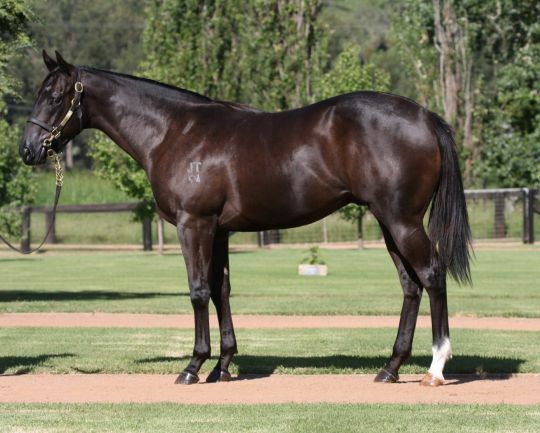 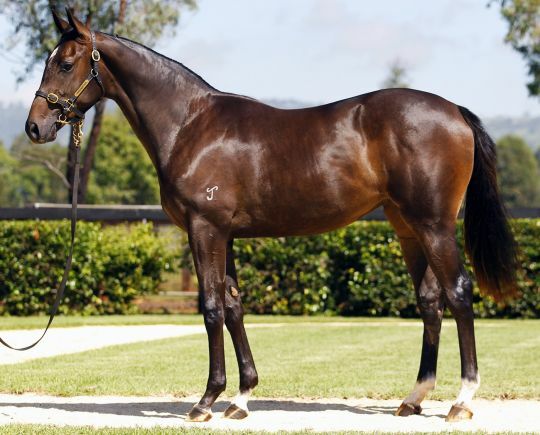 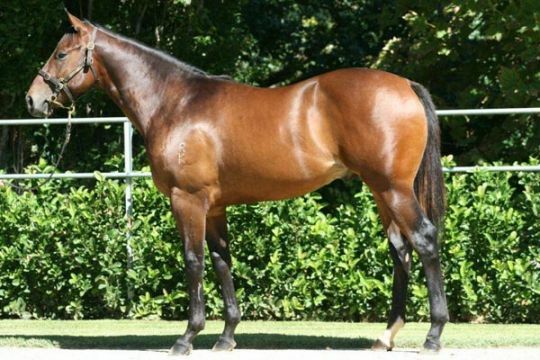 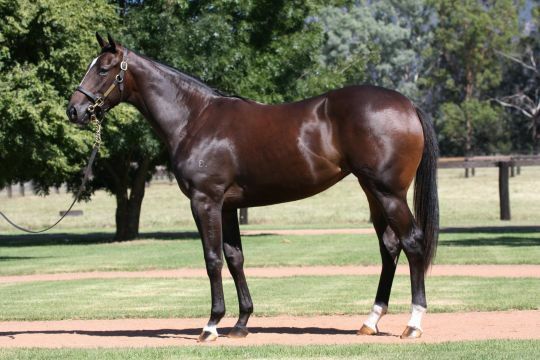 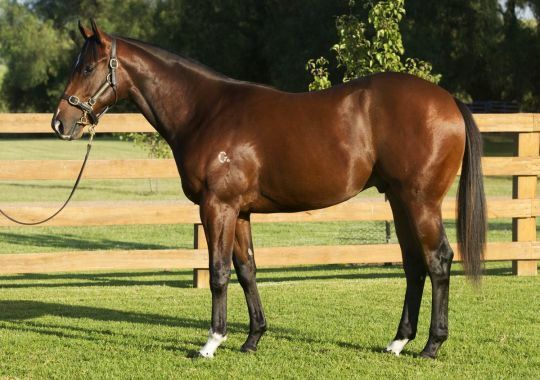 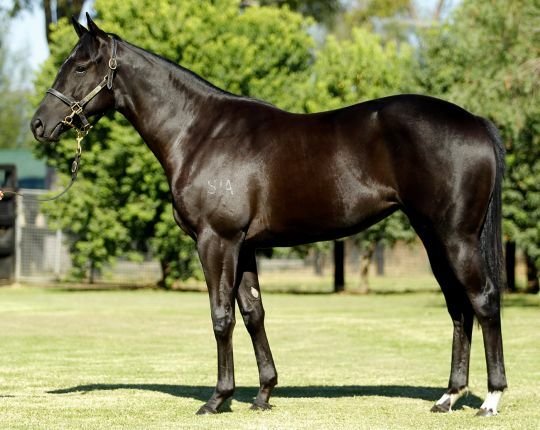 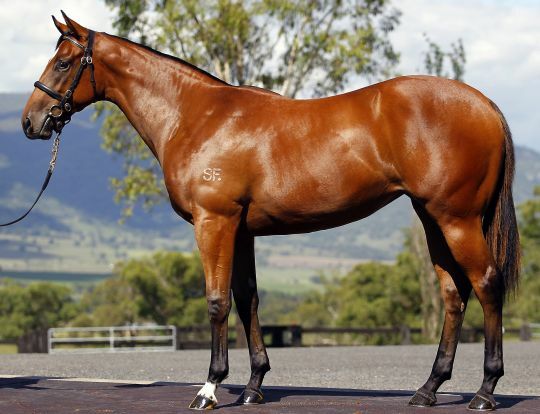 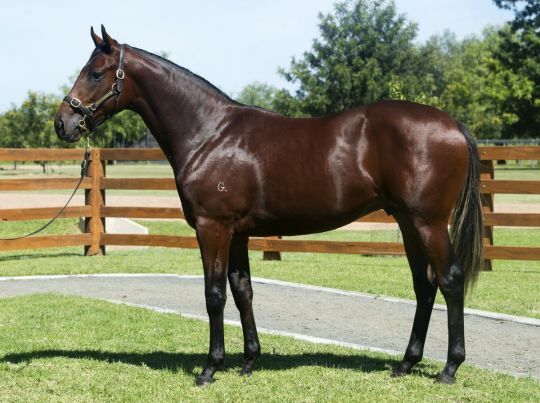 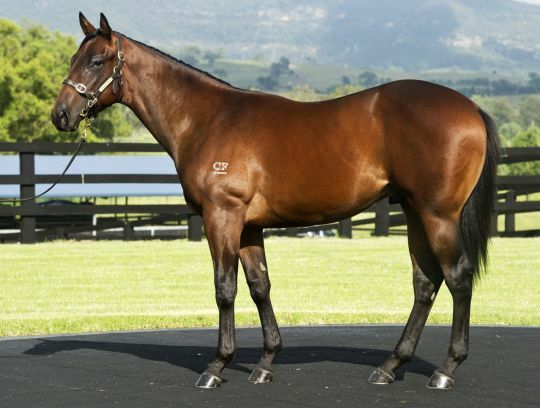 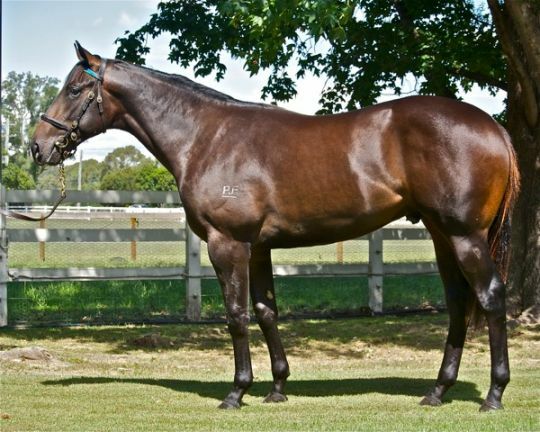 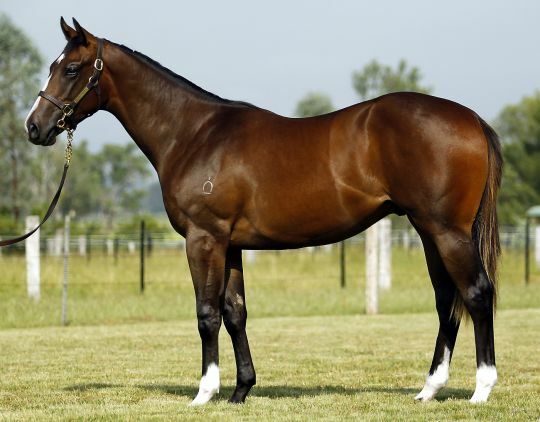 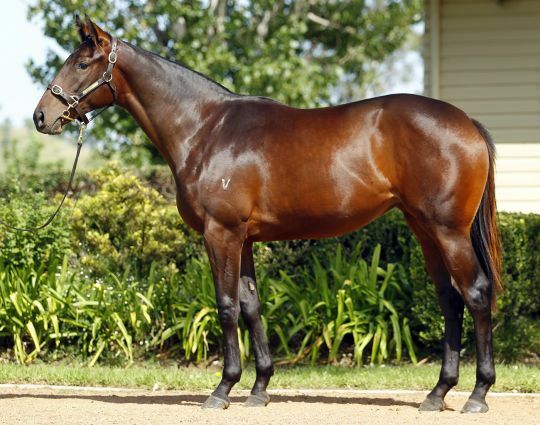 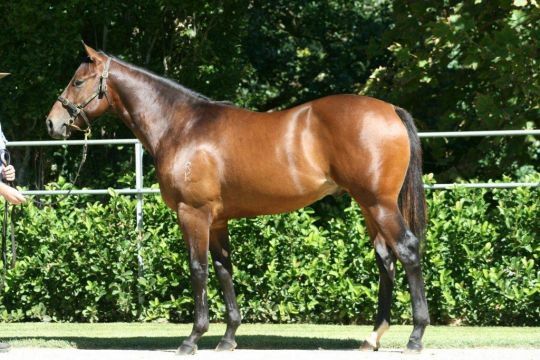 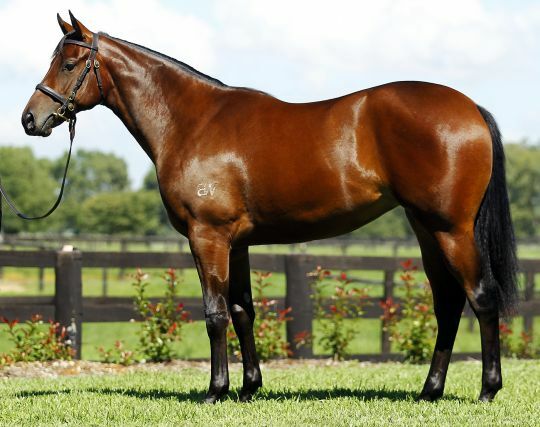 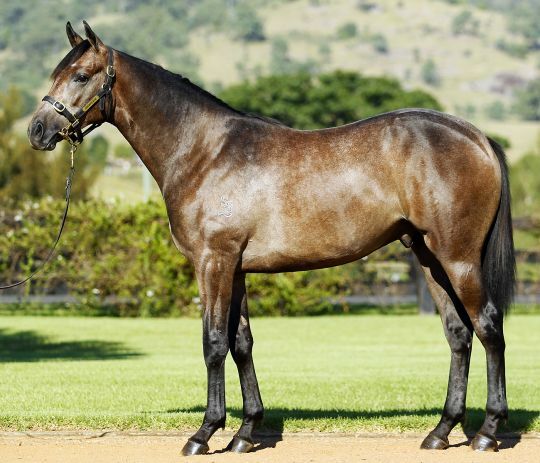 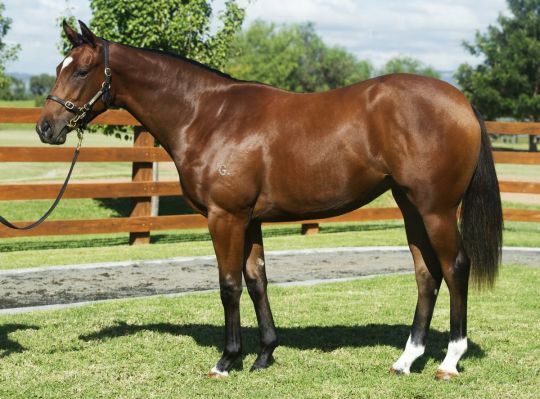 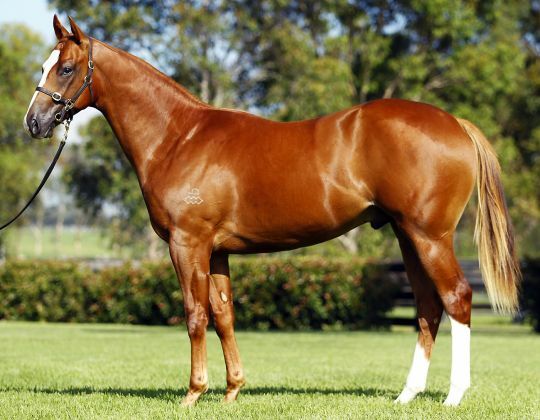 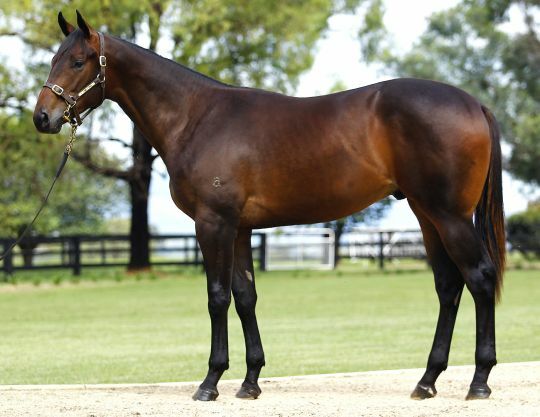 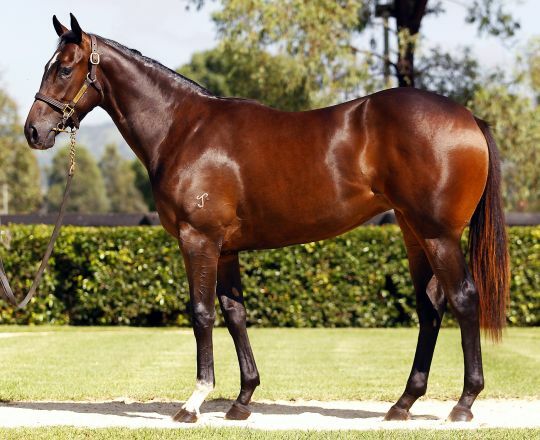 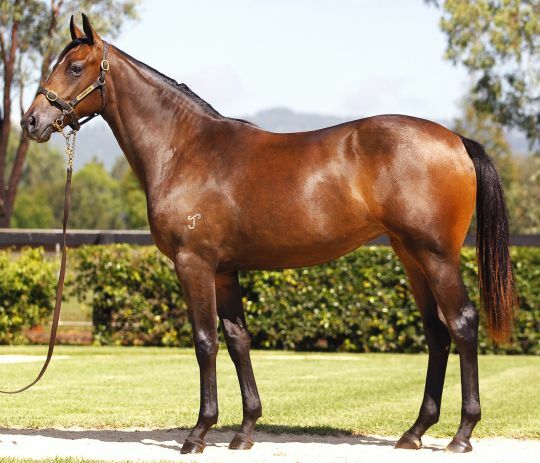 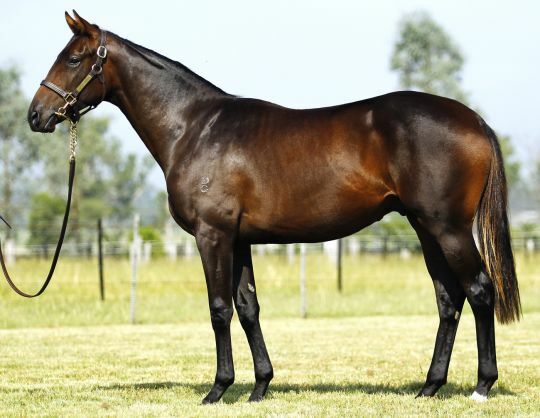 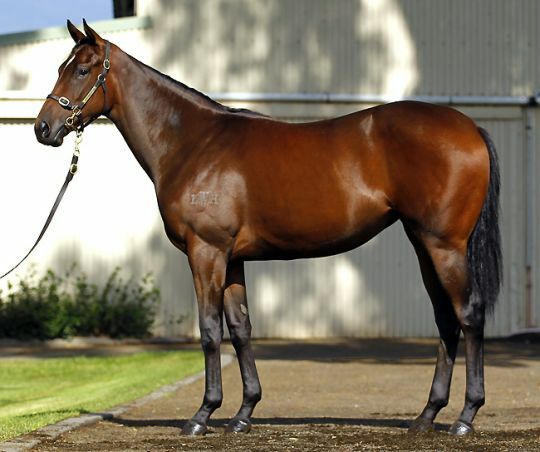 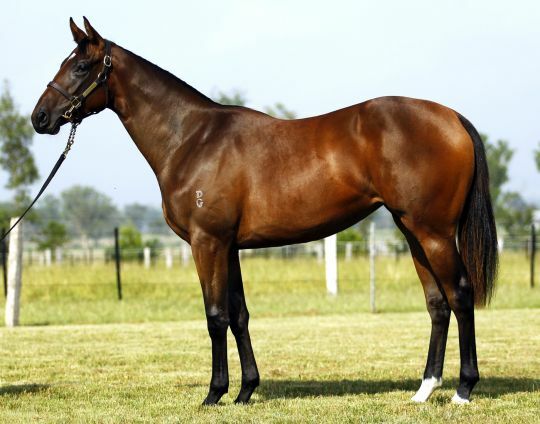 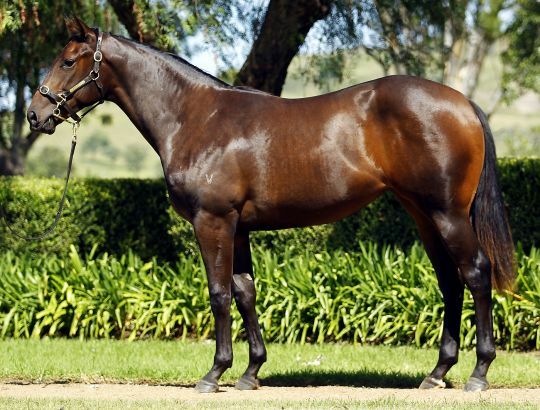 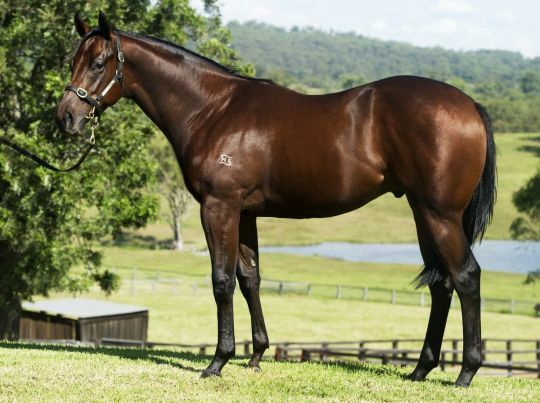 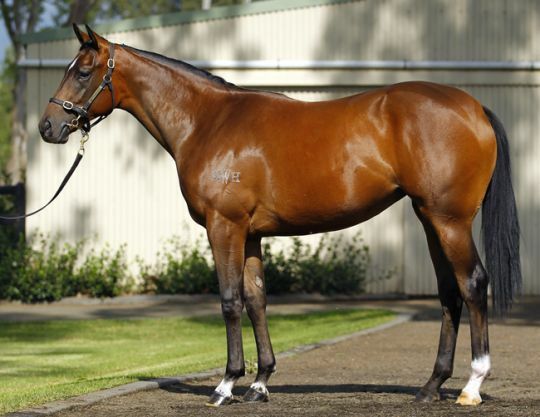 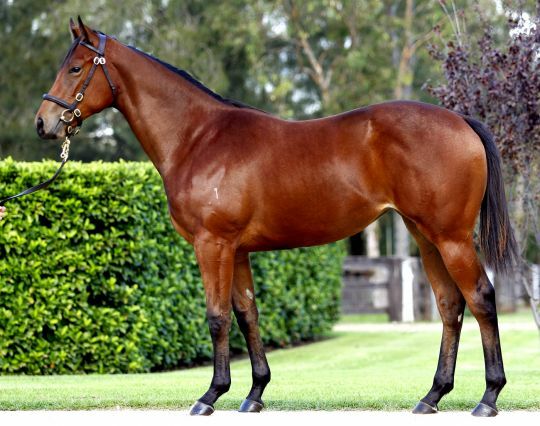 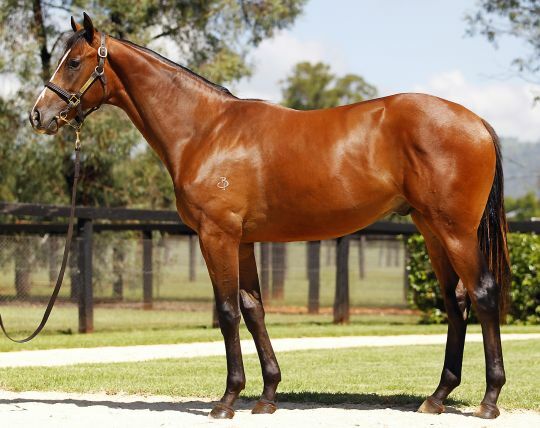 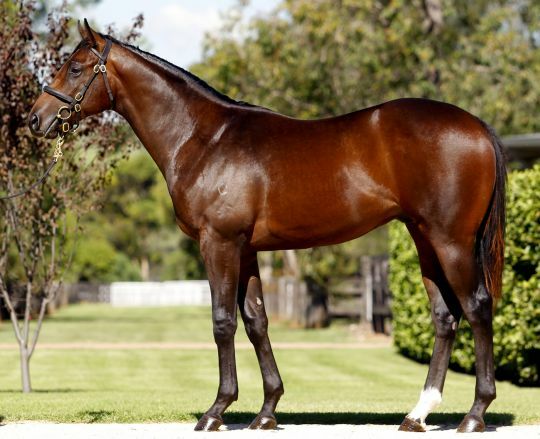 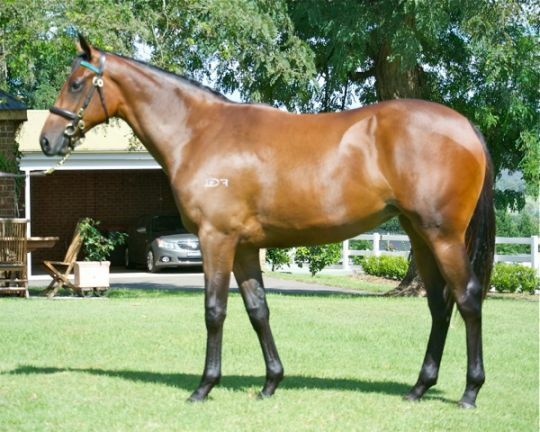 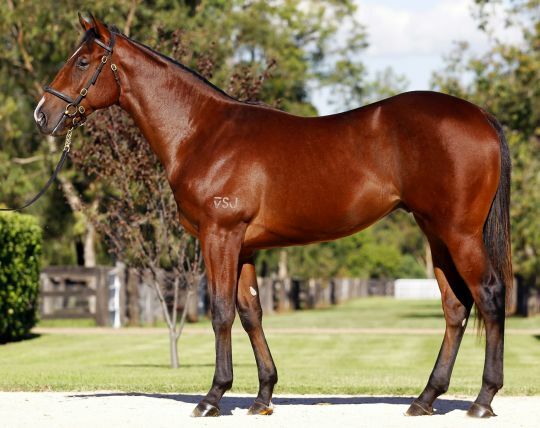 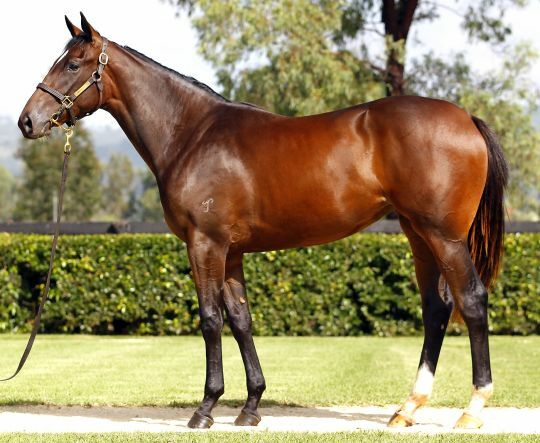 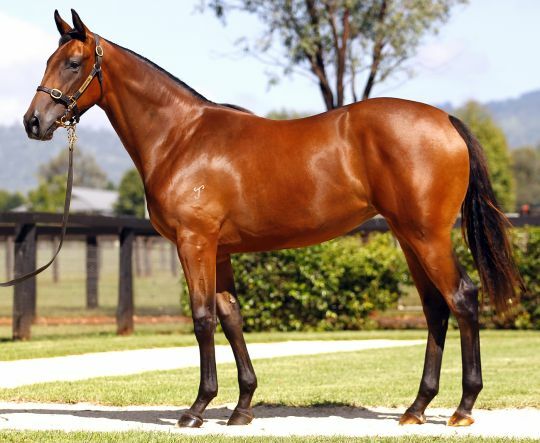 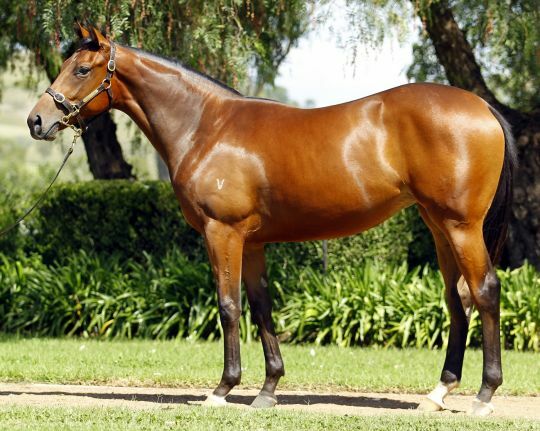 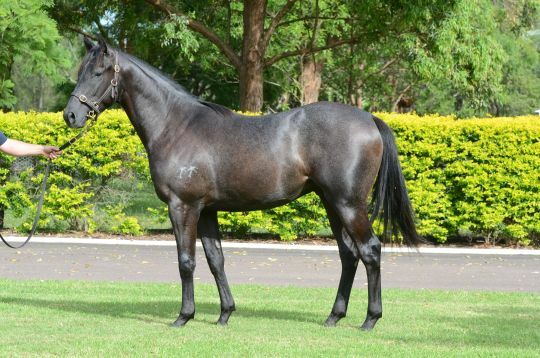 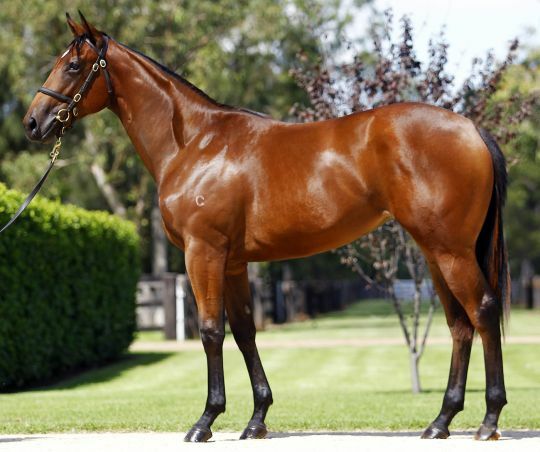 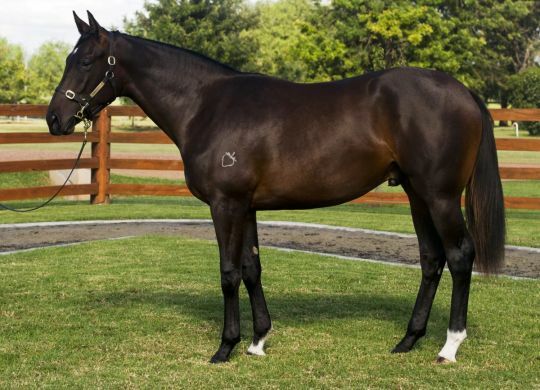 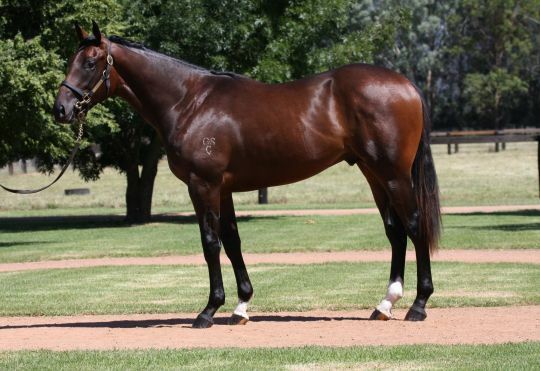 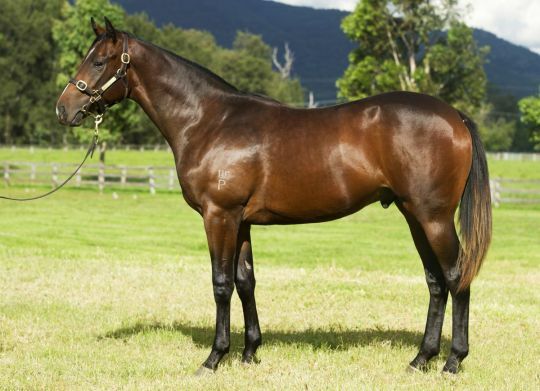 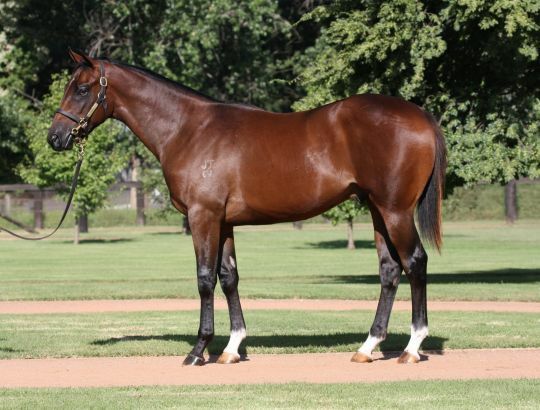 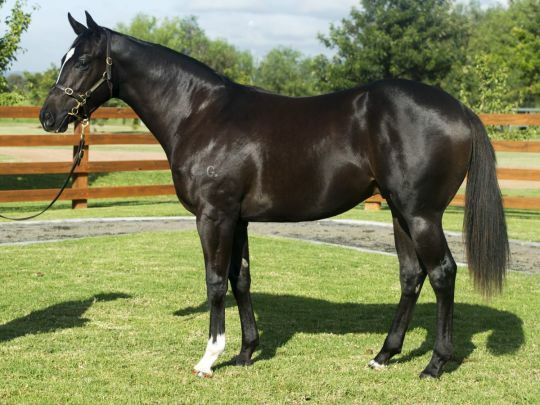 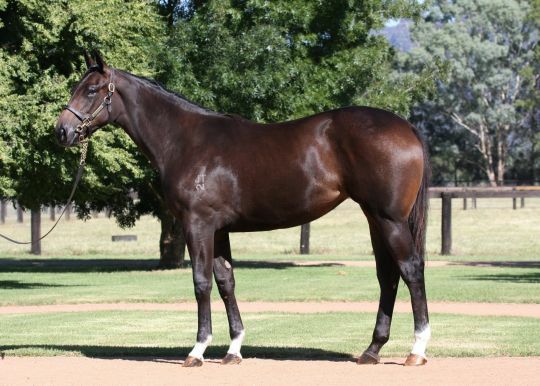 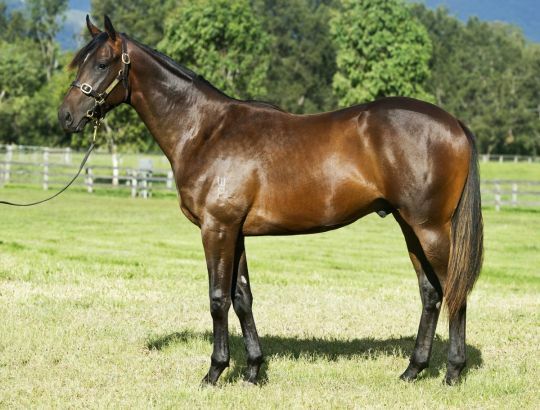 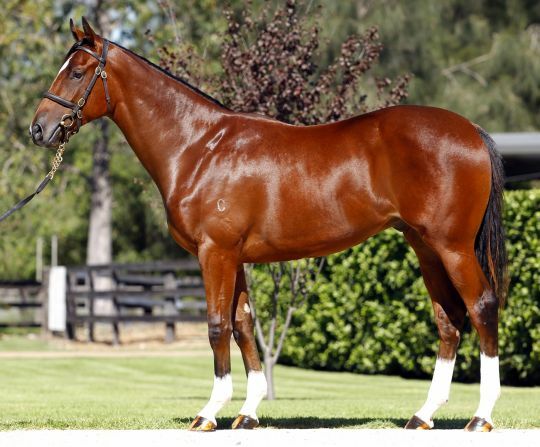 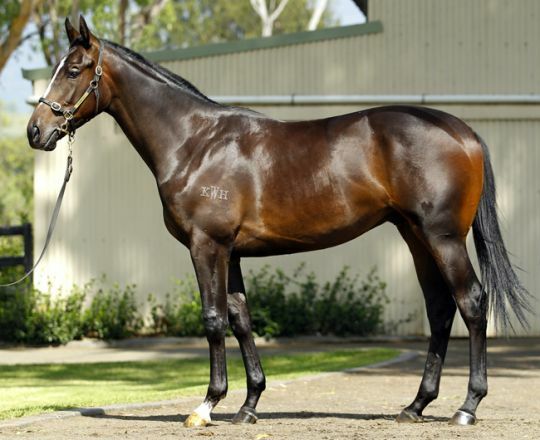 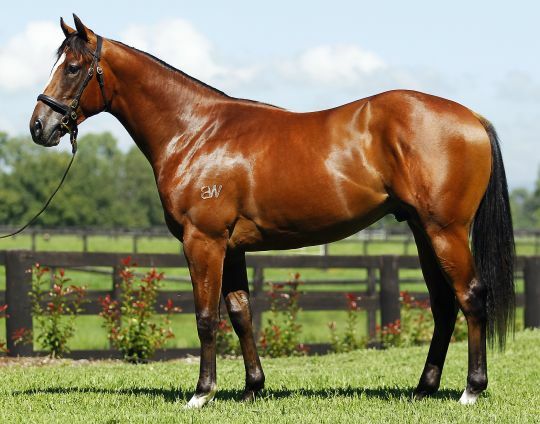 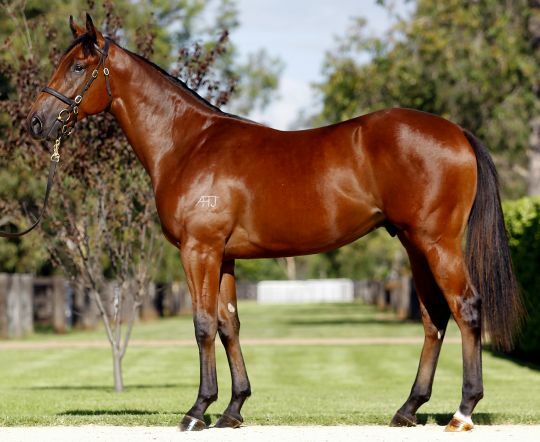 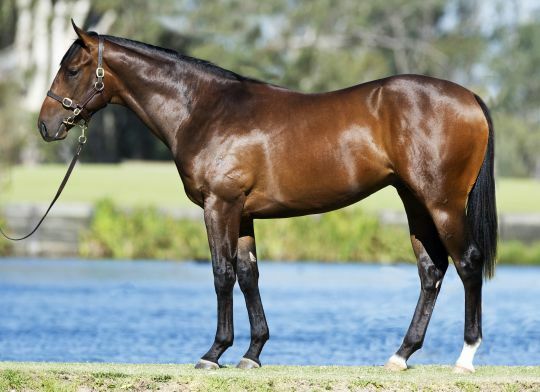 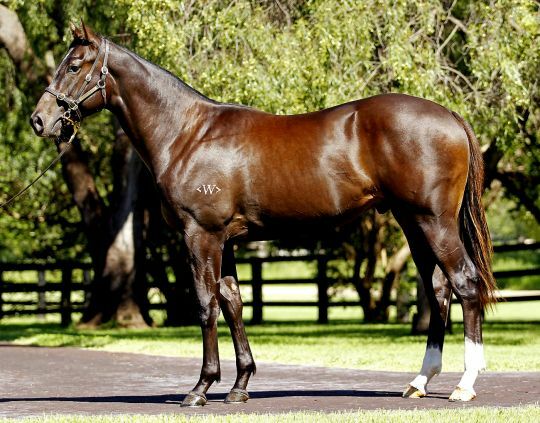 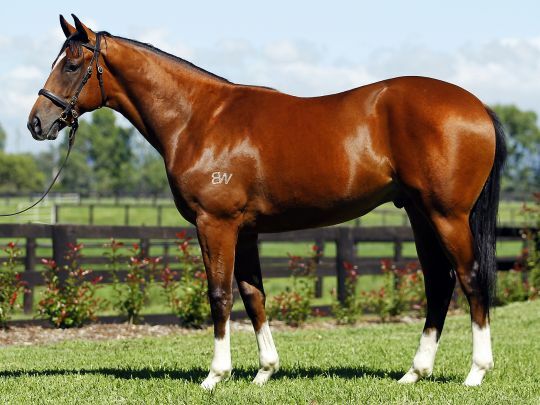 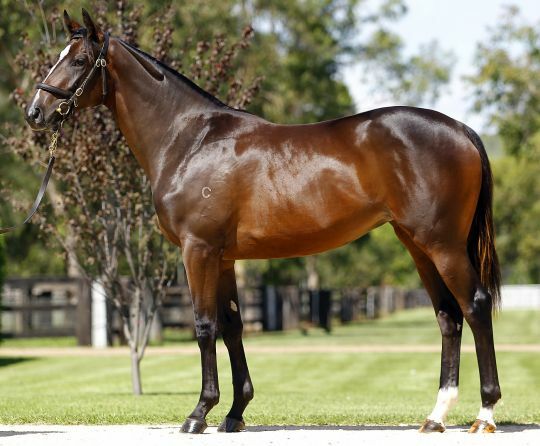 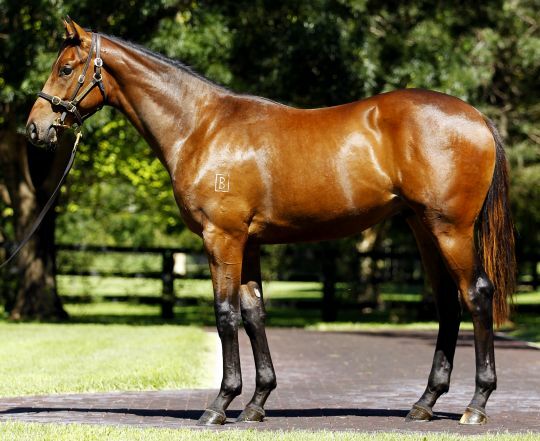 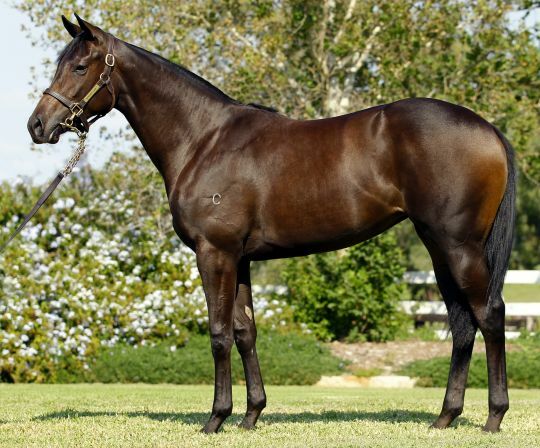 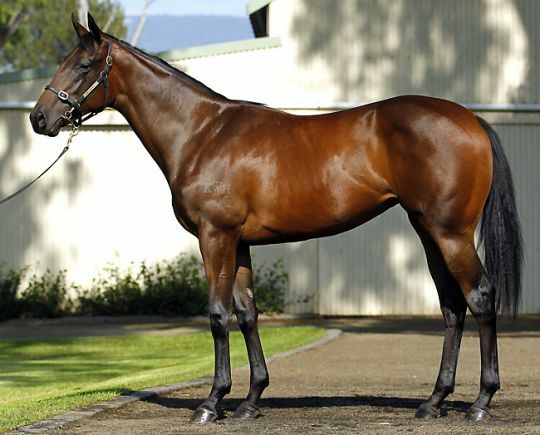 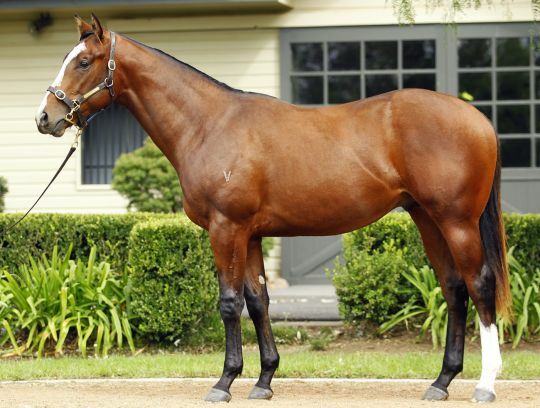 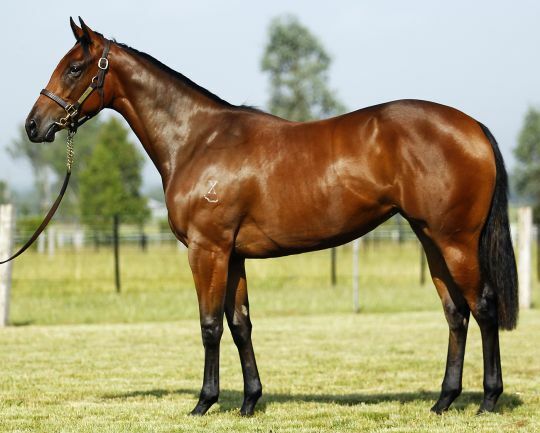 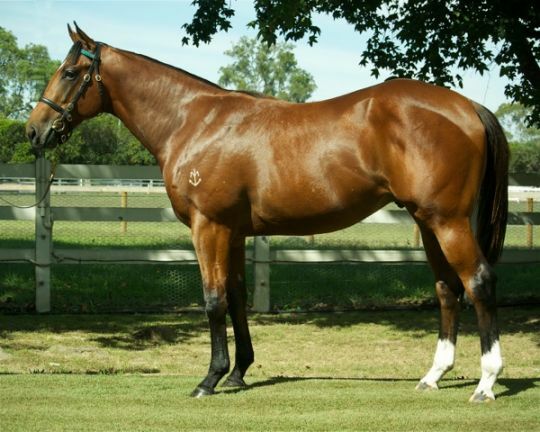 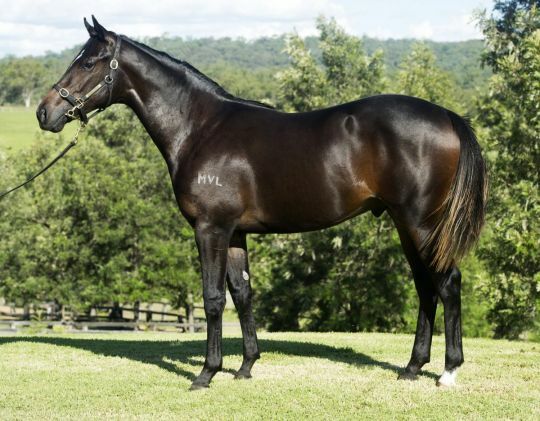 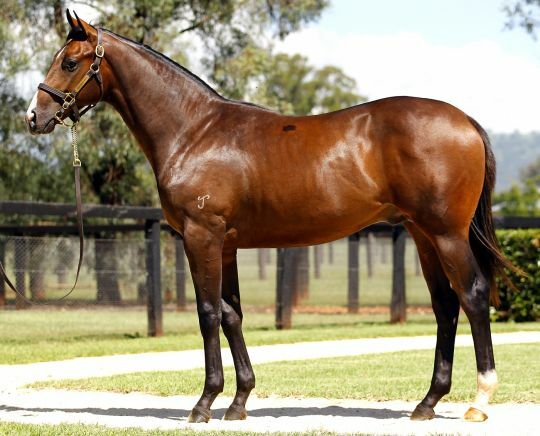 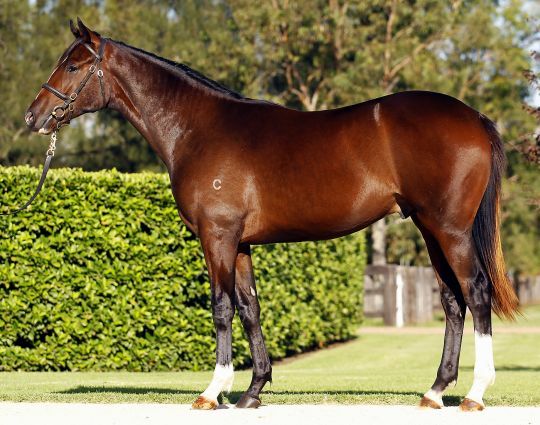 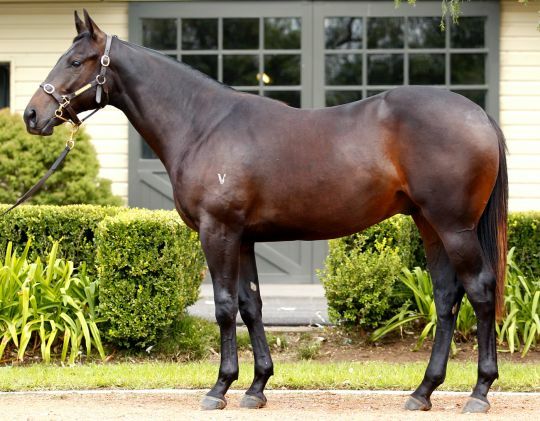 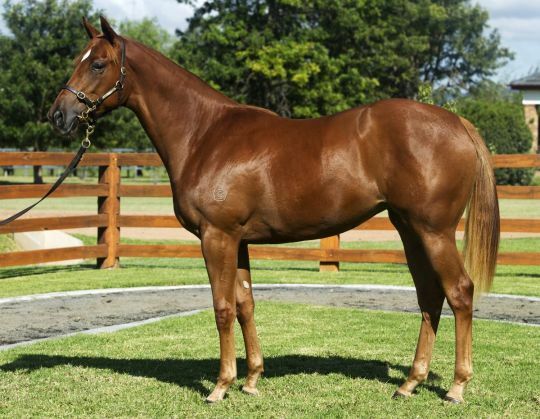 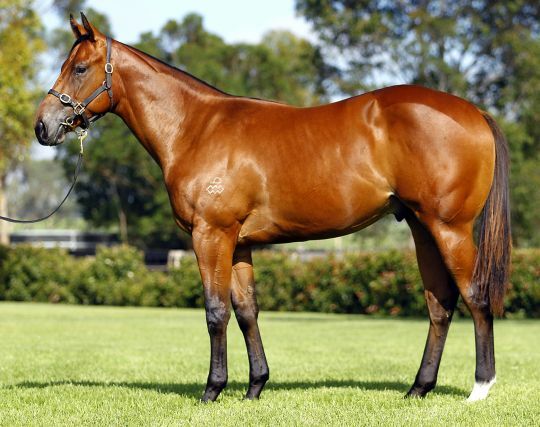 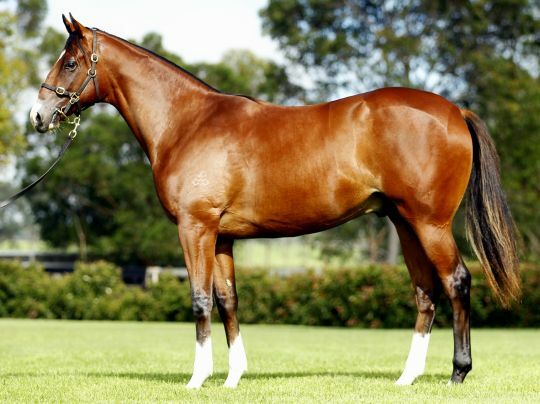 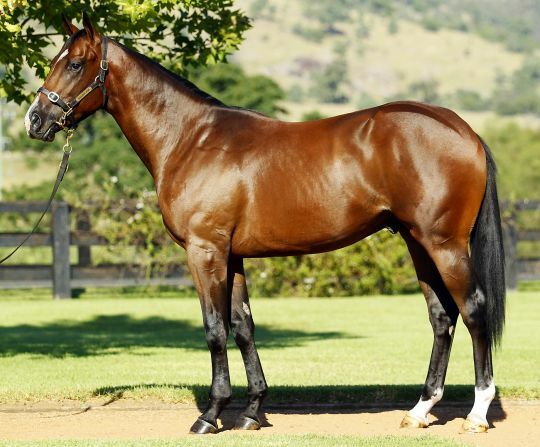 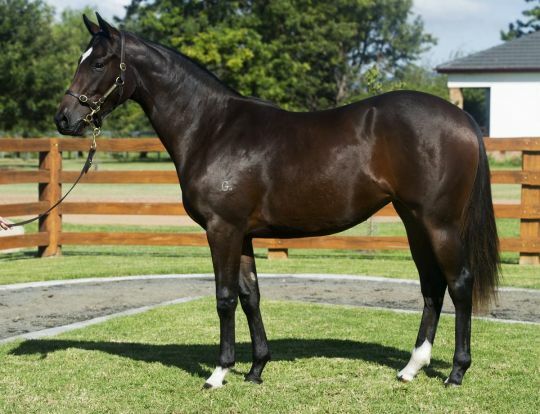 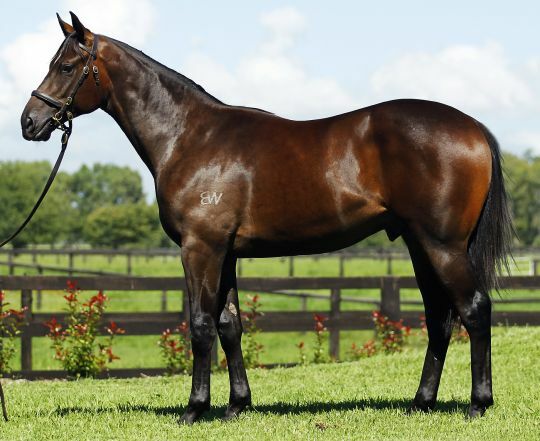 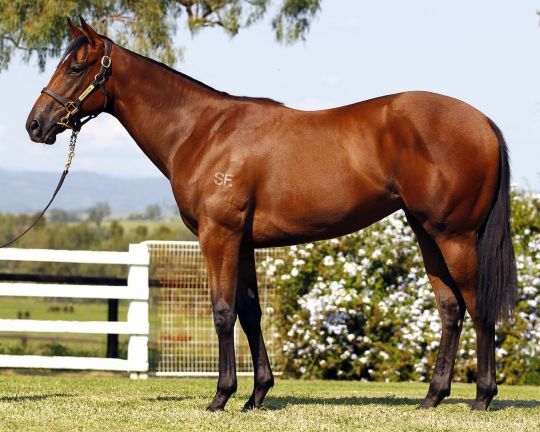 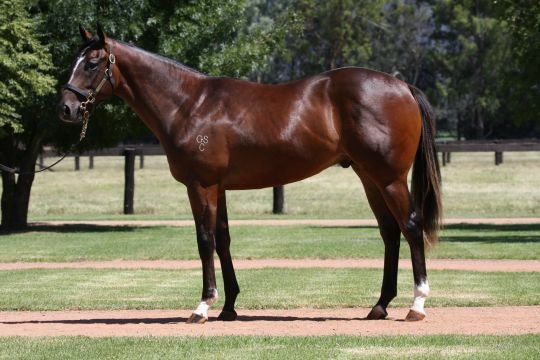 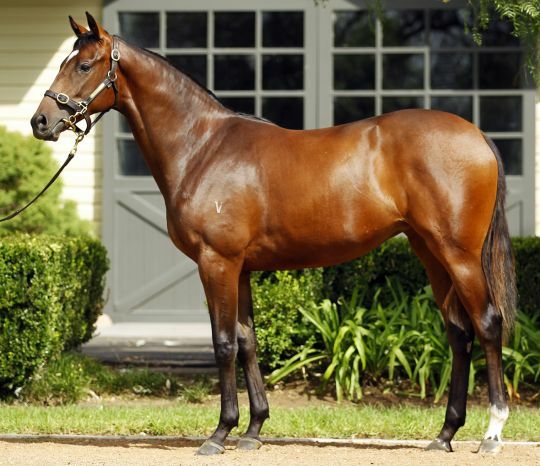 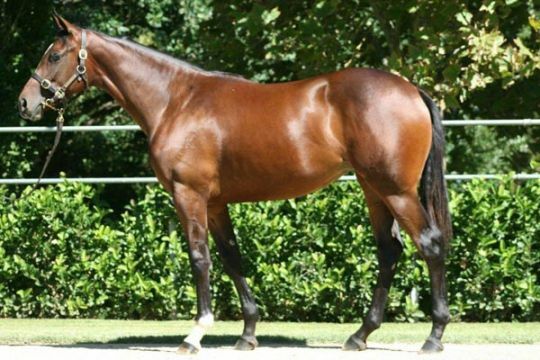 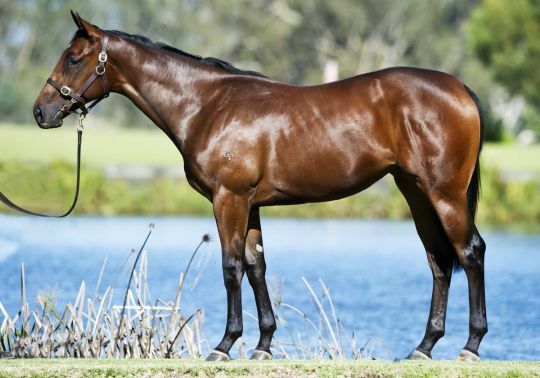 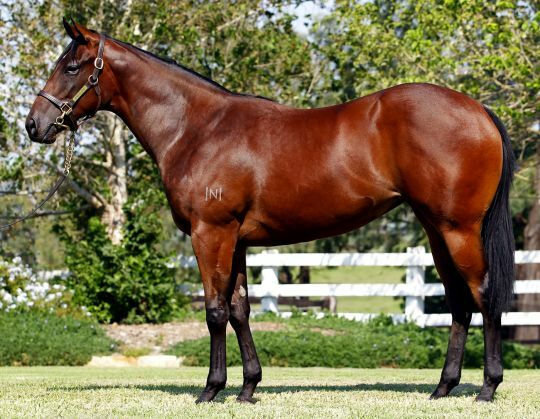 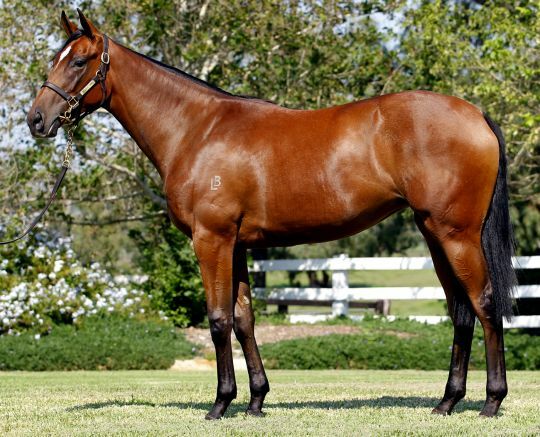 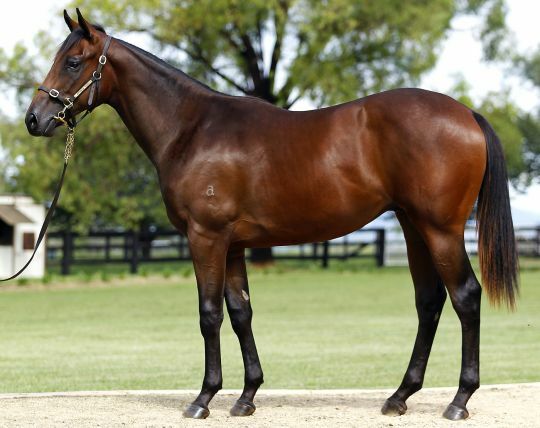 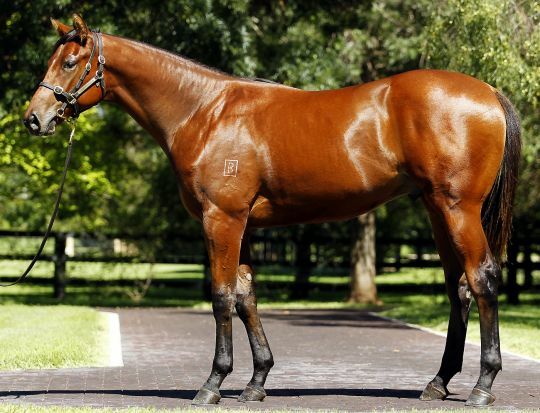 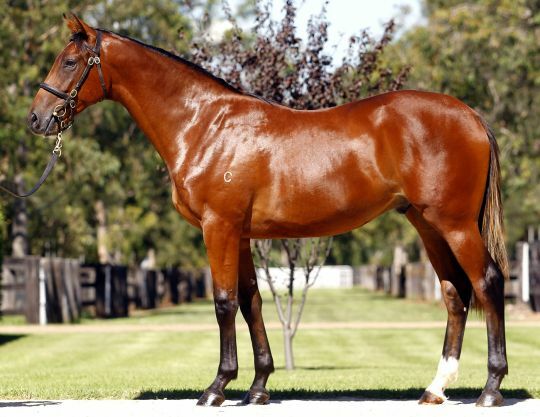 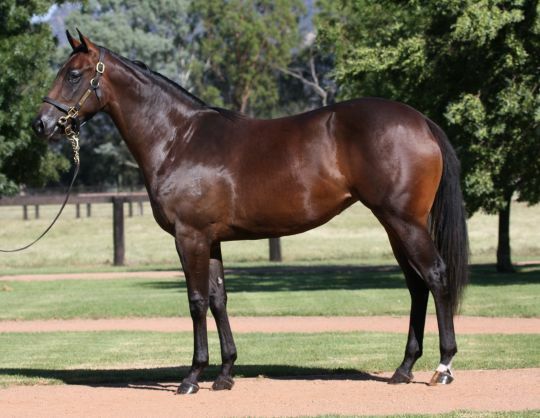 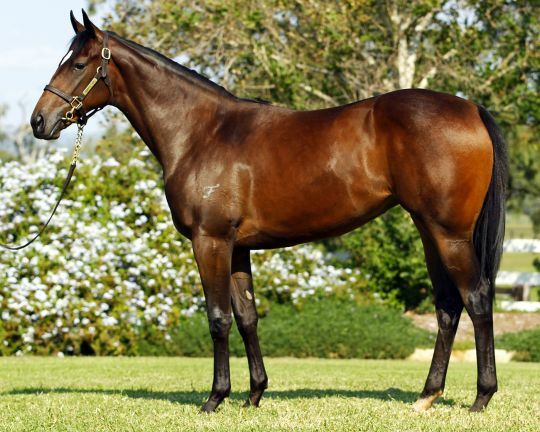 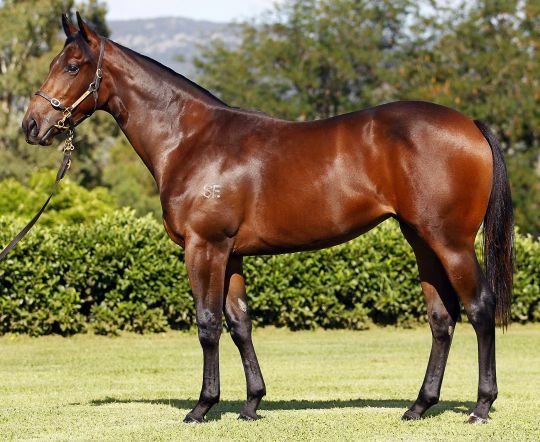 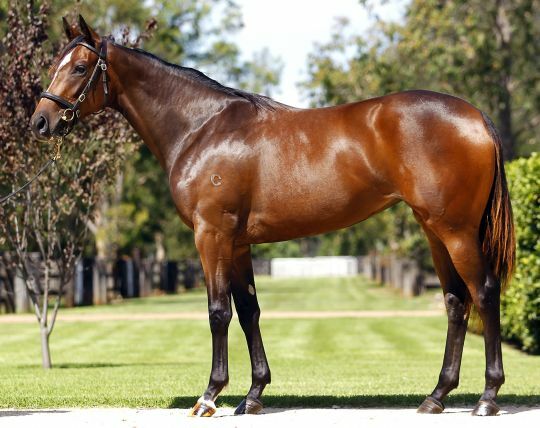 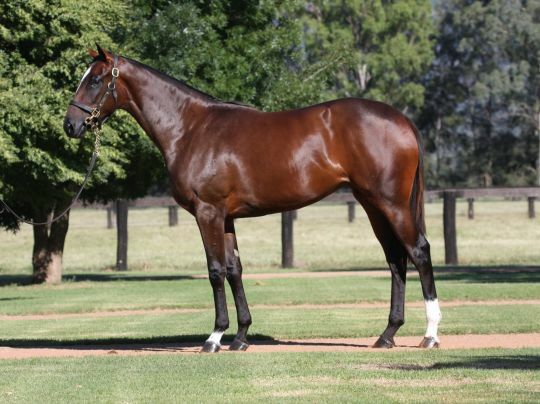 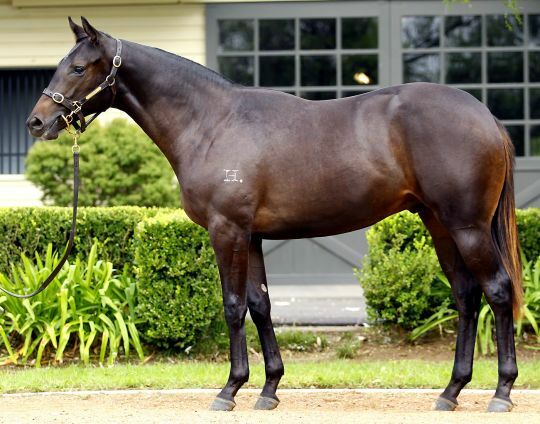 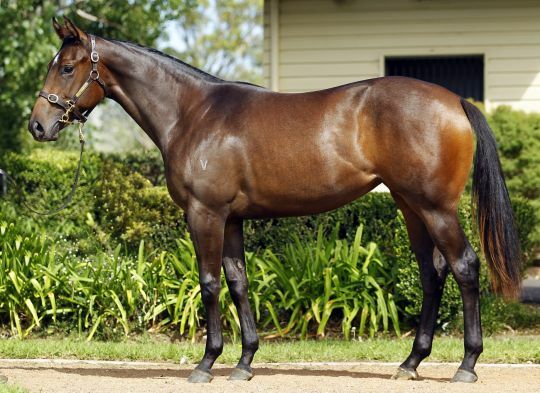 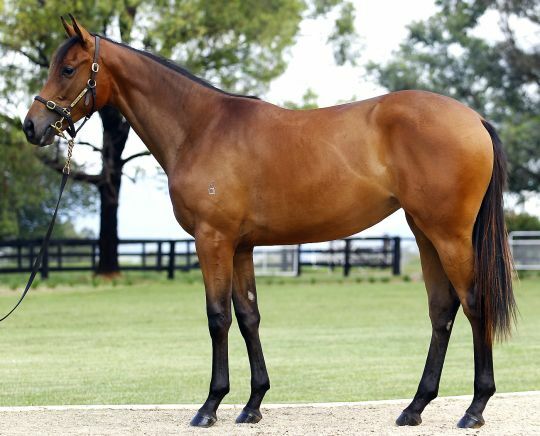 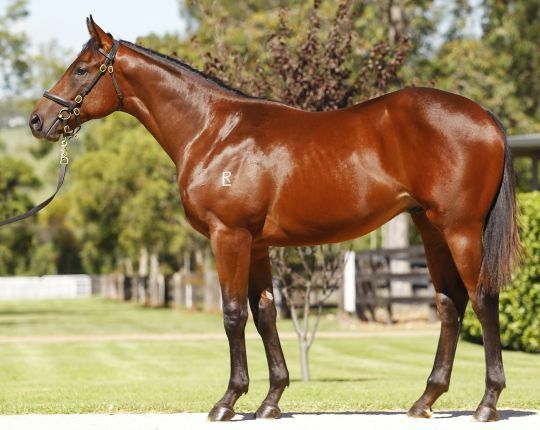 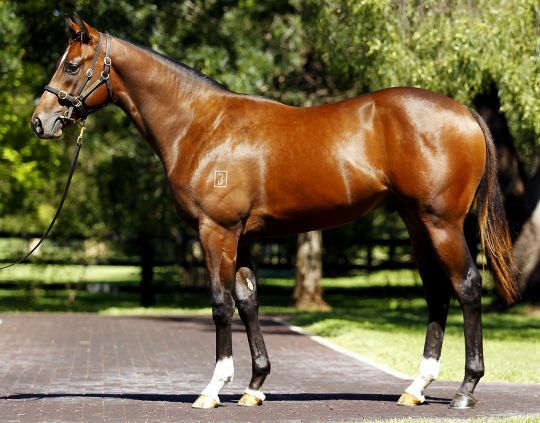 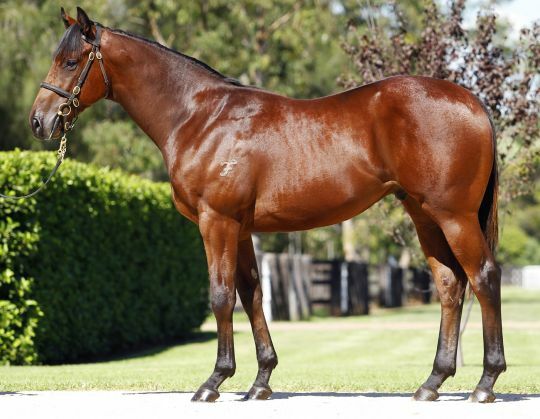 A bidding duel ensued between Tom Magnier of Coolmore Stud and Trevor Lobb of Emirates Park Stud. 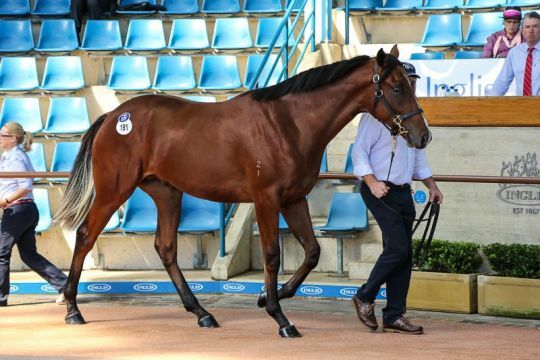 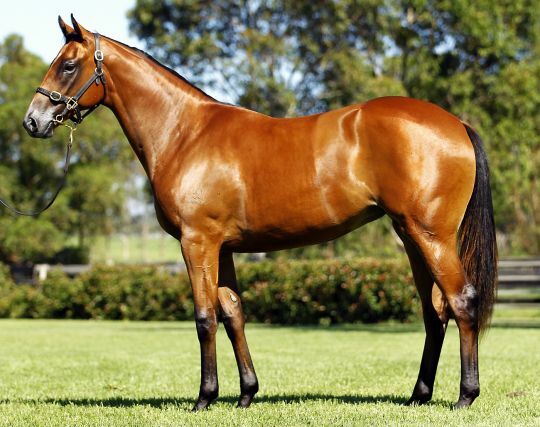 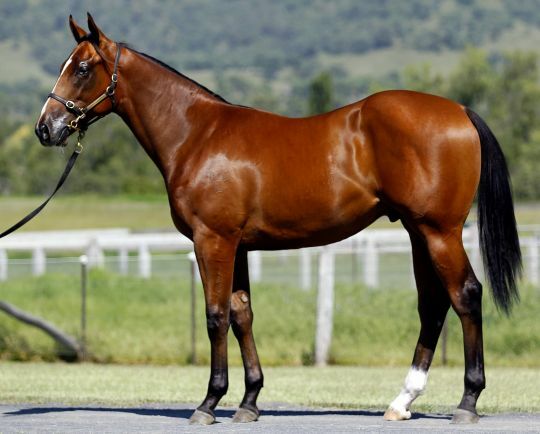 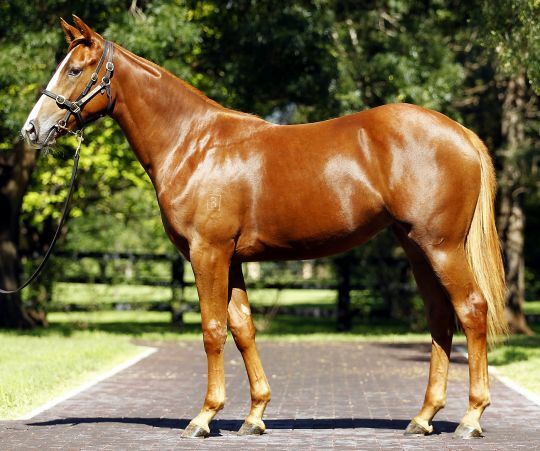 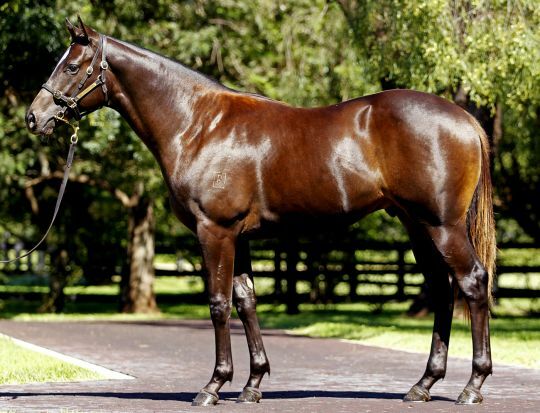 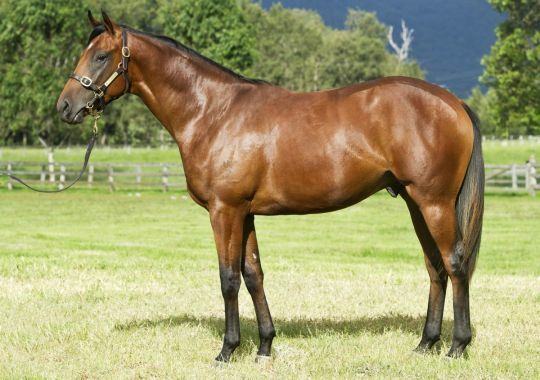 Lobb finally won out with a bid of $4 million for the colt, which will be raced in partnership between His Excellency Nasser Lootah and Sheikh Mohammed Bin Khalifa Al Maktoum. 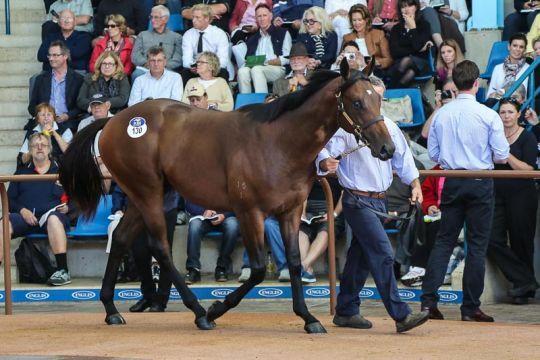 Shadwell Stud’s racing manager Angus Gold was the busiest of buyers over the three day sale, signing for 21 yearlings for $8,270,000 on behalf of Shadwell Australia. 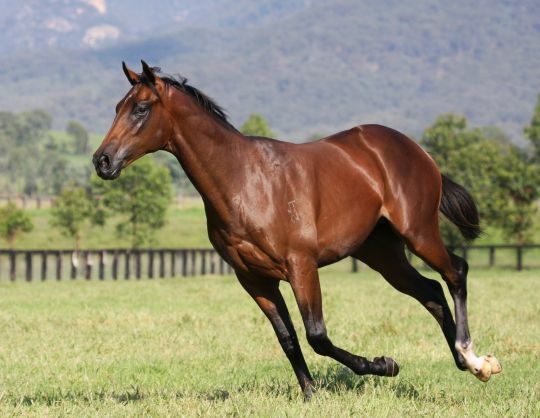 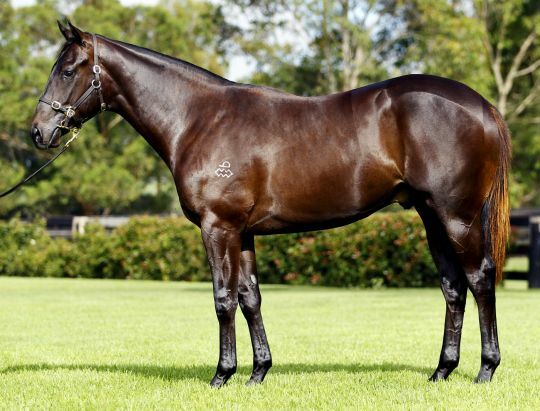 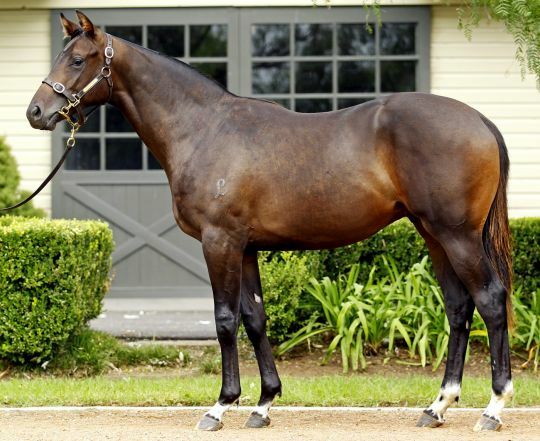 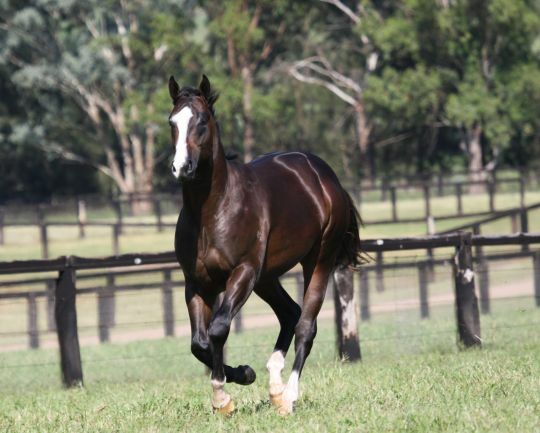 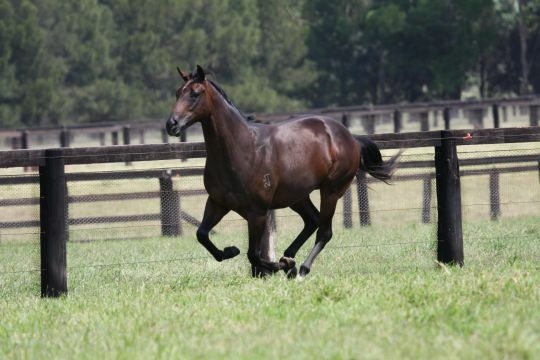 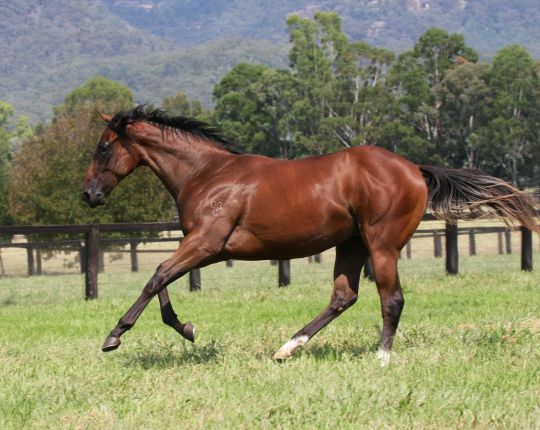 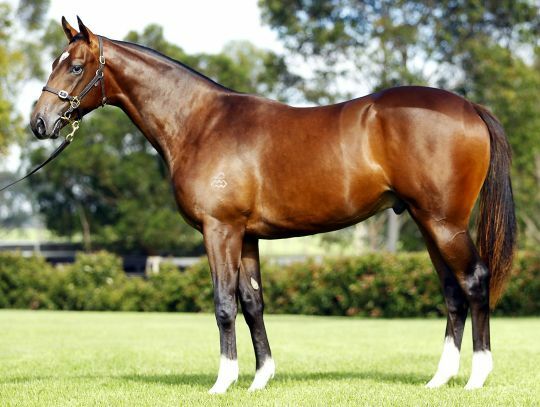 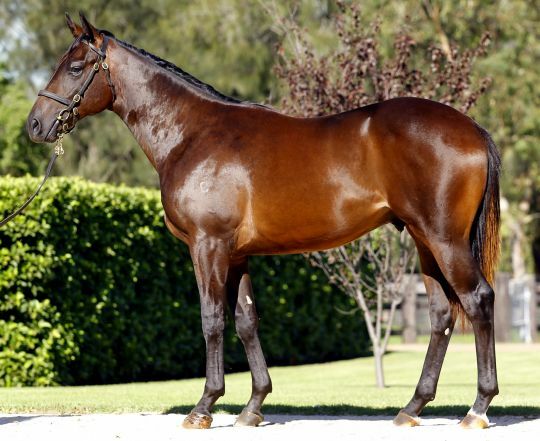 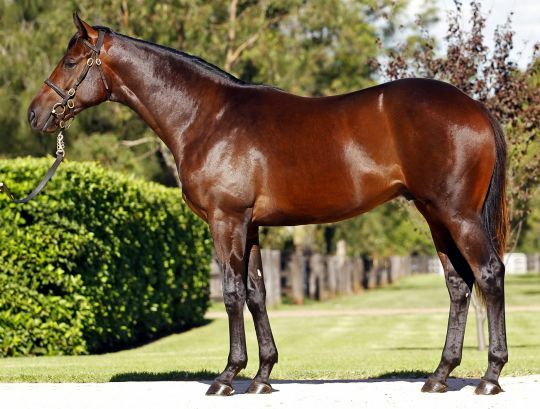 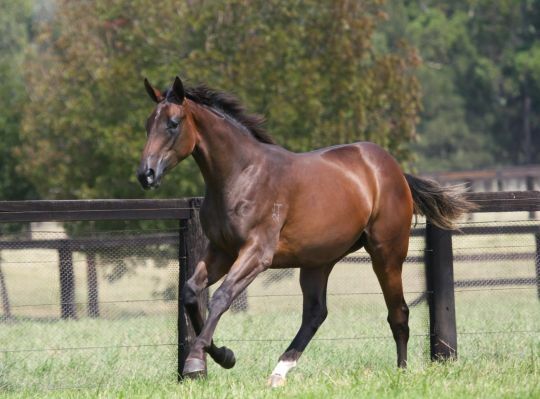 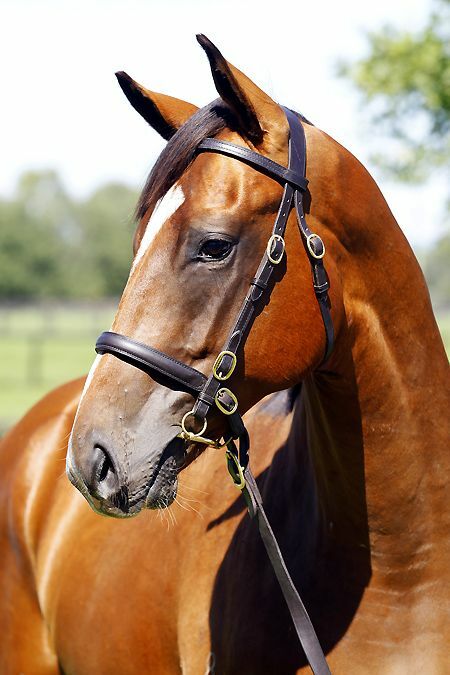 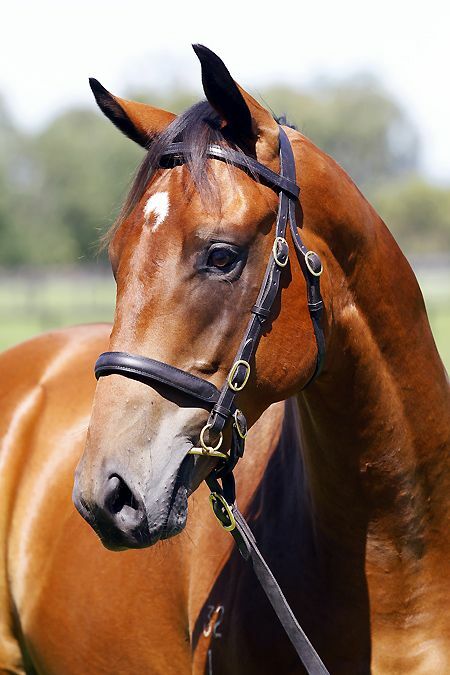 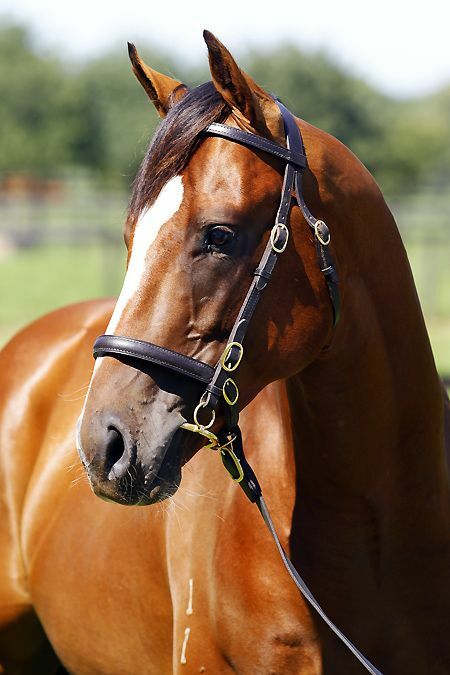 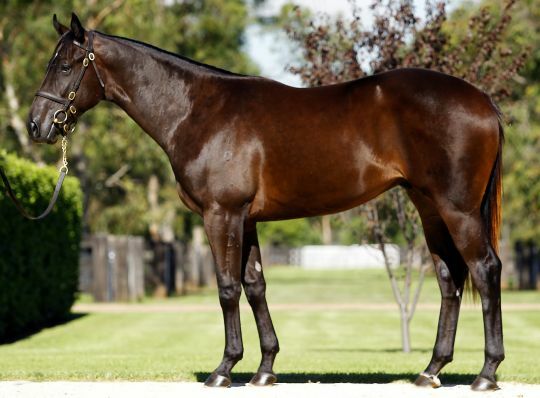 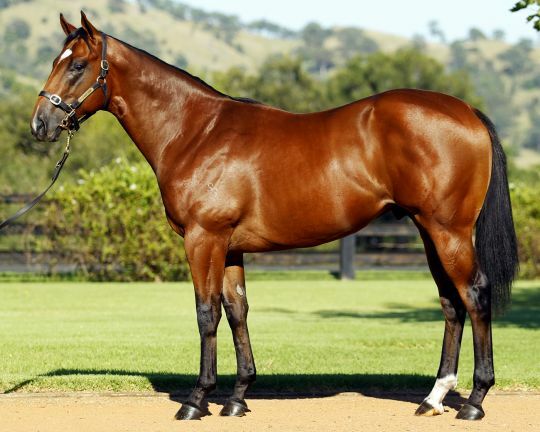 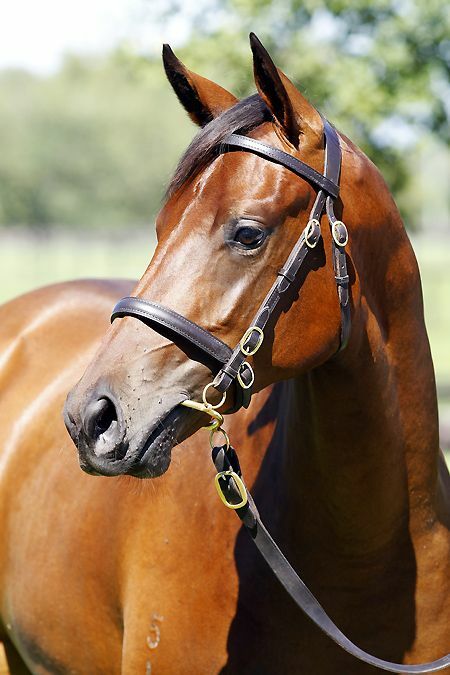 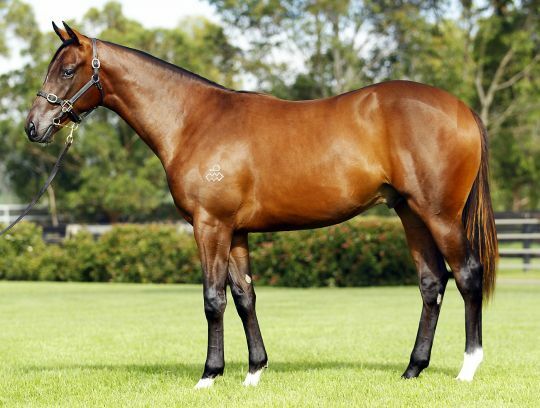 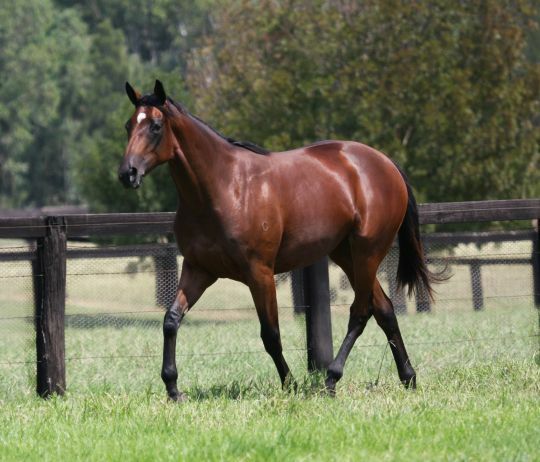 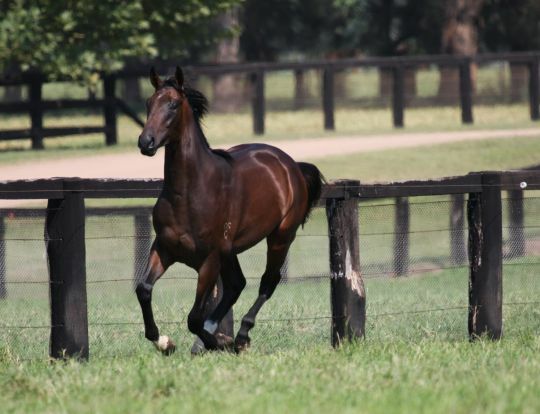 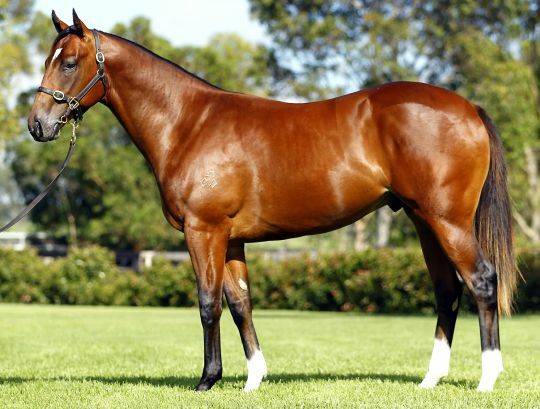 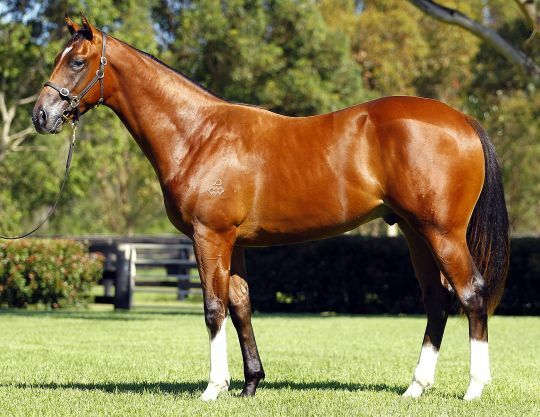 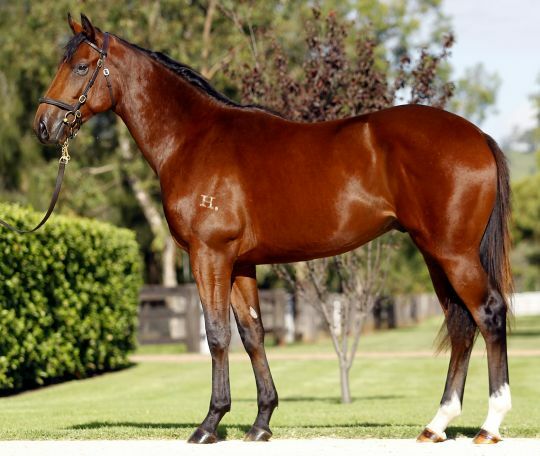 Champion stallions Redoute’s Choice and Fastnet Rock has super Easter sales. 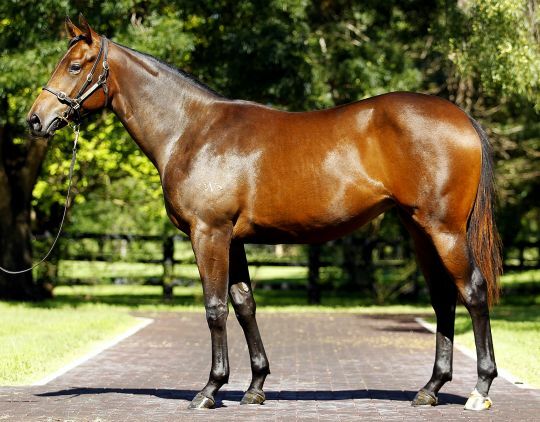 65 yearlings by the pair accounted for $38,990,000 in sales in Session One. 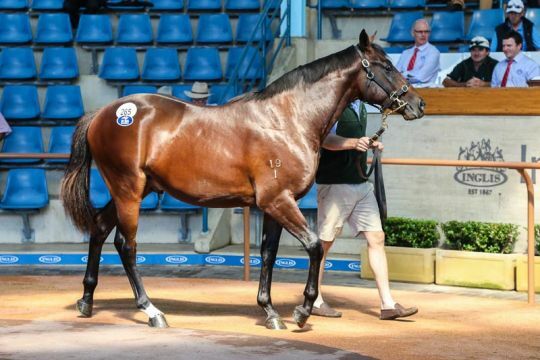 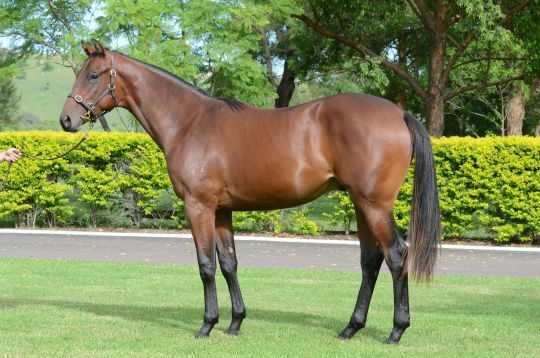 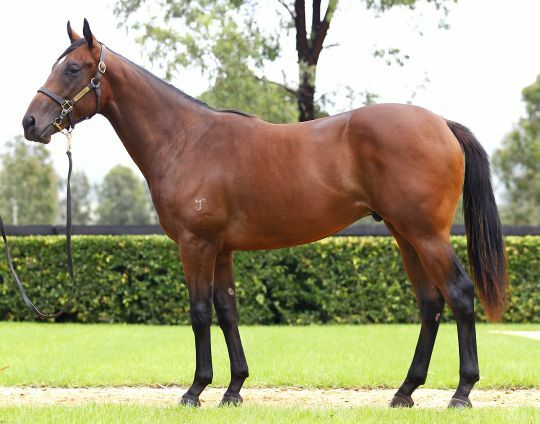 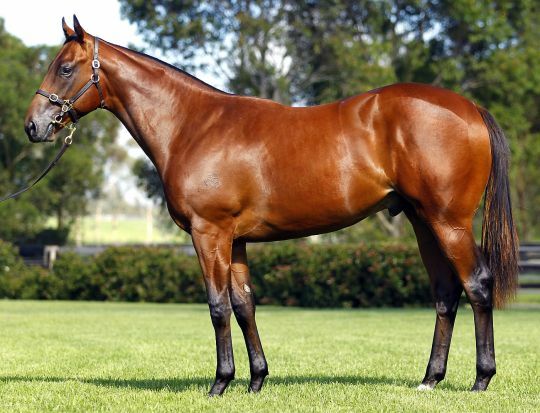 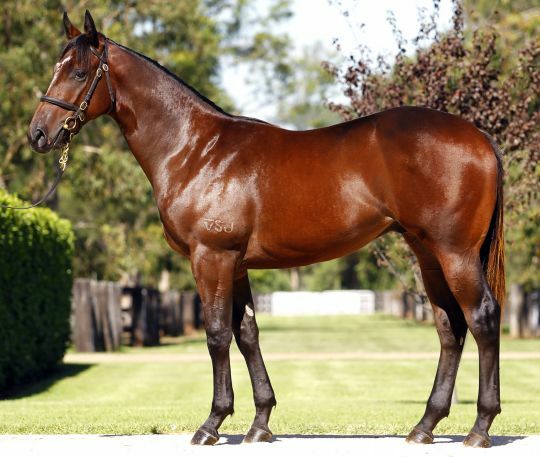 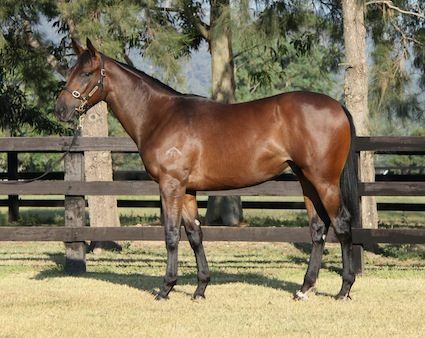 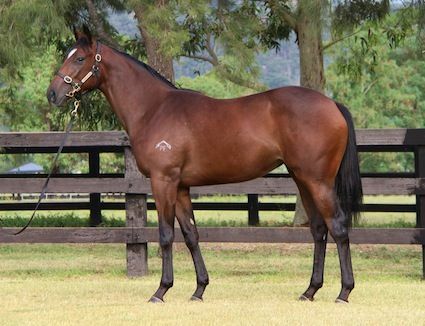 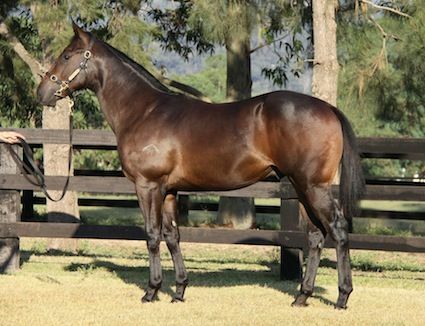 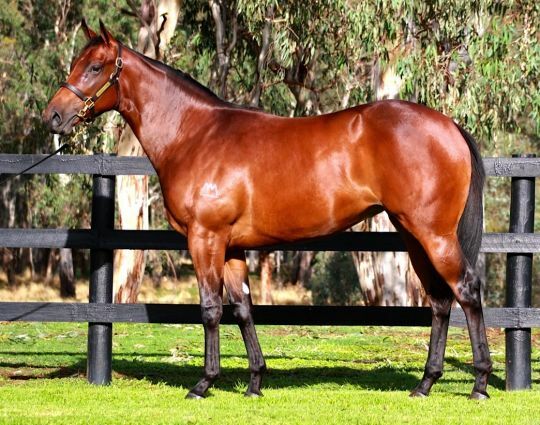 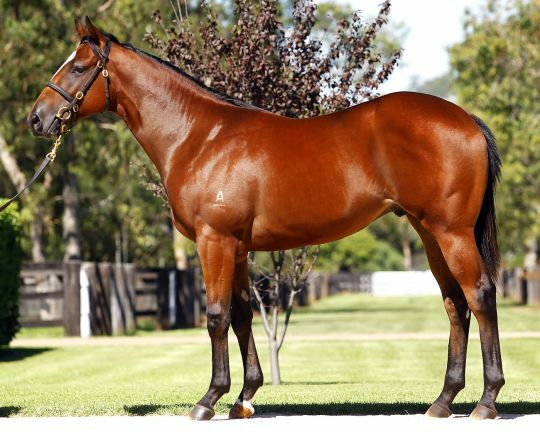 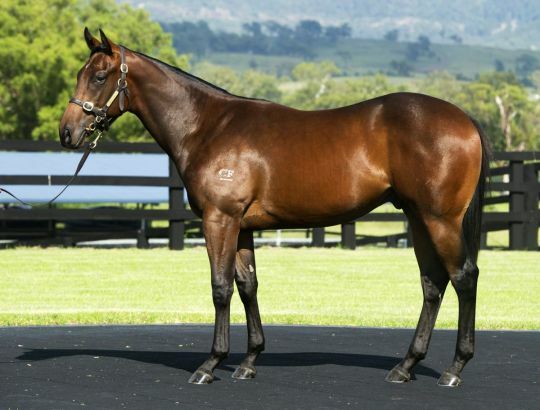 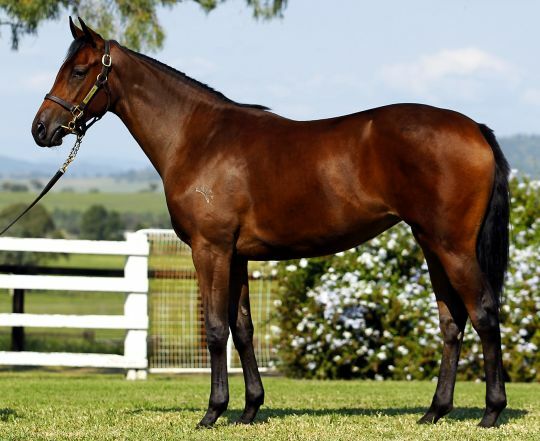 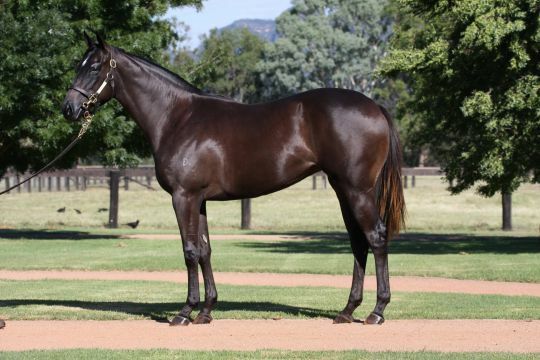 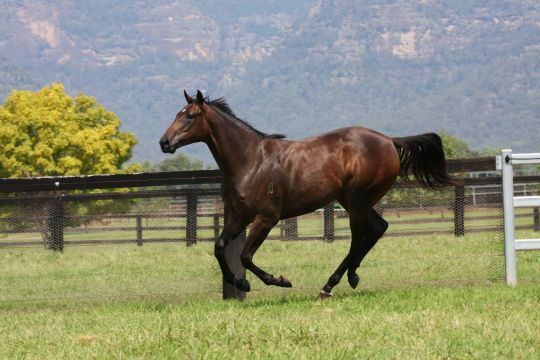 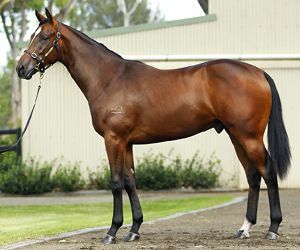 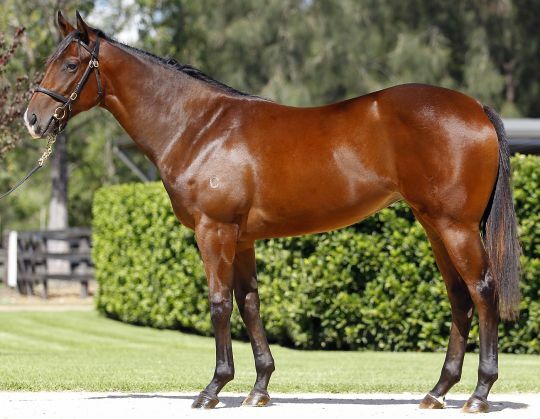 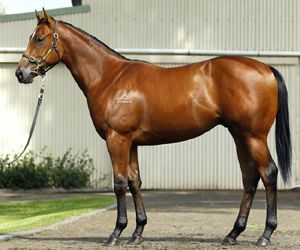 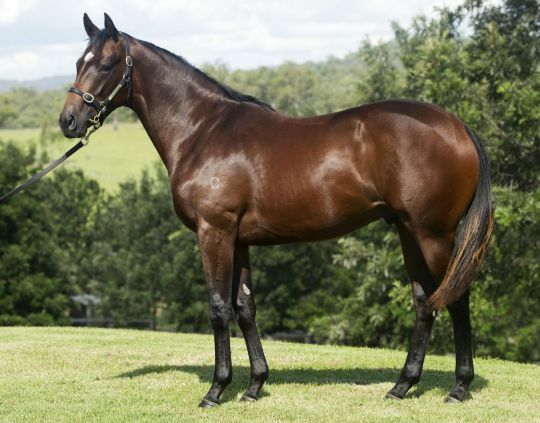 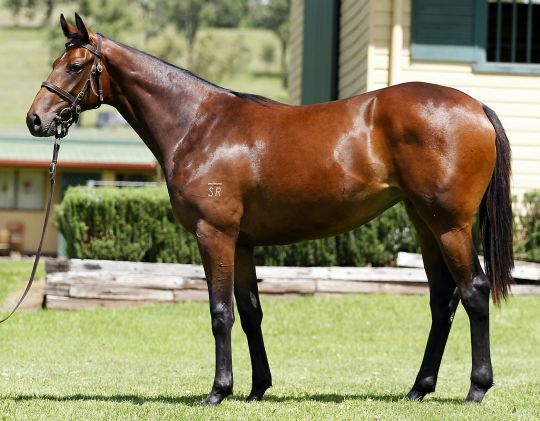 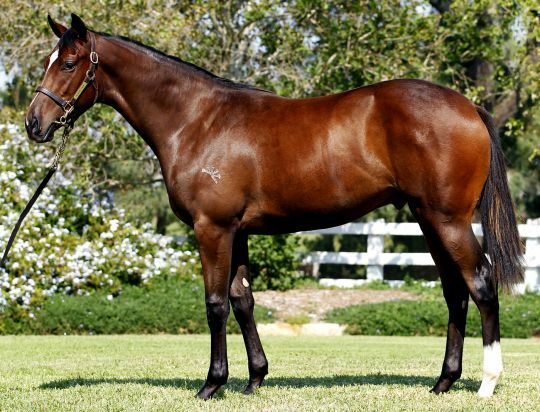 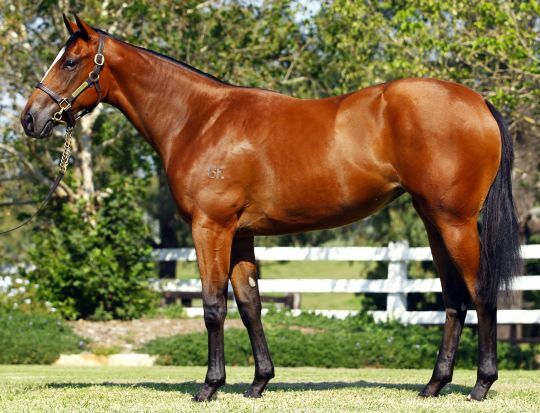 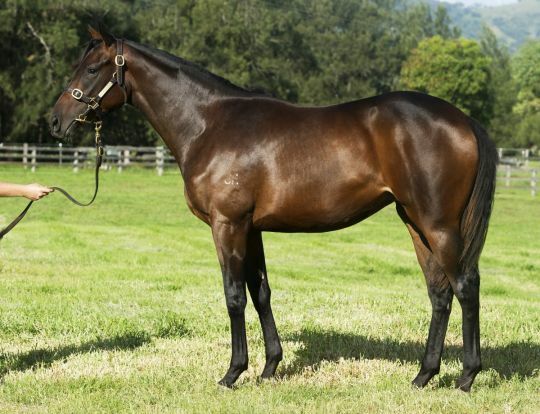 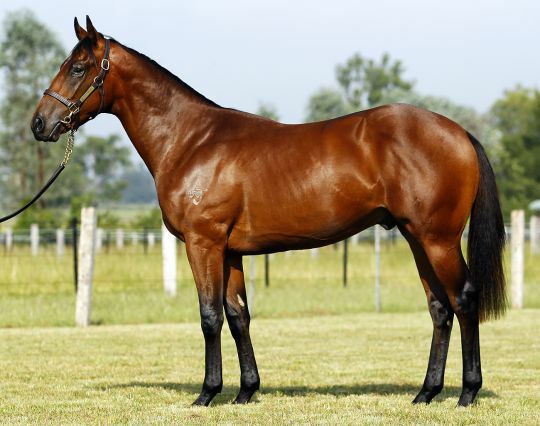 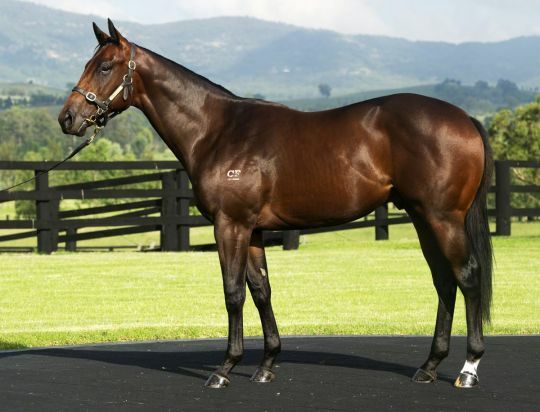 Cressfield Stud drew plenty of praise from buyers, which spent an average of $1,360,000 on the stud’s 5 yearlings sold, highlighted by the $4 million Fastnet Rock colt on Wednesday. 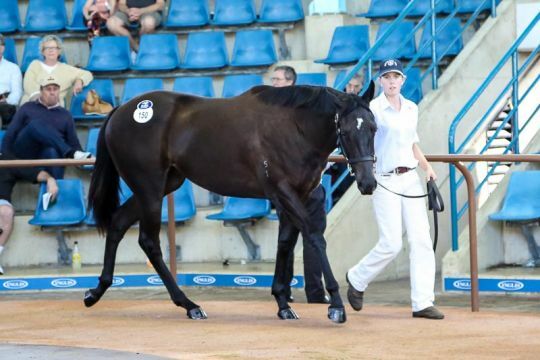 Alex Kingston accepted Kia-Ora Stud’s prize from Luxbet for the best prepared draft at the 2013 Easter Sale. 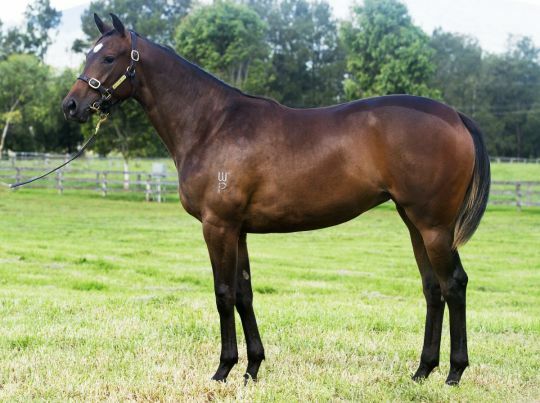 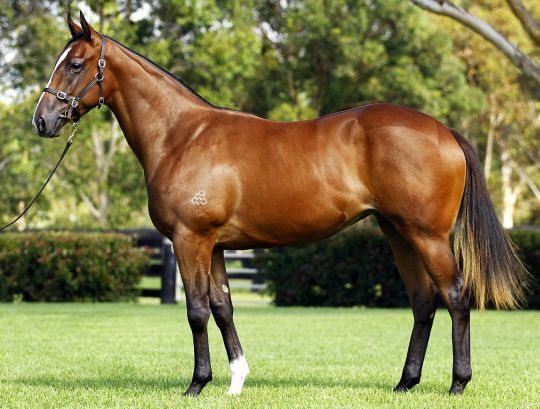 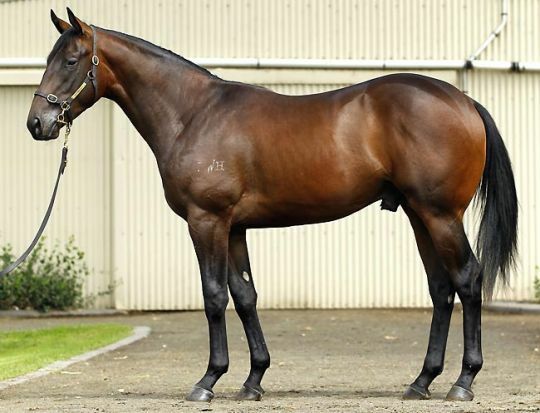 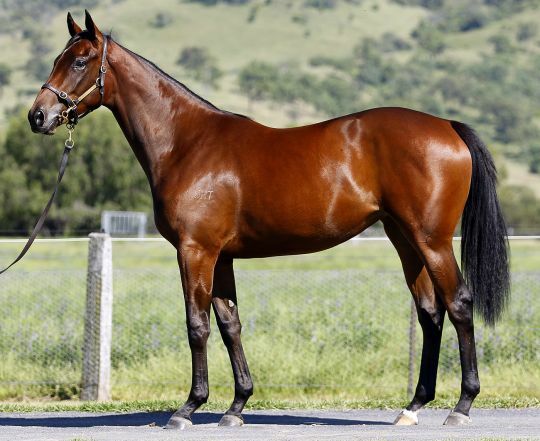 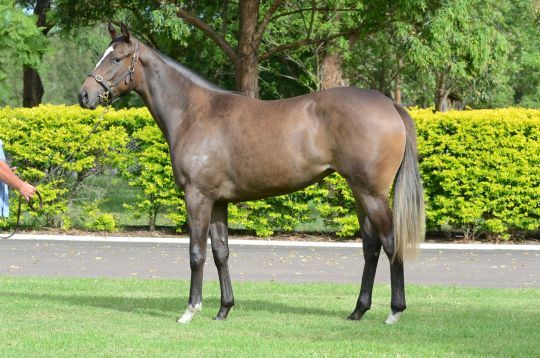 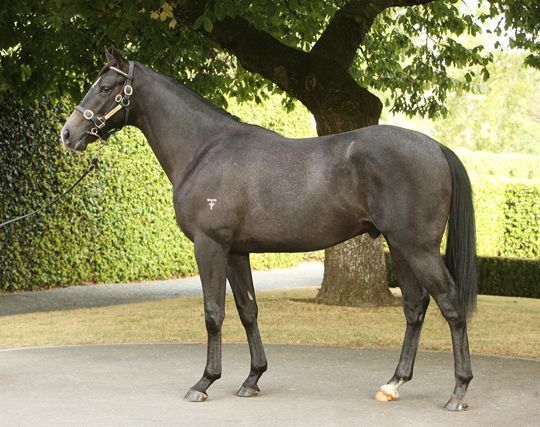 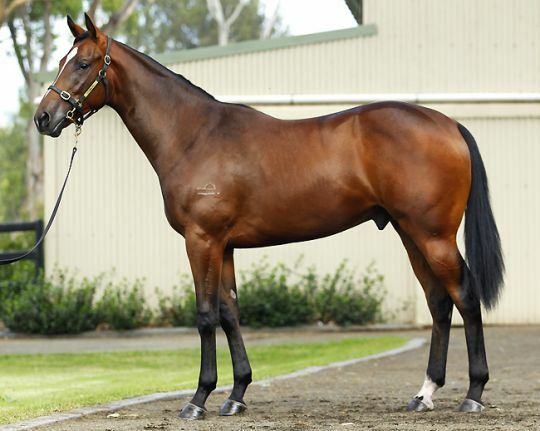 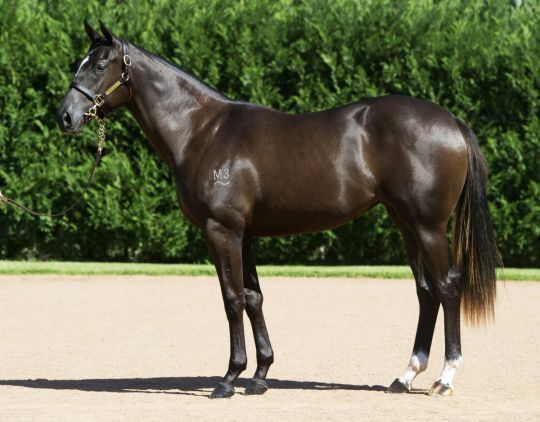 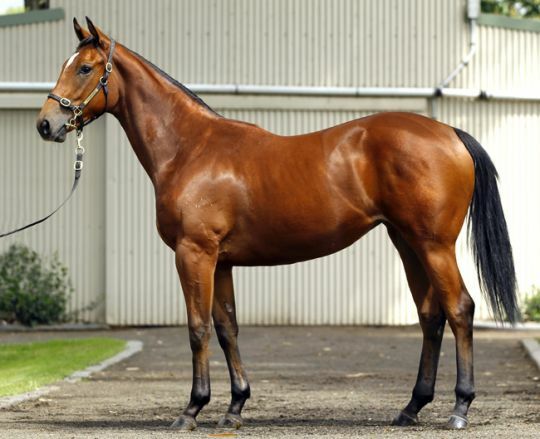 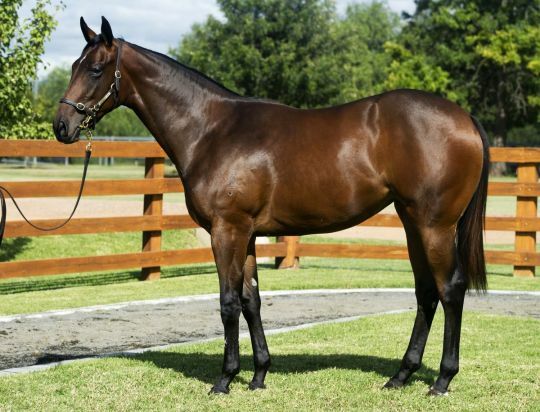 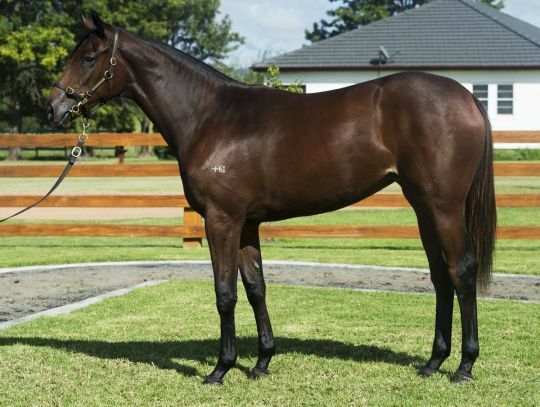 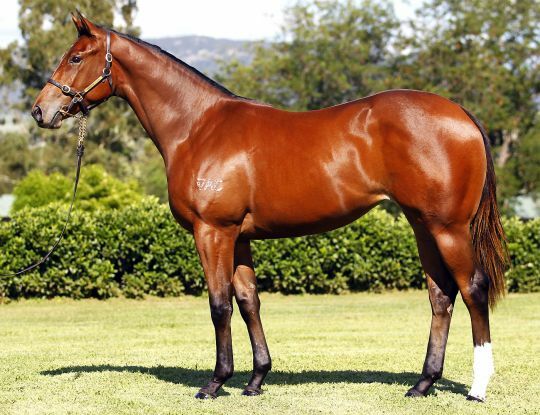 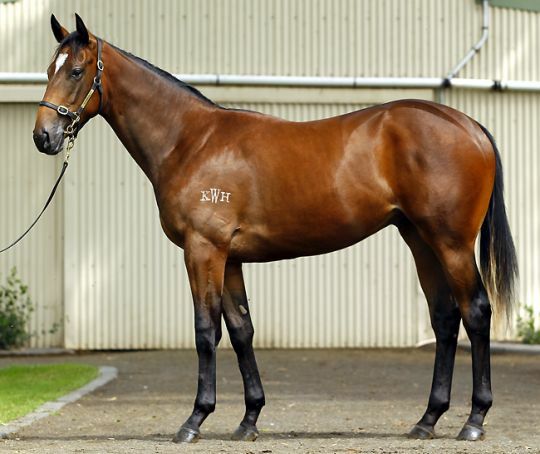 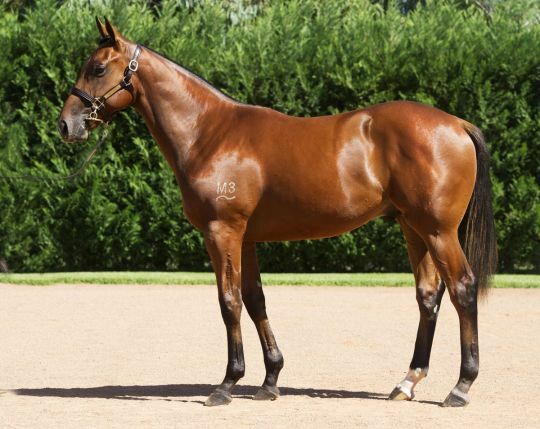 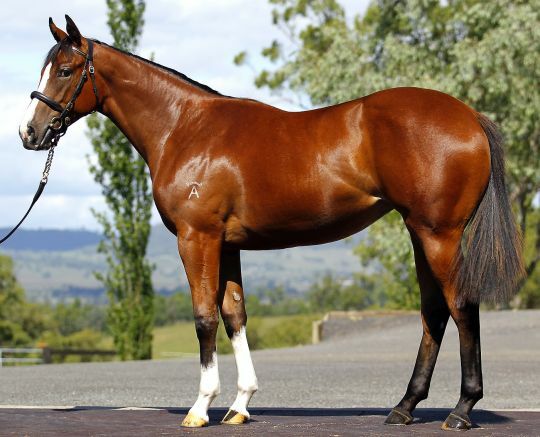 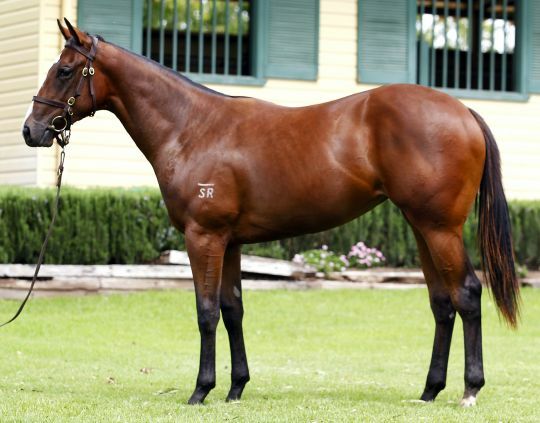 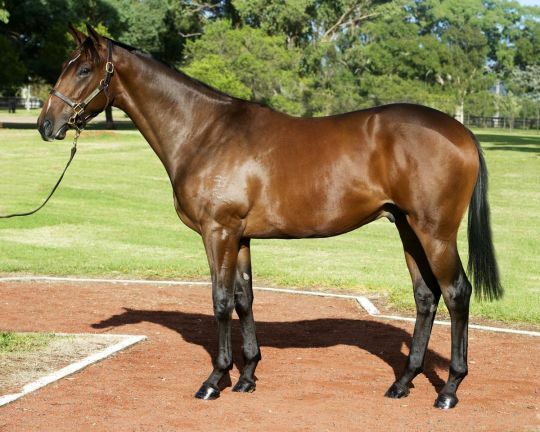 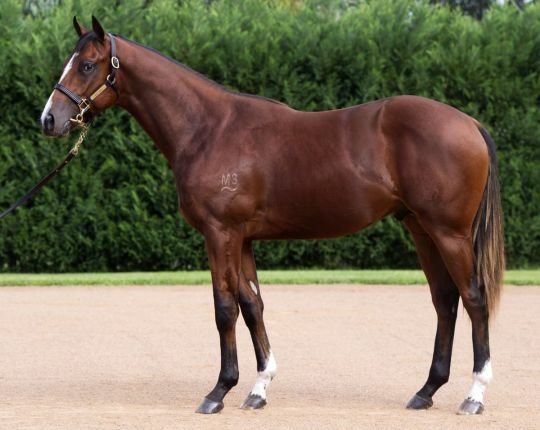 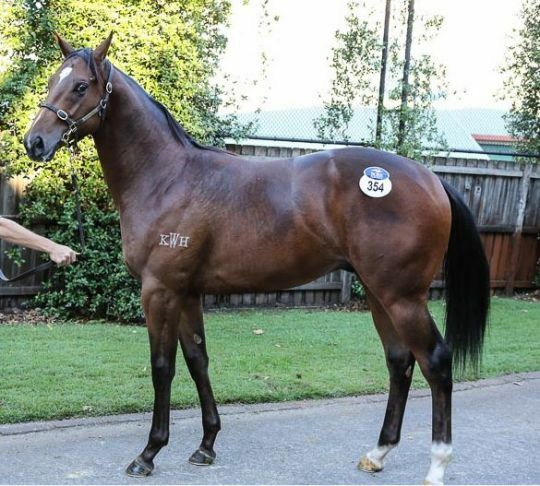 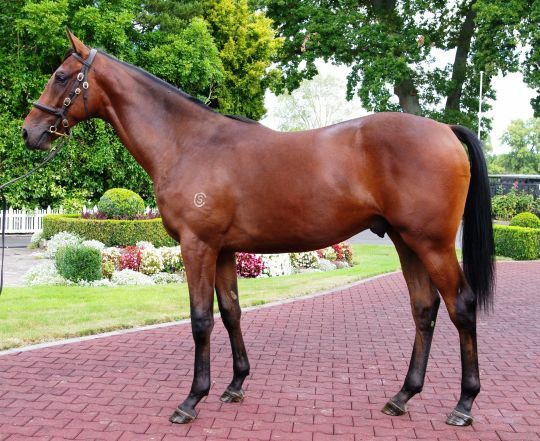 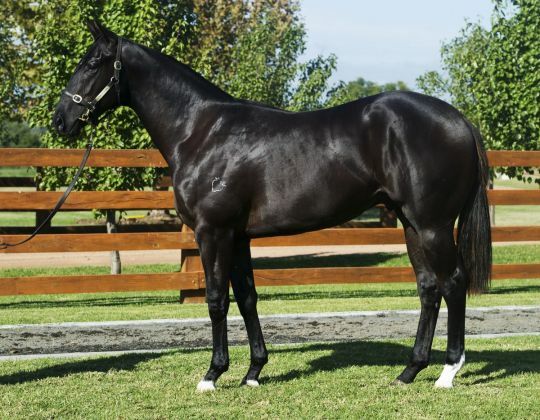 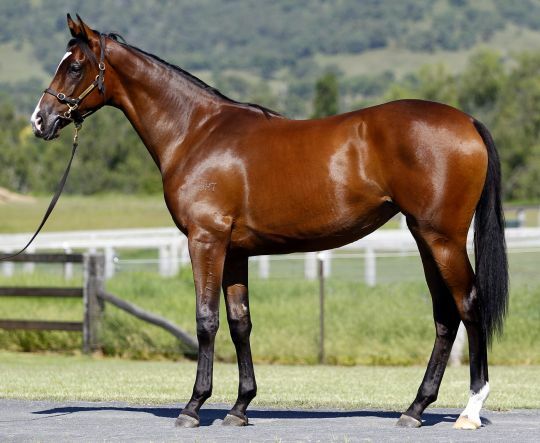 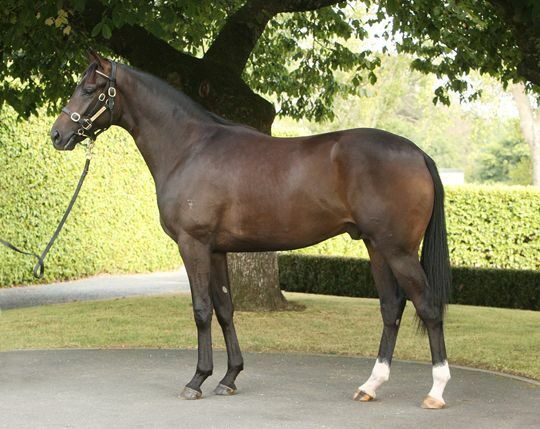 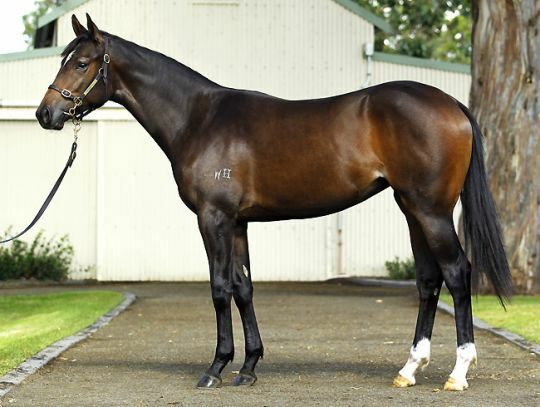 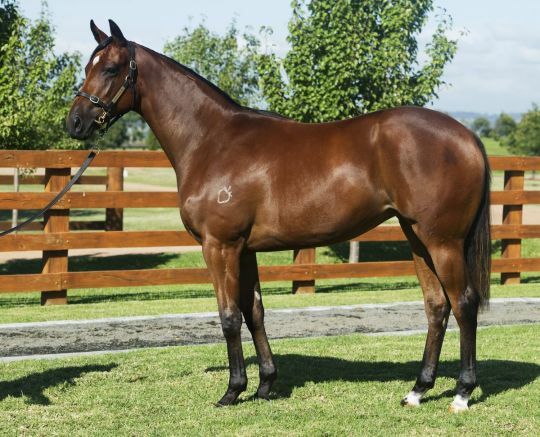 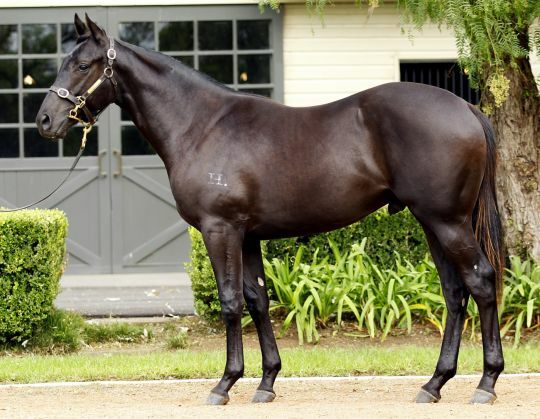 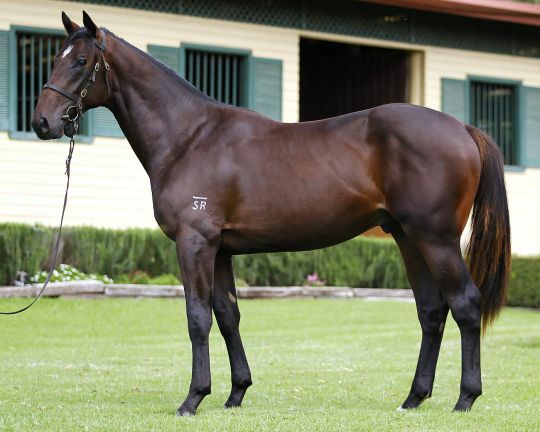 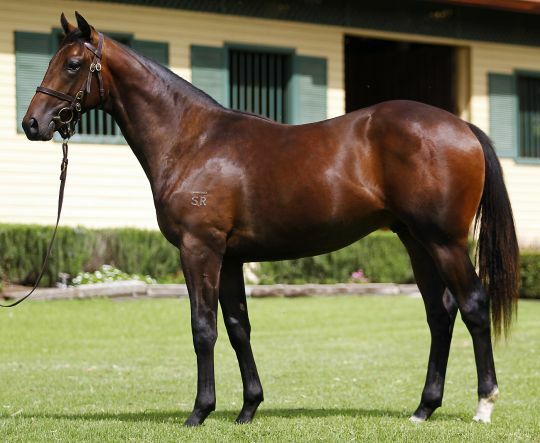 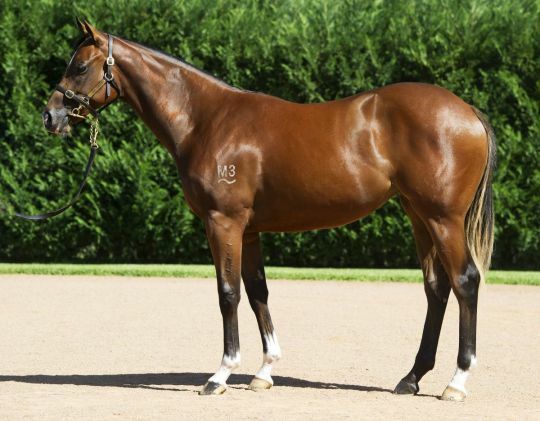 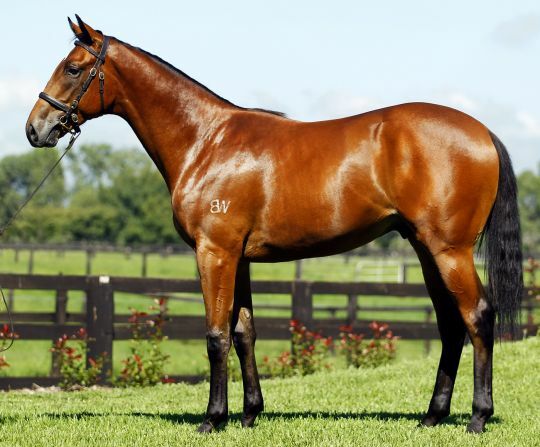 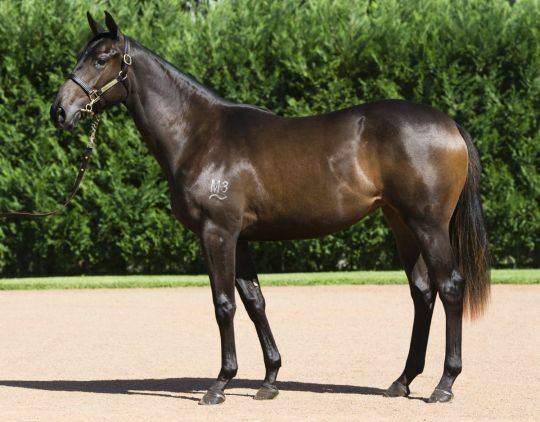 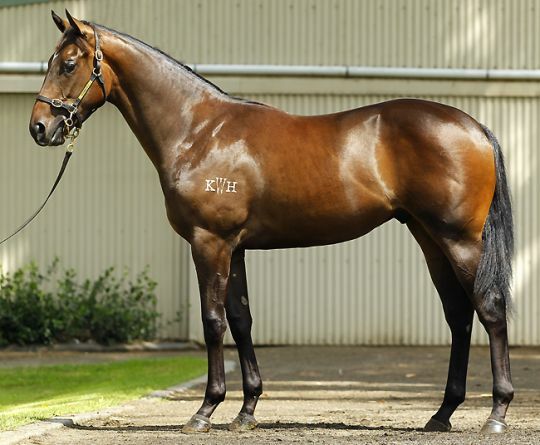 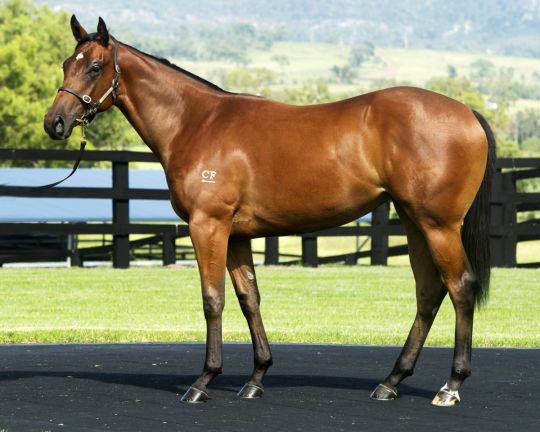 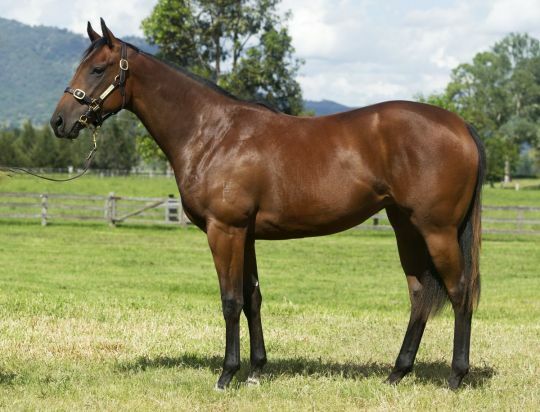 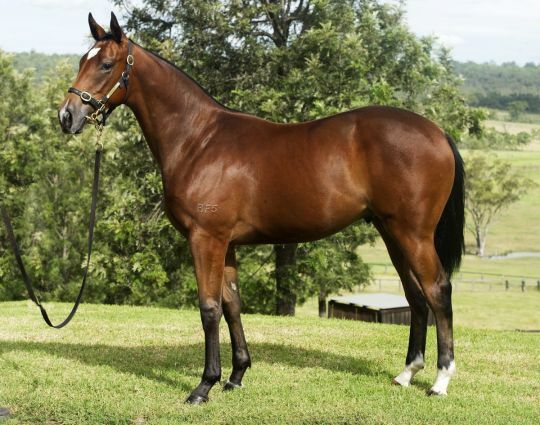 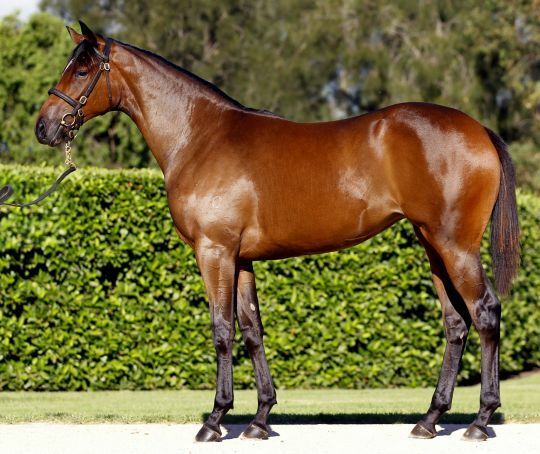 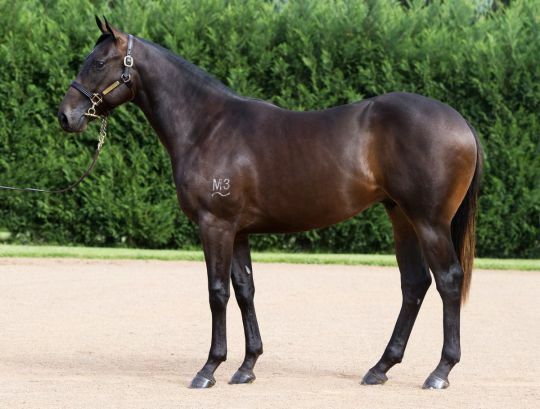 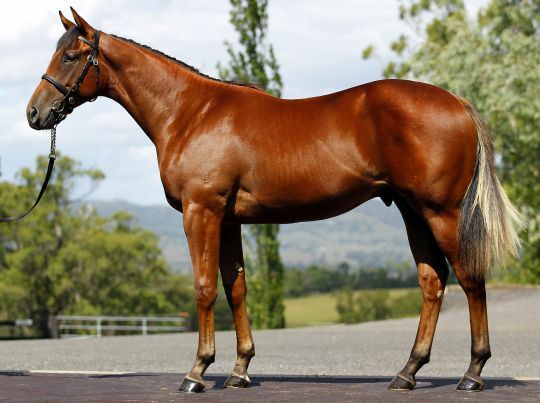 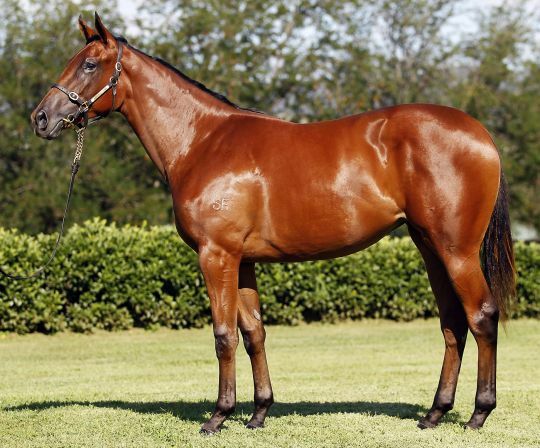 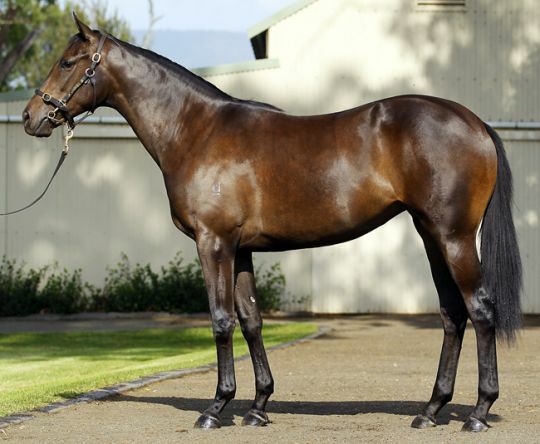 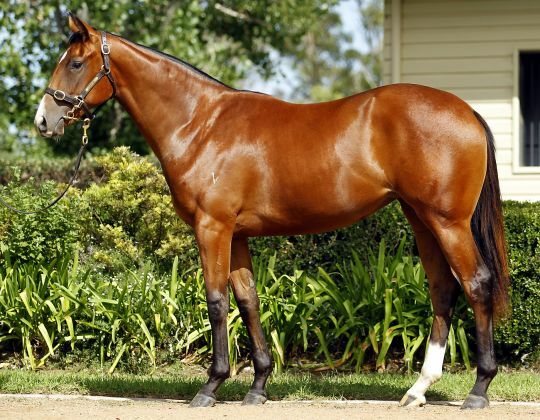 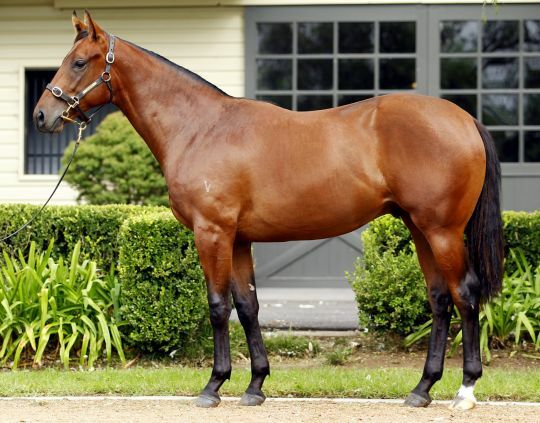 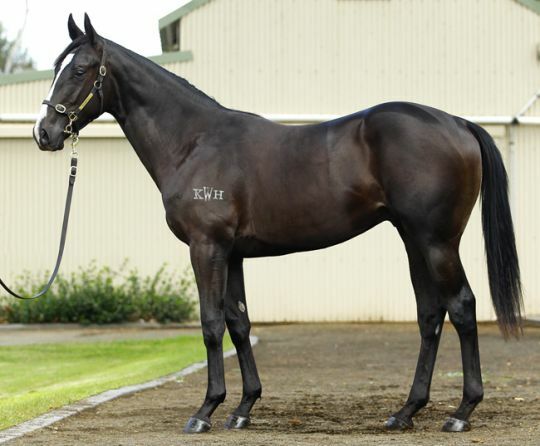 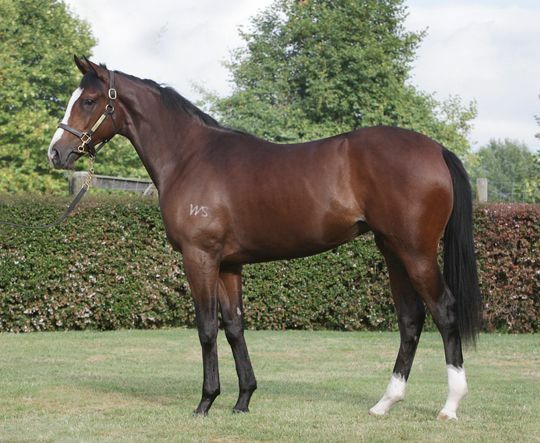 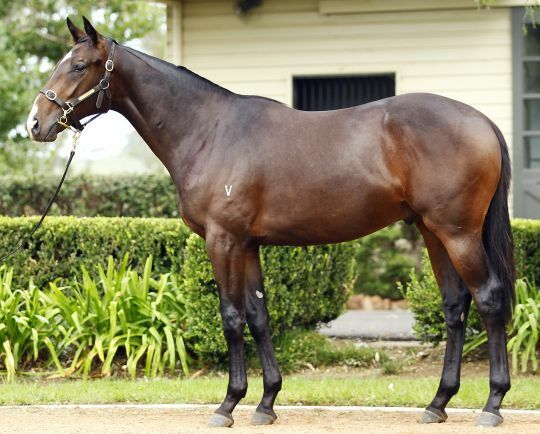 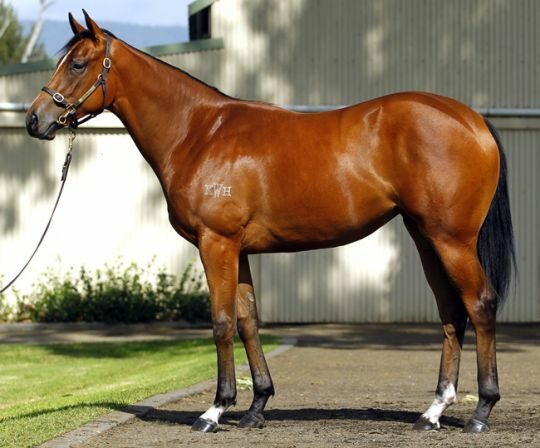 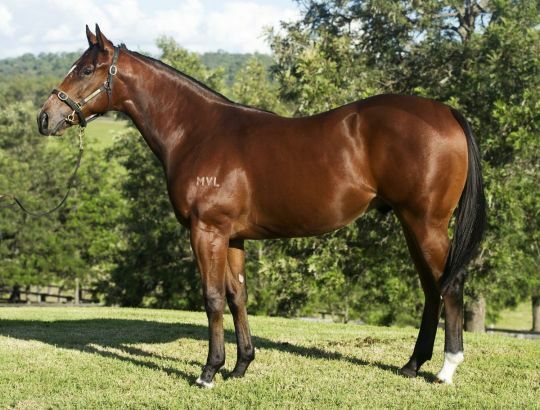 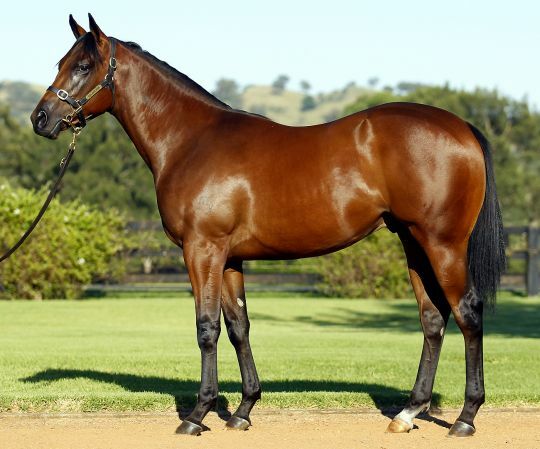 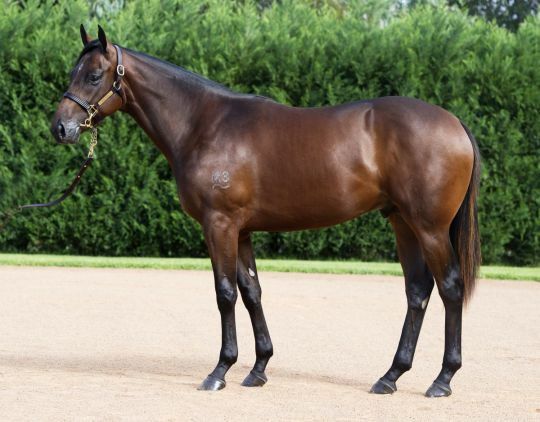 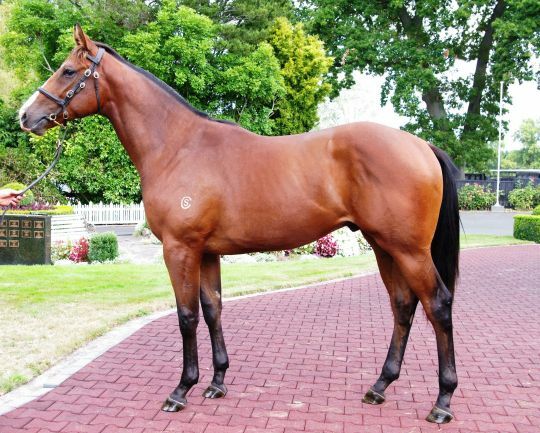 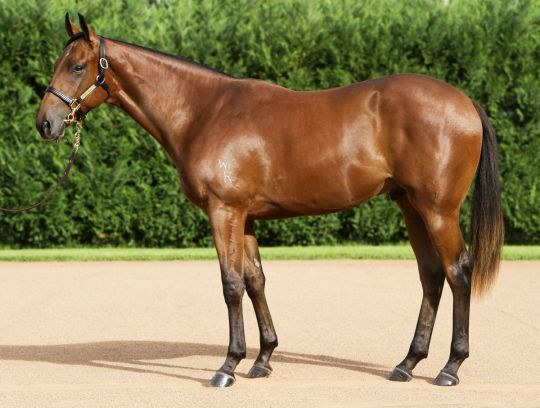 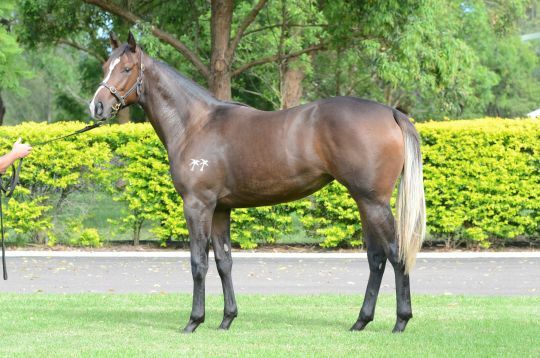 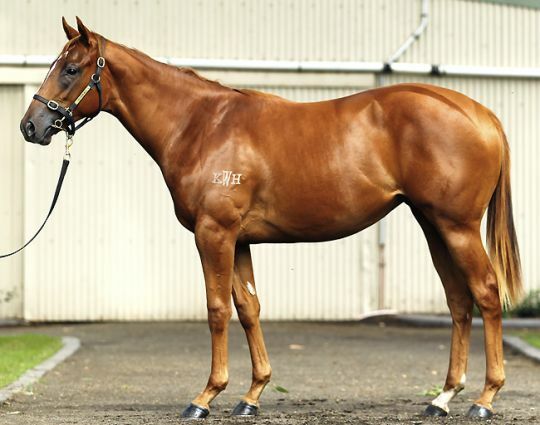 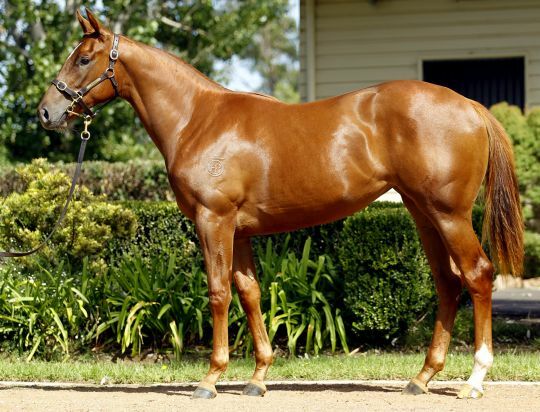 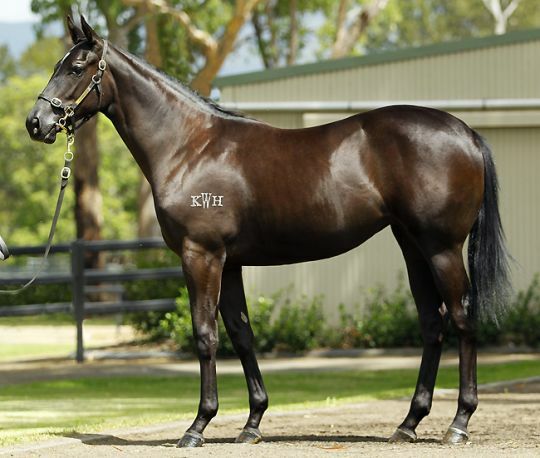 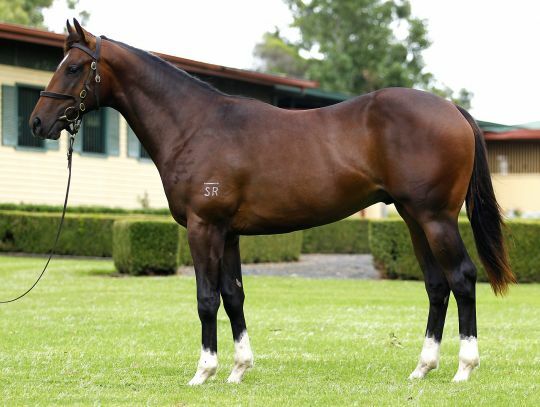 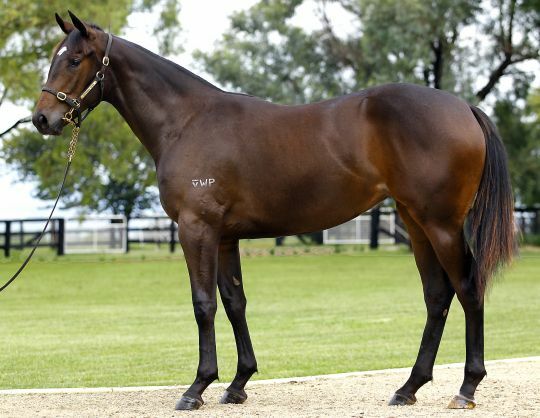 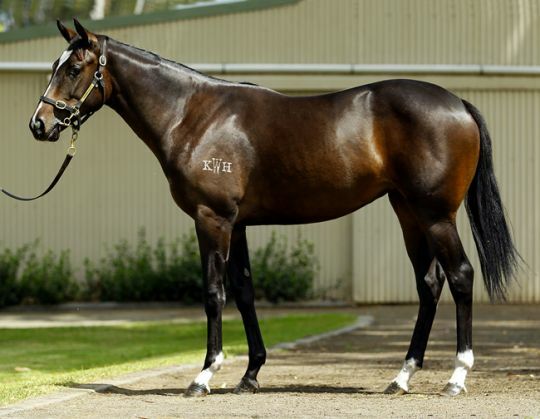 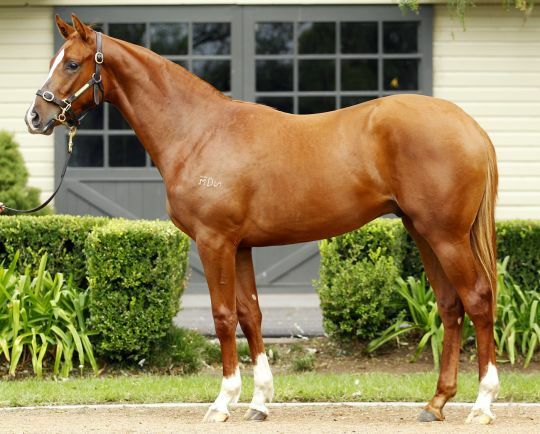 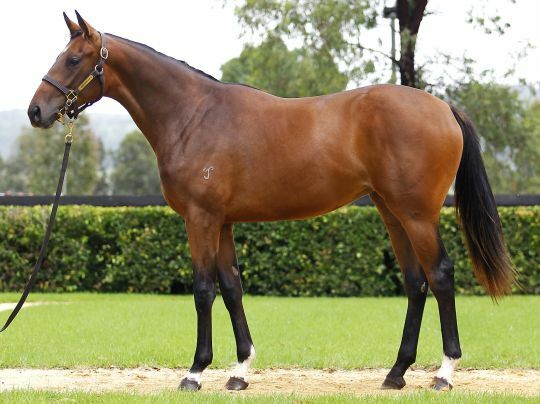 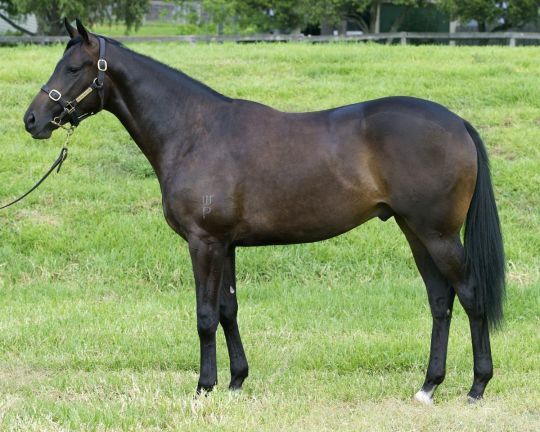 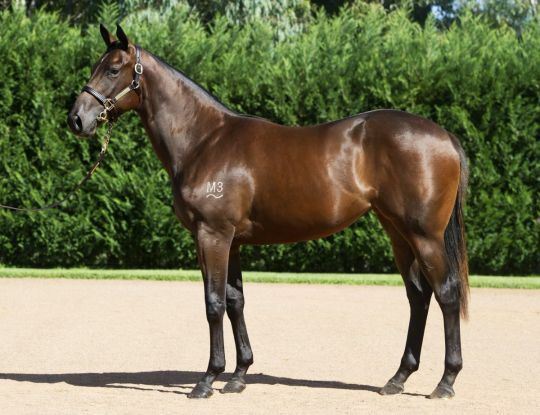 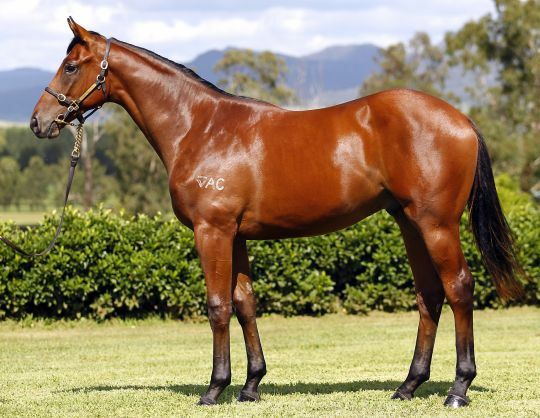 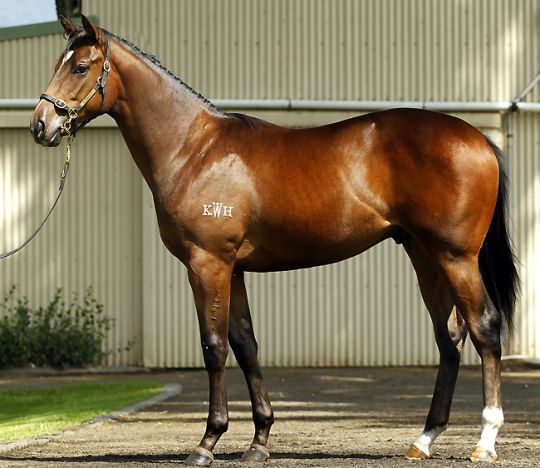 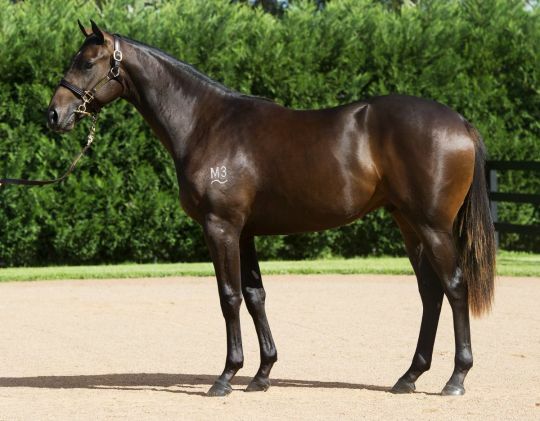 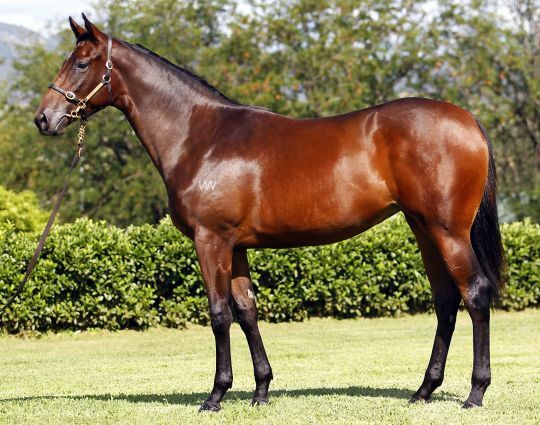 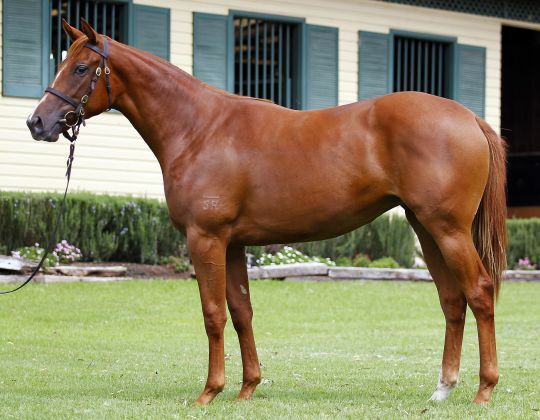 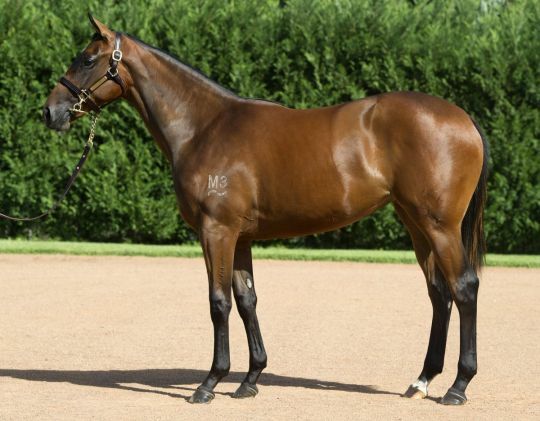 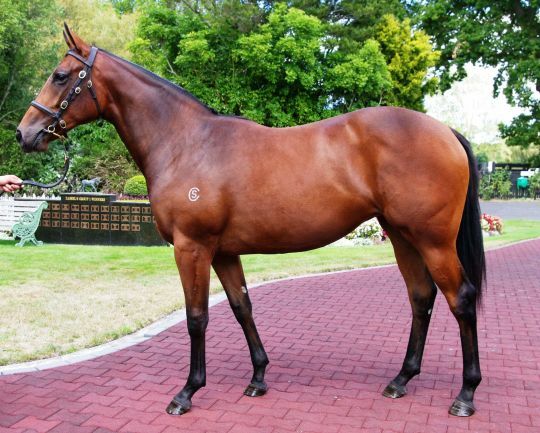 Kia-Ora brought 11 to the sale and sold 9 at an average of $536,667, with the highlight being the Fastnet Rock x Dream Play colt (Lot 82) which was sold for $1,500,000 to Tom Magnier for Coolmore / China Horse Club. 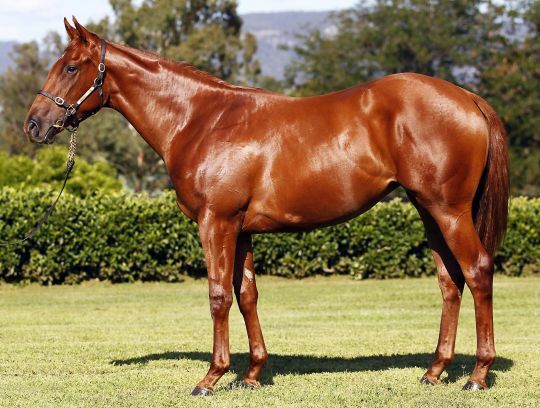 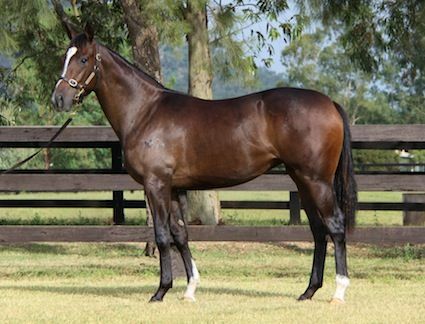 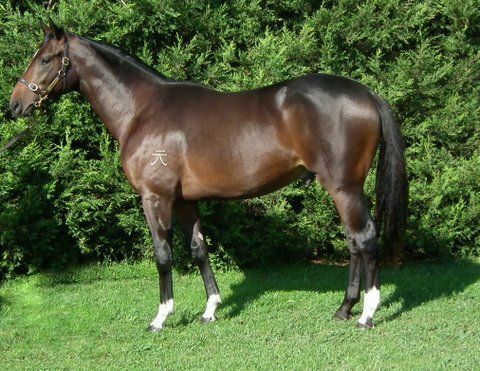 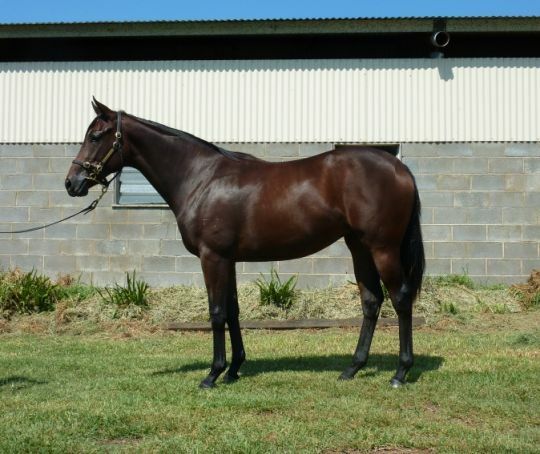 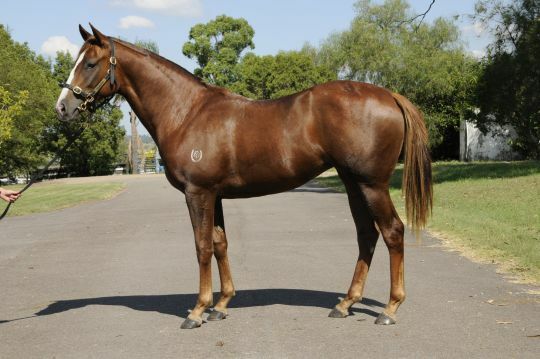 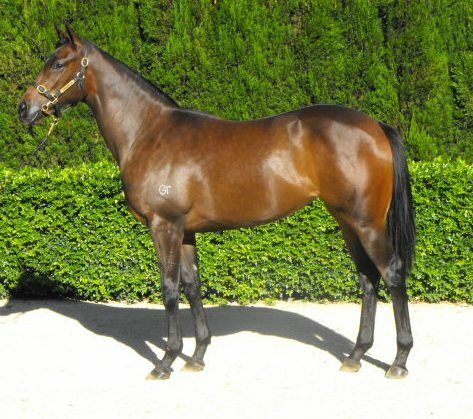 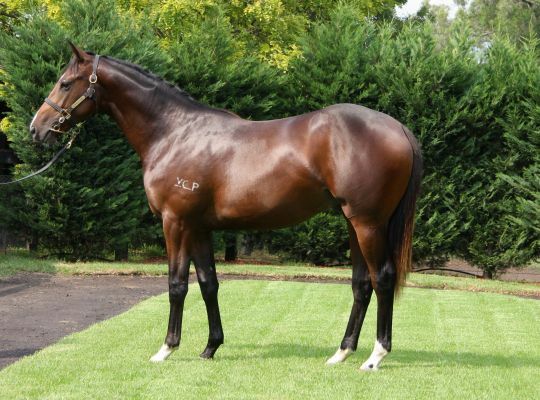 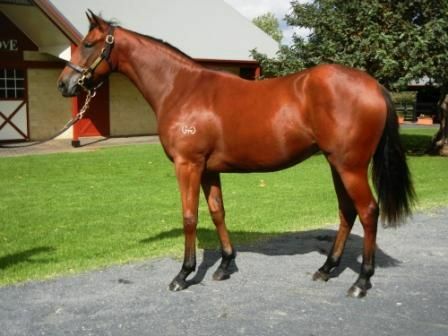 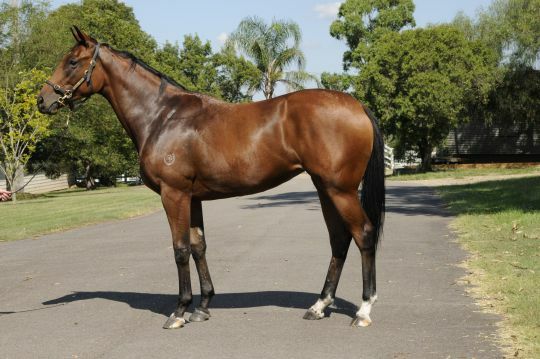 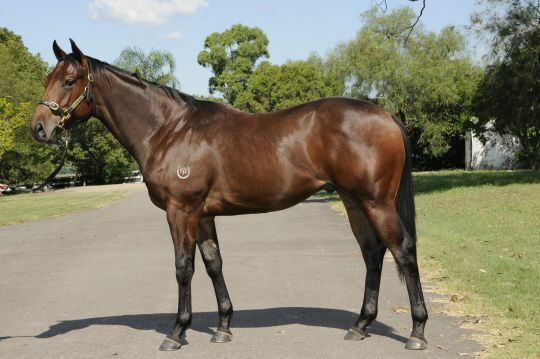 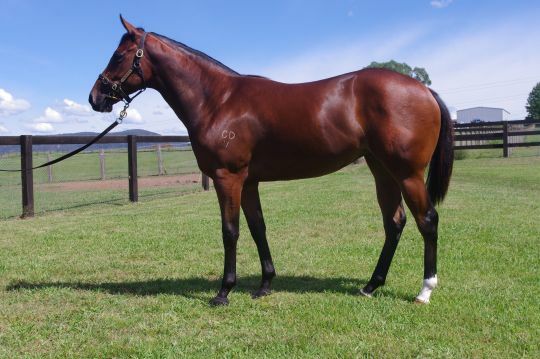 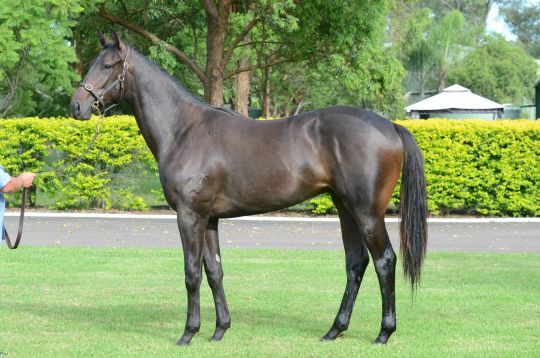 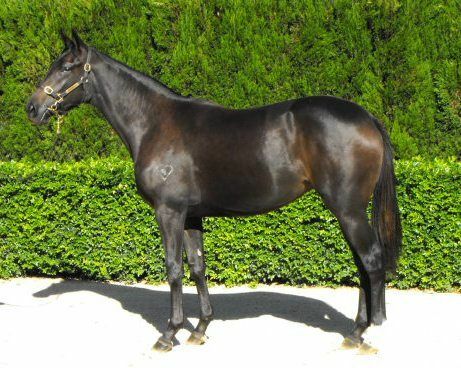 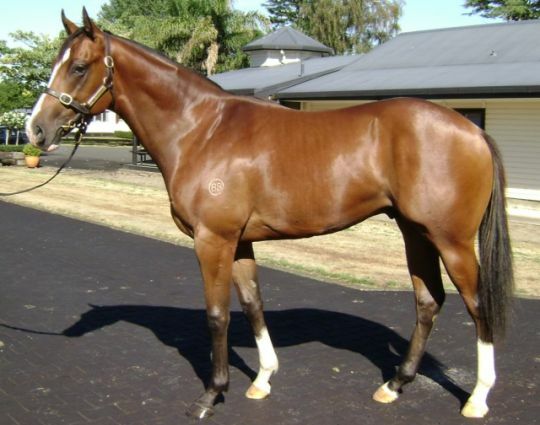 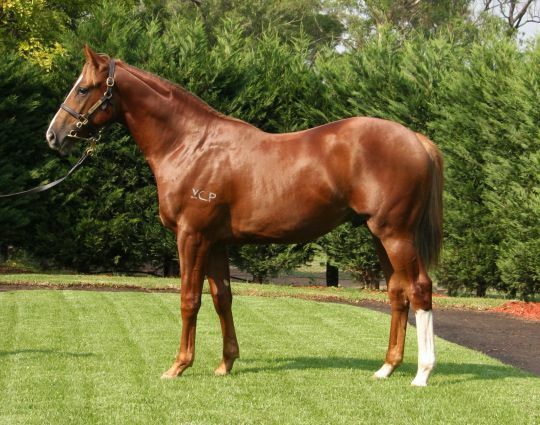 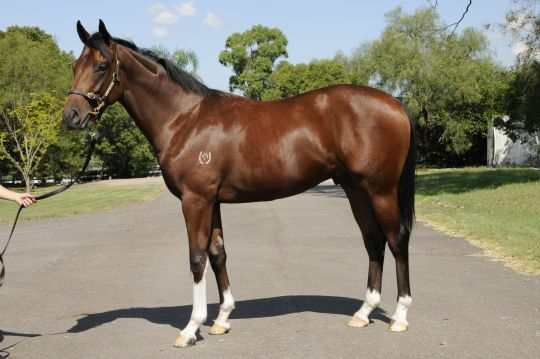 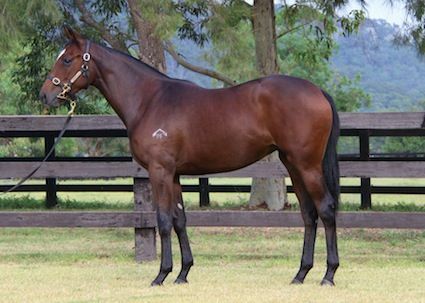 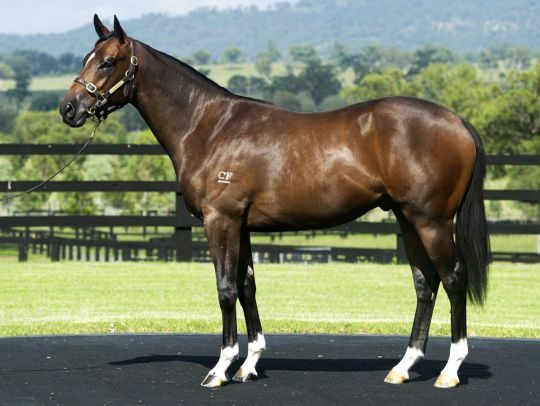 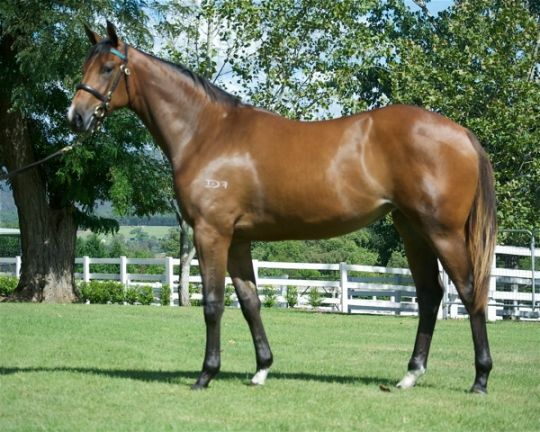 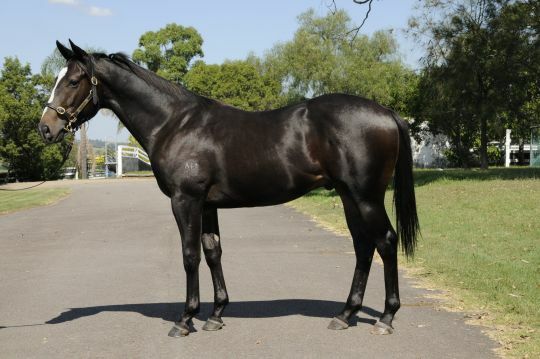 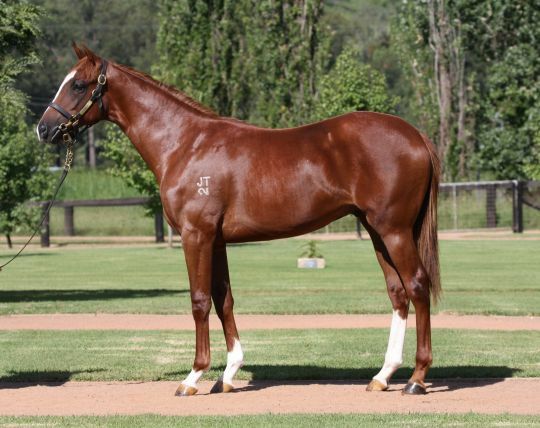 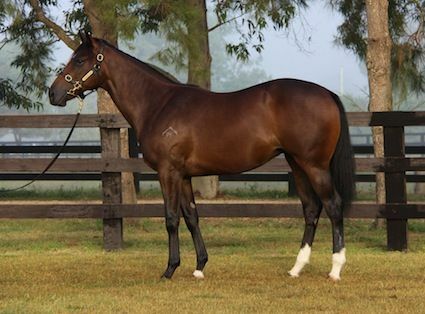 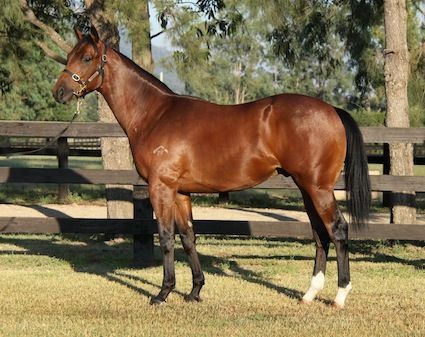 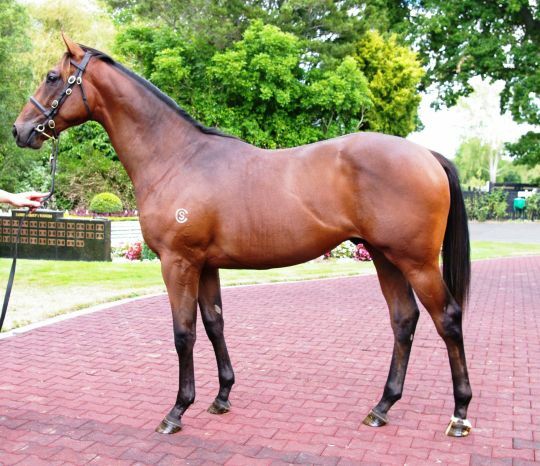 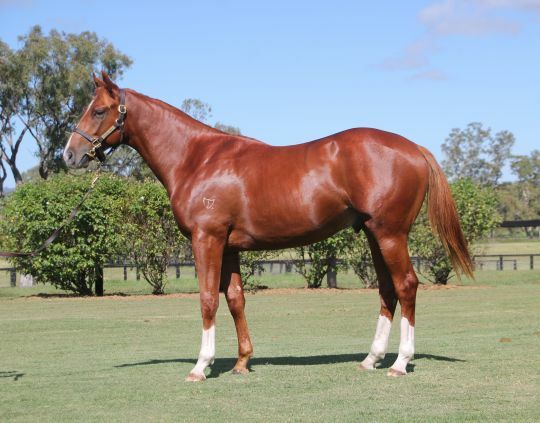 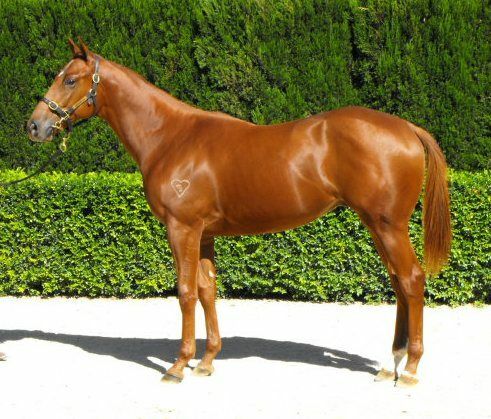 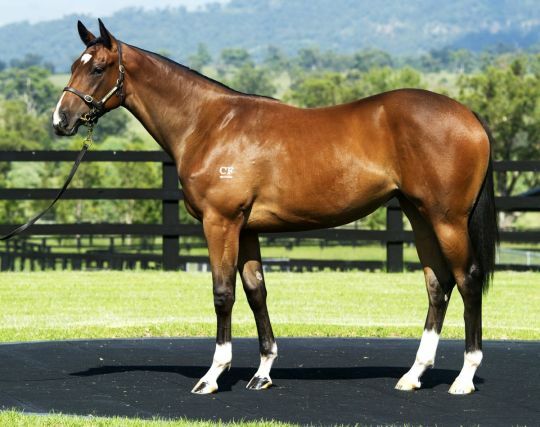 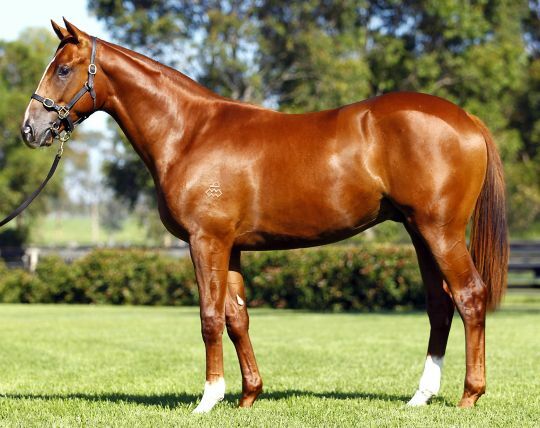 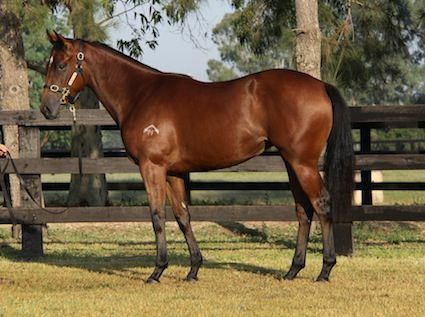 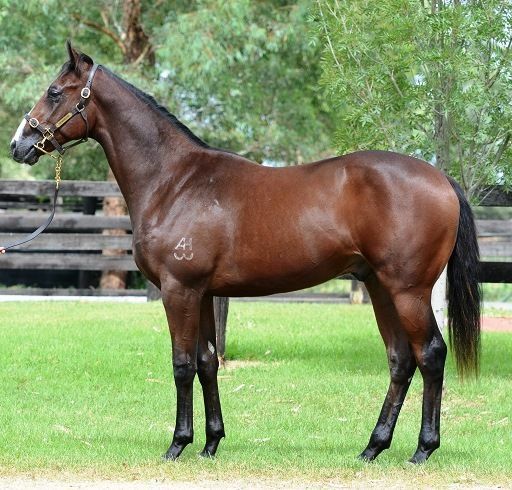 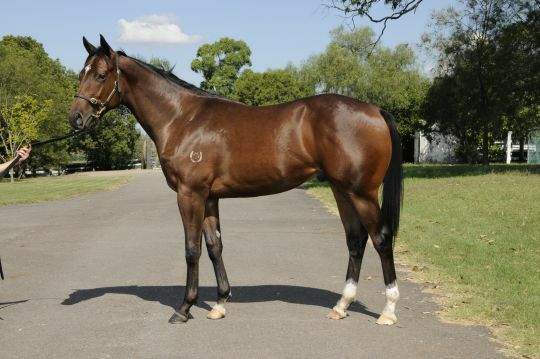 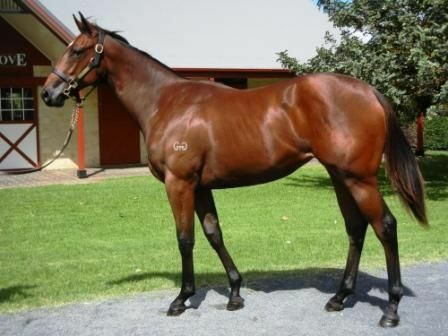 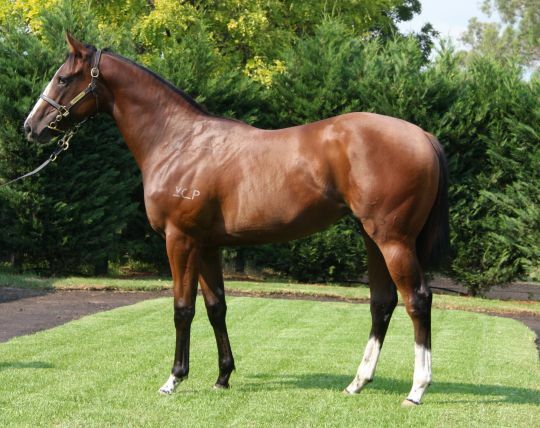 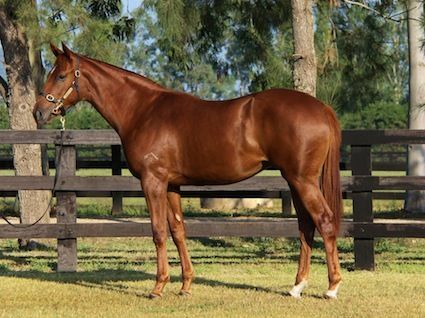 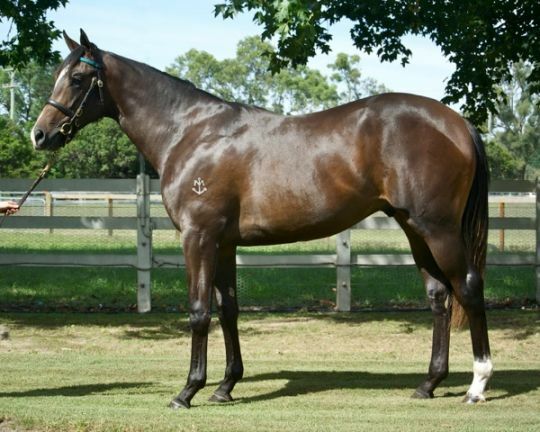 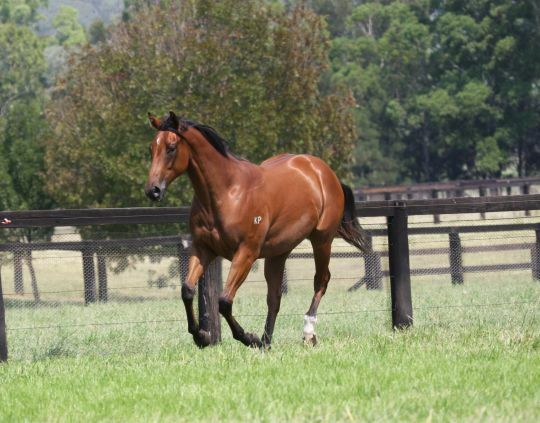 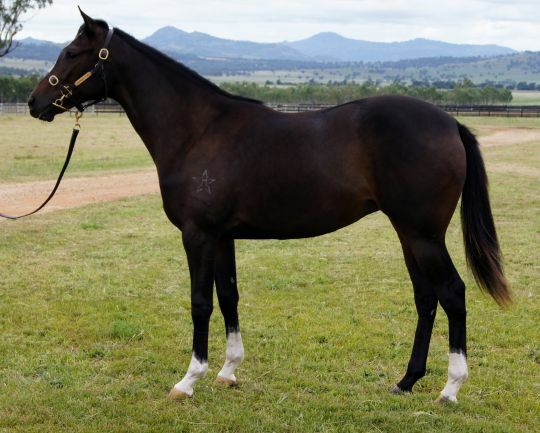 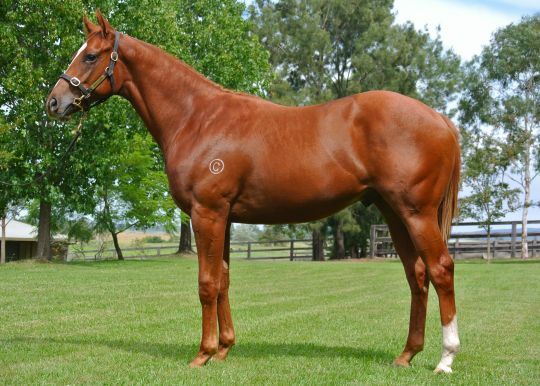 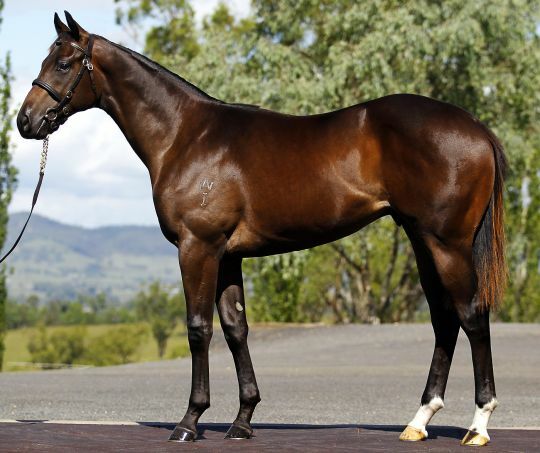 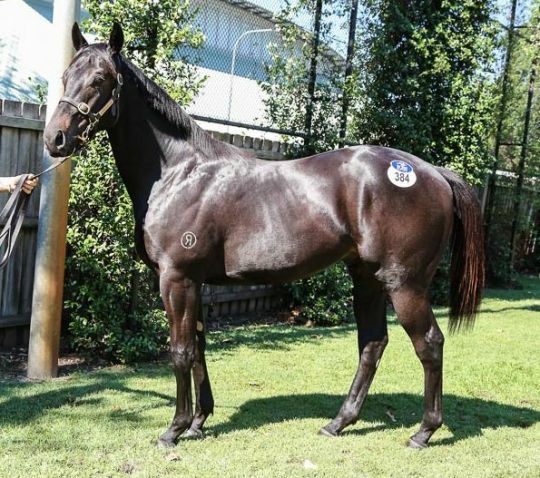 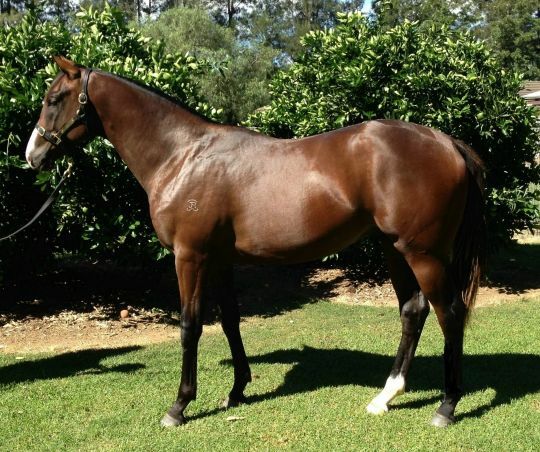 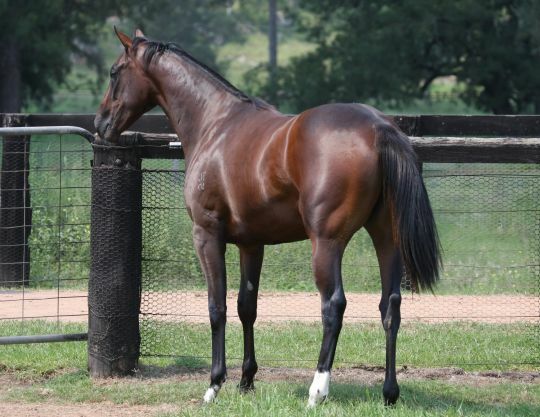 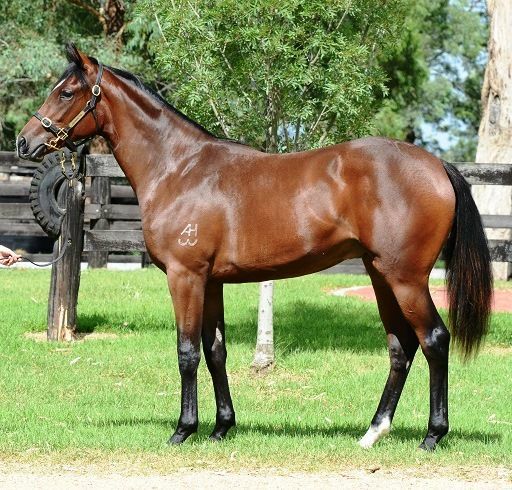 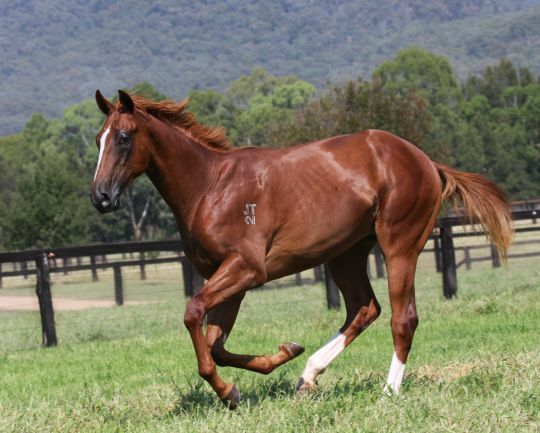 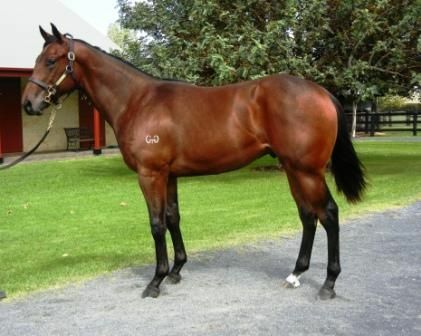 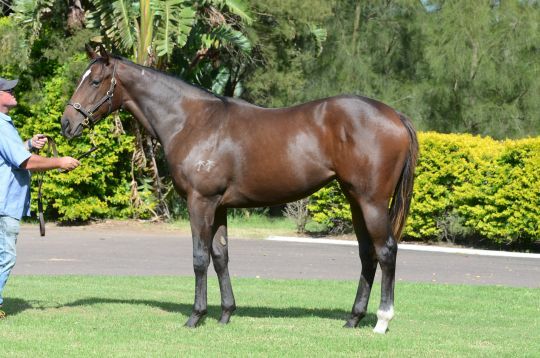 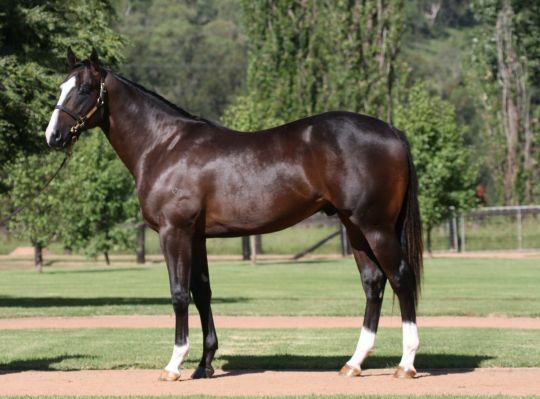 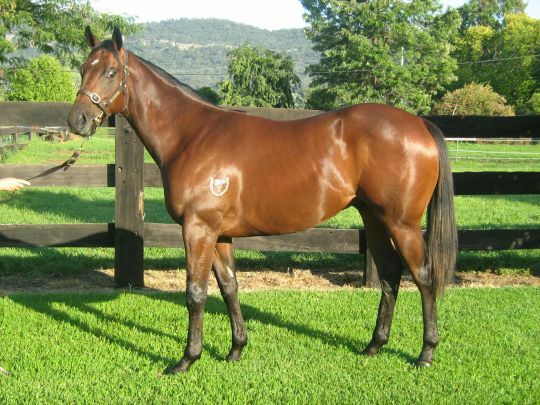 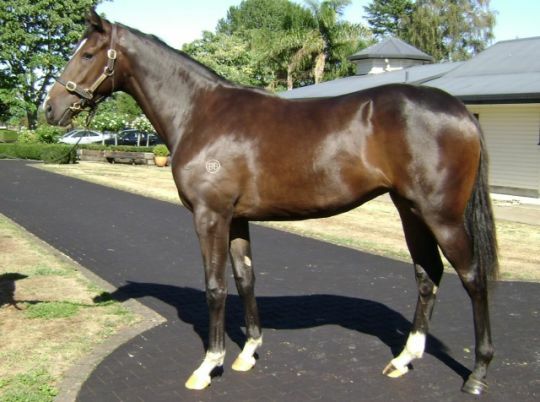 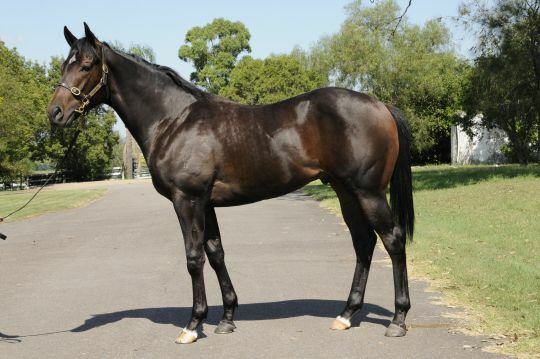 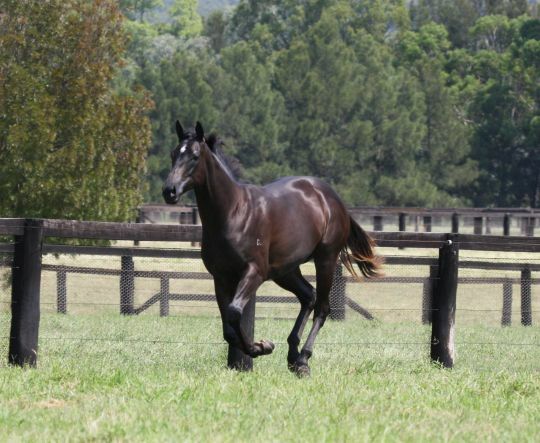 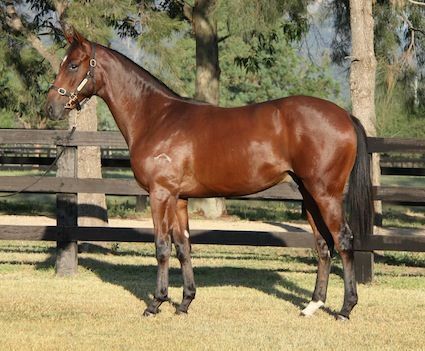 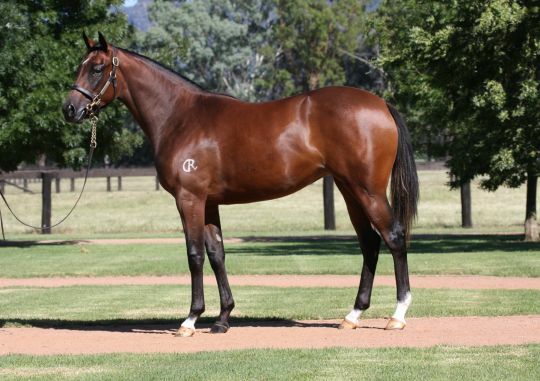 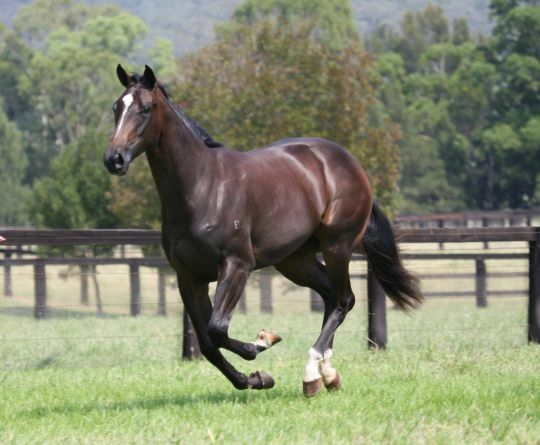 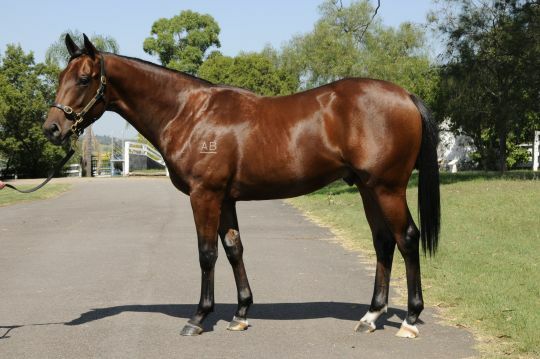 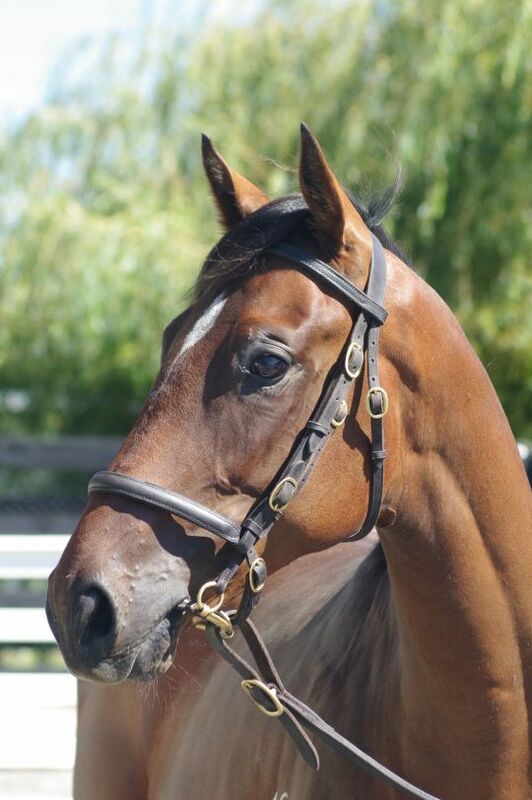 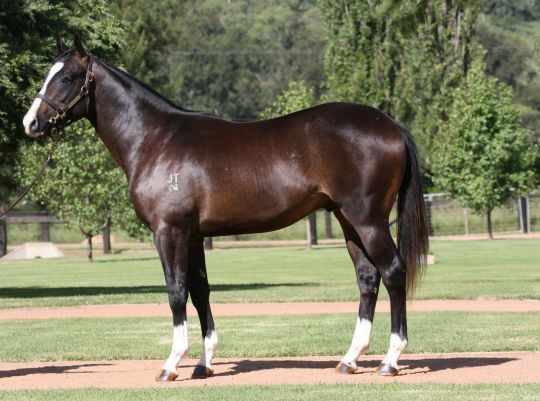 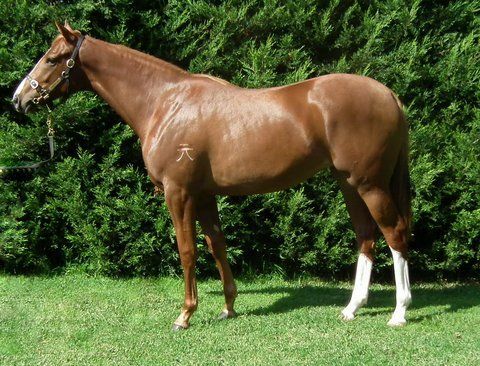 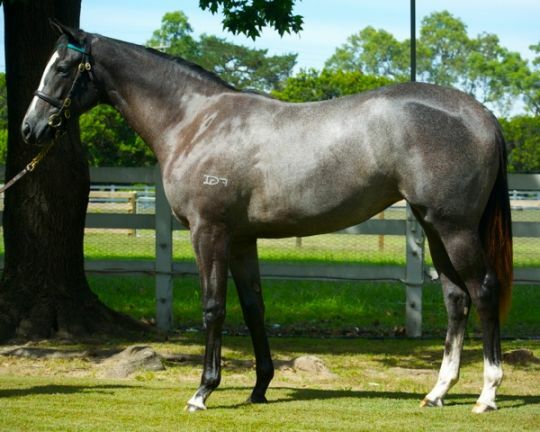 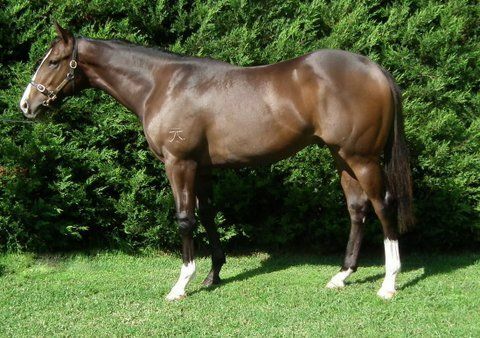 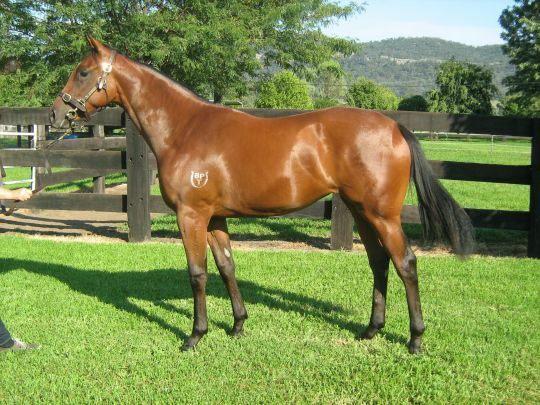 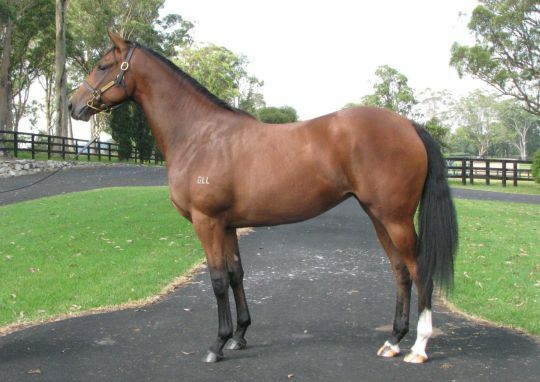 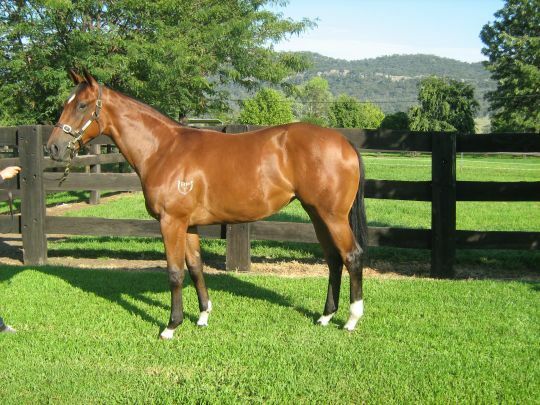 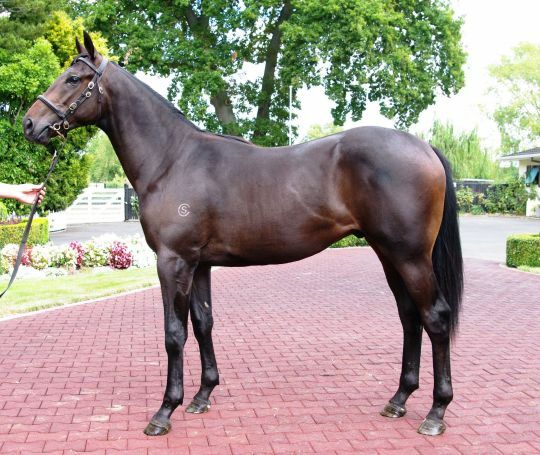 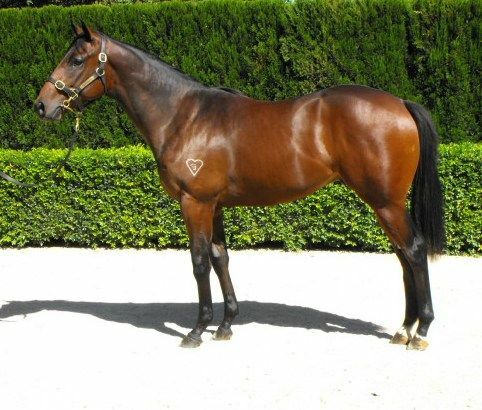 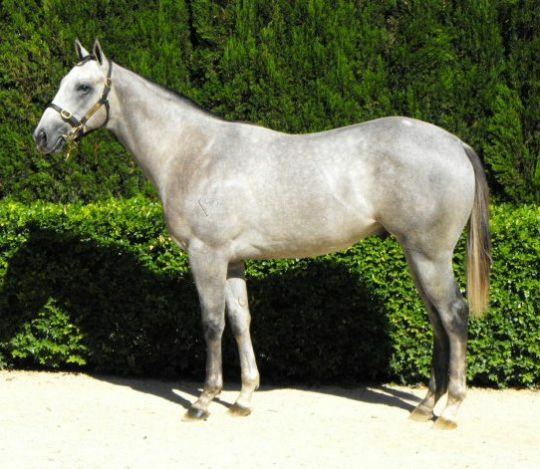 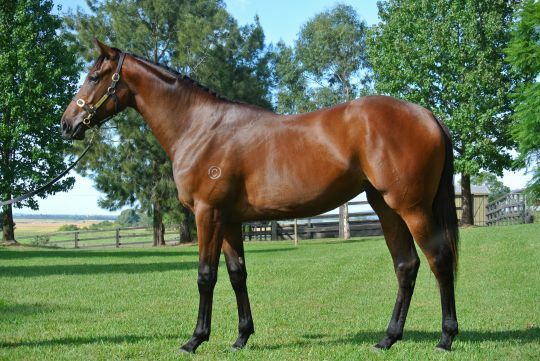 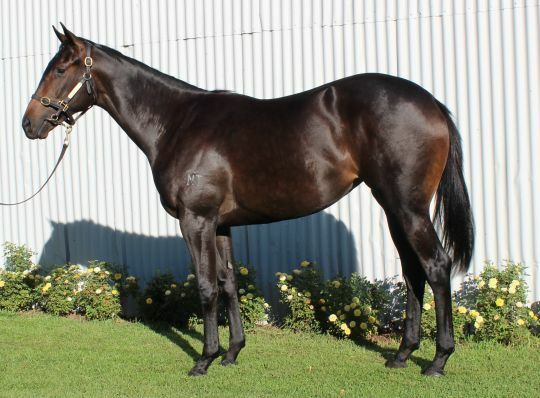 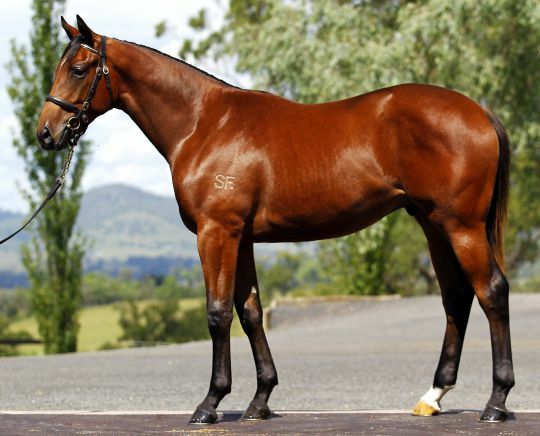 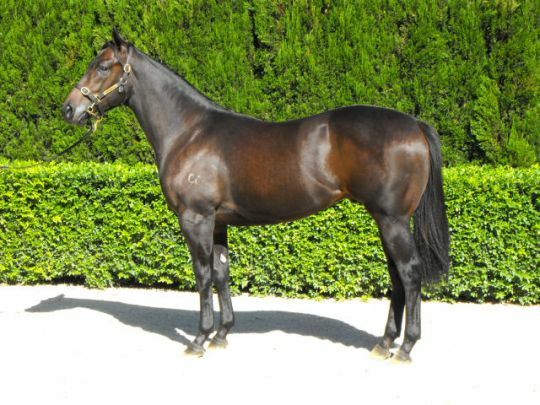 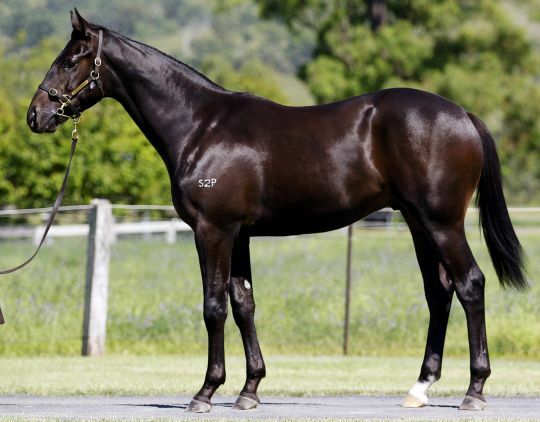 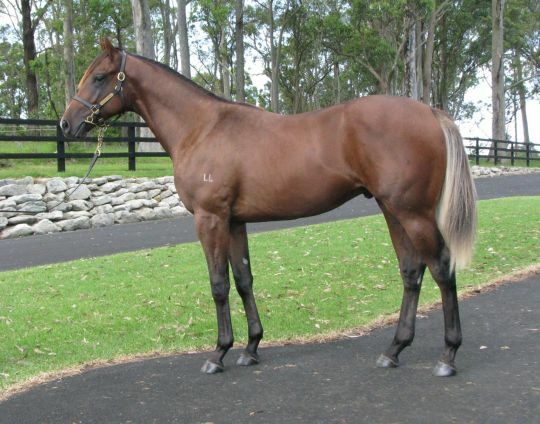 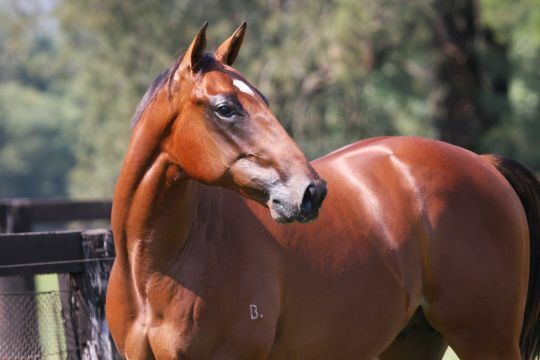 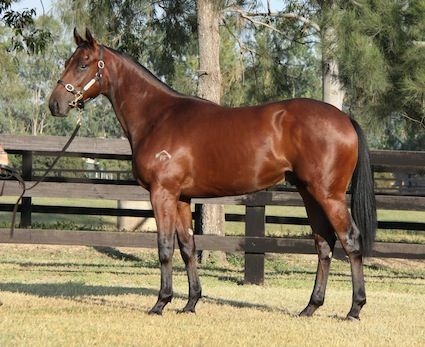 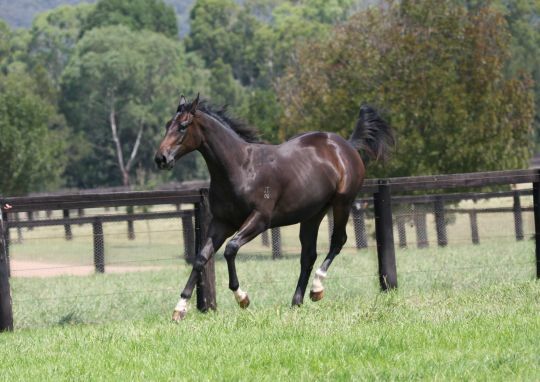 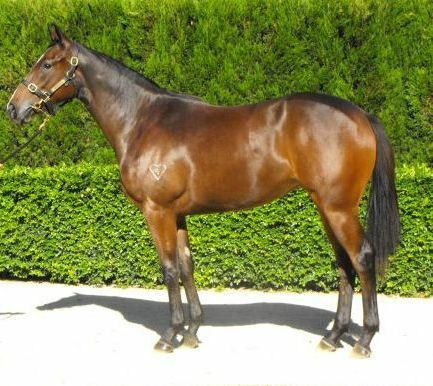 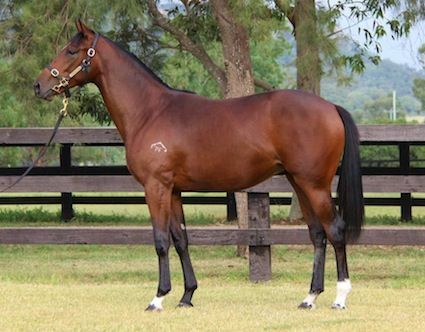 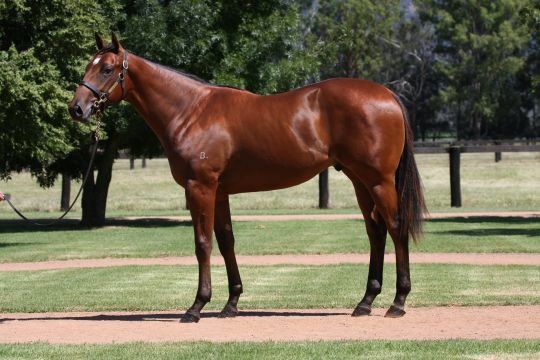 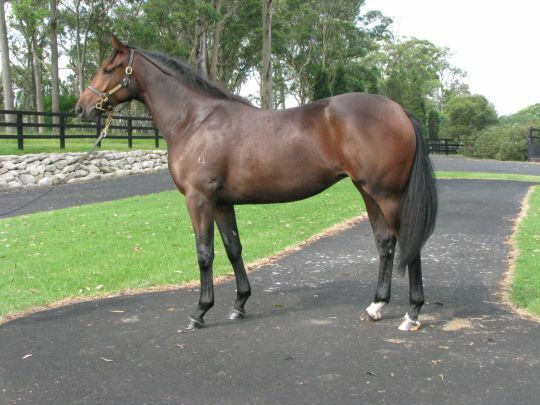 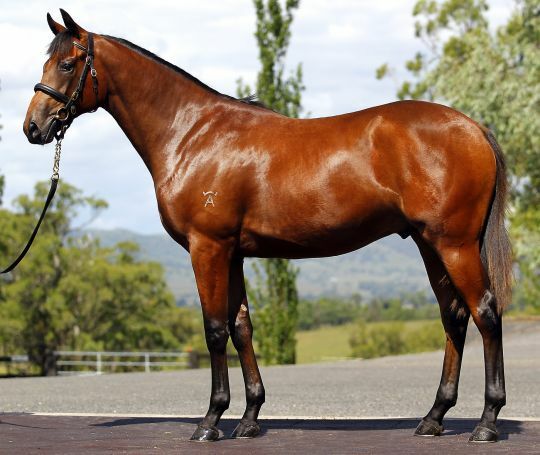 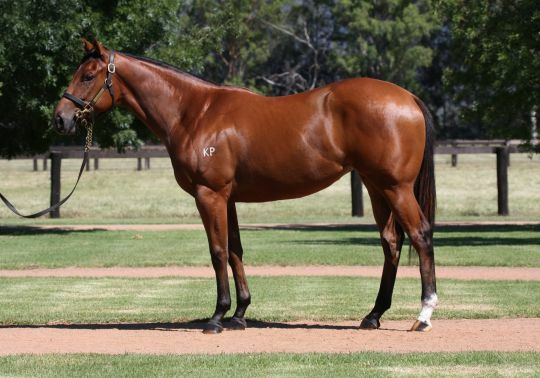 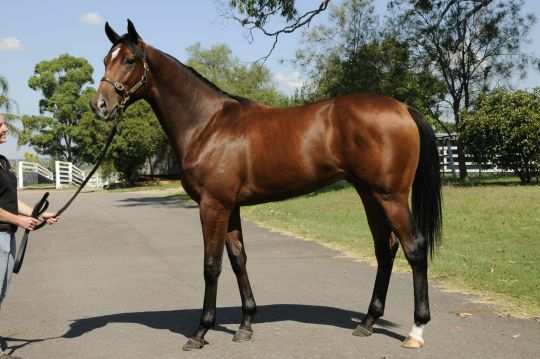 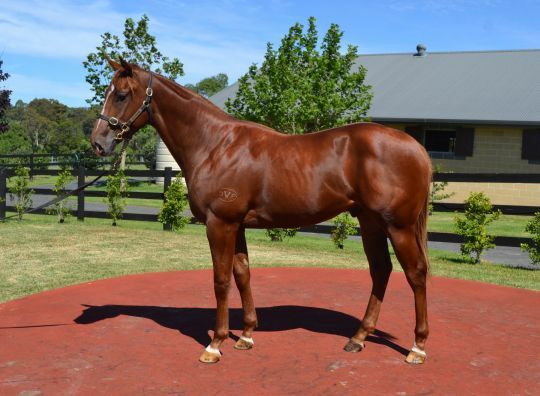 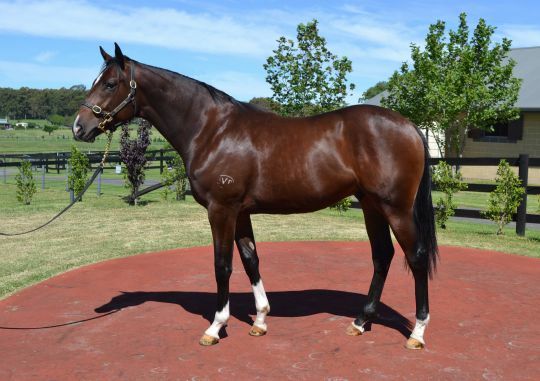 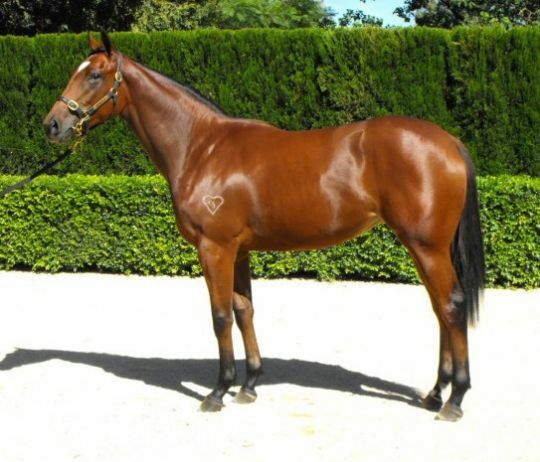 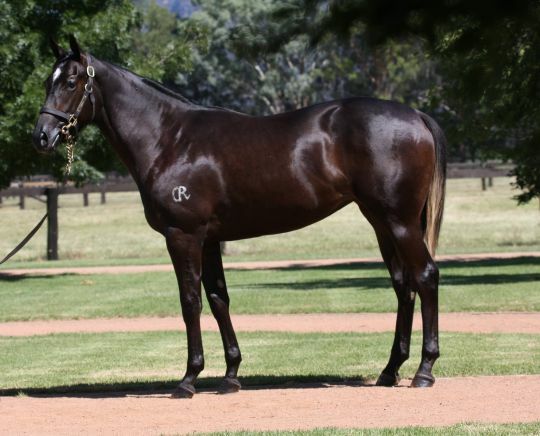 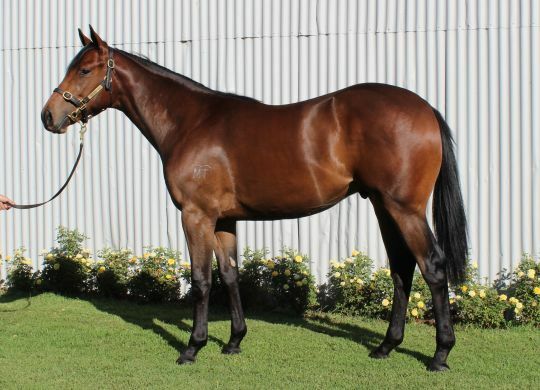 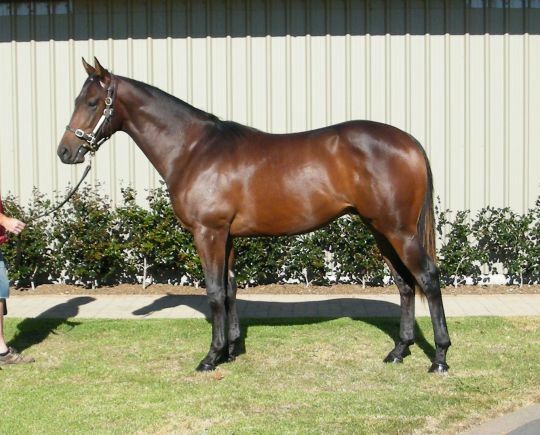 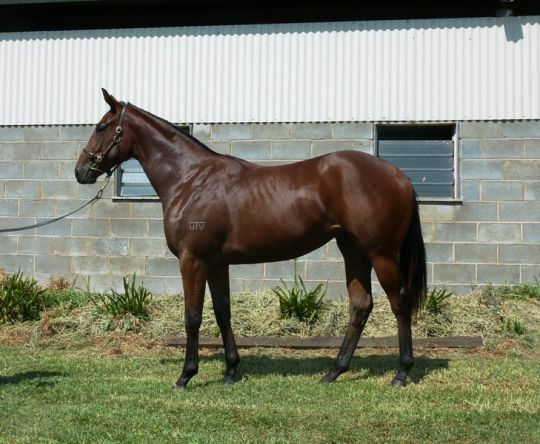 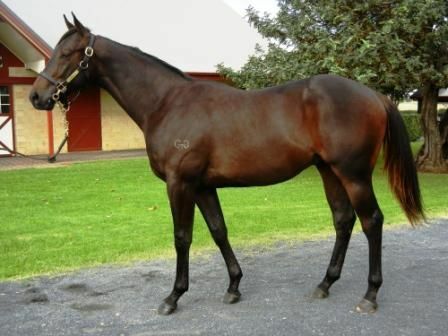 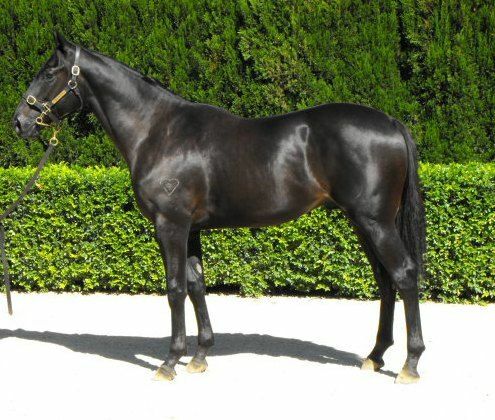 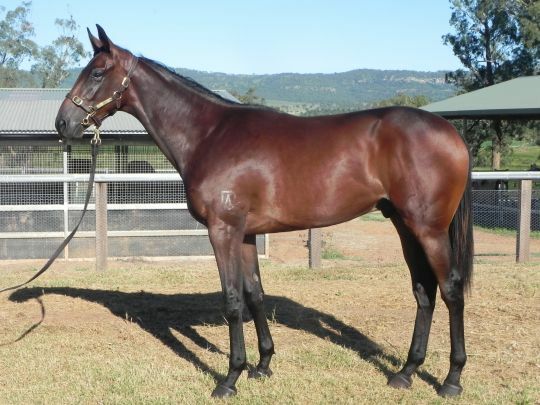 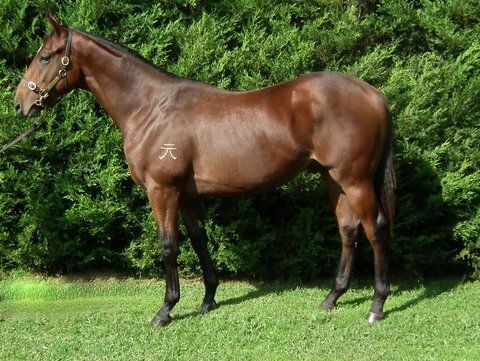 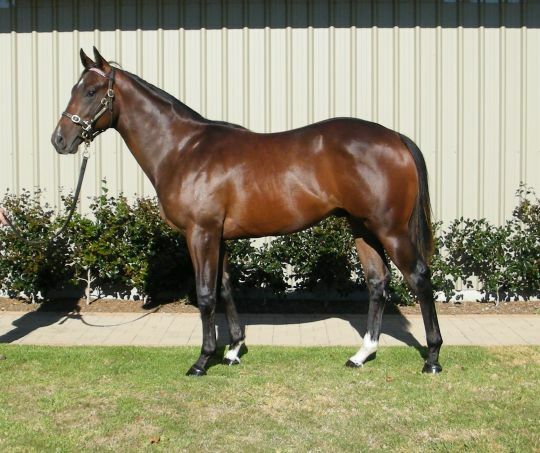 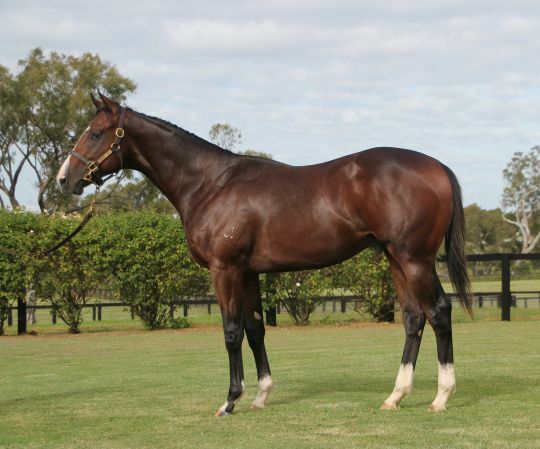 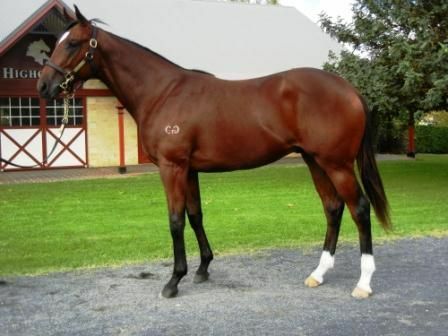 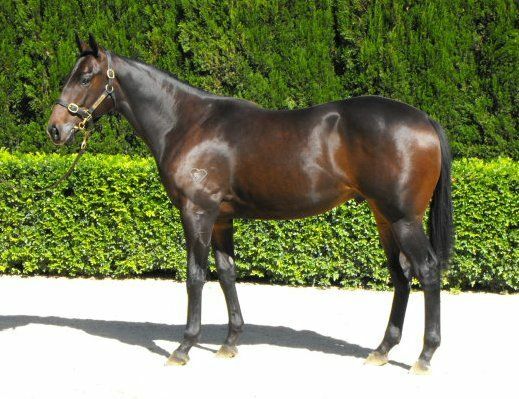 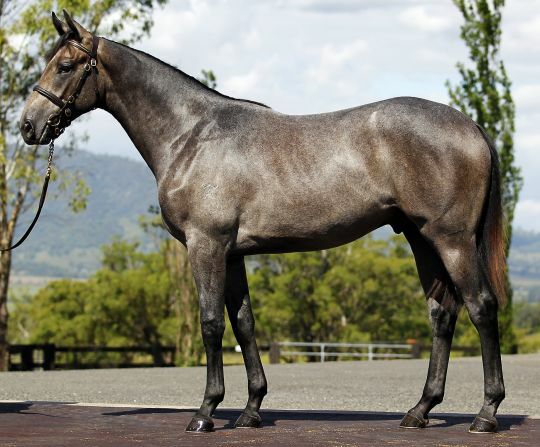 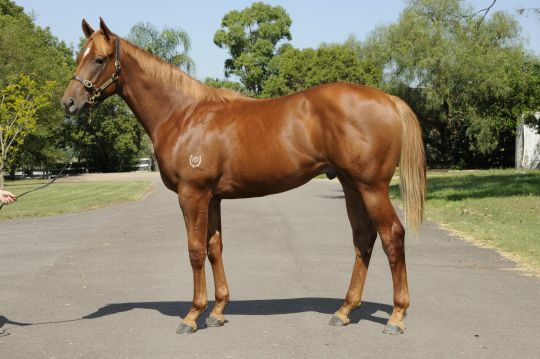 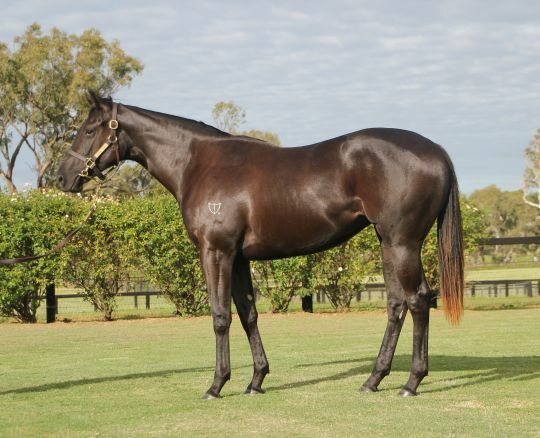 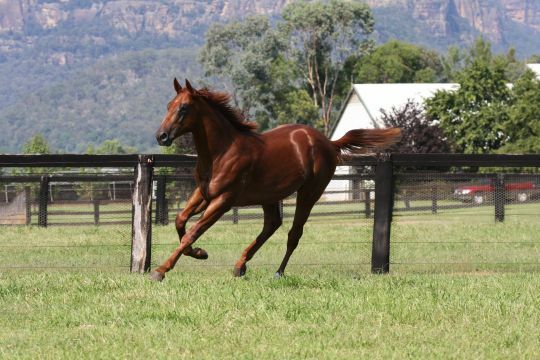 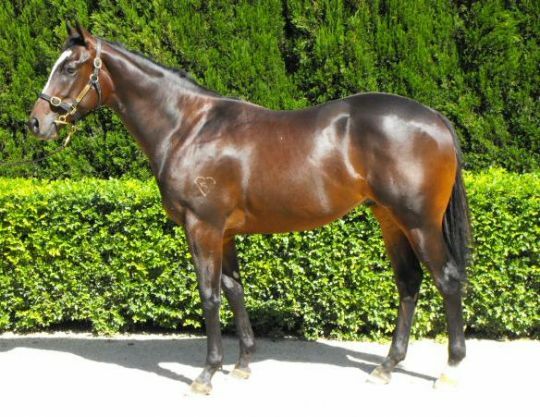 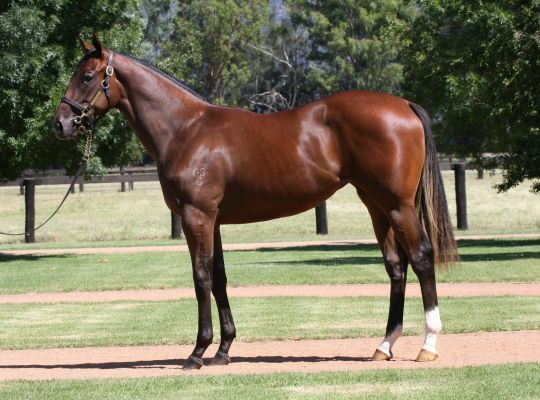 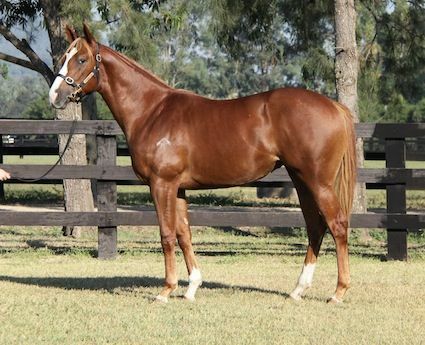 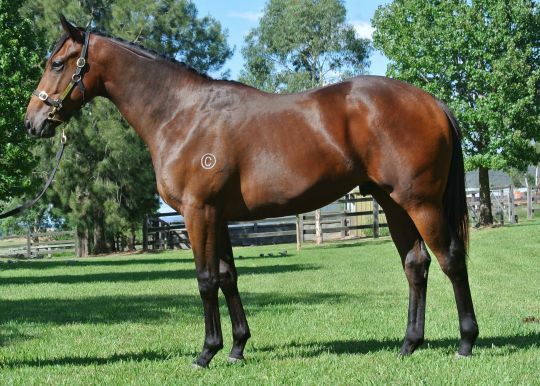 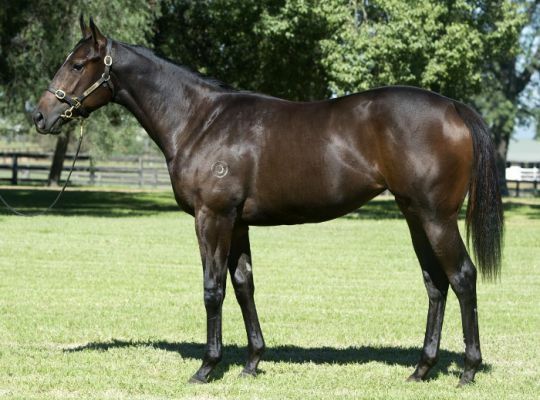 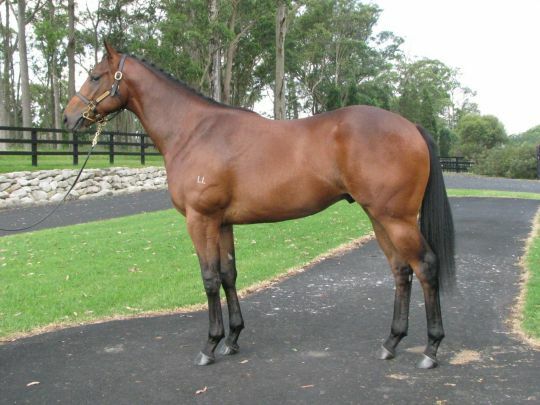 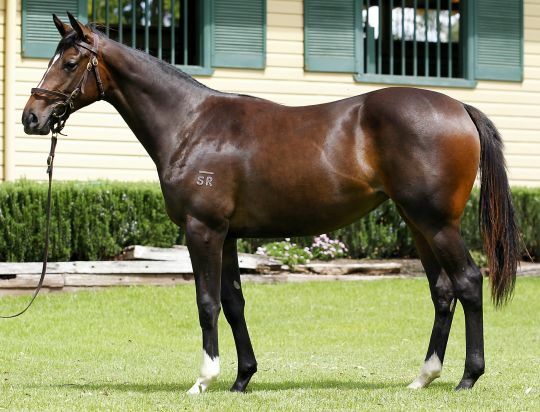 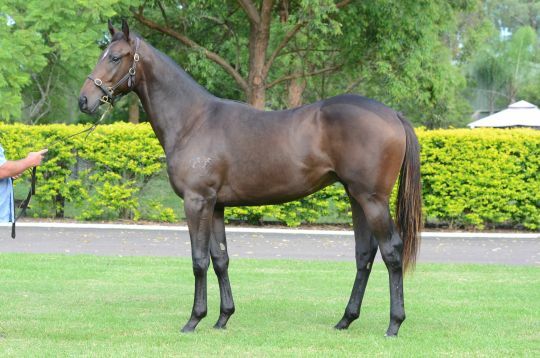 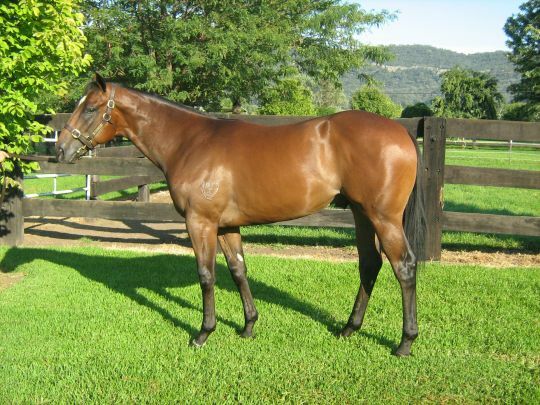 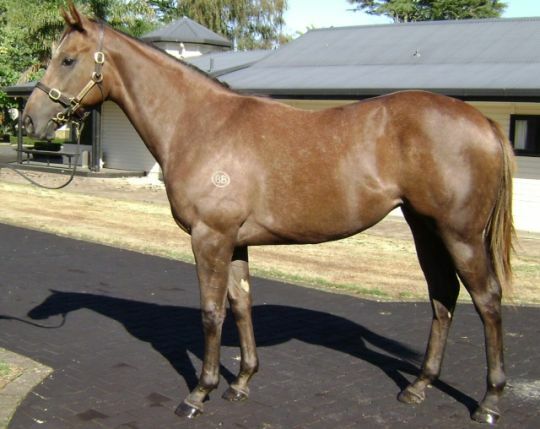 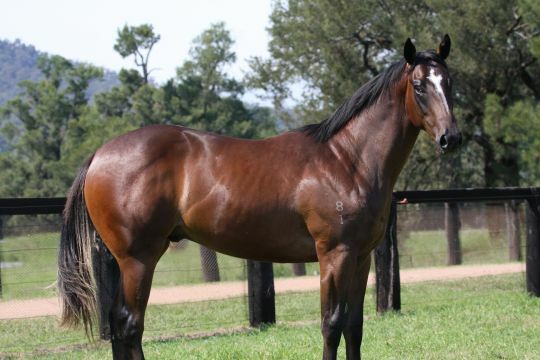 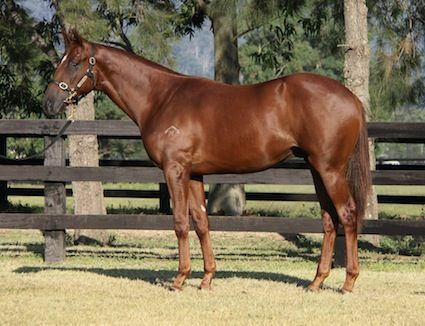 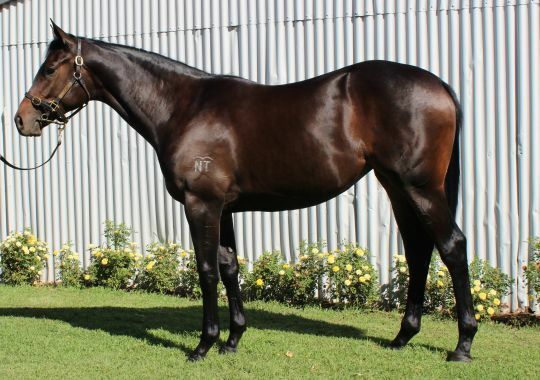 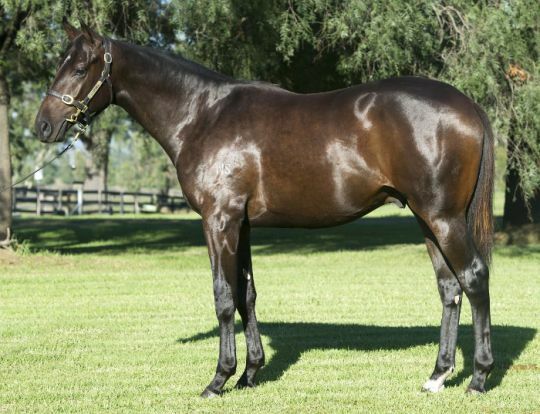 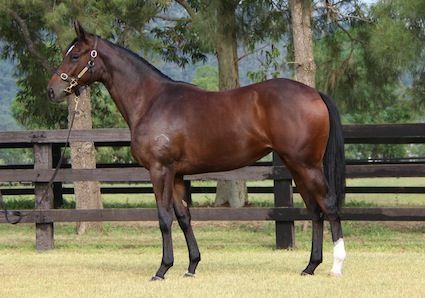 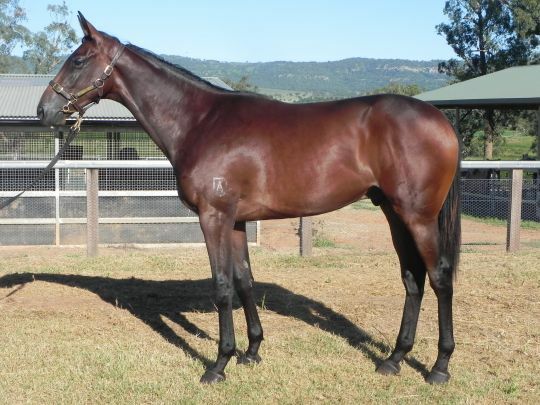 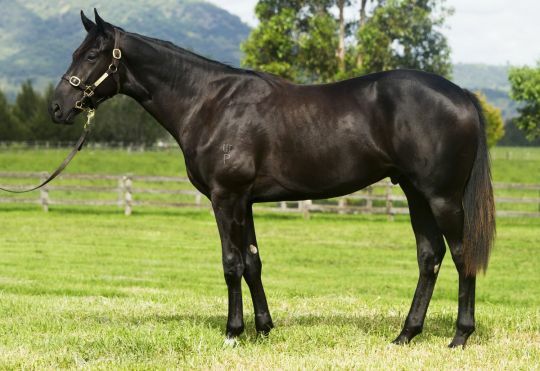 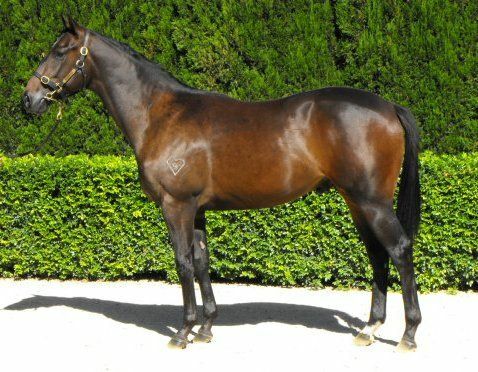 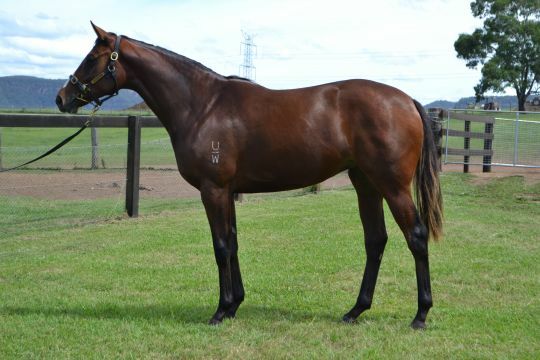 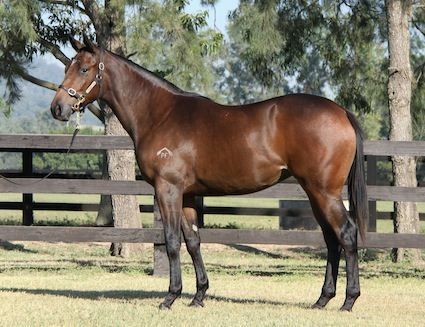 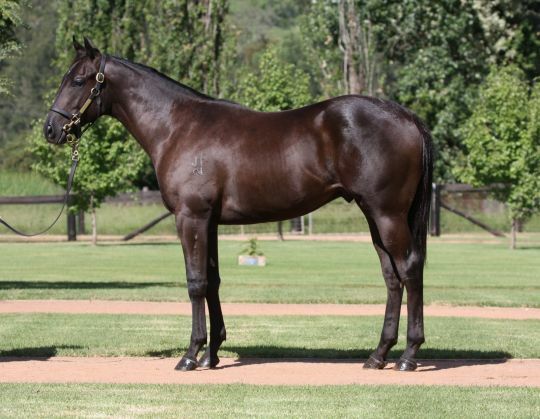 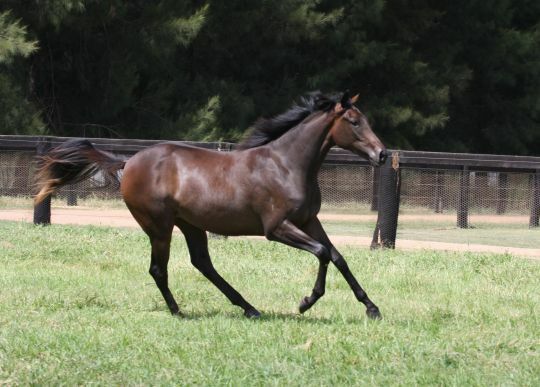 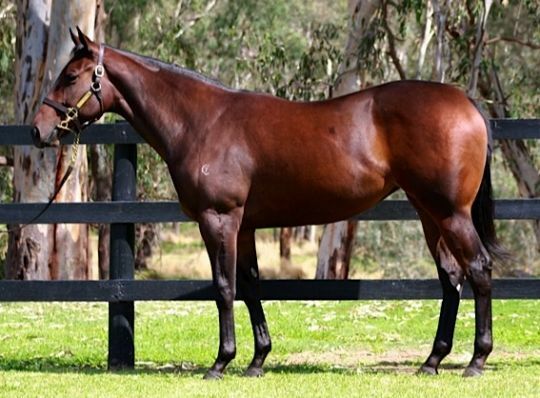 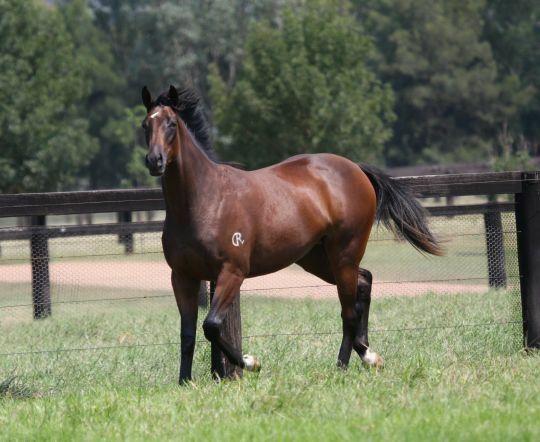 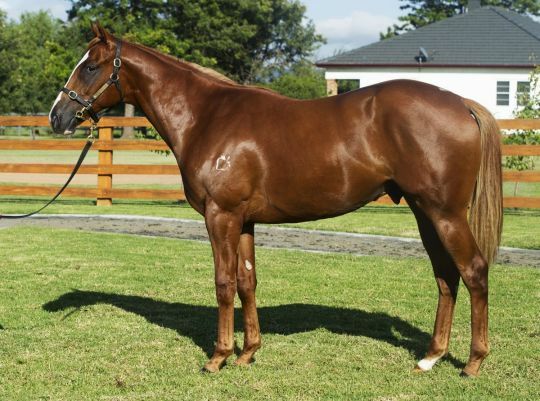 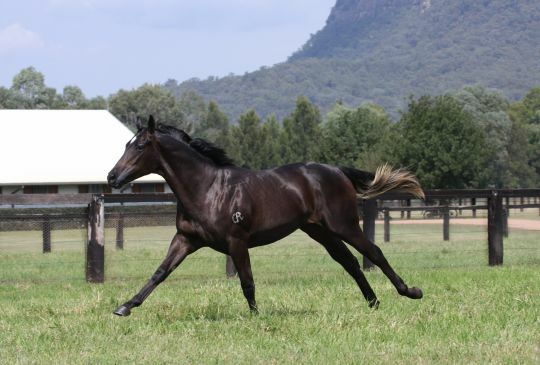 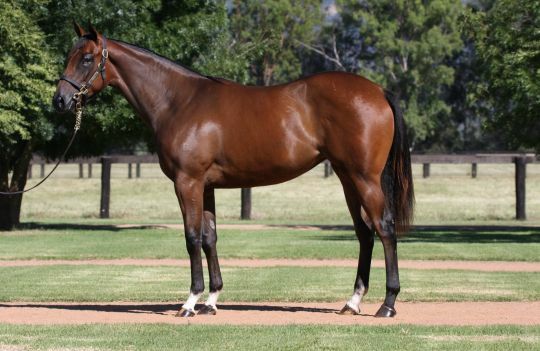 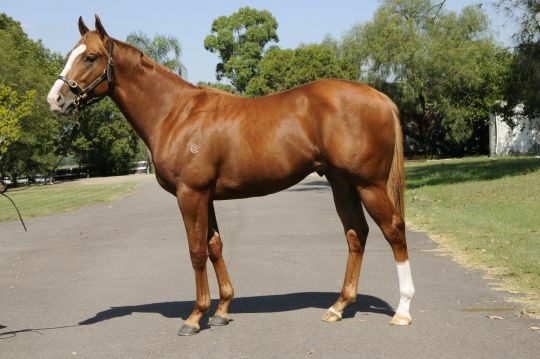 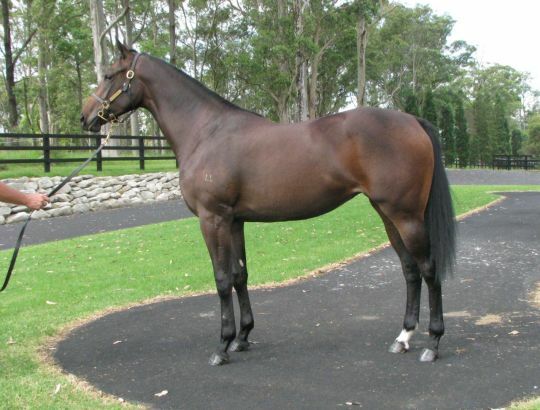 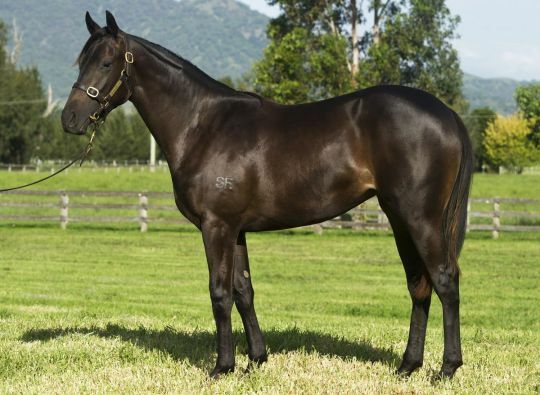 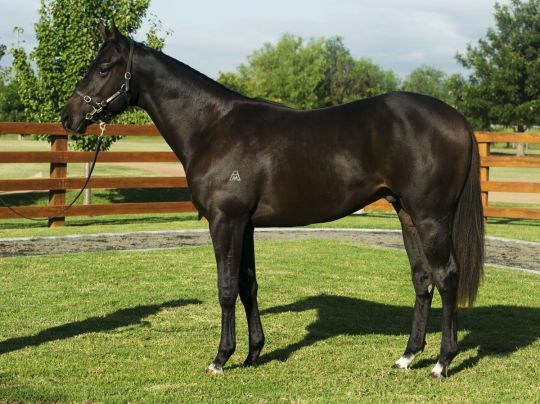 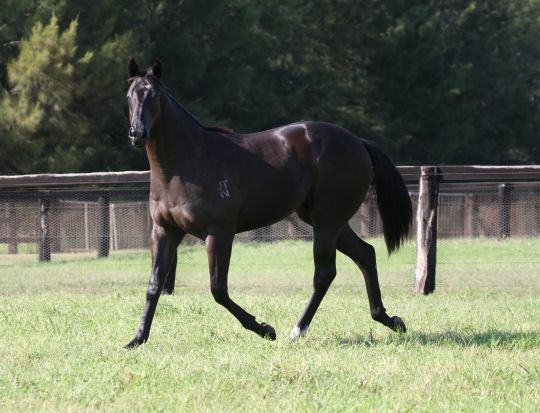 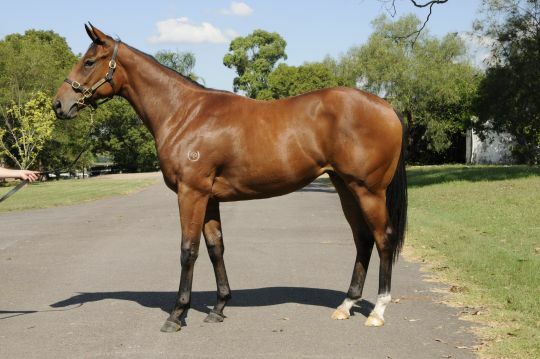 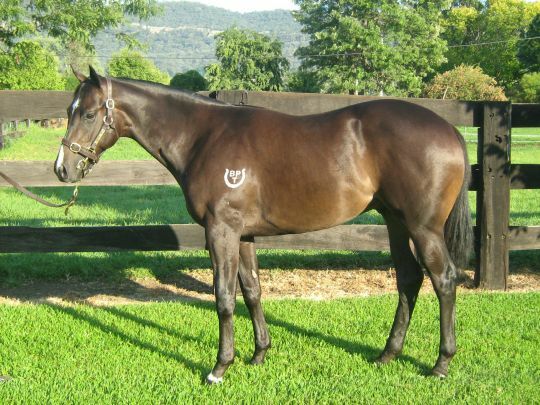 Yearlings that passed in during the Easter Sale are available for sale via the Inglis Make-An-Offer Service. 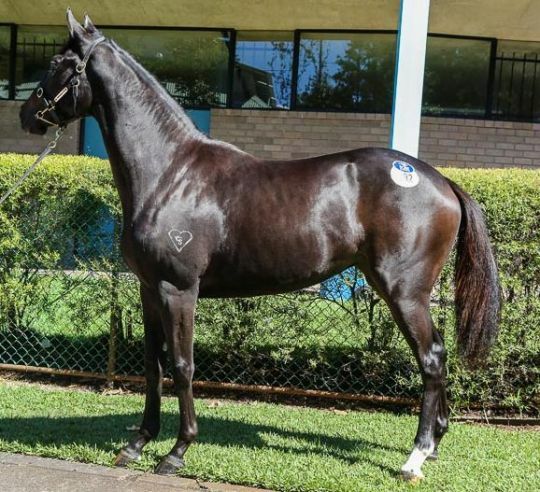 I Should Have Bought That Horse! 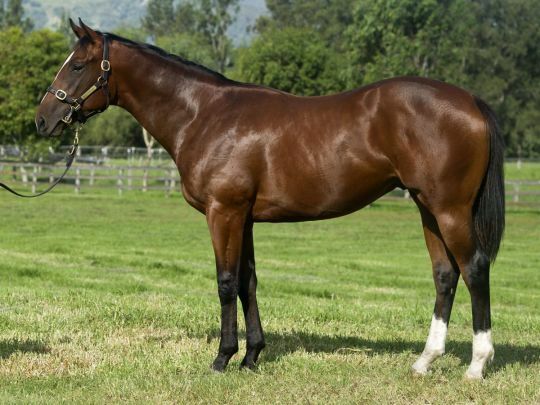 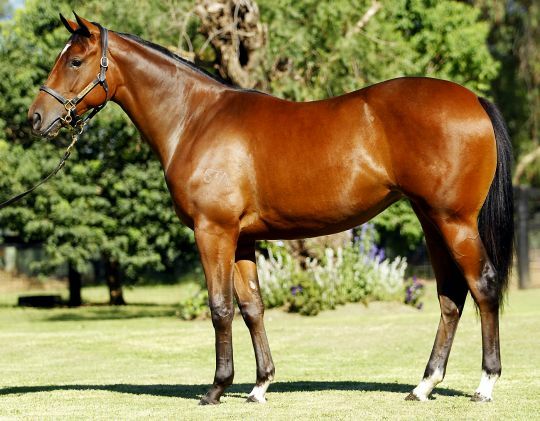 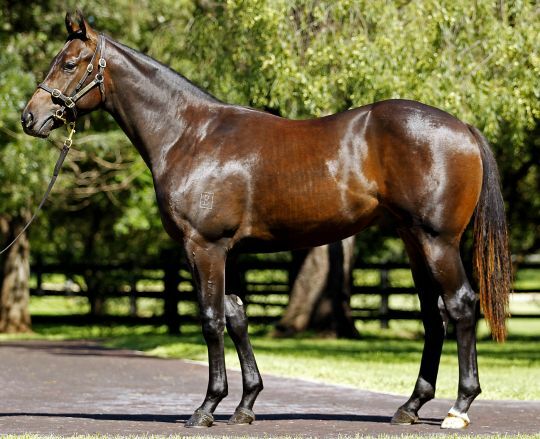 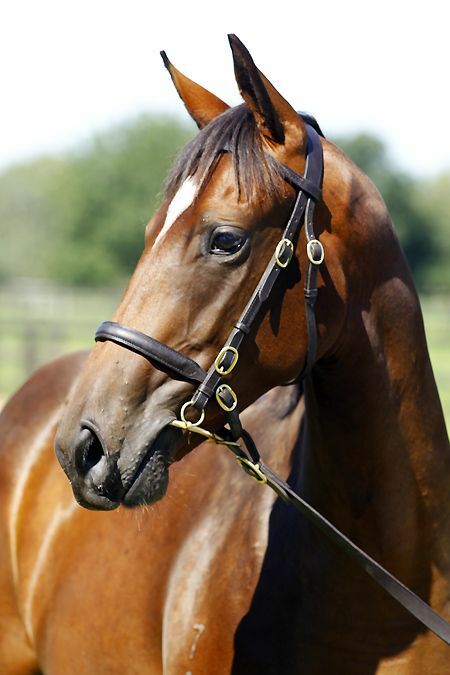 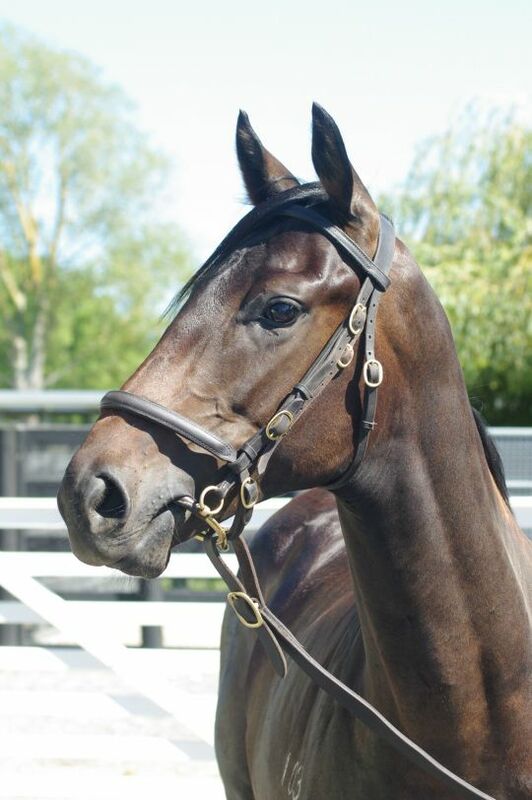 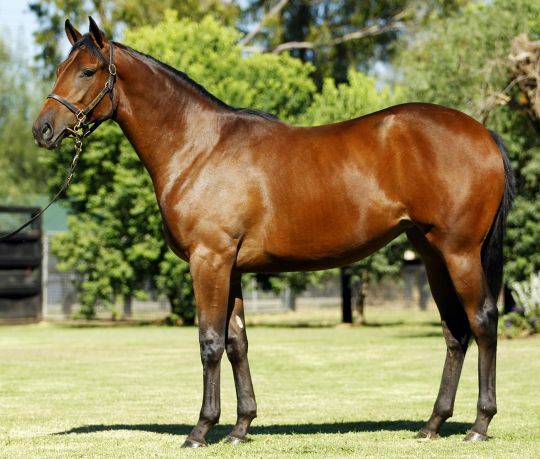 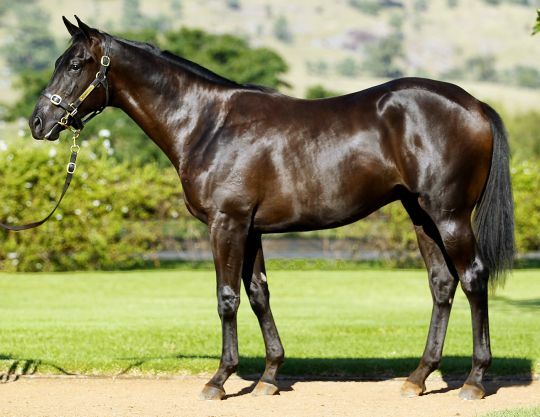 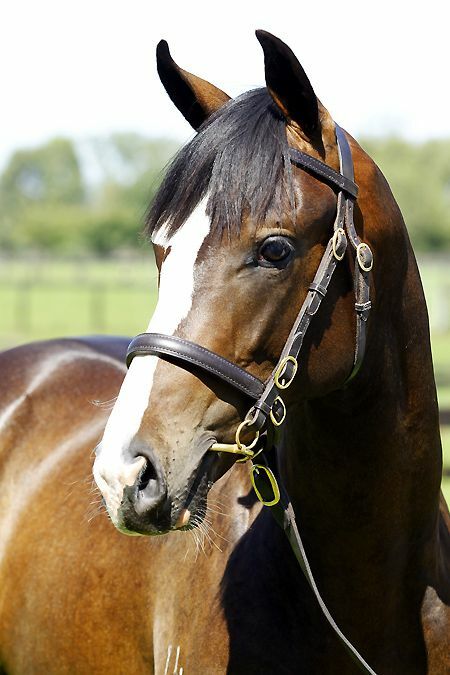 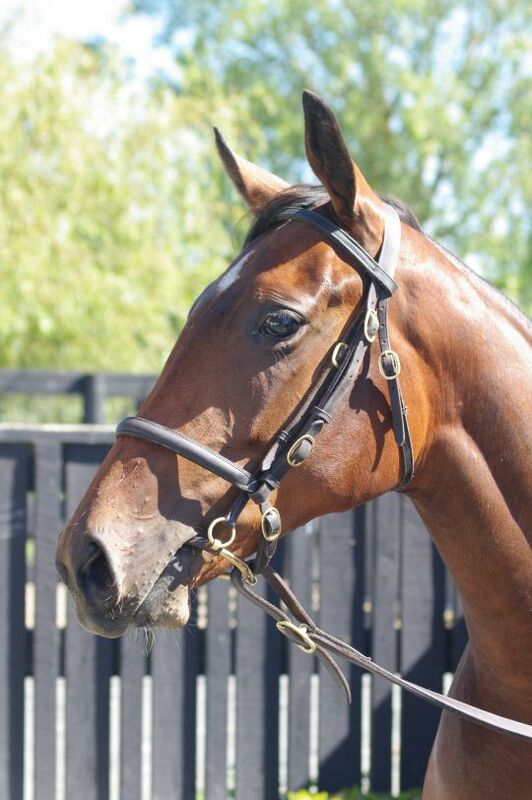 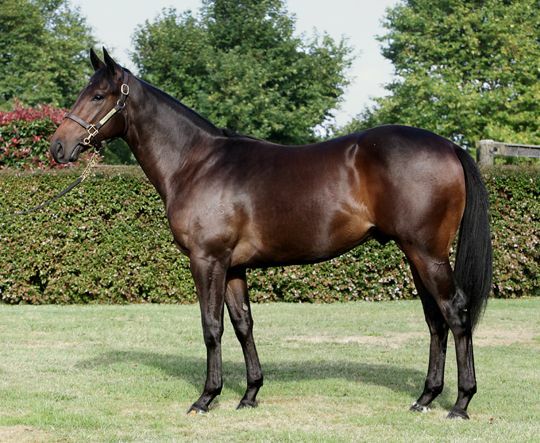 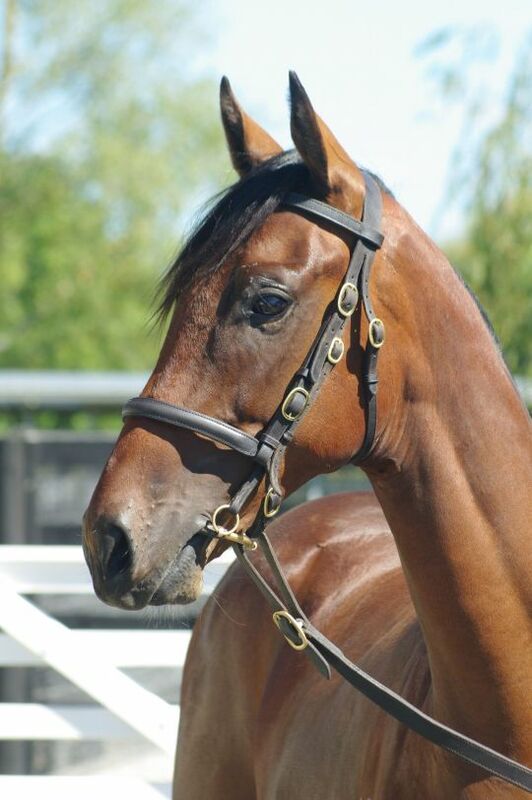 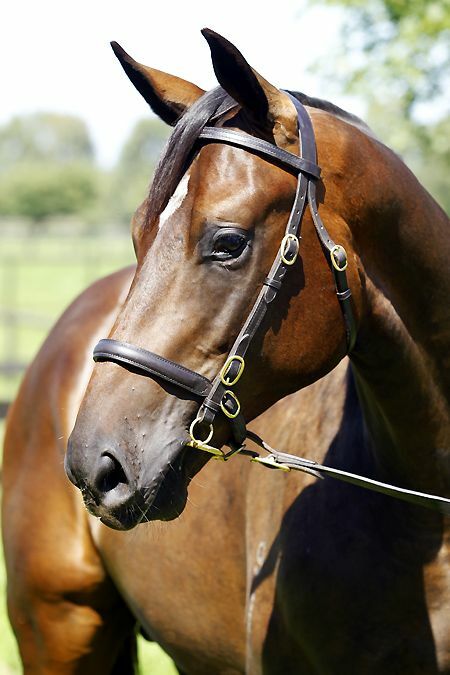 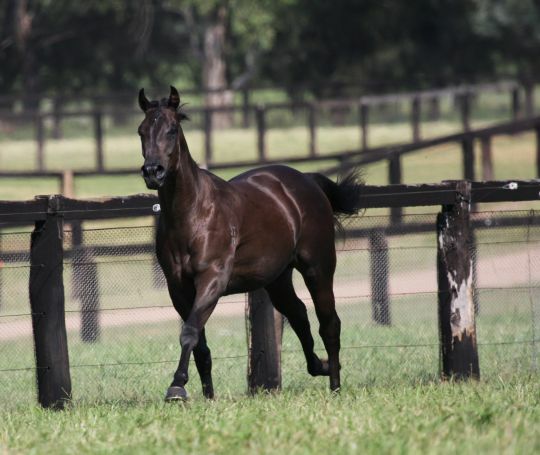 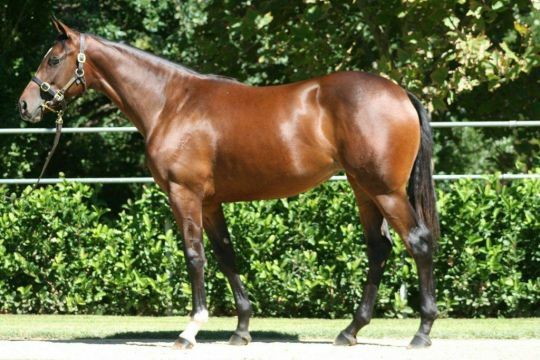 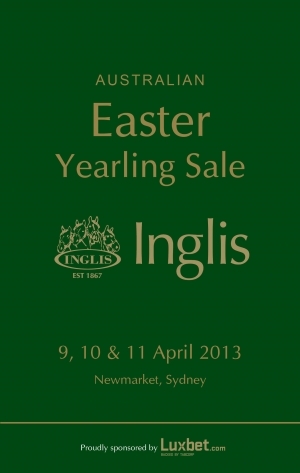 Read our annual 2013 Easter Yearling Sale Preview catalogue online now!